It’s still plenty cold for Potato Leek Soup this week. You could garnish it with some of your pea micro greens or some green garlic greens. 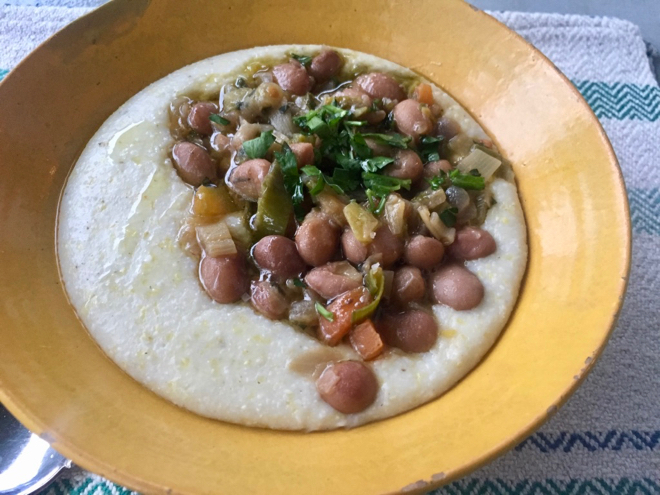 Or you could use your leeks and beans for this ragout and enjoy it over polenta. I’ve been loving my winter squash and this dish of roasted winter squash and onions with tahini sauce might fit the bill. The fresh parsley makes it springy. 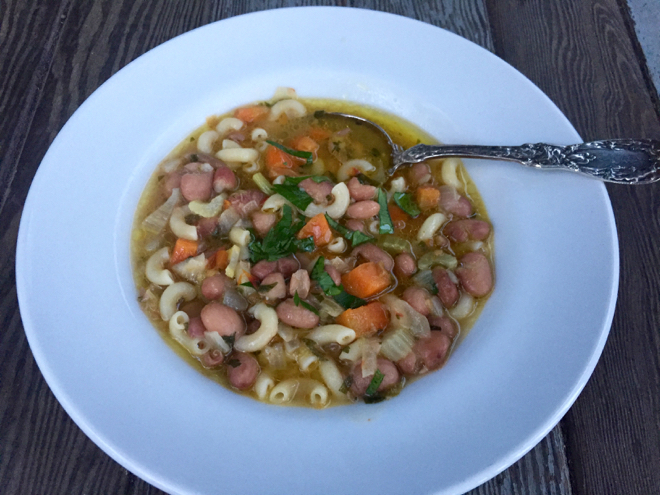 You could use your dry beans to make Pasta Fagioli, the Tuscan bean and pasta stew, employing some of your cayenne pepper and possibly some rosemary as well. 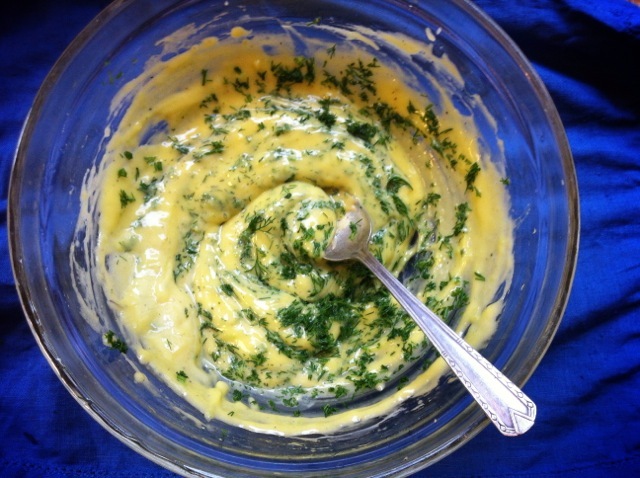 Make aioli with some of your green garlic. 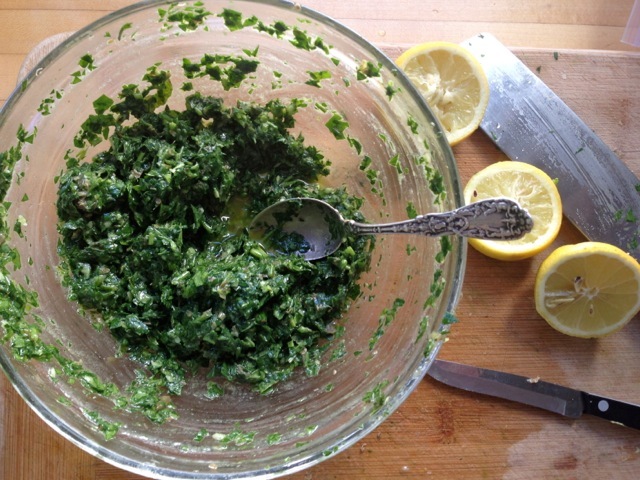 I forget how wonderful kale pesto is. Good on toast or on a sandwich, with eggs or beans and of coarse pasta. 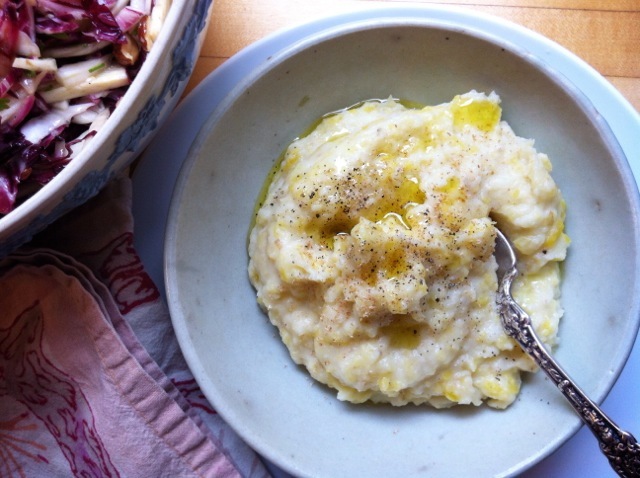 You might call this in Italian version of colcannon, the Irish cabbage and potato mash. 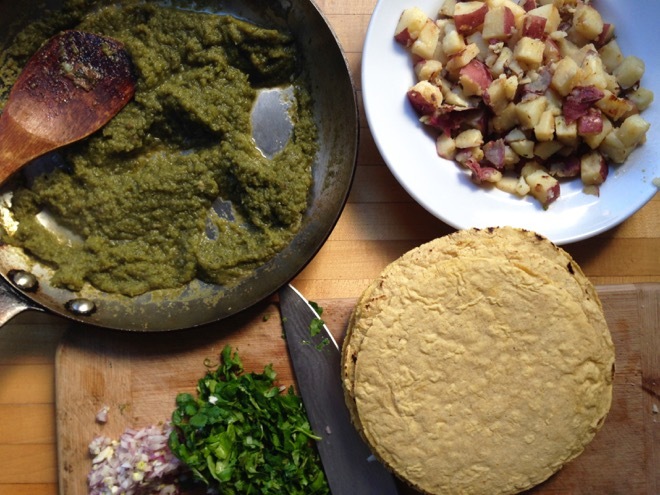 Here leeks and potatoes are mashed and topped w/ crispy capers and parsley. 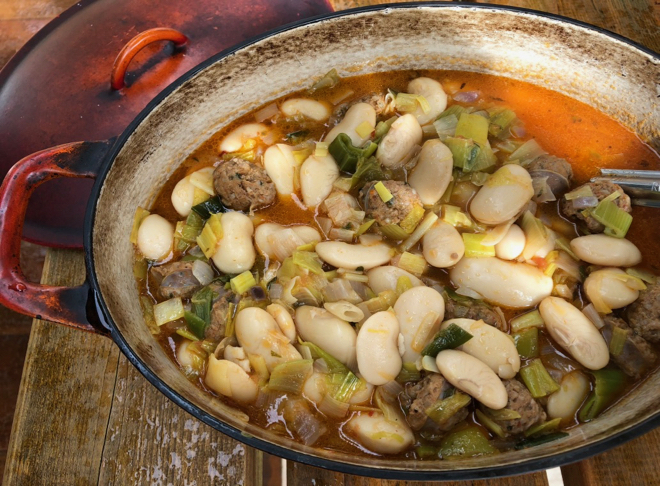 Or make this delicious white bean stew with leeks and sausages. You could add some potatoes to this as well. These braised parsnips with onion, sage and white wine are elegant and simple. 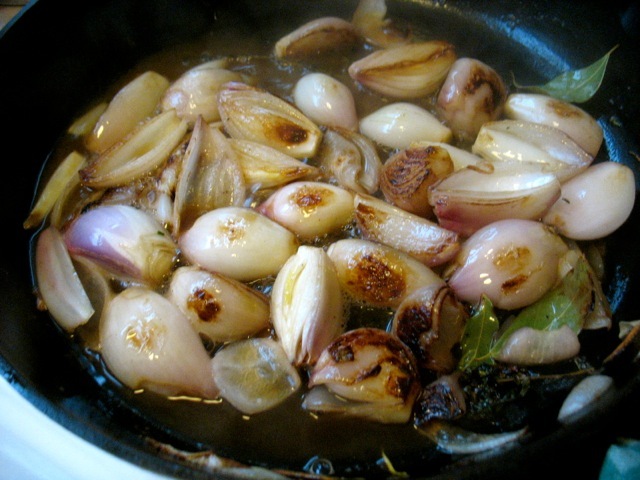 Use shallots in places of the onions if you’d like. 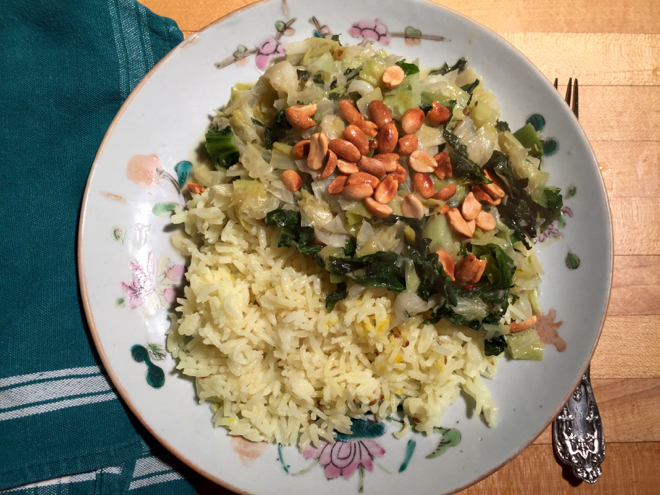 Use your collard raab to enhance a simple rice bowl. I love this winter roots slaw variation so much; use some of your carrots and watermelon radish and even some grated raw beet, if you’d like. 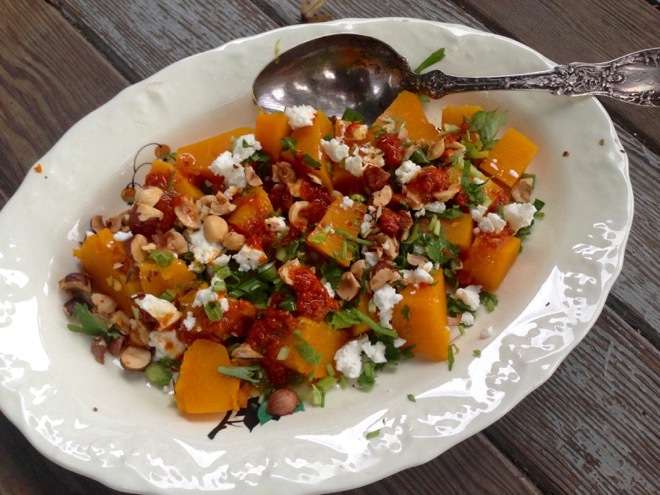 How about this winter squash salad w/ feta and harissa? Parsnips! I’ll probably just roast mine simply but if you’re feeling fancy, make this parsnip crusted quiche. 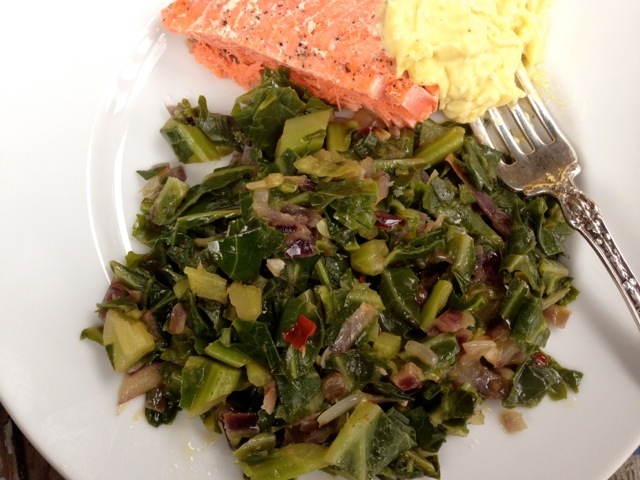 You can substitute collard greens for the mustard greens in the recipe. 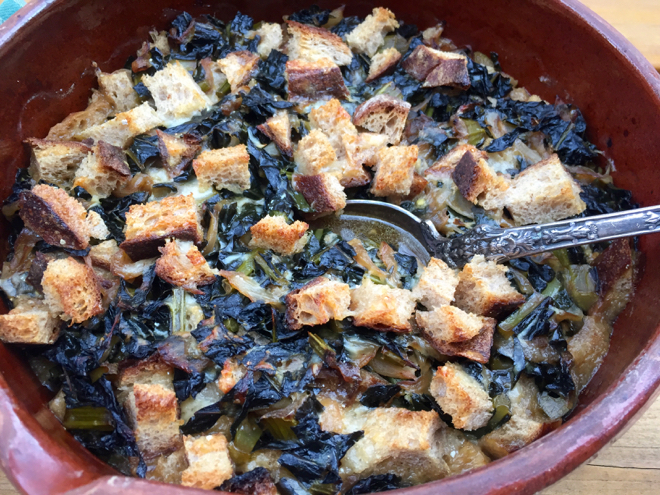 Before citrus season ends make this collard greens dish. 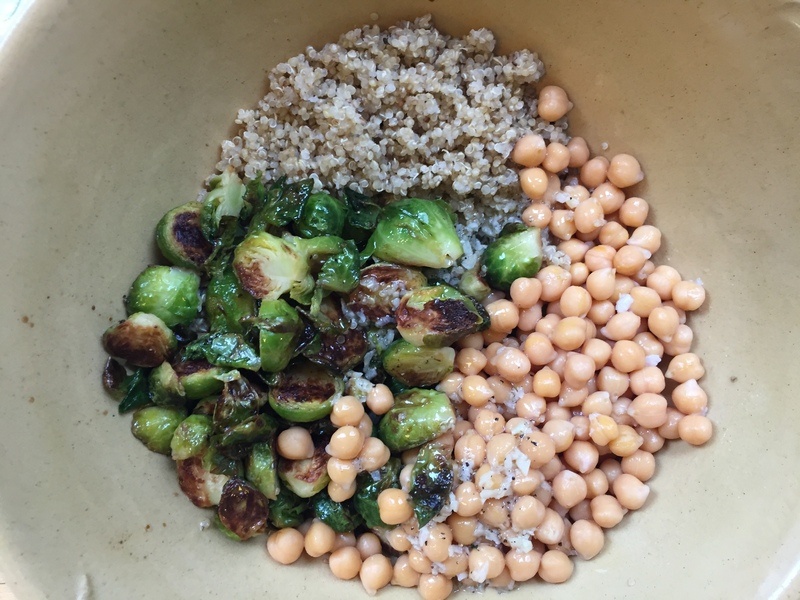 For a simple supper or weekday lunches, this room temp dish of sauteed Brussels Sprouts, chickpeas and quinoa with a lemony dressing, is just right. Chicken with Leeks and Lemon might be nice this week–has a bit of a springy feel! 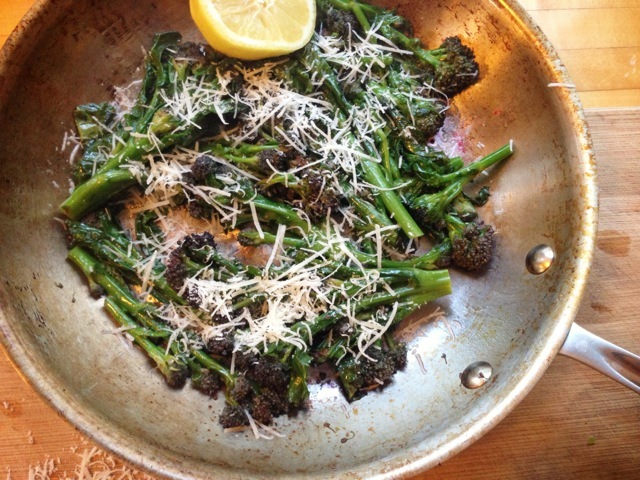 A simple way to enjoy the first of the purple sprouting broccoli. 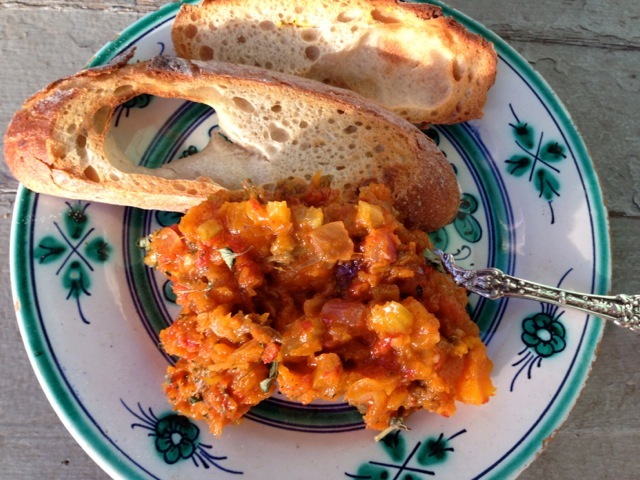 I have fallen in love with this dish again: Winter Squash Caponata. Make it! 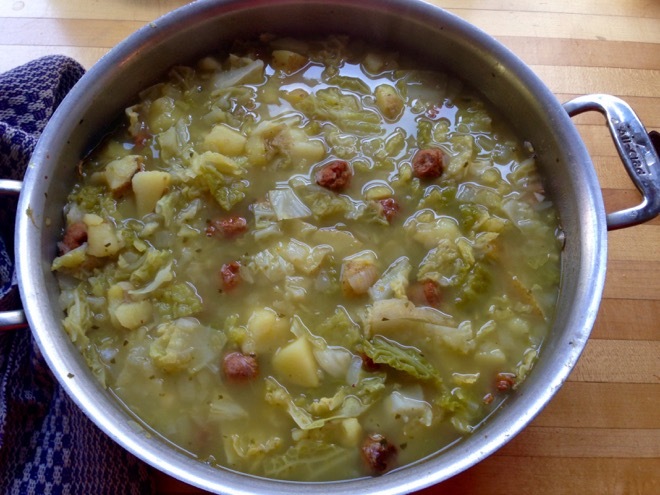 It’s a good week for caldo verde, the Portuguese potato, cabbage/kale and chorizo soup. This skirt steak with kohlrabi and carrots, ginger and chili paste might be good this week. Use your rutabaga and some of your onions (or shallots from the last share) to make this simple and delicious sweet and sour dish. 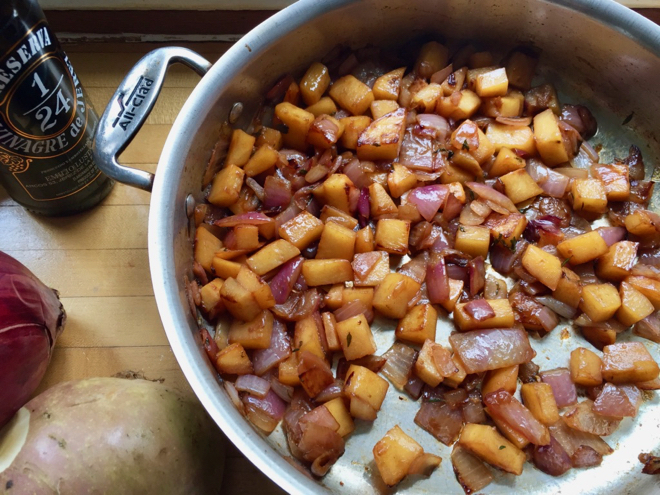 Or make a mash with the rutabaga and some potatoes. Use some of your leeks and cabbage for this curried dish with coconut milk. 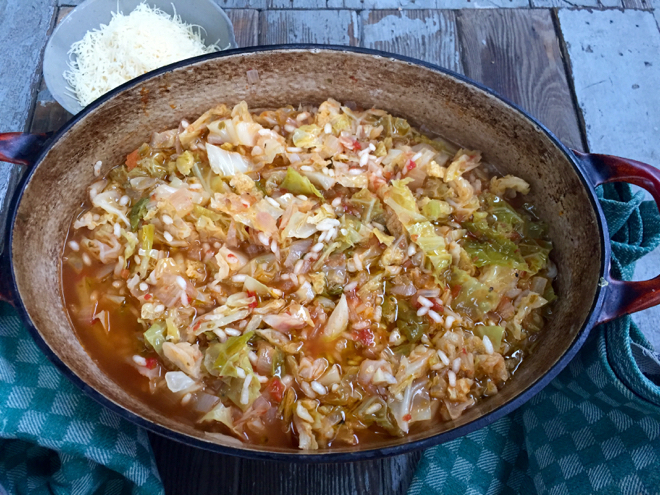 This Italian-style cabbage stewed w/ tomatoes and rice might be good on one of these cold evenings. Preheat oven to 350. Trim and cut celeriac (however much you want to use) into about 2/3-inch thick slabs and then cut into pieces about 2 x 3″. Toast 1 teaspoon (or more if you’re making a lot) coriander seeds in a dry skillet for about 90 seconds until toasty smelling. Cool and crush in a mortar or spice grinder. 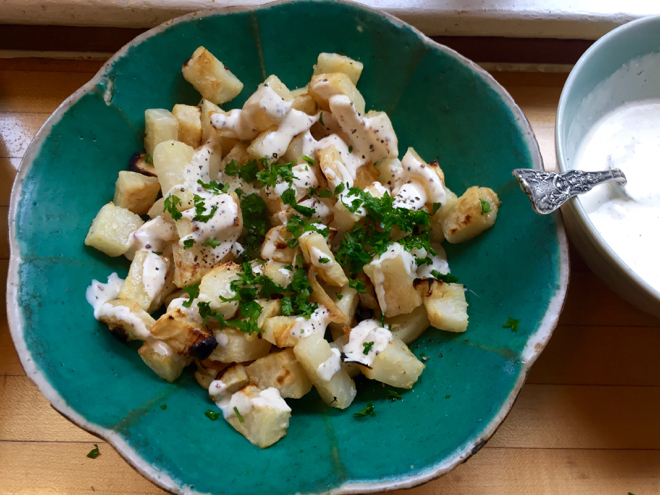 Toss celery root pieces with crushed coriander seeds, plenty of salt and some black pepper. Drizzle with olive oil and put in an ovenproof dish. Add 1/3 cup water and cover tightly with foil. Bake for about 45 minutes or until very tender. Serve with a squeeze of lemon juice and a bit more salt. 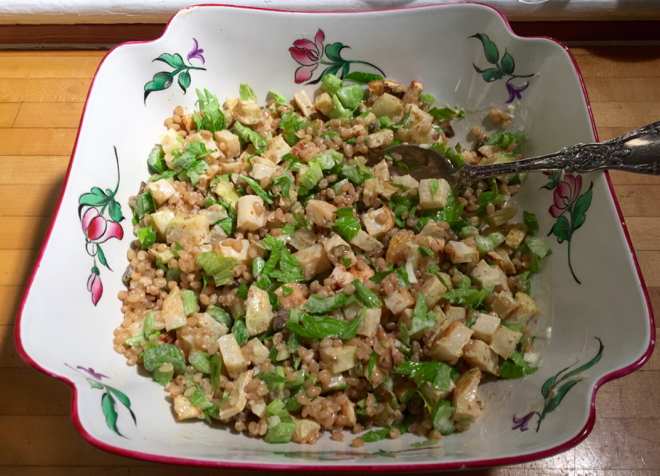 Or make this Celery Root & Wheat Berry Salad for a hearty winter salad. 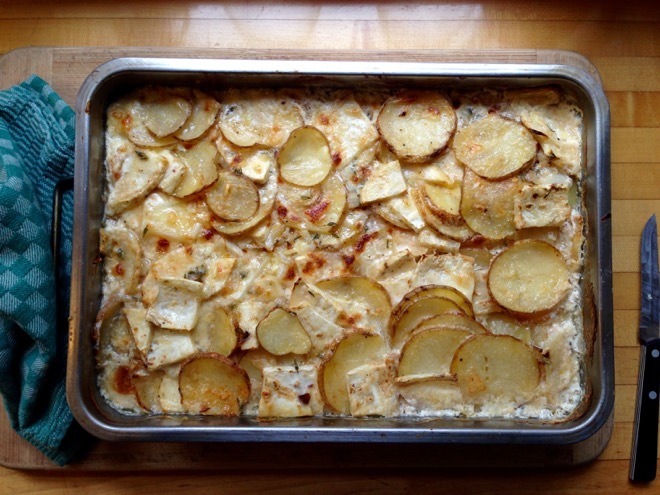 Or make these Scalloped Potatoes and use 1/2 Celeriac and 1/2 potatoes. 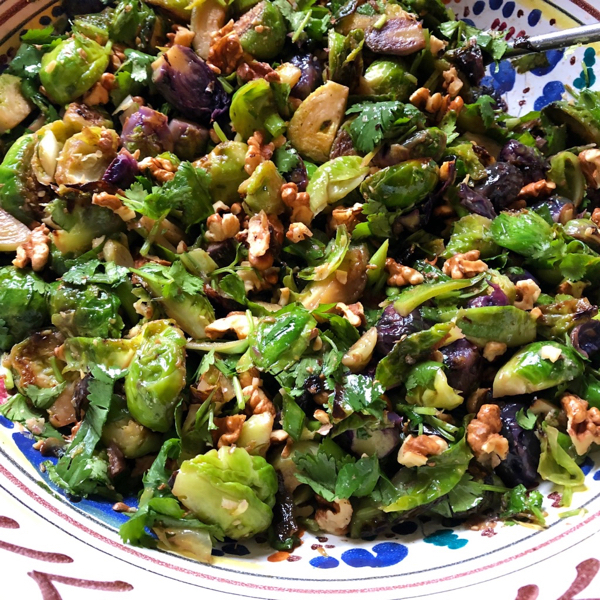 This warm Brussels sprout salad with toasted nuts and cilantro is delicious. 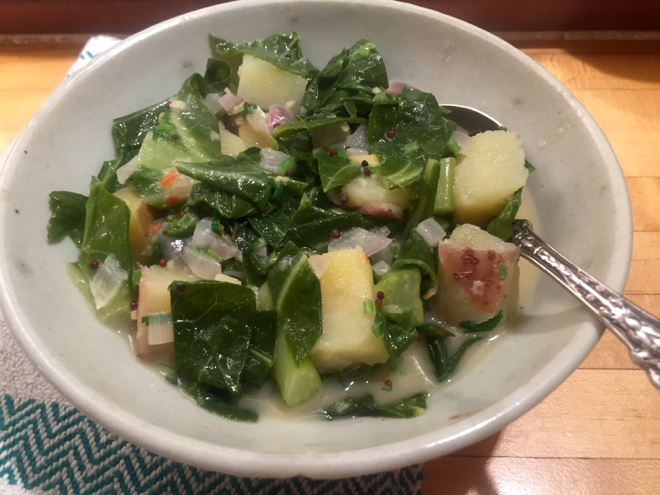 This Mustard Seed Curry w/ Collards, Potatoes and coconut milk is simple and can be augmented with tofu or chicken or chunks of winter squash. Or make Collards w/ Winter Squash & Bacon. Use some shallots or onions and winter squash to make this wintry version of caponata. It’s really, really good. 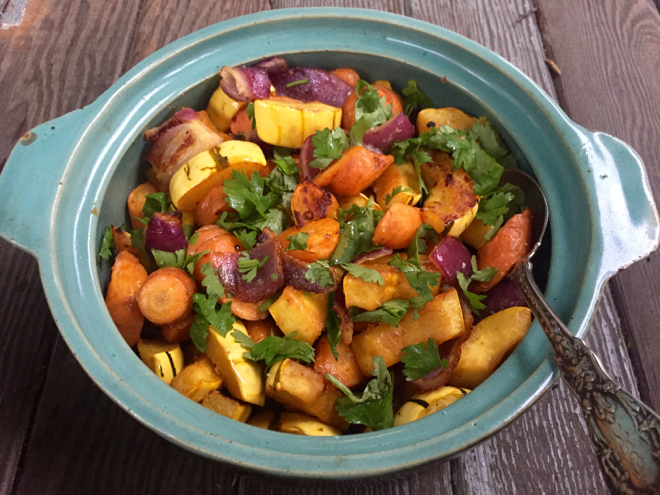 You could use some potatoes, carrots, winter squash, onions and/or shallots in this Miso & Cider Vinegar Roasted Vegetables. I’ve been enjoying this simple grated carrot salad lately. Don’t skimp on the toasted seeds. 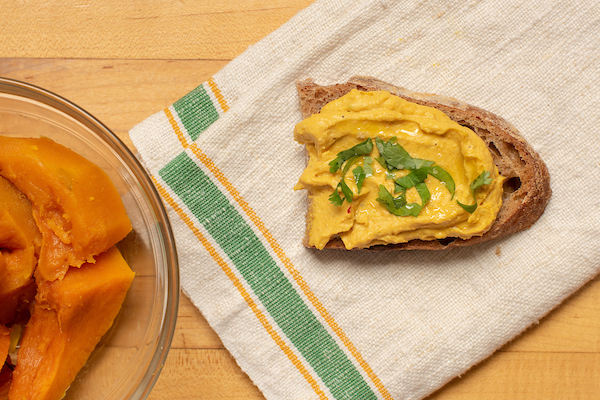 Some of your butternut squash would be delicious in this creamy spread made with tahini. 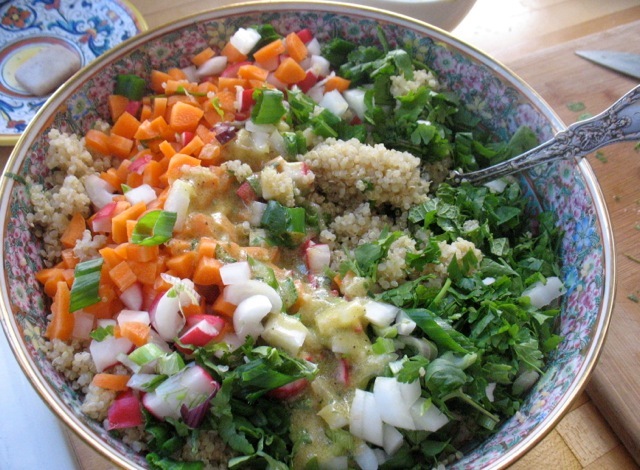 Watermelon radish, carrots, red onions would all be lovely in this chickpea salad. 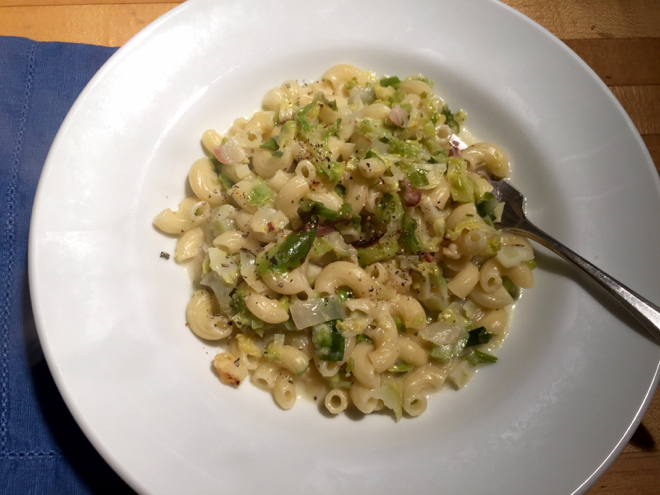 Make this quick pasta with some of your Brussels sprouts, lemon and capers. Some of your savoy cabbage, carrots and leeks would be lovely in this soup with dumplings. Combine your turnip with a few potatoes and make a mash on one of these cold nights! Use your savoy cabbage to make these fantastic deconstructed cabbage rolls. 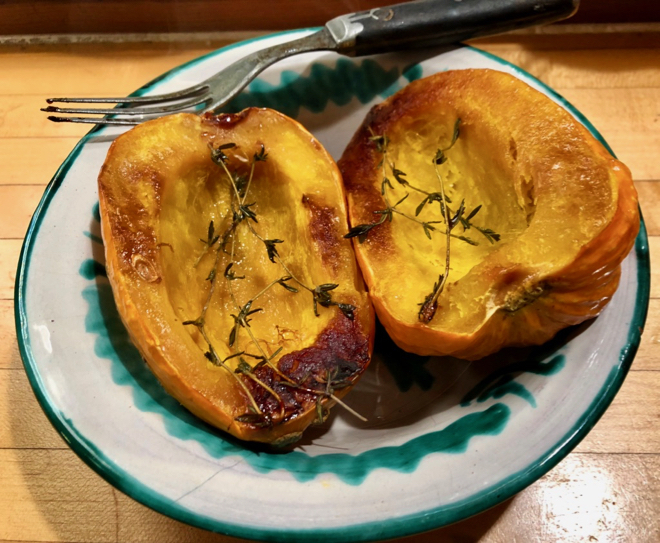 This is a simple and lovely way to prepare your acorn squash. Or if you have Spaghetti squash this week you can employ this treatment where it’s roasted and then tossed with herbs and a little melted butter and/or olive oil. 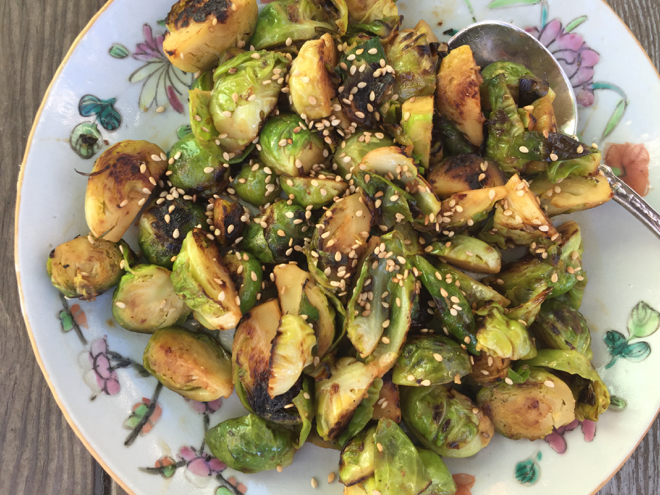 These Brussels Sprouts quickly cooked with miso and sesame seeds are fantastic. 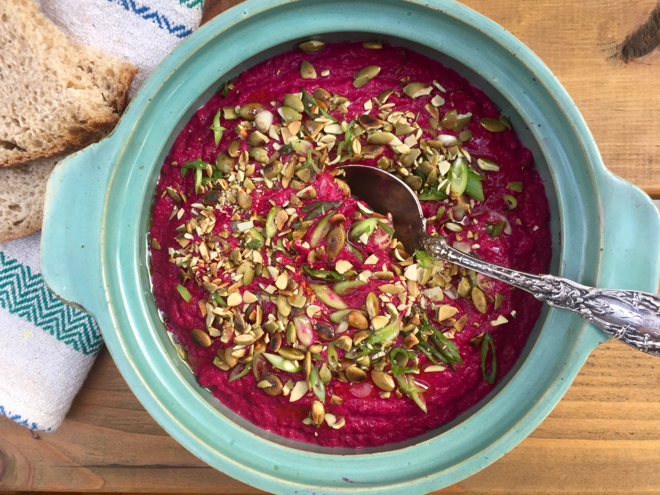 You could use some of your enormous beet to make this beautiful and savory beet dip. Having this on hand in the fridge will make for tasty snacking. You could mash your rutabaga, one its own or with some potatoes. 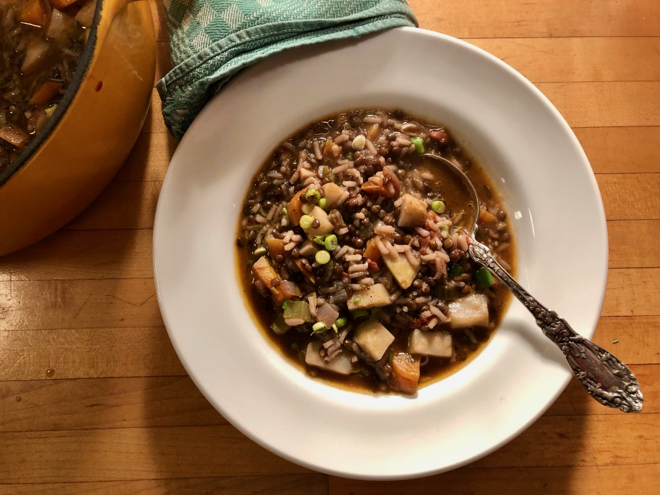 Rice and lentils are further enhanced by sweet, earthy celery root in this simple, warming soup. 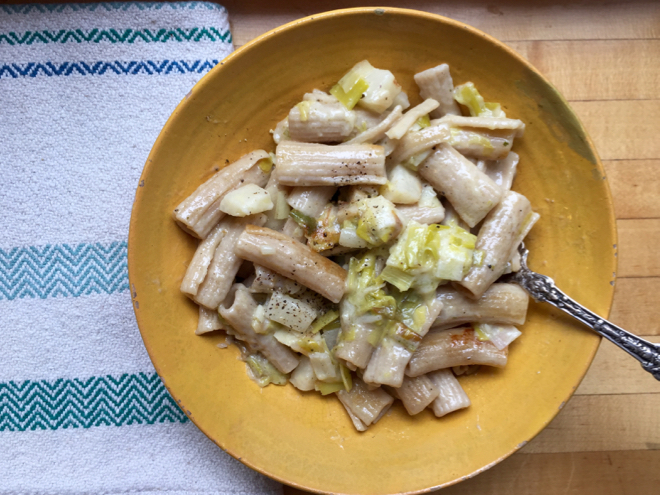 Or how about Celery Root & Leek baked pasta? Black Radish pancakes would be nice on one of these chilly evenings. 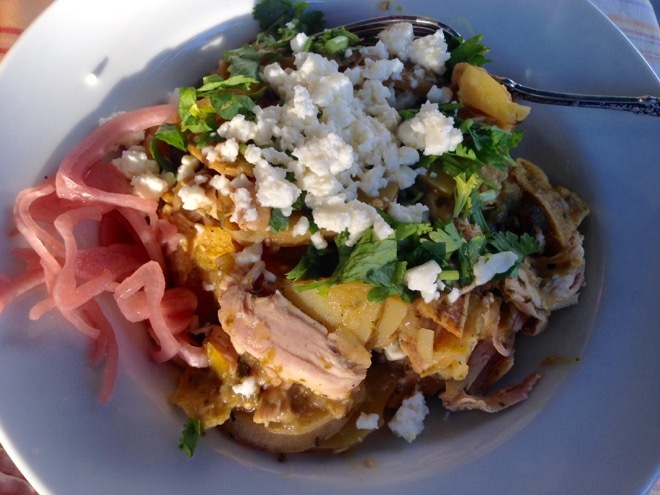 Marina di Chioggia winter squash is one of my very favorites. It’s delicious in soups, roasted, in muffins or quick bread or roasted and tossed with greens in a salad or sauteed greens. It keeps its shape, has a smooth texture and is so flavorful. Since it’s so large and knobby it’s easiest to bake it in large wedges or even just cut in half and then peel it after baking. 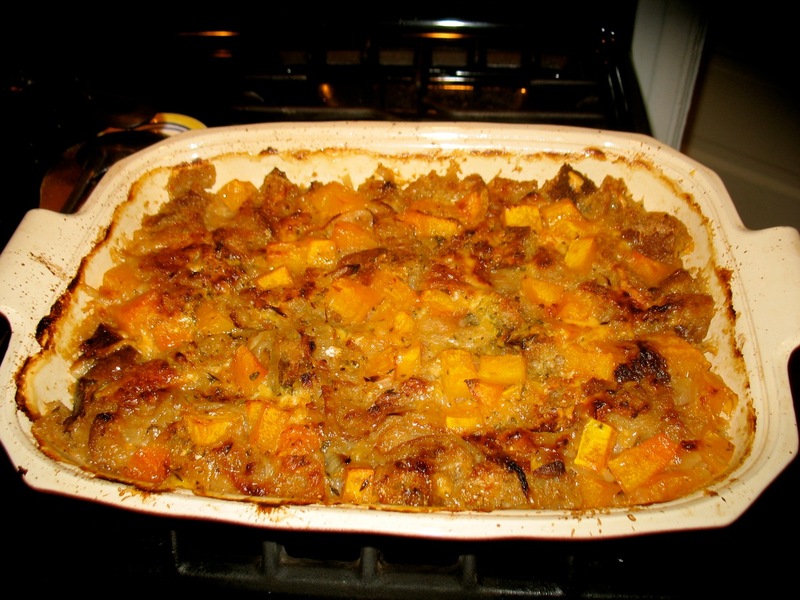 It would be delicious in this squash and onion panade this week. 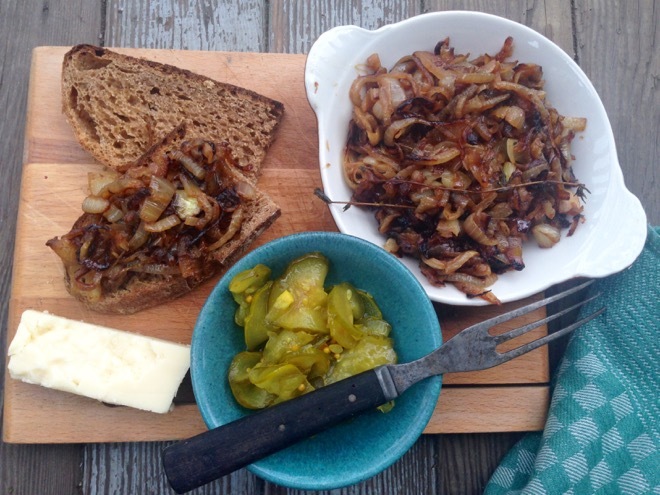 Caramelized onions are delicious just with bread and cheese and a few pickles or on a pizza or alongside roasted meats. These stewed greens and potatoes with yogurt sauce would be good with either your kale or Brussels sprout greens this week. White Beans, Leeks & Sausage this week . . . 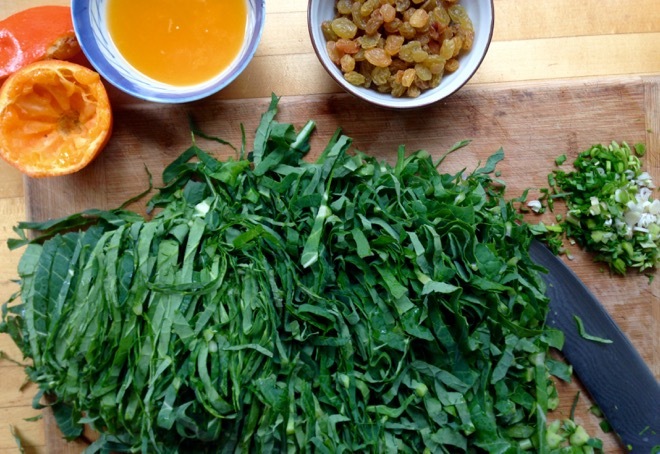 This wonderful, quick citrusy dish would be wonderful with your collard greens this week. 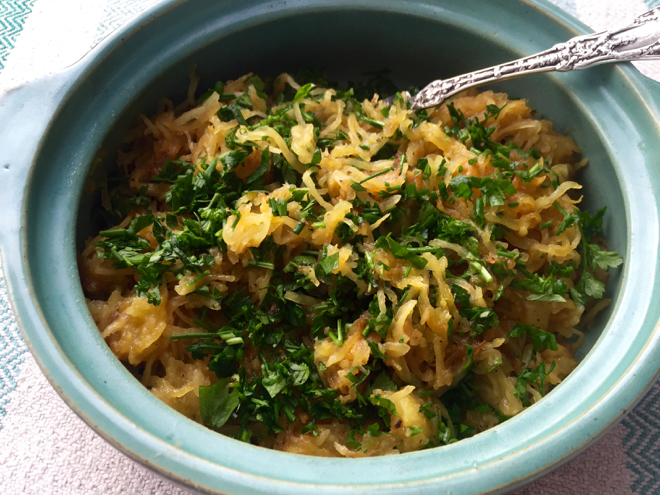 Simple, braised kohlrabi is just delicious and a good accompaniment to many a wintry dish. 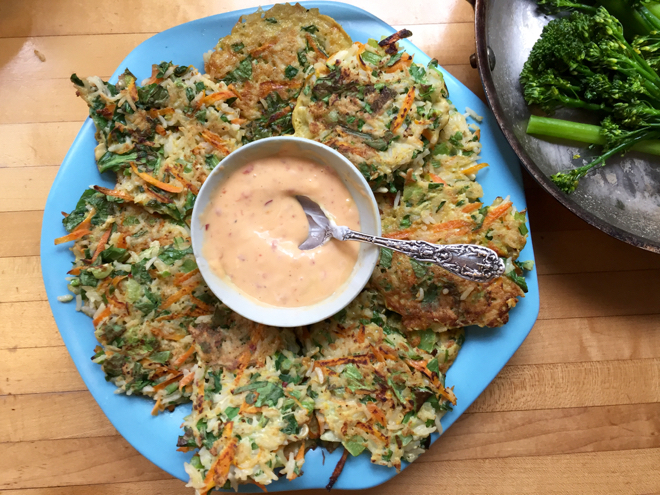 Or if you have a little more time make this Kohlrabi Fritters. They are fantastic! 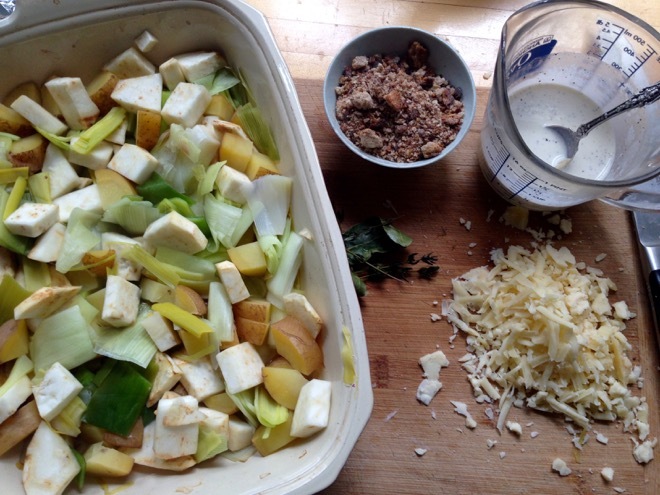 Celery Root and Leek Baked Pasta would be good this week. Your chicory would be delicious in a wintry Nicoise salad. Roasted Brussels Sprouts with Fish-sauce Dressing. Roasted black futsu squash with soy sauce and ginger would be delicious. And no need to peel these lovely little squash! 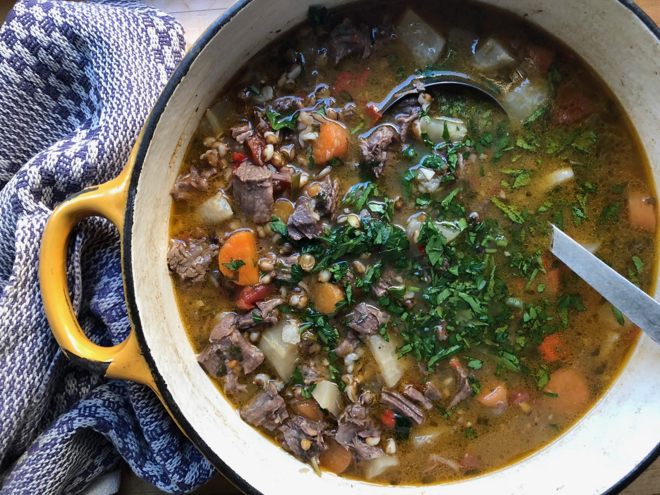 You could use some of your carrots, turnips, purple potatoes and garlic in this beef, barley and vegetable soup. 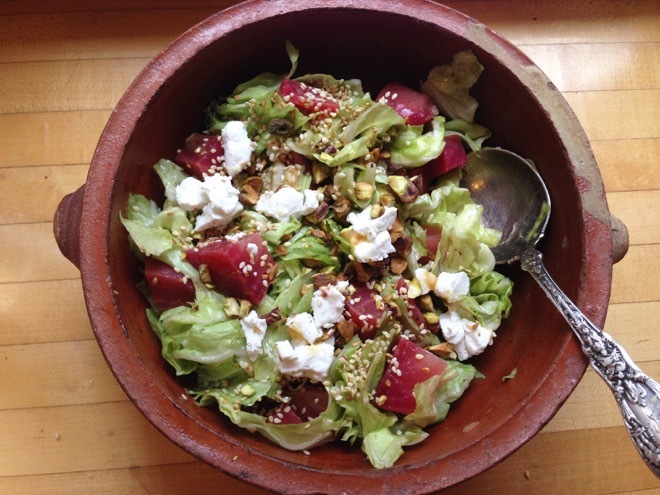 Combine sweet, earthy beets with the chicory (and some fresh goat cheese) for a memorable salad. 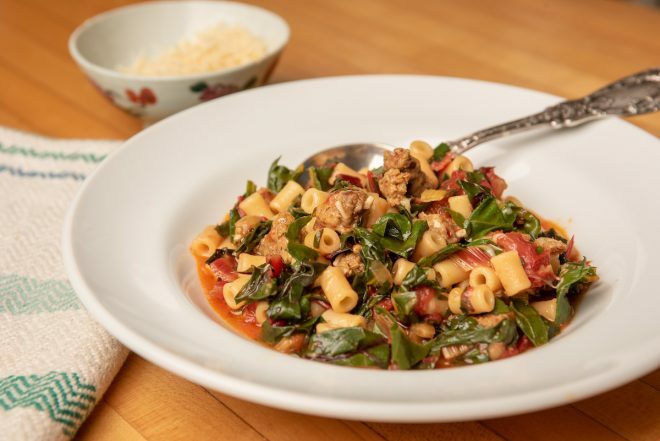 Your kale would be nice in this very quick, one-pot pasta tomato and sausage (or beans) and greens. 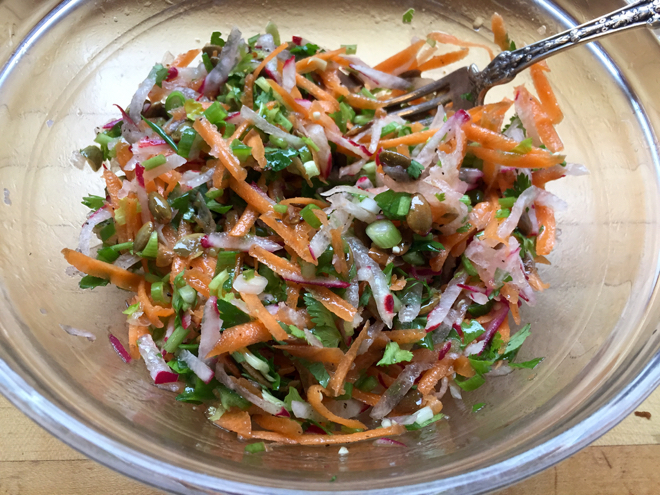 You could make this slaw with the watermelon radish and some carrots but the watermelon radishes are so very good just as a snack too. 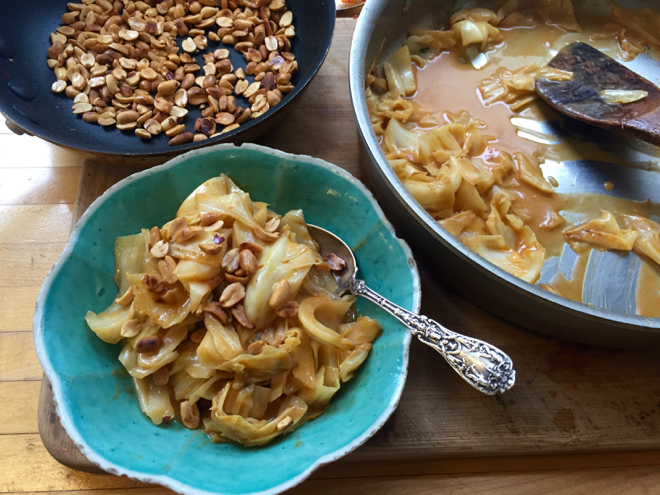 Turn your cabbage into a quick, main dish with this red curry with peanuts. 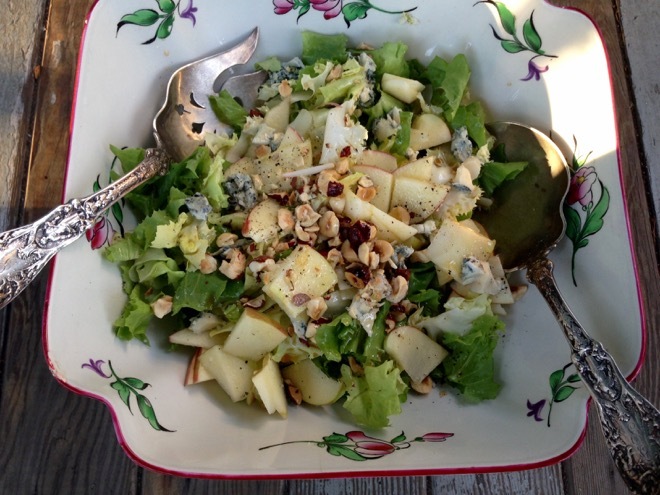 This salad with apples, nuts and blue cheese would be great with your sugarloaf chicory and would be lovely on the Thanksgiving table. For a twist on simply sauteed or roasted Brussels Sprouts make this version with miso and sesame seeds. If you’re not using all your celery for stuffing or soups (Turkey noodle soup after T-day?!) 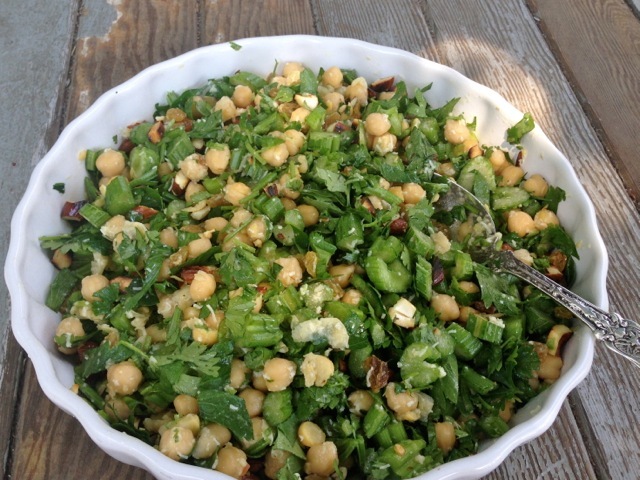 then make this fantastic salad with chickpeas and toasted almonds. Your collards would be delicious with some of your delicata squash and a little bacon in this simple one-skillet preparation. 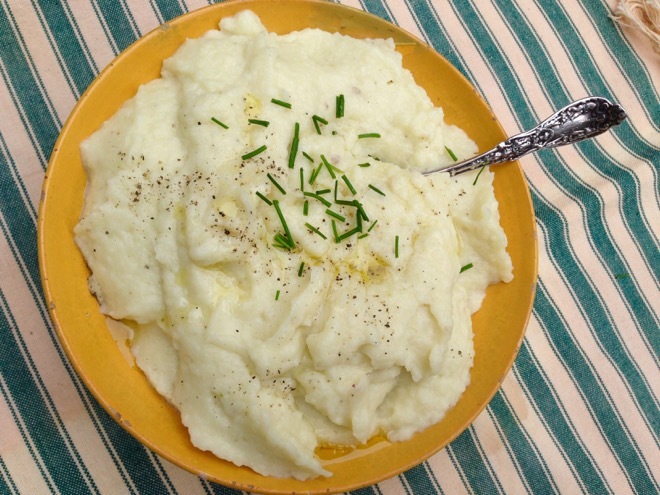 Use your turnips and toss in a few potatoes for this delicious mash. You could use some of your jalapenos to make a version of this green harissa, that will then add flavor to lots of different dishes. This simple and flavorful Portuguese soup would be delicious with some of your kale and potatoes this week. 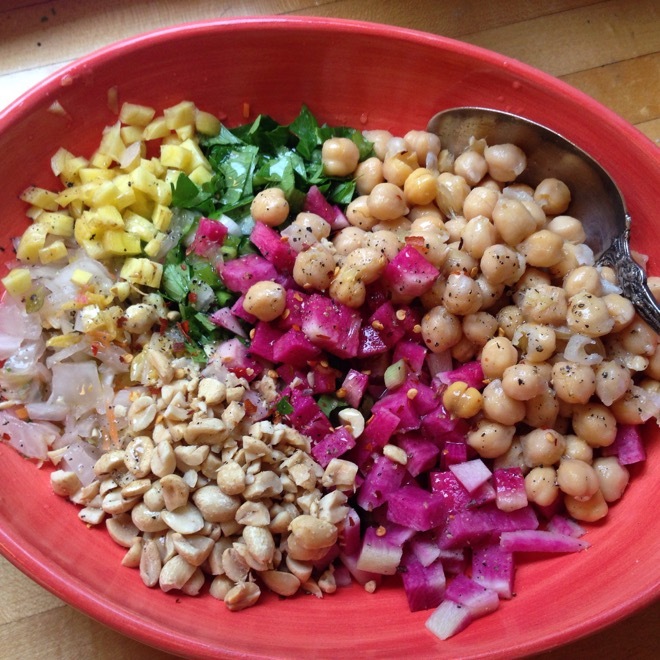 Use some of your watermelon radish in this hearty, crunchy, wintry salad with chickpeas. 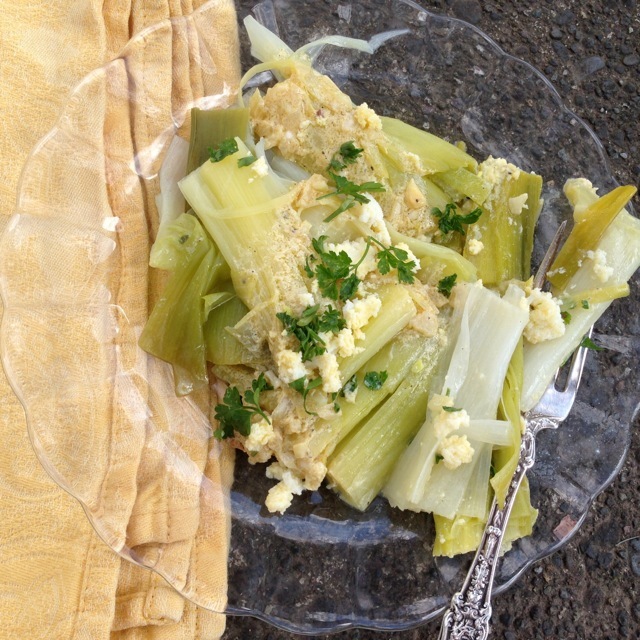 This hearty tartines of stewed leeks, goat cheese and chopped egg are an all-time favorite. 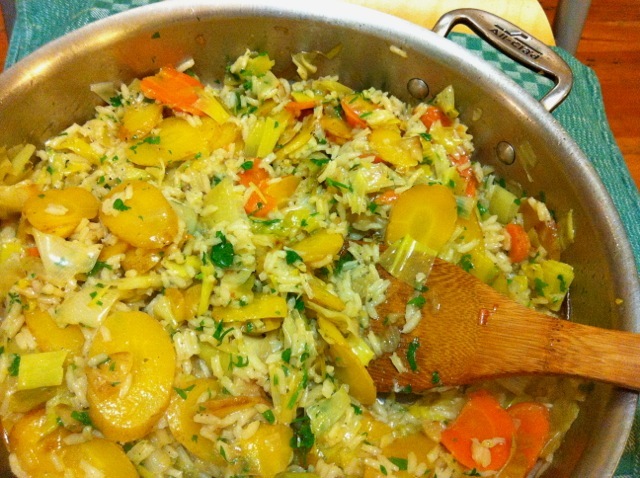 This Fennel Pilaf would be perfect this week. 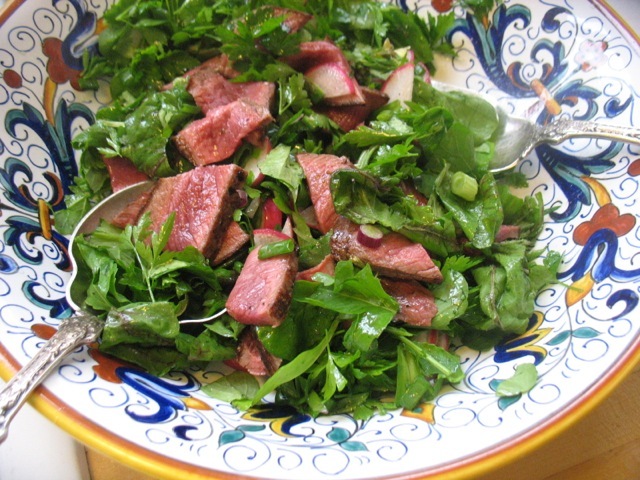 You could use some of your watermelon radishes or turnips and arugula for this quick flank steak salad. Finally, I would suggest just halving the acorn squash, scooping out the seeds and baking it cut side down until tender in a 400 degree oven. That way you don’t have to fight the tough shell-like skin very much. You can season it in many ways, from the classic butter and brown sugar to olive oil, parsley and garlic to cumin and chili flakes. 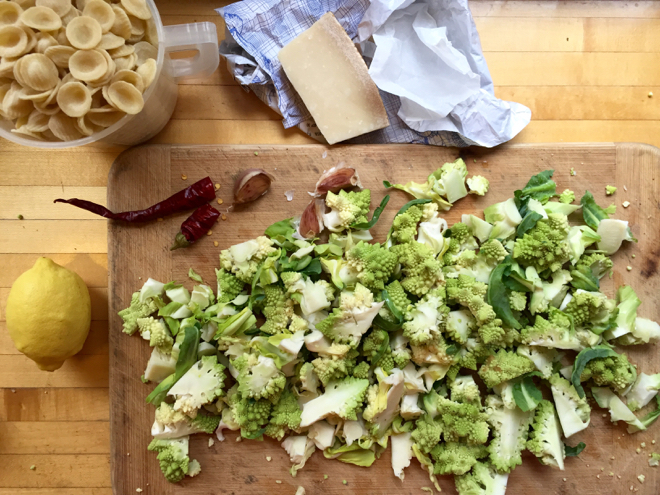 Pasta with Romanesco, Hot Pepper and Parmesan would be perfect this week. And you can just make the flavorful vegetable part and skip the pasta and serve it with a frittata or some roasted or grilled meat or stewed beans. 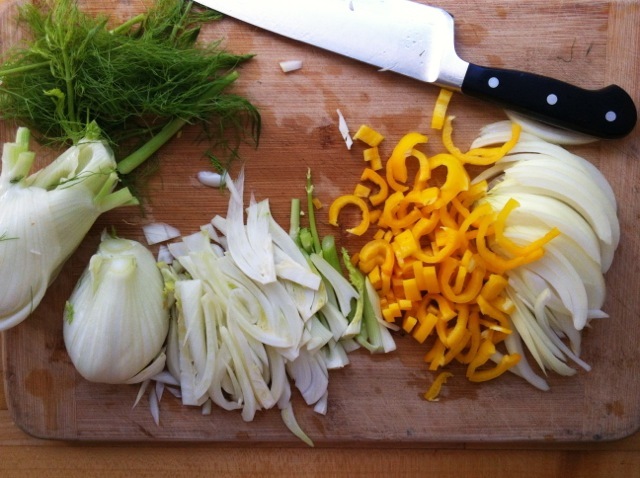 I’ve been making a fall minestrone with carrots, peppers, fennel and the spring raab. Use this template and mix and match your vegetables to your taste. 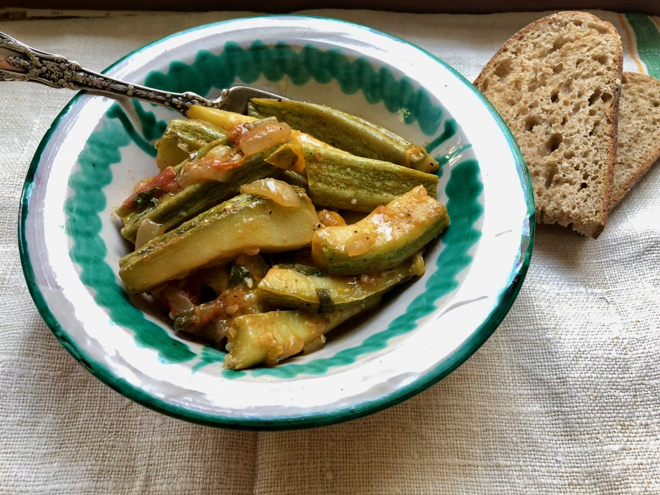 This delicious, savory, hearty side dish came about last week as I needed to use up fennel, sweet and hot peppers, a tomato or two and cauliflower leaves. Green tomatoes would work well here too. These sweet and sour turnips and carrots would be wonderful this week. 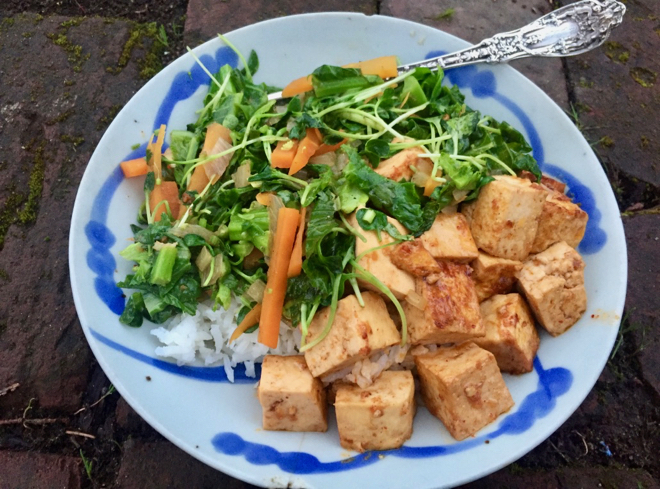 This dish of gingery tofu and greens would be wonderful with your spring raab. Make these delicious Punjabi-style Potatoes and Tomatoes and use some of your hot peppers as well. Use your Spring Raab and some tomatoes to make this quick, delicious, one-dish meal. If you still have Napa cabbage and a few carrots you could make a batch of kimchi. This dish of braised sweet peppers, fennel and onions would be great this week. 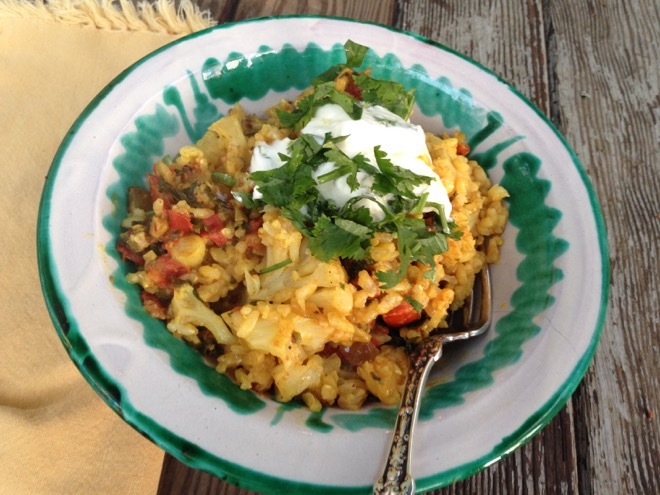 This is another good, meal-in-one; Cauliflower, Rice and Coconut Milk “Casserole”. Collard Greens with Tomato and Bread Crumbs might fit the bill this week. 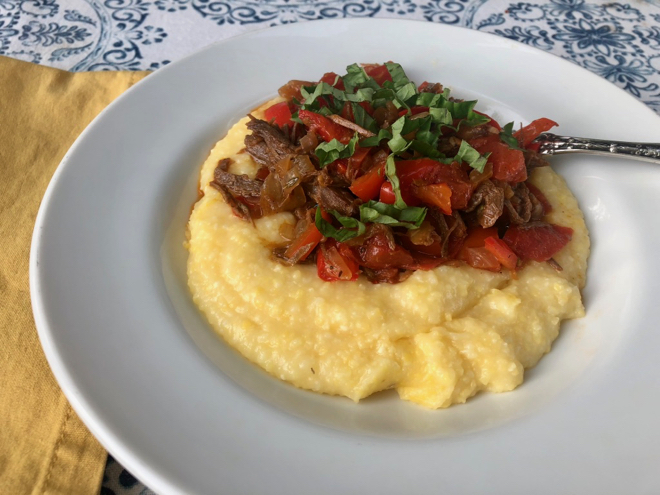 Use your Jimmy Nardello peppers and red onions and a little tomato to make this wonderful ragout to top polenta, pasta, or anything else really. Or use your peppers for this simple, simple dish. The purple potatoes would be beautiful, too! 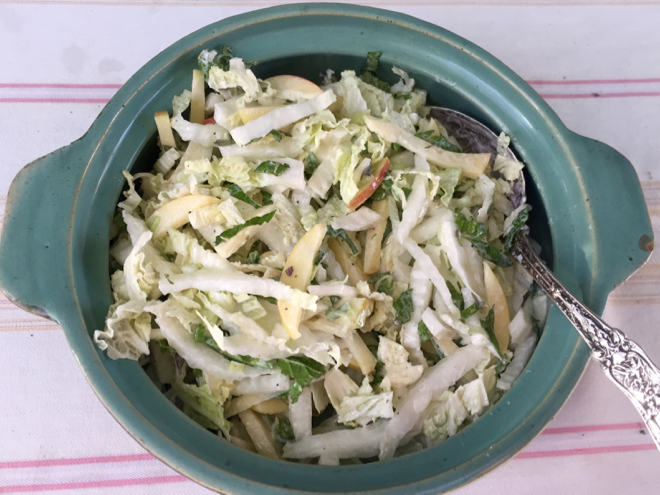 This Napa cabbage slaw with mint and apples would be lovely. Make these daikon pancakes and use some red onion instead of scallions. 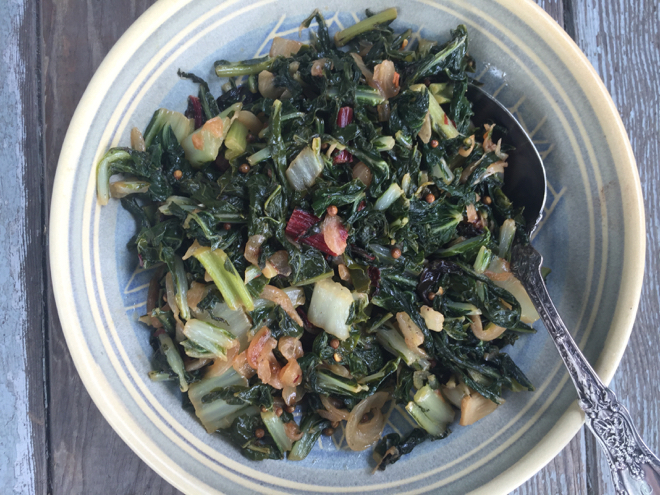 Onions and ginger enliven this silky collard greens. 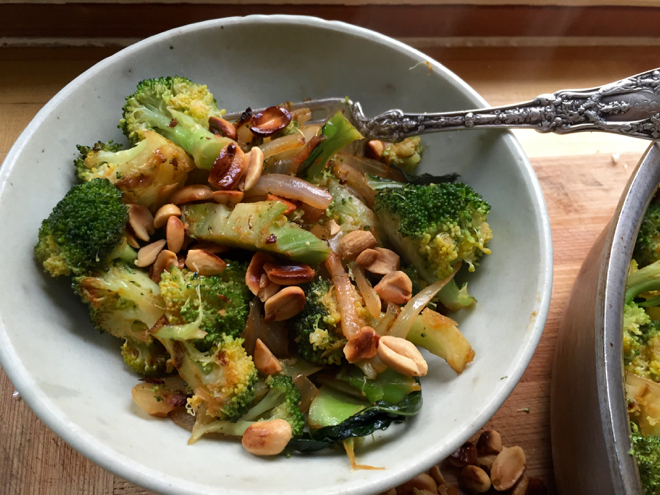 This super quick dry red curry with broccoli and toasted peanuts might be good this week. 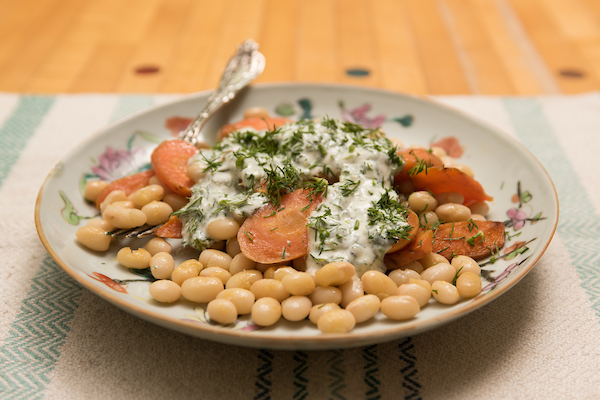 This is a lovely, hearty, vegetarian dish: White Beans with Carrots and Yogurt and Dill. 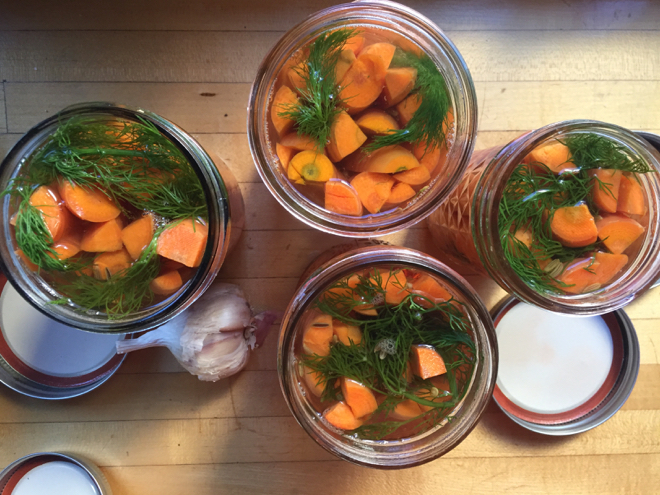 Might be a good week for pickled Dilled Carrot Spears. 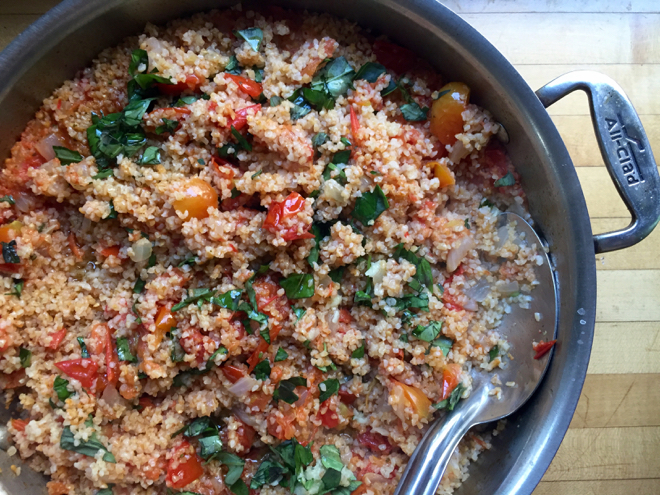 Tomato Bulgur with Basil and Garlic is quick, satisfying and delicious and can be adapted to suit your taste. These Miso-braised Turnips are always a good idea. And finally this Cook-with-what-you-have Salad w/ Creamy Miso Dressing might be good this week, too. Your summer squash, braised with tomatoes and finished with lemon might be good this week. 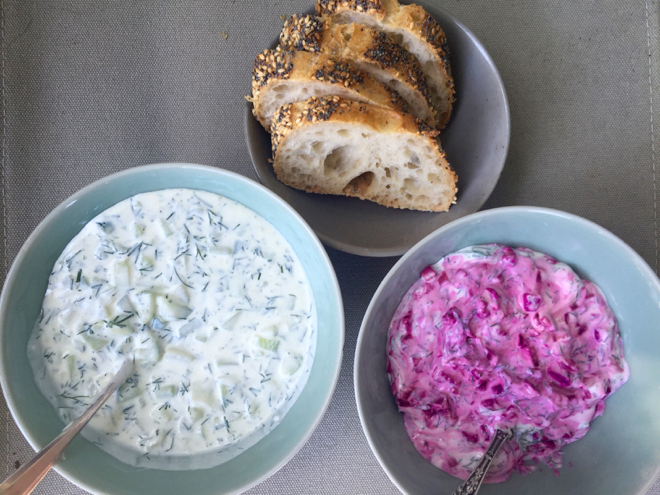 You could use one some of your dill and beets for this cool and lovely beet “tzatziki” or make a traditional one with your cucumbers. 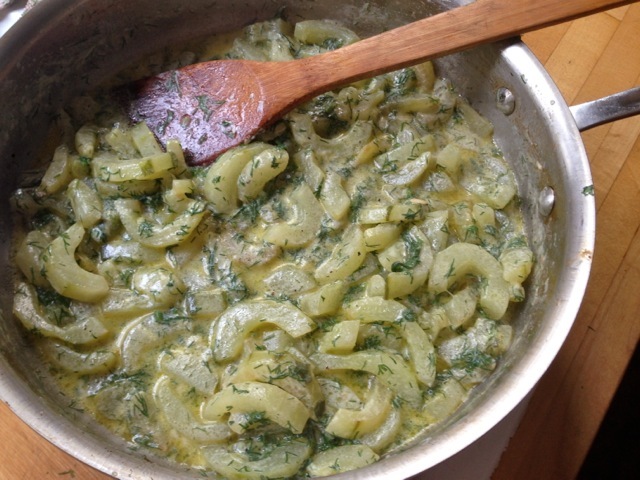 Or make this unusual but delicious German dish of braised cucumbers with dill and sour cream. 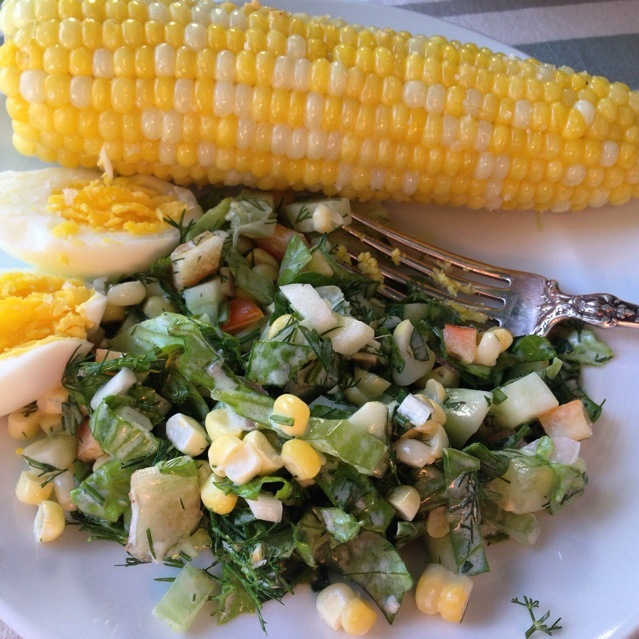 Corn, Cucumber Salad with Buttermilk Dressing might be good for one of these hot nights. Or toss your corn with your tomatoes, maybe some of the purple potatoes (instead of/or in addition to the black beans here). Your Summerfest Komatsuna is delicious in a quick stir fry with noodles. This dish of green beans, potatoes and tomatoes is so much more than the sum of its parts. If you can bear to have the stove on for this long, give it a try! 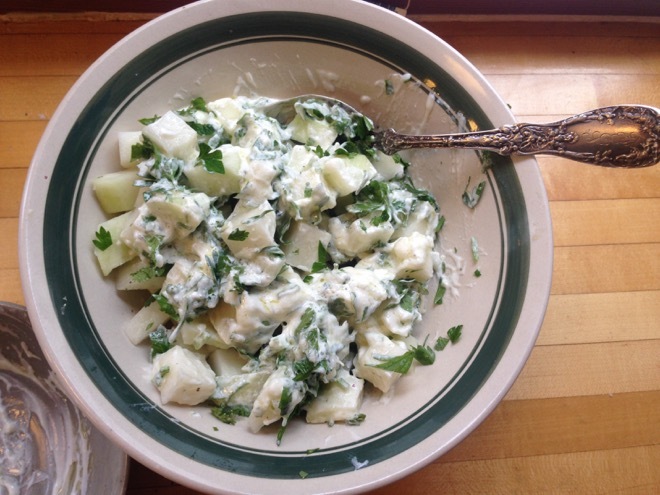 Use some of your cucumbers to make raita and put it on everything. It’s cooling, a little spicy and just so good. 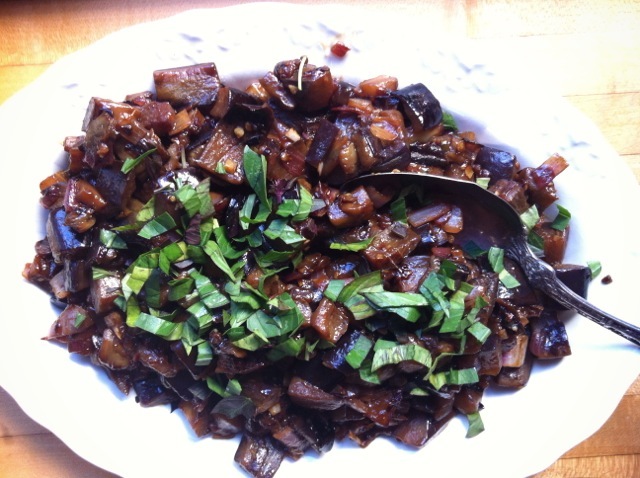 This sweet, sour and hot Chinese eggplant dish is quick and delicious. I’ve been adding peaches to my green salads but you could use apples or berries here as well. 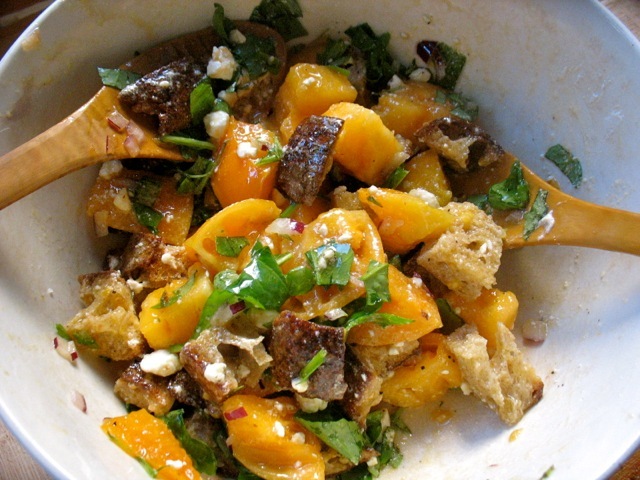 I just like the addition of a handful of fruit to these savory salads. 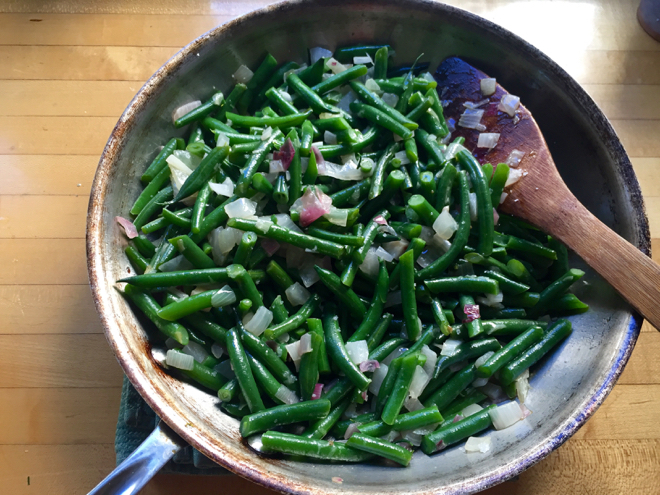 These simple buttery green beans and onions would be lovely this week. 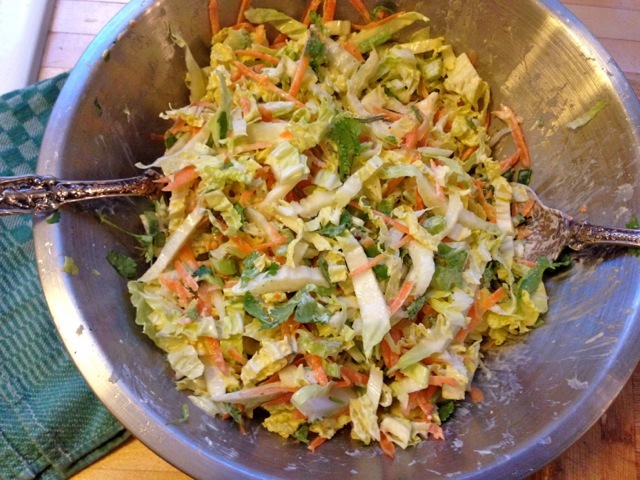 If you have any Napa cabbage left, make this really bright, flavorful slaw with your Summerfest Komatsuna. You might even be able to make a version with just Summerfest if you don’t have Napa or maybe add a little romaine. Give it a try! 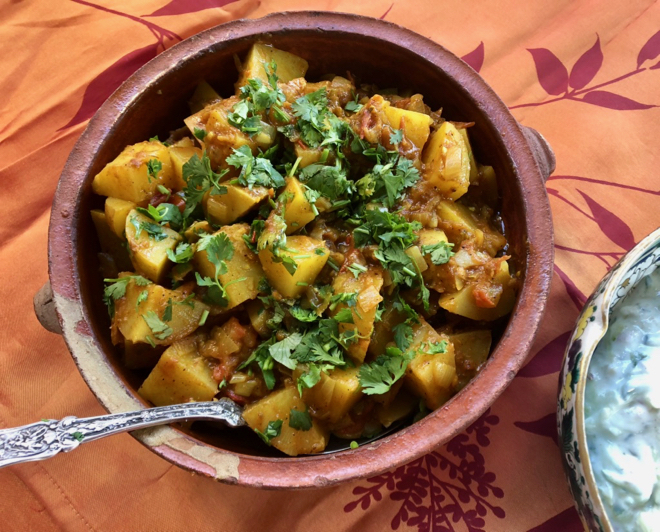 Even though it’s going to be hot this simple, coconut milk summer squash and potato curry is really quick and tasty. 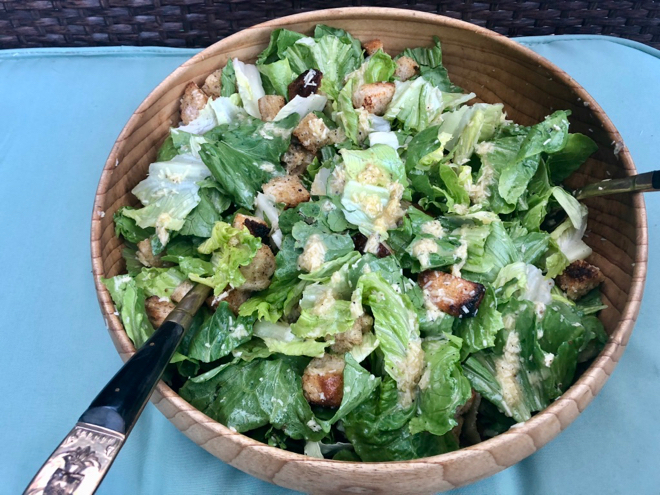 Your romaine would be good in this template cook-with-what-you-have salad of greens and beans and if you still have some dry beans left, cook those and make this your lunch option for the week. Spring onions and blanched green beans would be good in this as well. 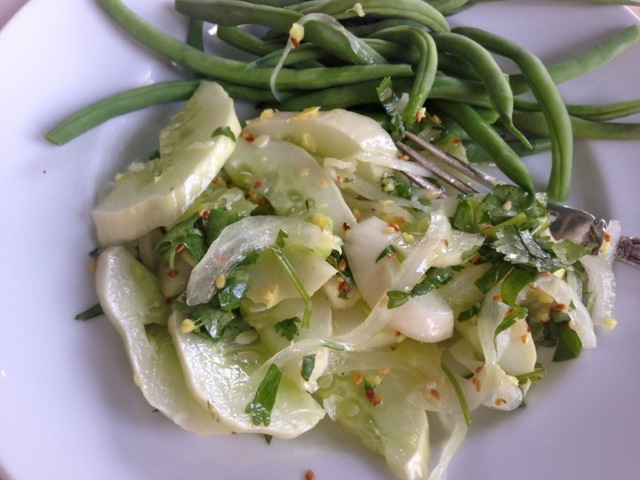 This quick-pickled cucumber salad is one of my favorites! And you can use a little of your dried cayennes from a recent share. 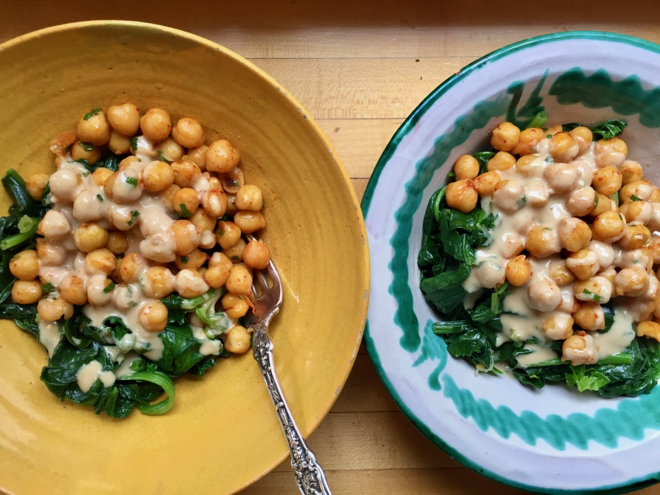 You could us your Summerfest Komatsuna in place of the spinach in this dish with chickpeas and a miso tahini sauce. 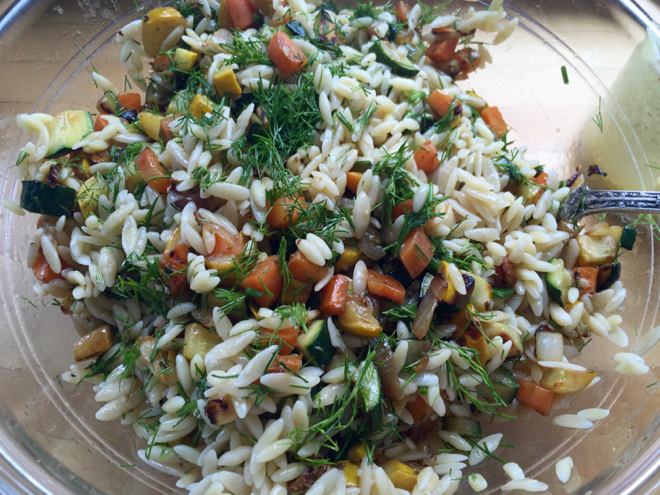 This Zucchini and Orzo Salad is a great template and is wonderful with dill. 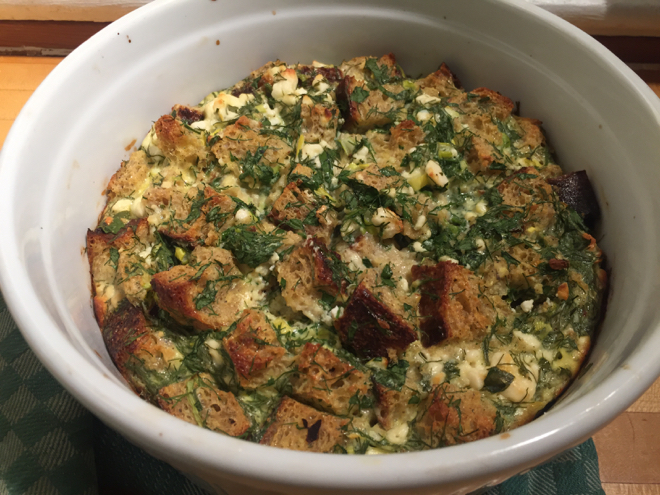 Either dill or cilantro would be delicious in this Savory Bread Pudding as would some of your garlic and even some sauteed summer squash. Cook your dry beans an then have them on hand for bowls like these. 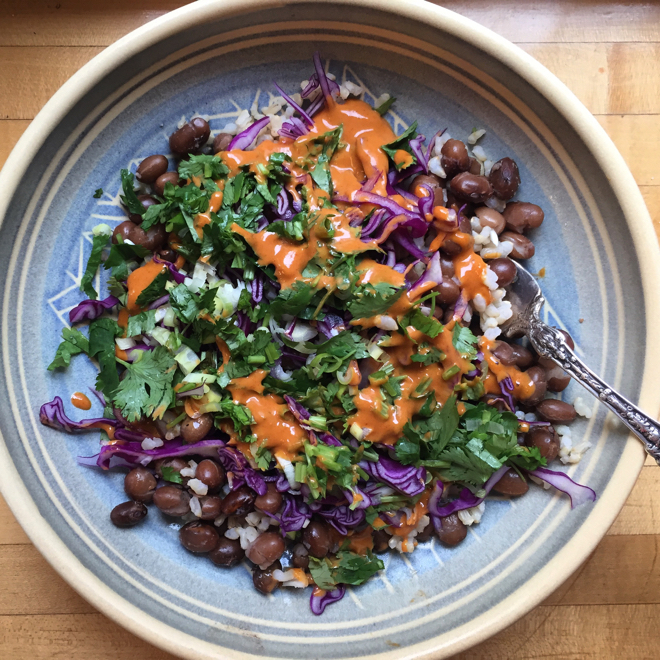 Some of your cilantro and/or Napa cabbage would be great here and you could use some of your dried cayenne from last week in the tahini sauce. 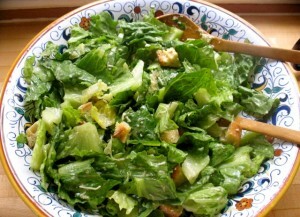 If we get gorgeous Romaine like last week I’ll certainly be making Caesar salad. 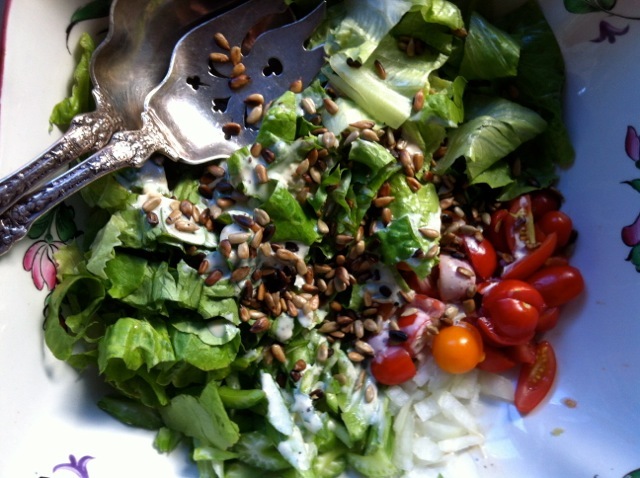 Or I’ll make this salad with dill and buttermilk dressing. Use your Napa cabbage and spring onions in this easy, delicious dish. You could make this snap pea risotto and toss in your radish micro greens at the very end instead of pea shoots. 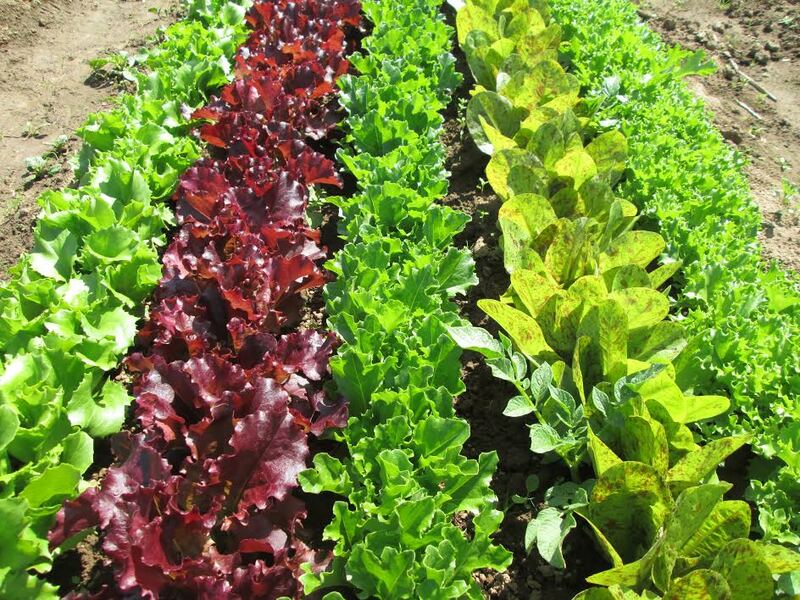 Seems time for the Lettuce Management post w/ lots of ideas for cleaning, storage, salad variations, etc. Your salad turnips and summer squash (instead of the purple sprouting broccoli in this photo) would be delicious in a green curry. 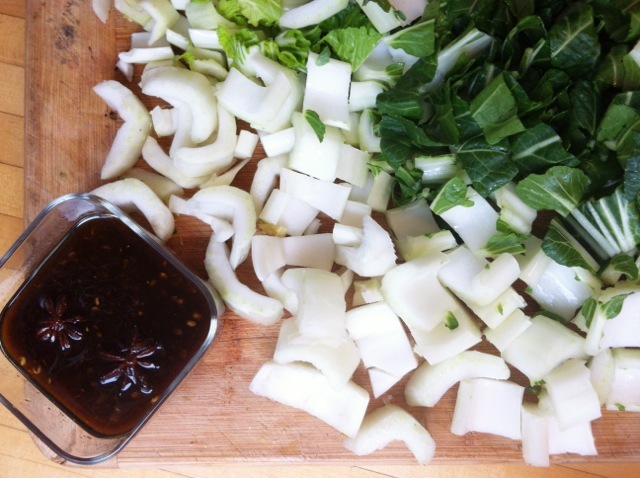 Joi Choi is delicious in this warm dish with ginger dressing. 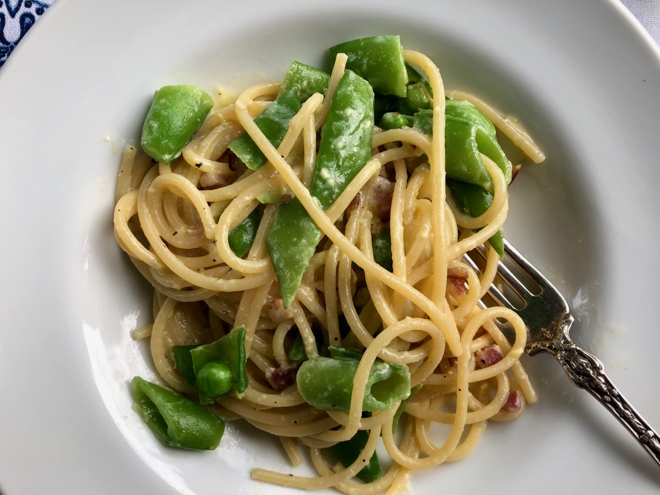 Your snap peas would make a wonderful pasta carbonara variation. Miso-braised Salad Turnips is one of my favorite preparations for this tender root. 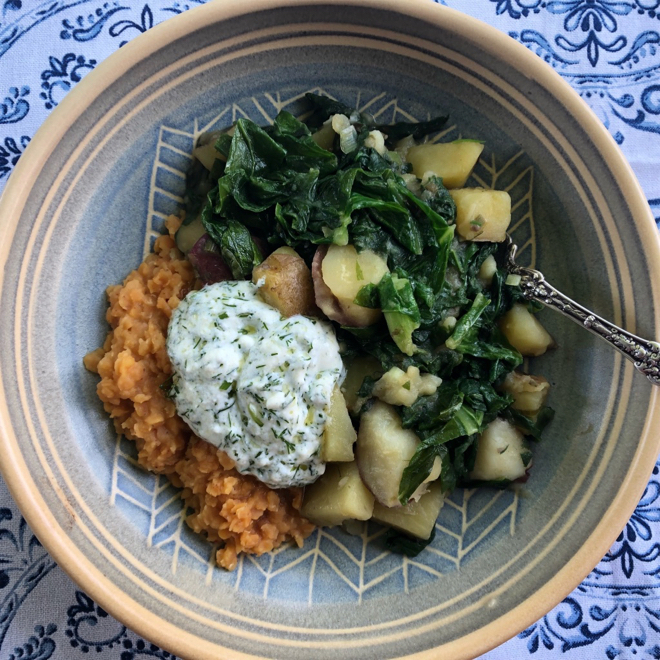 If you’ve accumulated some potatoes you could make this stewed potatoes and spinach dish with yogurt sauce (and red lentils, if you’d like). This simple salad would be good with your baby lettuces, radishes, snap peas, new garlic and some of the radish micro-greens. Grill your perfect, young fava beans and spring onions together in this savory marinade and use plenty of your spring garlic in the marinade. 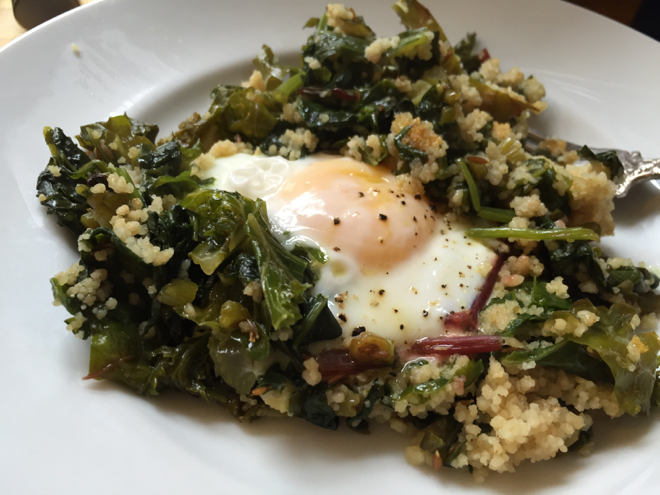 You could use your turnip greens and cauliflower leaves and lots of garlic scapes in this dish of greens, couscous and eggs. 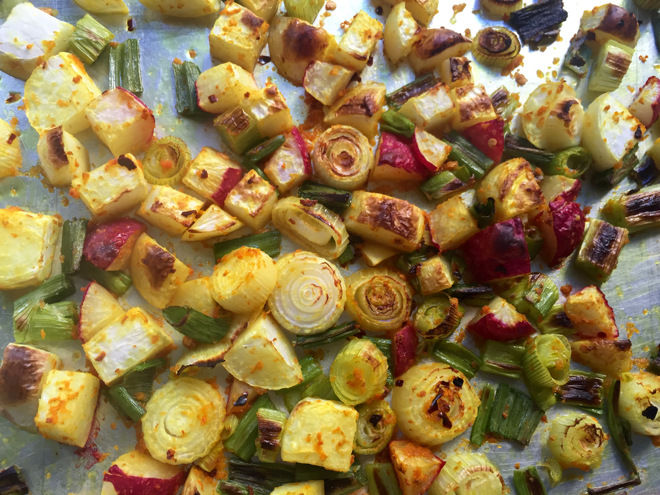 This beautiful of pan of Turmeric Roasted Spring Vegetables would be a good use of radishes, turnips and spring onions. 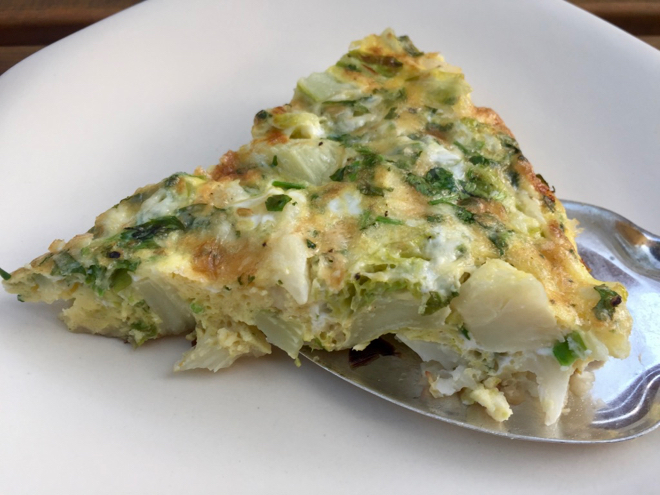 This cauliflower and garlic frittata would be perfect this week, using either garlic scapes or new garlic or both. 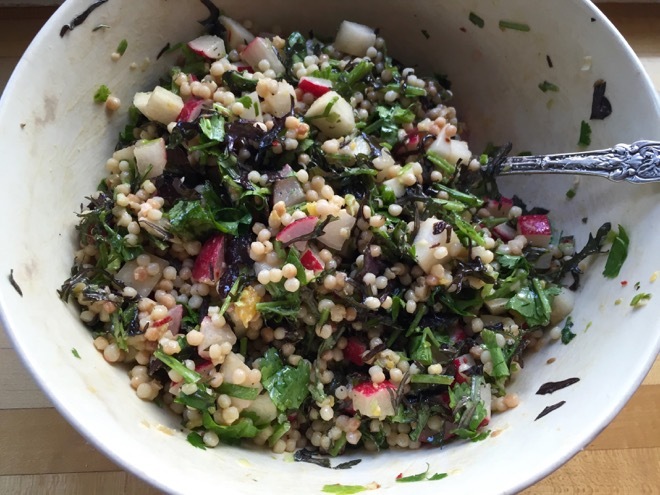 This hearty salad with Israeli couscous, turnips and radishes would be a great place for your micro pea shoots. Welcome to the 47th Ave Farm Summer Share! I’ll be posting recipes here every other week that use the produce in your share. Please let me know if you have any questions–katherine@cookwithwhatyouhave.com. Happy Cooking! 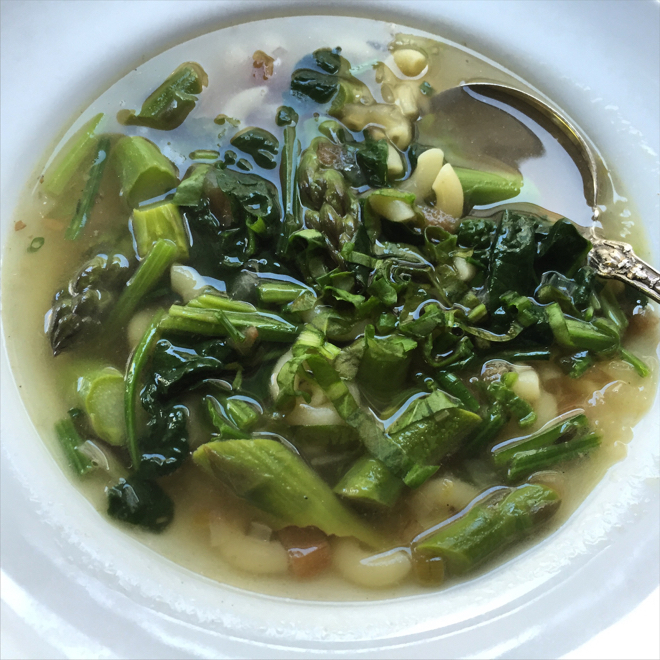 This Bean & Farro soup would be benefit from your celery and green garlic and highlight those gorgeous dry beans. 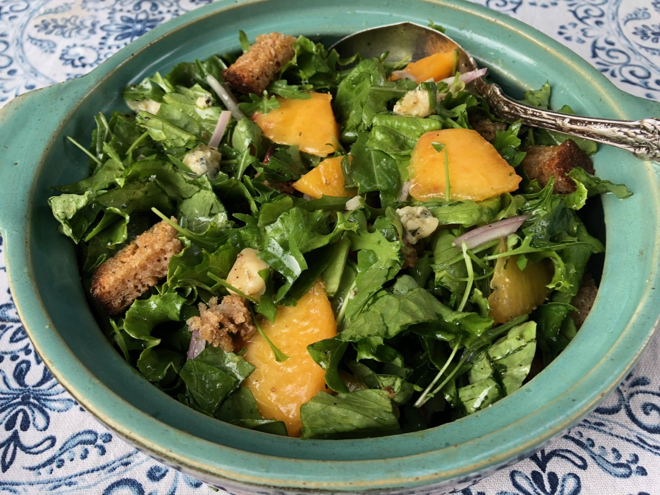 Your baby lettuce will be delicious in this salad with some green garlic and the microgreens (instead of the basil called for). 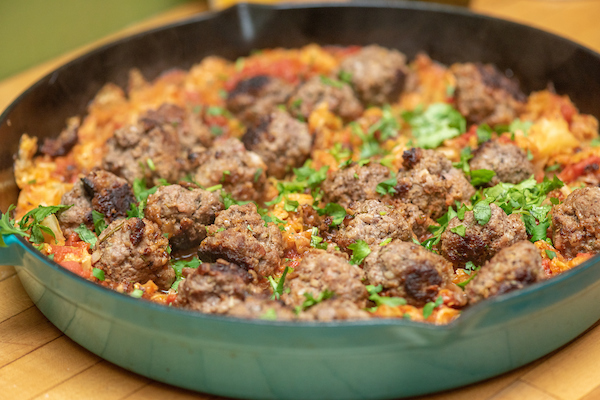 This Cauliflower, Potato & Sausage Skillet is a quick meal-in-one. You can skip the sausage and a bit more potato and tomato in stead. 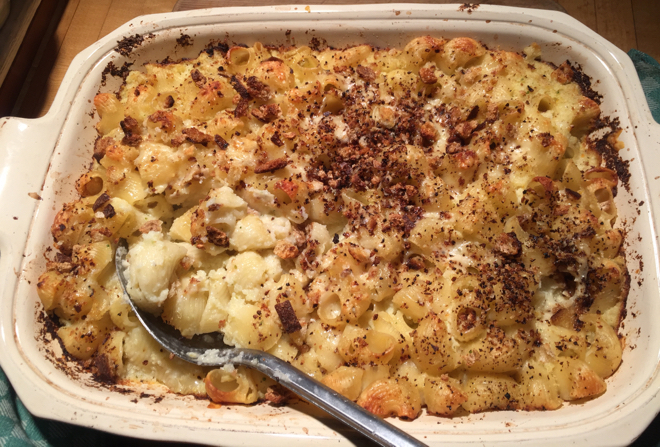 And Cauliflower Mac & Cheese is always a hit! 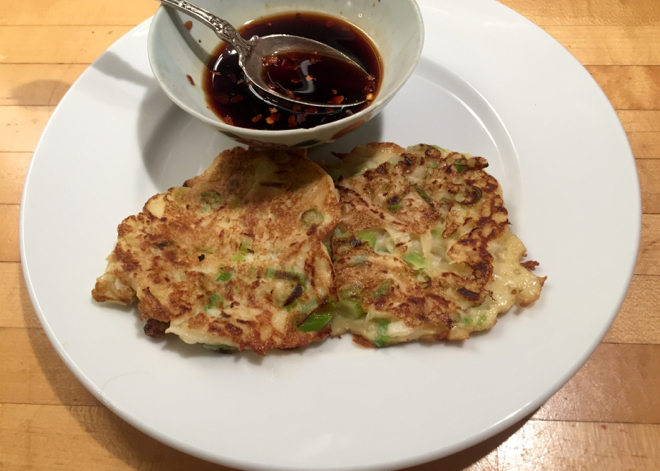 Spring Onion Pancakes are delicious with their soy and rice vinegar dipping sauce. I made this Cauliflower and Green Garlic Frittata (using all the leaves from the cauliflower too) with our last share. It’s so delicious. This bowl of polenta topped with a vegetable ragout of leeks, carrots, onions, green garlic would be lovely this week. 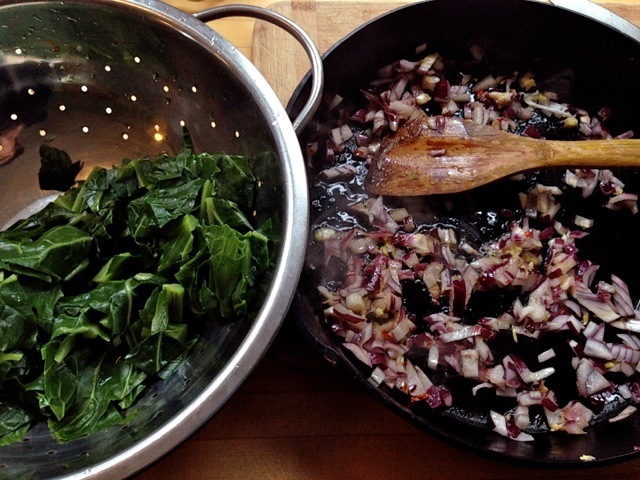 You could certainly add some collards to the ragout as well. 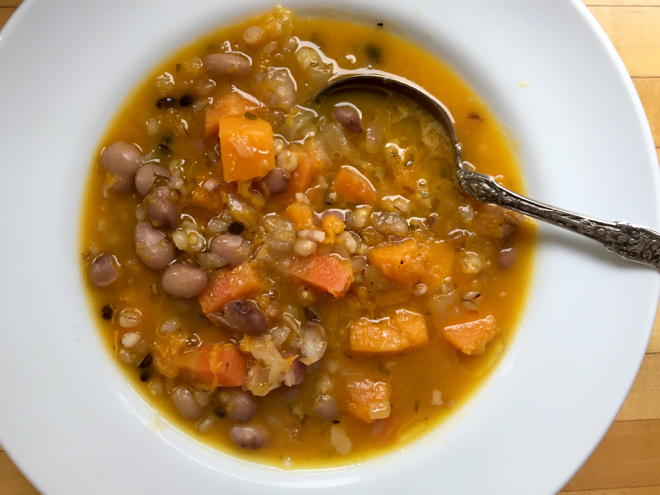 This Winter Squash (and bean) and Barley Soup will be good this week because it still feels like winter! You could top it with some of our radish seedlings for a springy accent. This Cauliflower, Potato and Sausage Skillet would also be good this week. And radish seedlings would be a good garnish here as well. 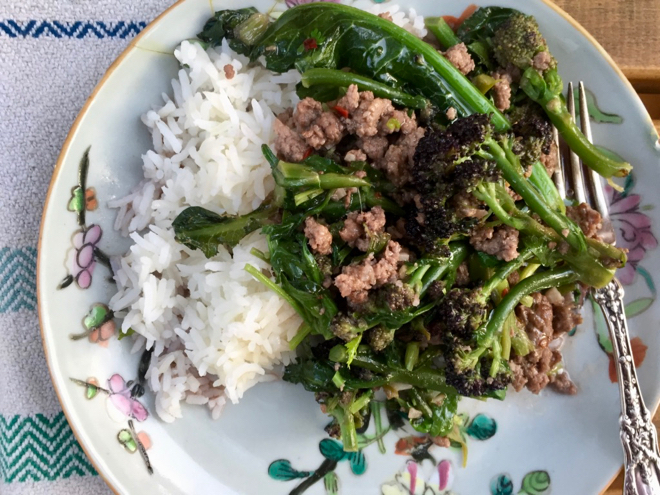 Purple sprouting broccoli from the last share turned into this quick, delicious, stir-fry with ground beef (lamb wold be delicious too). 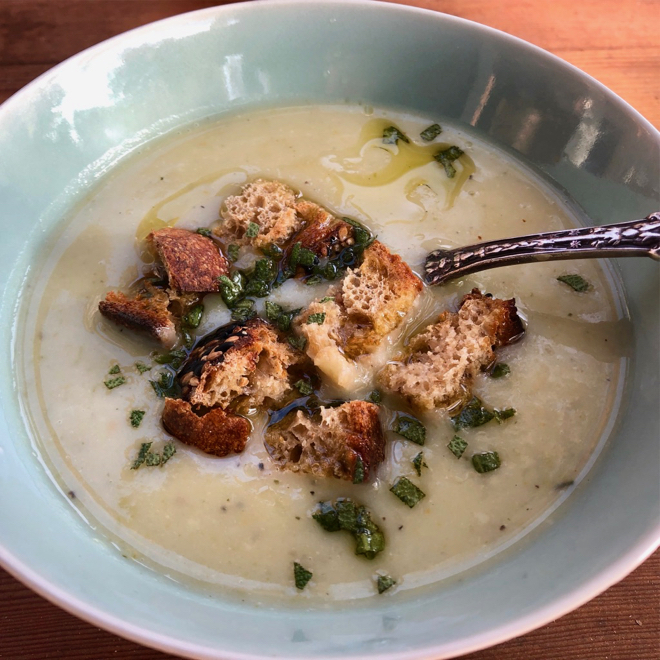 I’ve made this potato leek soup twice in the last 10 days, using the leeks and potatoes from the share and it’s just so good. You could use some of your micro greens or thinly sliced green garlic tops as garnish. 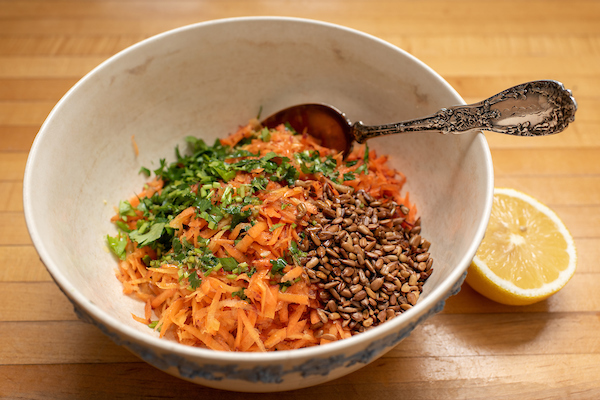 You could use your micro greens (subbing for the sorrel and/or parsley) and some of your green garlic in this springy, vibrant and hearty grain salad. 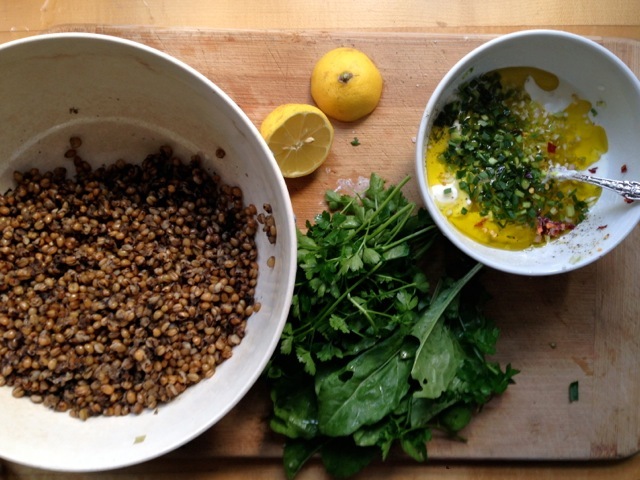 If you don’t have frikeh (toasted green wheat) use barley, wheat berries or farro. If you have leftover hardboiled eggs from Easter you could use some in this lovely Spanish-style roasted cauliflower salad. This dish of purple sprouting with leeks, garlic, and Parmesan would be delicious this week. Forgive the awful photo but do make this roasted onion and winter squash dish with a lemony tahini sauce. 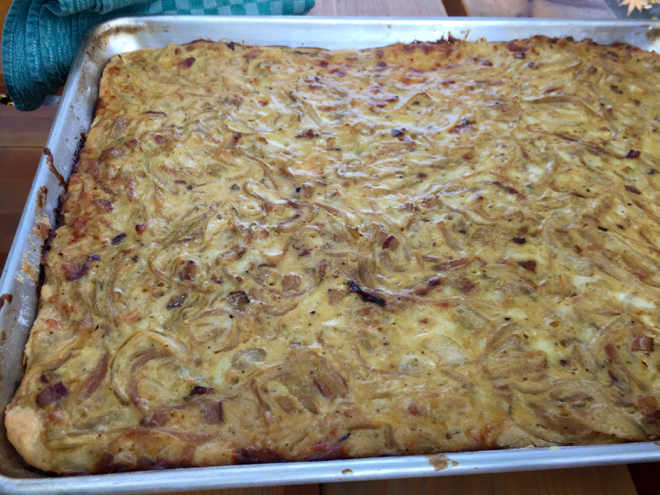 I’m making Zwiebelkuchen (onion tart) with some of my delicious 47th ave onions this week. Oh the greens this week! 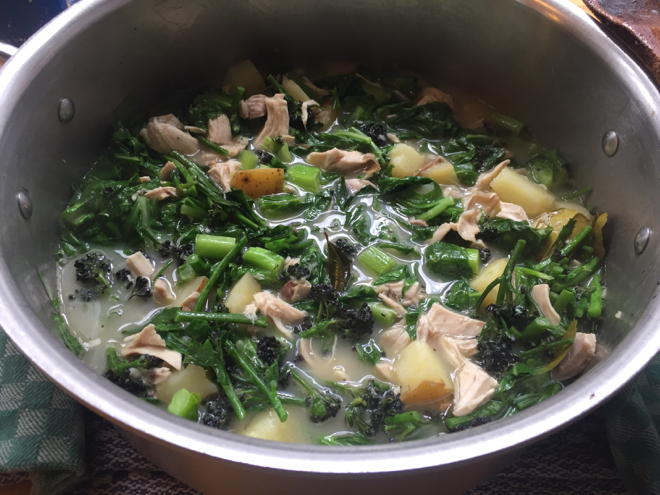 This beautiful pot of Thai-inspired green curry would be a good place for some of your purple sprouting broccoli, spinach, potatoes and/or collards. And you can skip the chicken for a vegetarian version. 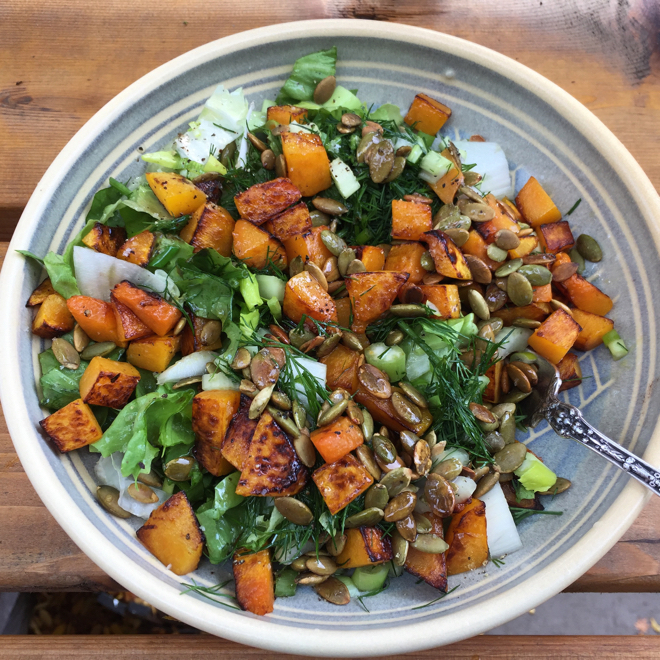 You can substitute winter squash for the sweet potatoes and collards for the kale in this warm, hearty salad with a miso dressing. 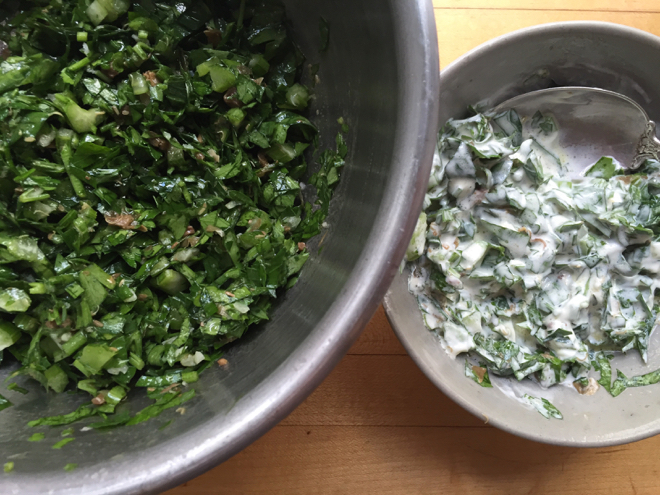 Use your black radish to make this quick little slaw/spread with yogurt or sour cream and use some of your onions instead of the scallions called for. If you have a back log of onions is might be time for the wonderful, warming Indian dish Mojadra (lentils and rice with caramelized onions). It’s supposed to be very cold this weekend. 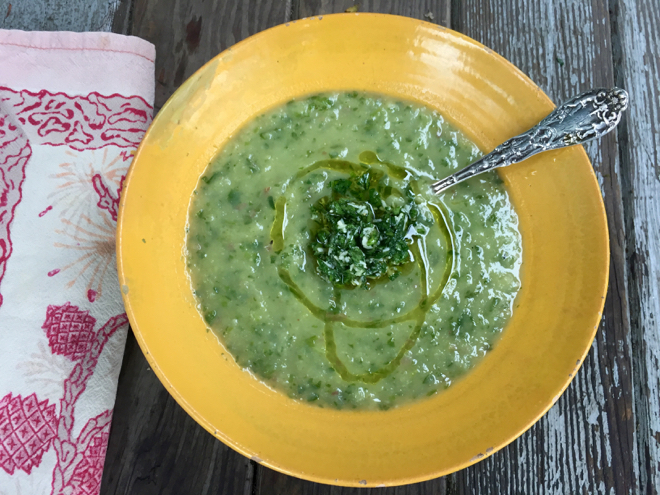 This week’s share enables one of my favorite soups of all time. 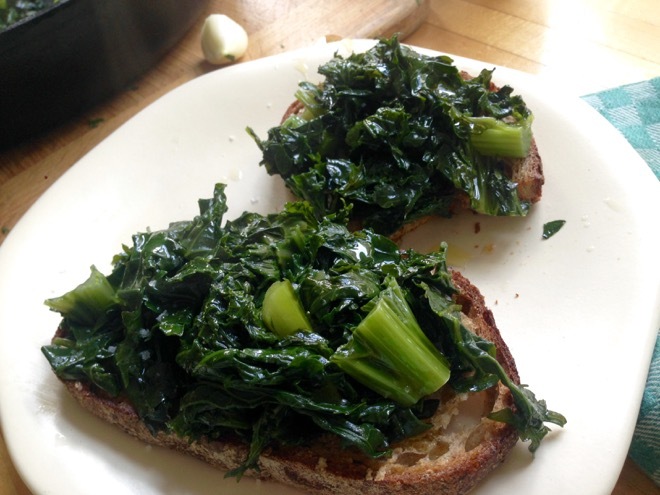 Use your leeks and chard for this lovely dish. Your sweet little cabbages would be wonderful in this quick braised dish. Here’s a simple preparation for your Raab and a handful of quick variations/combinations. 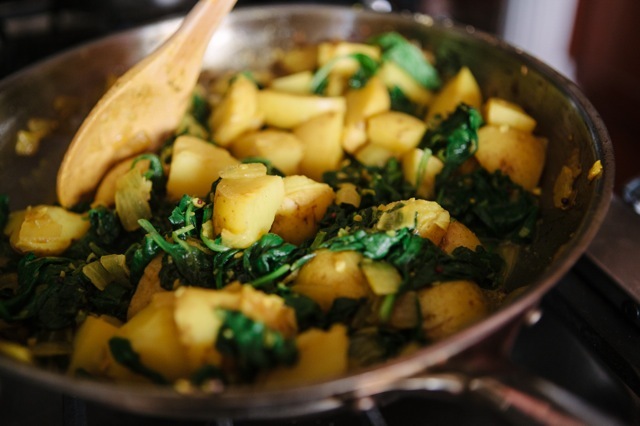 Turmeric, ginger and mustard seeds season this fragrant dish of spinach and potatoes. 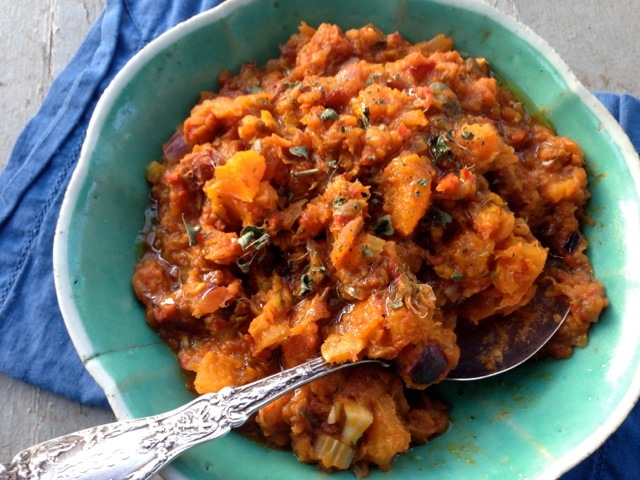 This winter squash & peanut stew would be delicious with the butternut or winter sweet squash. 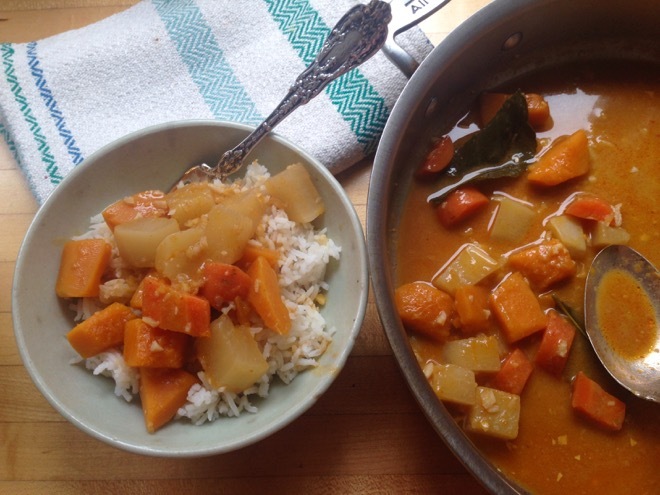 Make this Red Curry w/ Rutabaga & Winter Squash this week if you want a little spice and warmth. Or make Rutabaga & Carrot Latkes. This Braised Collard & Cabbage Dish with Garlic & Hot Pepper might provide some warmth on this very cold week. Use some of your butternut squash and red onions to make this wintry version of caponata. It’s so good! These Roasted (or panfried) Brussels Sprouts with Fish Sauce Vinaigrette would be good this week. 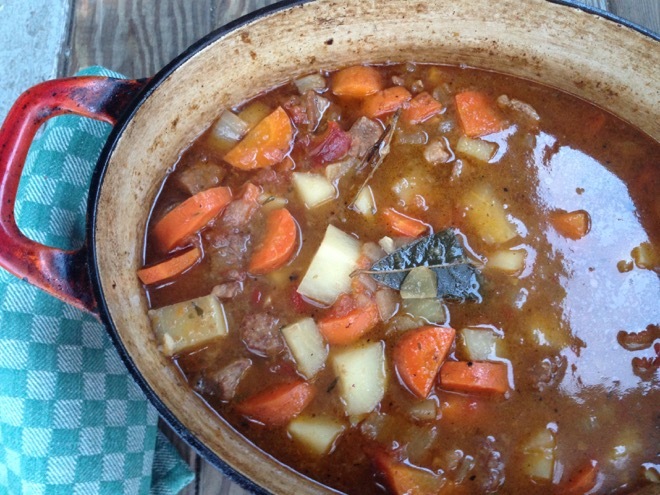 It would be a very good week for this Beef Stew with Kohlrabi, Turnips and Carrots. 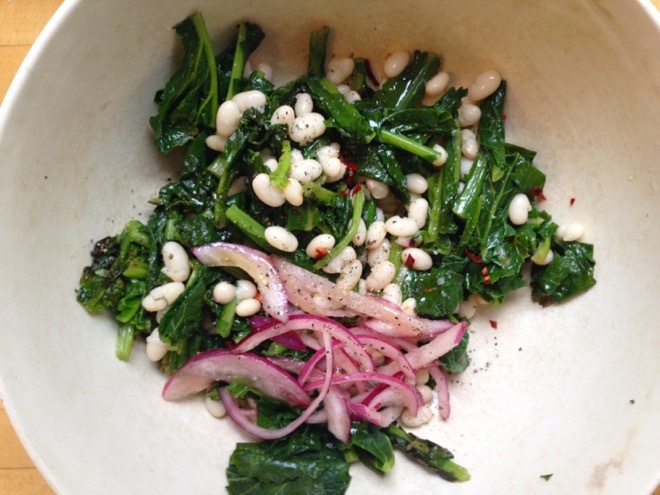 Kale Raab, White Bean & Pickled Onions would be lovely on one of these springy evenings. Add a little cayenne to this as well. 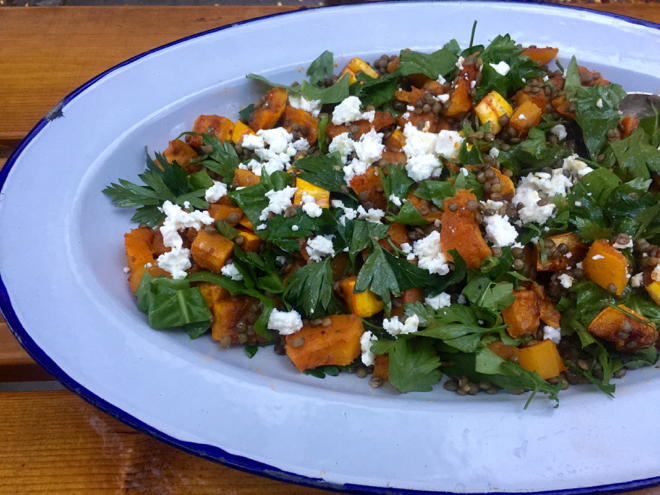 Your Butternut squash would be good in this Spiced Lentil Salad and you could also roast some turnips alongside the squash. 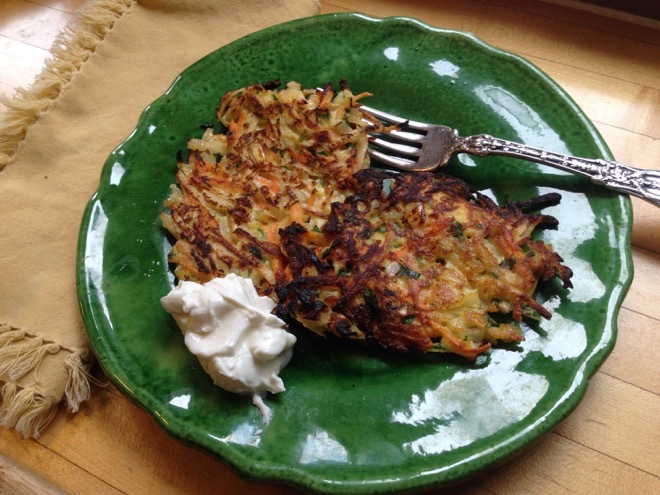 These Leek and Potato pancakes are awfully good! 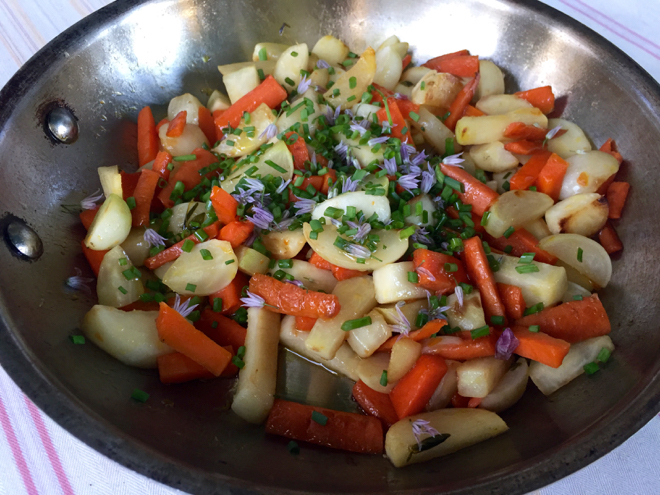 The rutabagas are so sweet and delicious and would be good, along with carrots, maybe fennel and even some delicata squash in this Roasted Roots (I realize fennel and squash aren’t roots:) with Citrus Rosemary Vinaigrette. 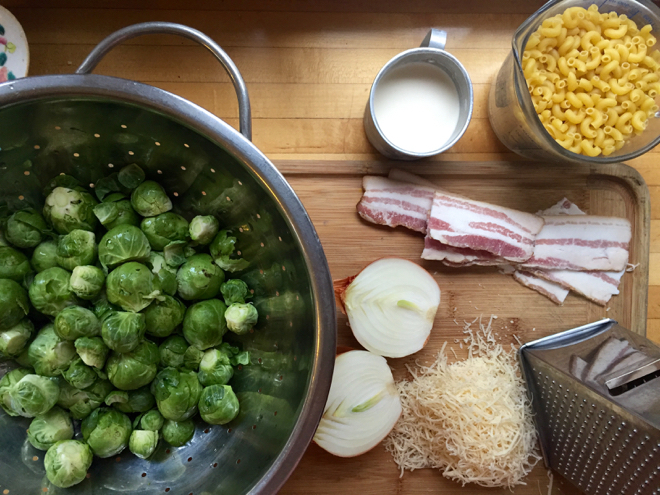 This Brussel Sprout Pasta “Risotto” with or without Bacon is as delicious as it gets. 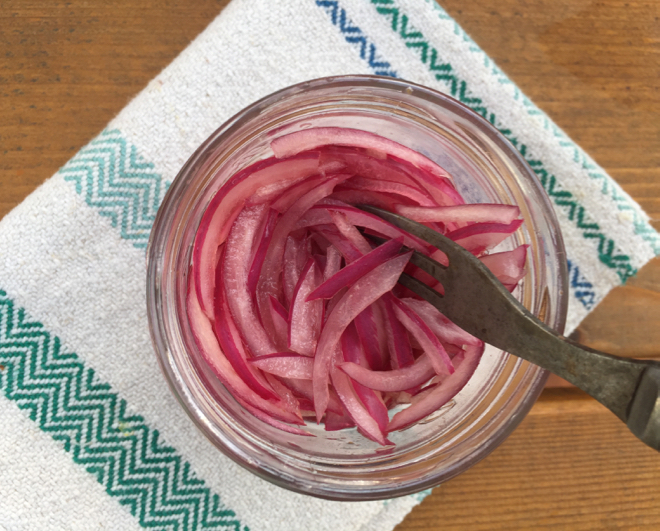 Slice some of your red onion thinly and cover with red wine vinegar to enliven sandwiches, tacos, roasted vegetables, meats, beans. . .. The kale is so good right now you could simple braise it and serve it on garlicky toasted bread with plenty of good olive oil. 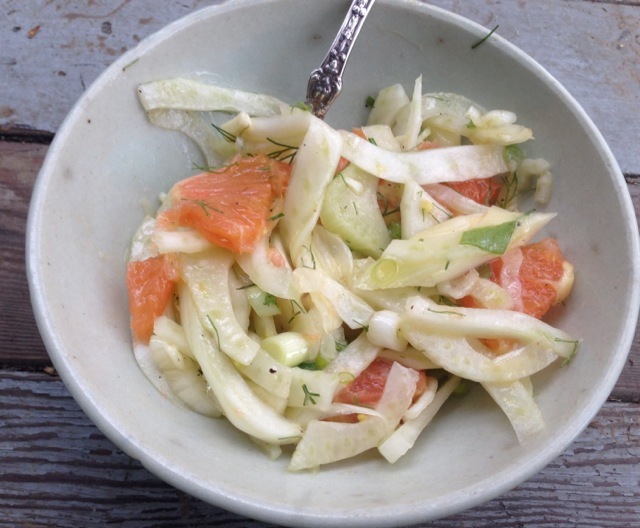 This Fennel and Orange Salad w/ Red Onions would be just lovely this week. It’s a good week for the Winter “Everything” Salad. This grated salad will be delicious with some of your Black Spanish radish and carrots. These giant kohlrabi are so incredibly good. I honestly can’t get enough. I’ve been roasting them, eating them fresh and doing this simply braise. This hearty beef stew would be lovely using many of your vegetables this week, including rutabaga, kohlrabi, carrots and even a little black radish. 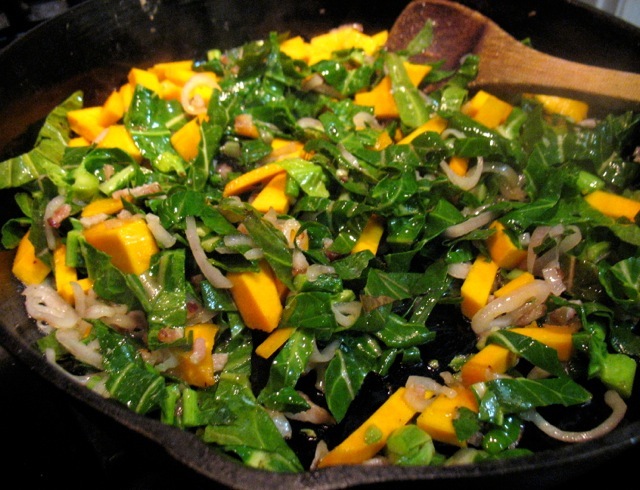 Your collard greens and some of your winter squash would be tasty in this simple one-skillet dish. Marina di Chioggia squash might be my favorite winter squash. It’s meaty and firm and fragrant and delicious in so many ways. It would be great roasted in wedges (you can peel the wedges after roasting, with this simple, spicy cilantro yogurt sauce. I just retested the Kale & Onion Panade recipe using 3 of the cipollini onions and the kale from this week’s share and it’s so delicious. 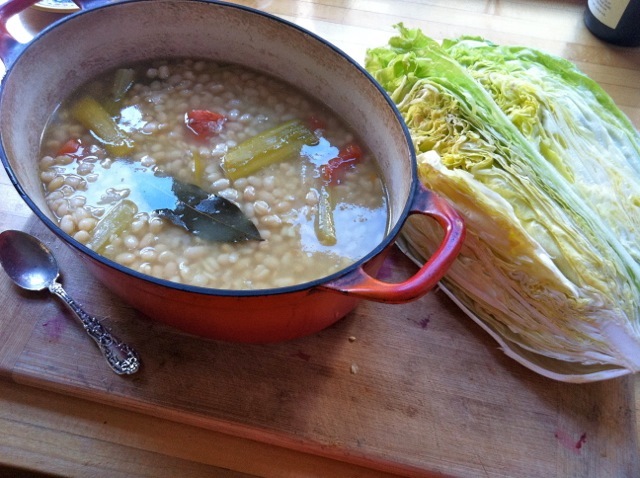 It would be a great week to make this white bean and chicory soup using your sugarloaf chicory. 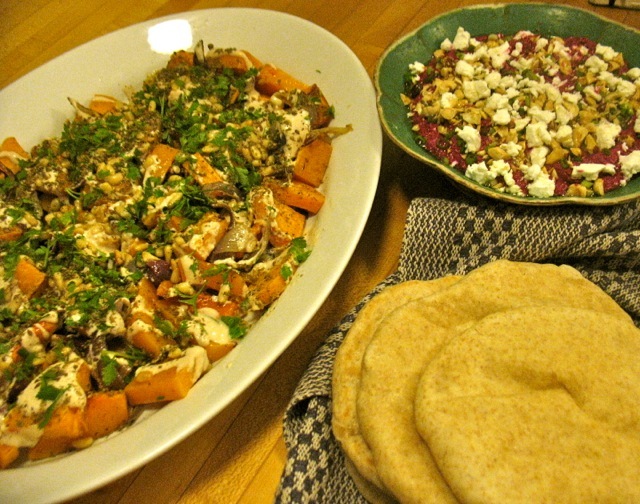 You could use some of your turnips and carrots to make this grated winter salad and/or toss in any daikon, kolrabi or watermelon radish you might have leftover. This is a favorite new salad with wheat berries and roasted celery root. 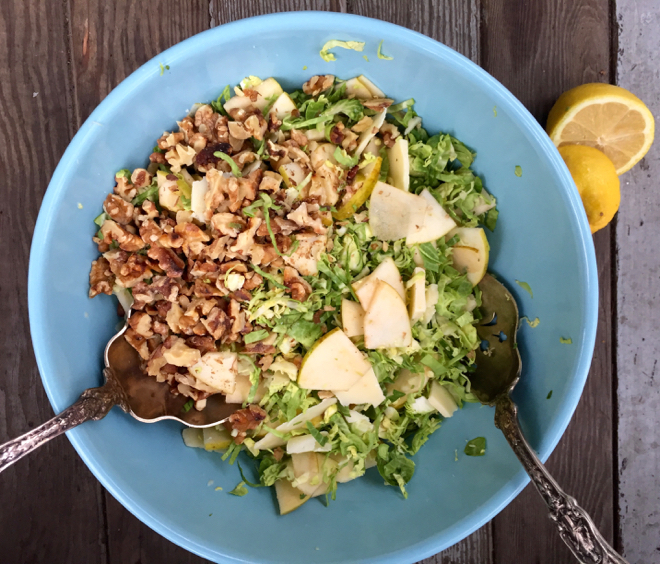 I also love this shredded, raw Brussels Sprout salad with apples and sharp cheddar. 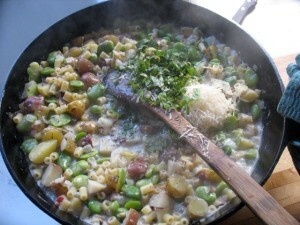 Or this Brussels Sprout Pasta “Risotto” w/ or w/out Bacon is the best kind of winter comfort food. This Roasted Delicata & Tuscan Kale Salad would be a good fit for this share. Your escarole and butternut squash combine in this lovely salad. 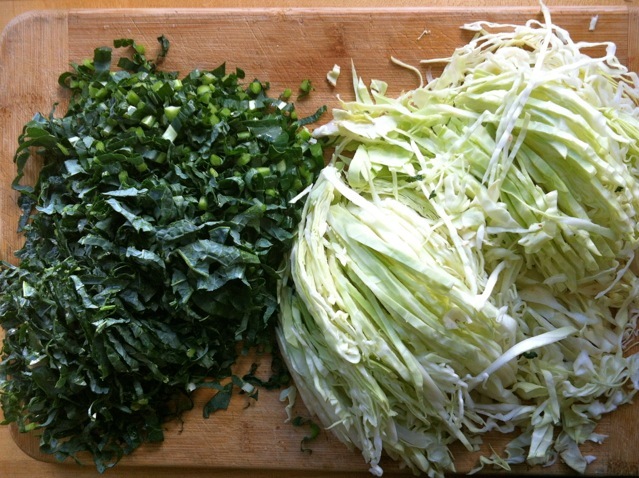 Use parsley or cilantro instead of dill, if you’d like and sub a little kohlrabi for the celery. 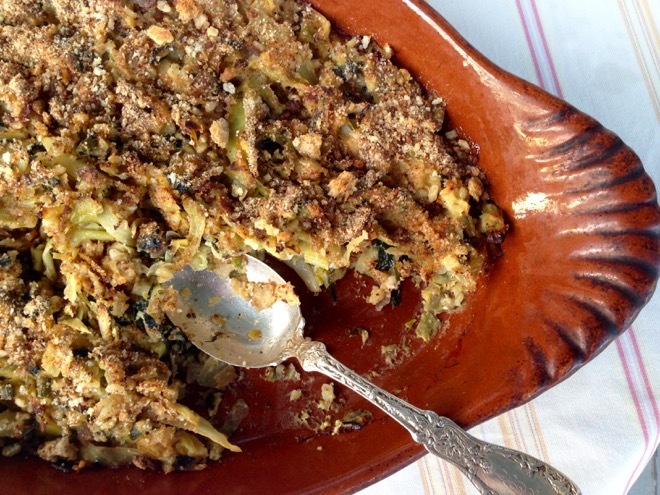 This baked pasta with celeriac and leeks would be great this week. Curried Leeks and Greens would also be good. 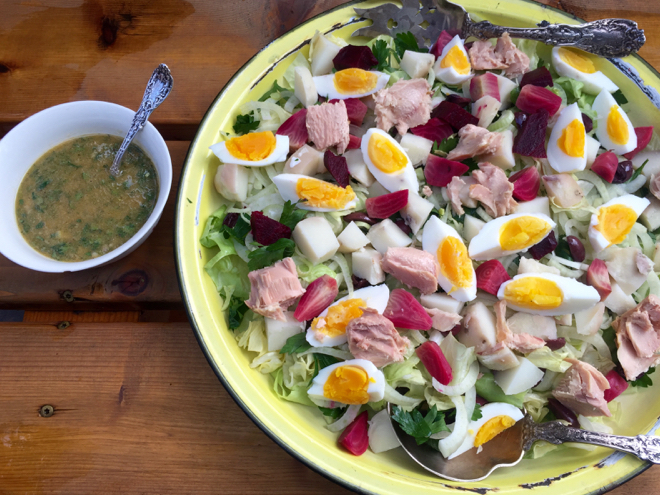 Use your celeriac in this hearty winter salad and you could swap in some watermelon radish and/or kohlrabi instead of the celery, for crunch. 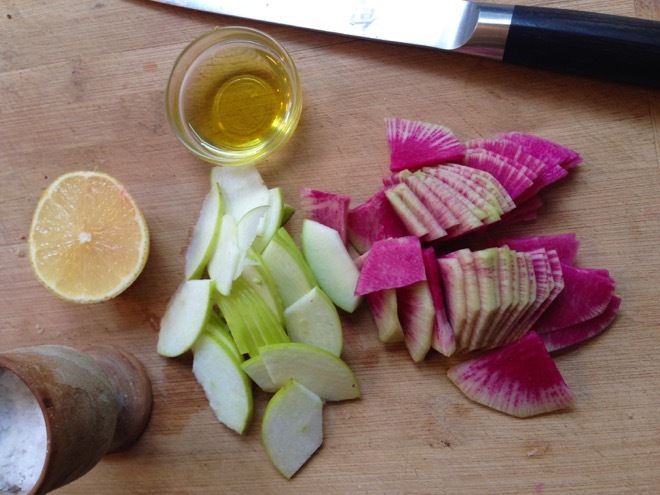 This beautiful salad is nothing but watermelon radish, apple, lemon juice olive oil and salt. Use your cipollini and any other onions that you might have accumulated into these caramelized onions and enjoy them with/on most anything. I love these quick, mustard-braised Brussels sprouts. This savory bread pudding is quick and depends on fresh herbs–your parsley would be wonderful here. 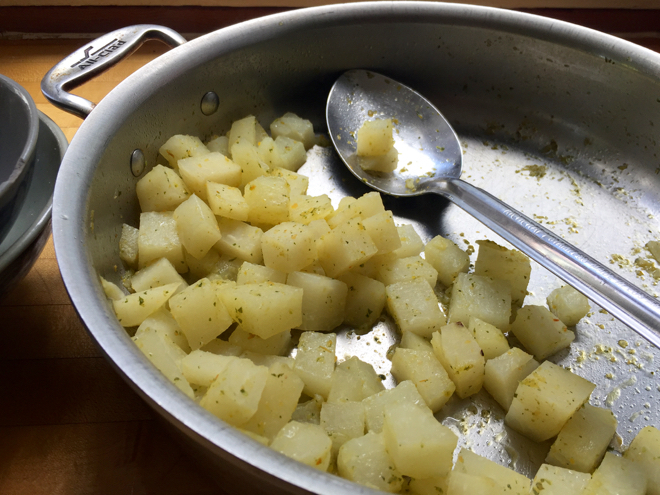 This potato salad would use some of your celery (and celery leaves), potatoes and you could add a little fennel as well. 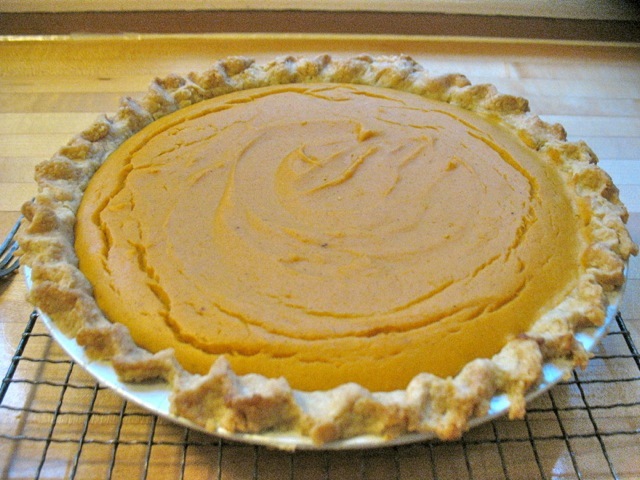 It’s time for pumpkin pie! Welcome to the winter share! 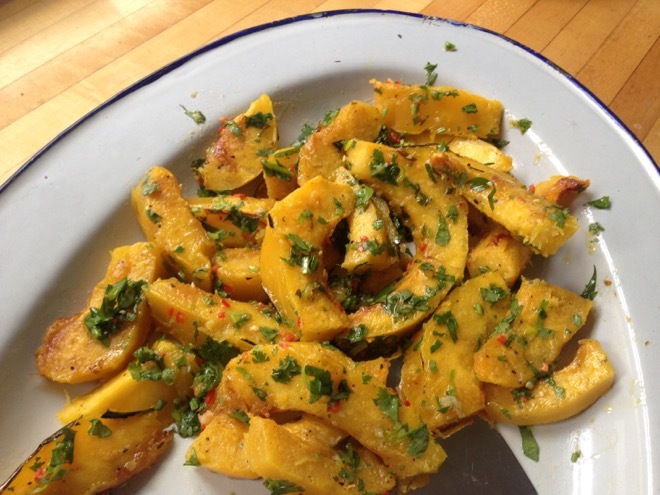 The sweet Gill’s Golden Pippin Squash might be best just halved and roasted. You might saute some of your sweet and spicy peppers with some sliced onion and a little garlic and enjoy that mix in or on or with your roasted squash. 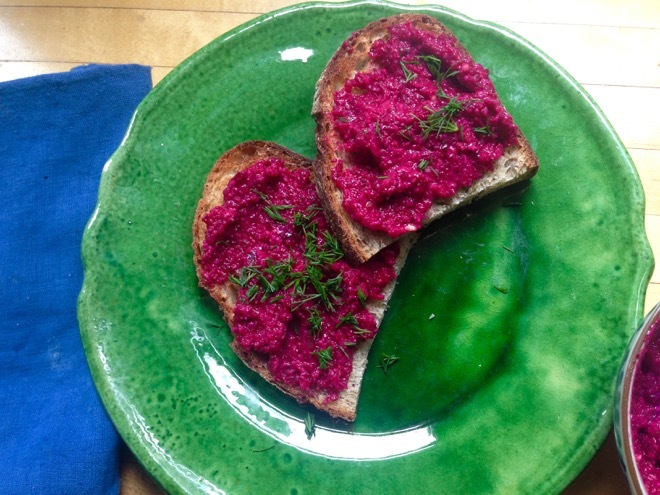 Make this lovely Beet Tztaziki this week with your beets and some of your dill. 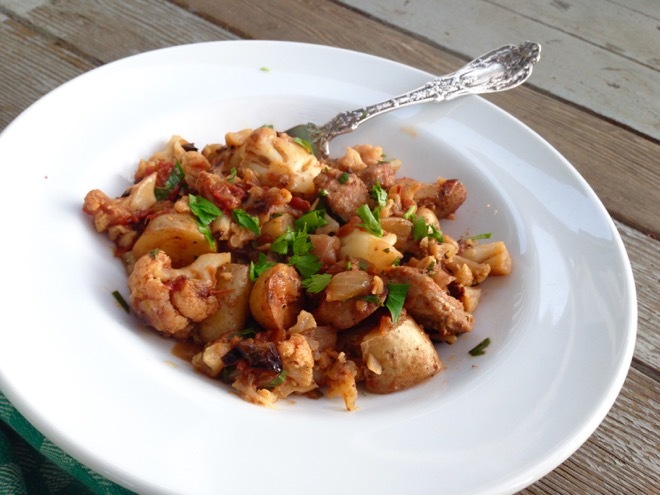 This Cauliflower, Potato & Sausage Skillet is a simple weeknight dinner. 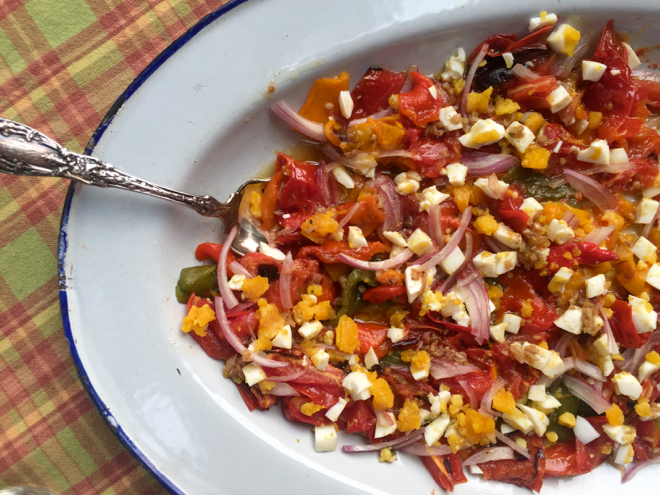 We’ve got to be getting close to the last of the peppers so make a variation of this spectacular Spanish salad using your sweet peppers and your anaheim/poblanos for a last gasp of summer. If you roasted and froze any tomatoes, this would be great place to use a few. 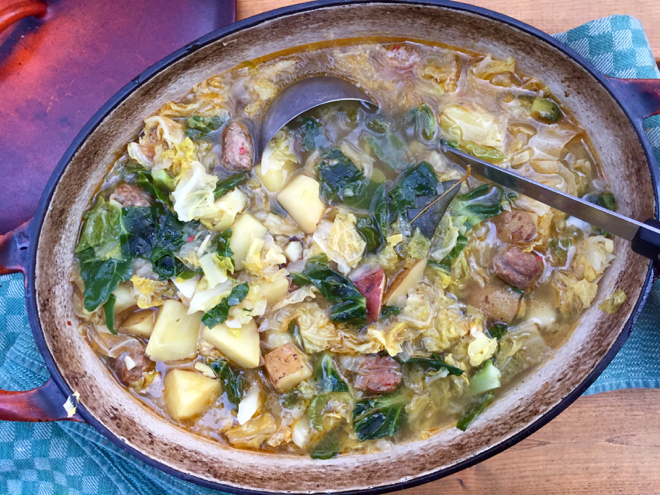 One of my favorite things to make with Savoy cabbage is the Portuguese Caldo Verdo, a simple soup of cabbage, potatoes and a bit of chorizo. It’s so good and even better the next day. 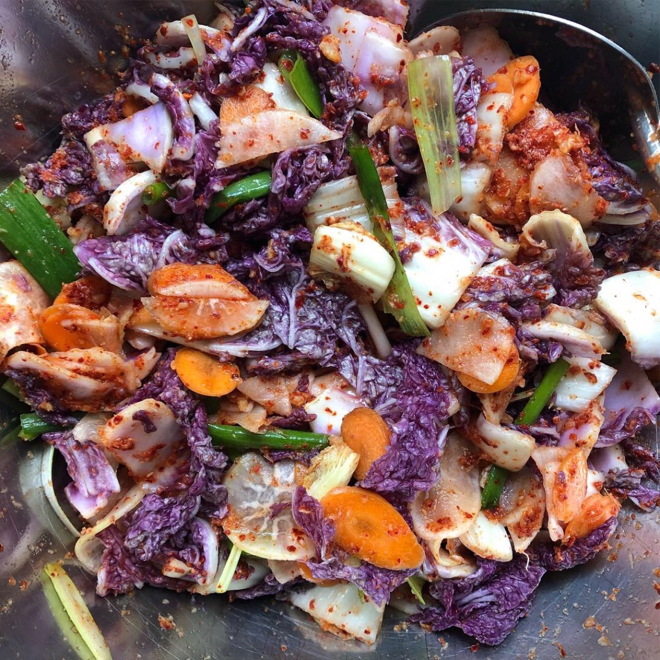 You might make this Kimchi “Salad” with your Savoy Cabbage and some of your daikon, instead or in addition to the carrot, called for. Leave the daikon raw though. 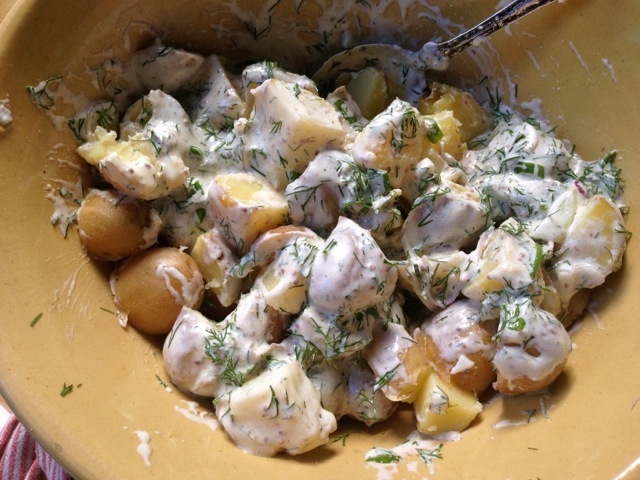 This Potato Salad with Creamy Dill and Mustard Dressing uses your potatoes, candy onions and dill this week. 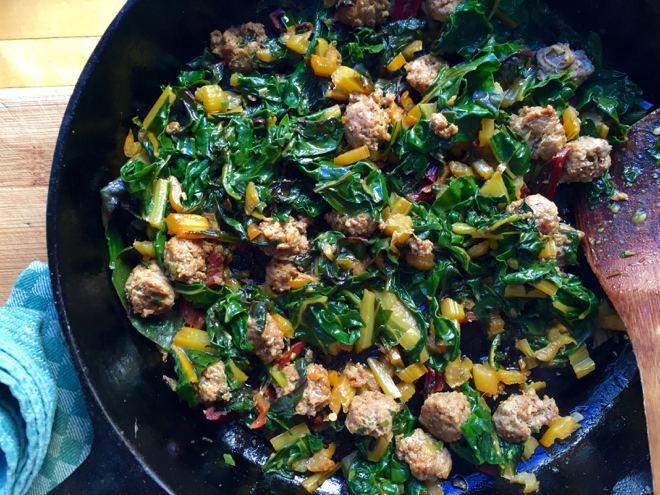 Make this lovely skillet of greens, sausage (or eggs), hot peppers with your delicious, sweet collard greens this week. 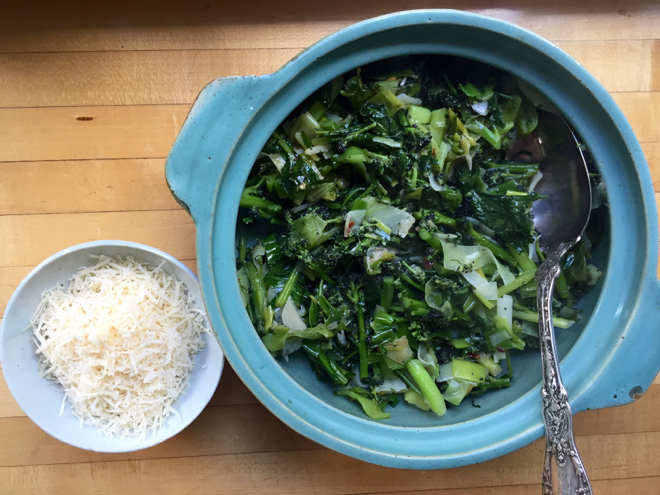 Or make this garlicky braised cabbage and collard green dish. 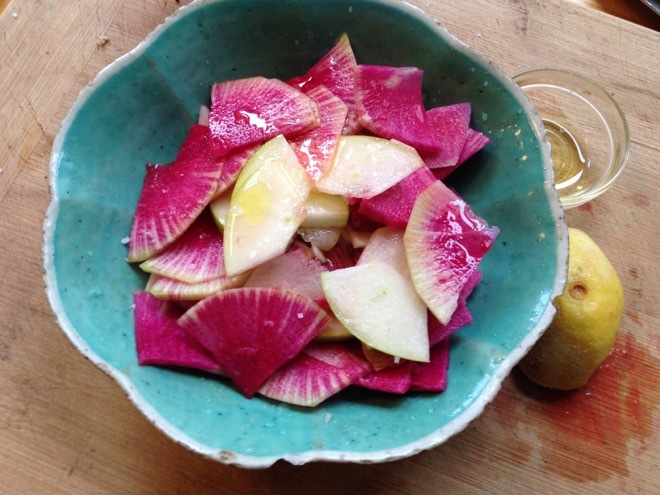 This simple Watermelon Radish & Apple Salad is beautiful and crunchy and sweet/tart. 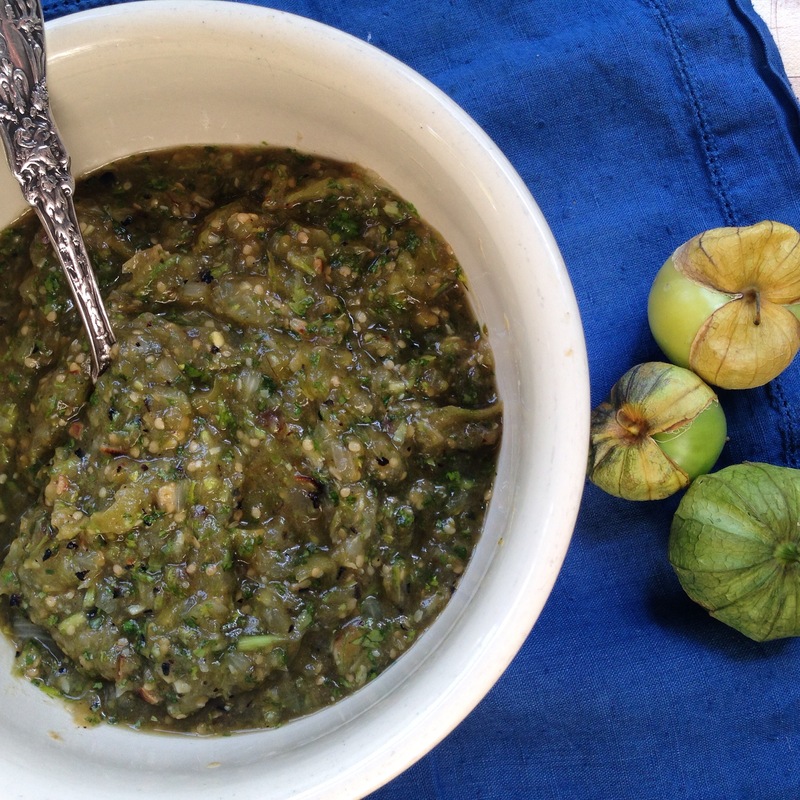 You could make this delicious roasted Tomatillo Salsa this week. 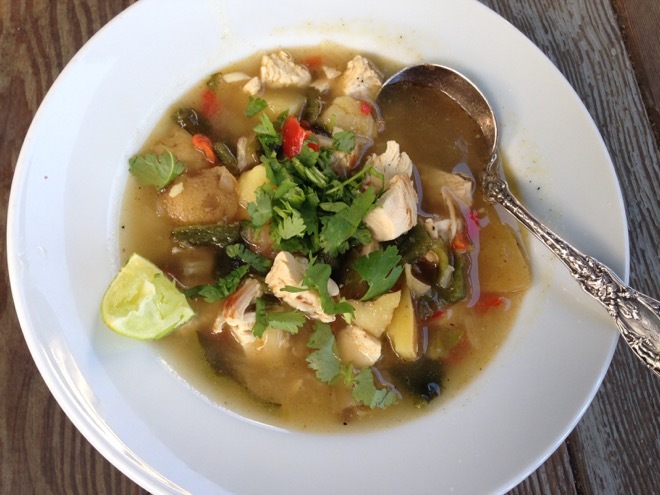 This Chicken & Potato Soup with roasted Anaheim or Poblano Peppers would be perfect on one of these beautiful fall evenings. 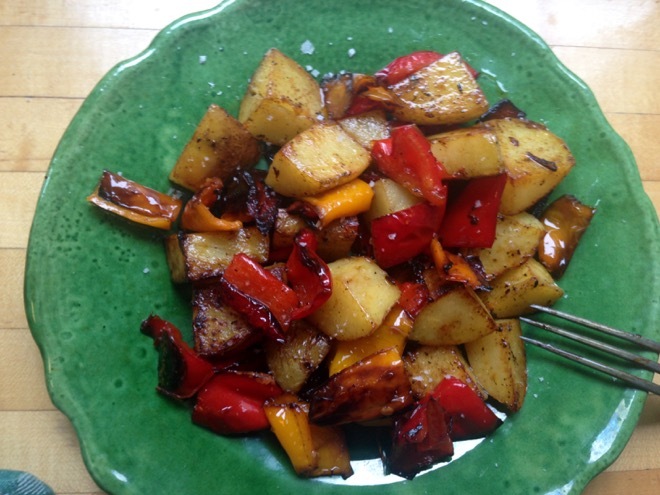 Make this Calabrian Pepper and Potato dish using your Jimmy Nardellos and toss in a minced hot pepper too, if you’d like. I would blanch the tender brussel sprout tops for a minute, then drain and saute with sliced garlic and hot pepper in a bit of olive oil. 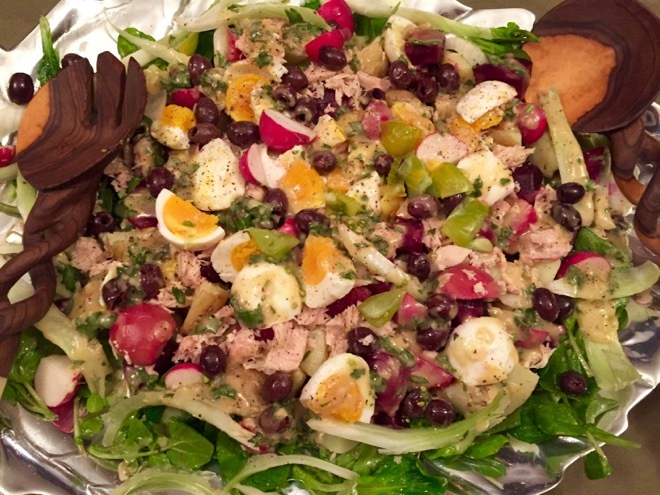 It’s a good week for Nicoise Salad. And the purple potatoes will make it even more beautiful. 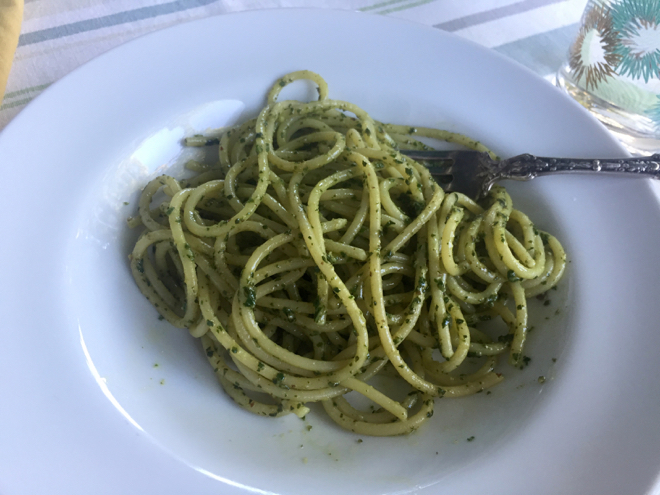 I’ve been making pesto for 25 years and I just now read about blanching the basil leaves (for just 5 seconds or so and then drying them) and then proceeding with a typical pesto recipe, to avoid the almost instantaneous browning that occurs as a result of oxidation. I cannot wait to try it. 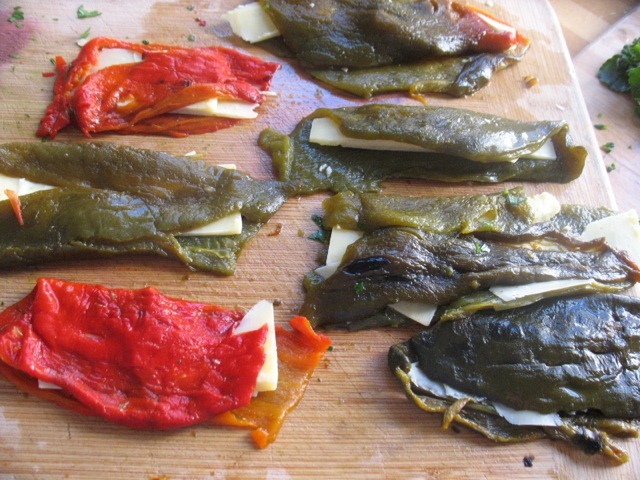 Simply fry your padron peppers in olive oil over medium-high heat until beginning to blister and soften. Sprinkle with sea salt and eat right away! Make this Roasted Pepper Sauce, similar to Romesco, with some of your Anaheim and poblano chilies and your hot peppers. 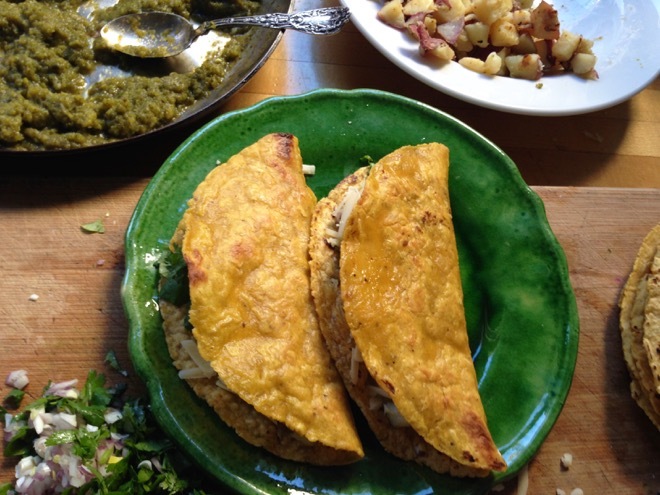 Or make either of these versions of Potato and Poblano/Anaheim Tacos. 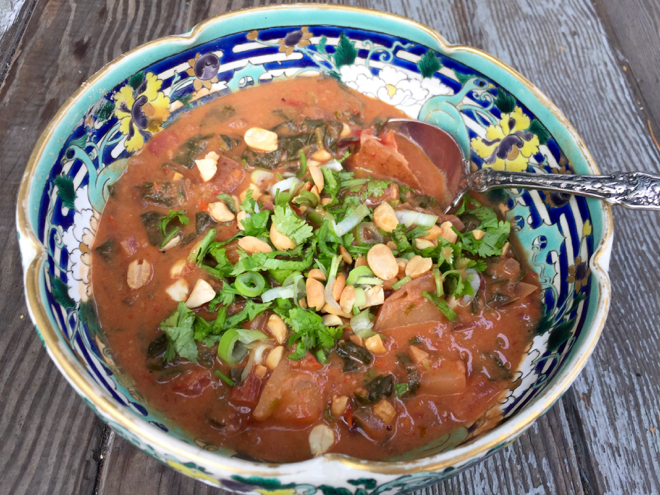 This stew of tomatoes, leafy greens and peanuts might be perfect for these cooler knights, using your collard greens. 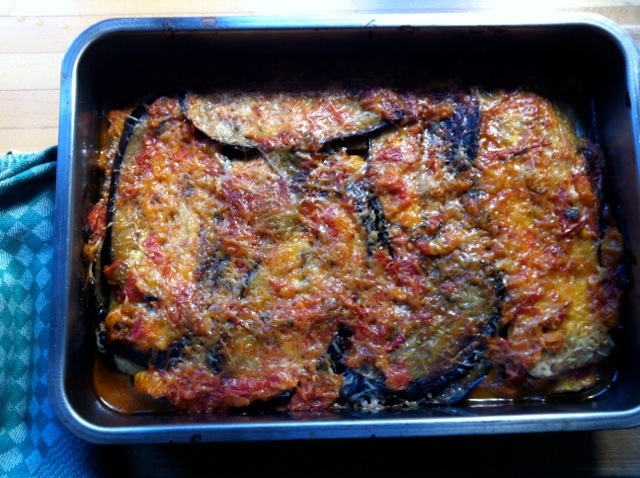 I just developed this eggplant and tomato dish, seasoned with cumin and caraway and served with a garlicky yogurt. It’s delicious! And it uses some of your parsley this week. This dish of long-cooked green/wax beans and tomatoes is more than the sum of its parts. It’s luscious and rich but made with just a few ingredients. Feel free to add a little hot pepper to this if you’d like. 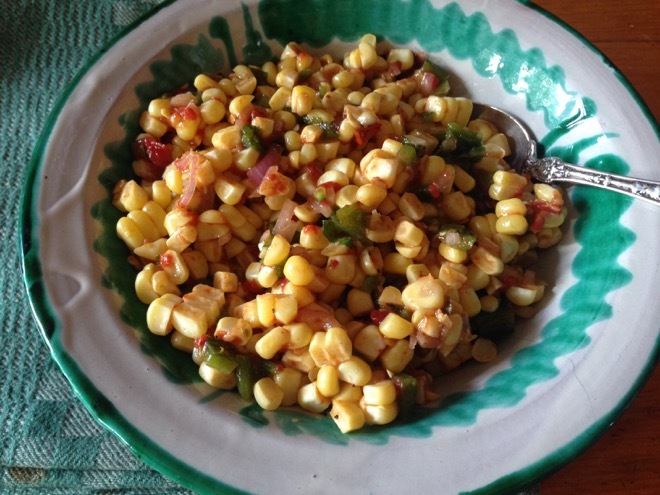 This fresh Corn Salsa with roasted chilies is delicious with most anything. Use a combination of your hot and anaheim or poblano peppers to make this green version of Harissa. You could also substitute parsley for the cilantro. Serve with any fish or meat or vegetables, grains, eggs, etc. Might be time for Corn Chowder Salad. 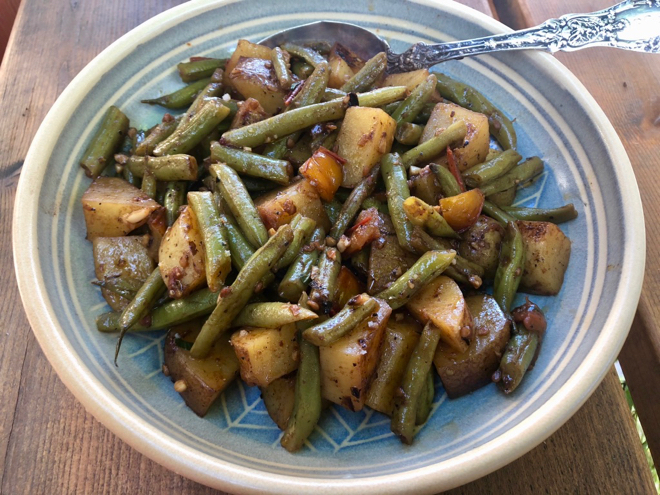 Green beans, new potatoes, garlic, basil and Parmesan come together for simple and very flavorful dish. 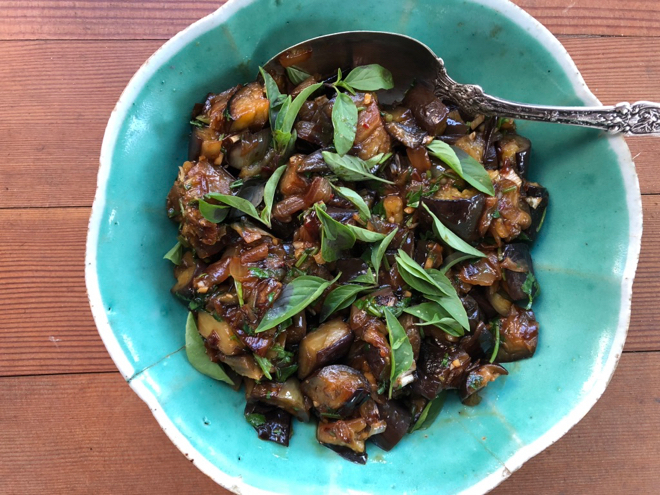 Your eggplant and a bit of jalapeno would be wonderful in this Sweet, Hot & Sour Eggplant, this week. 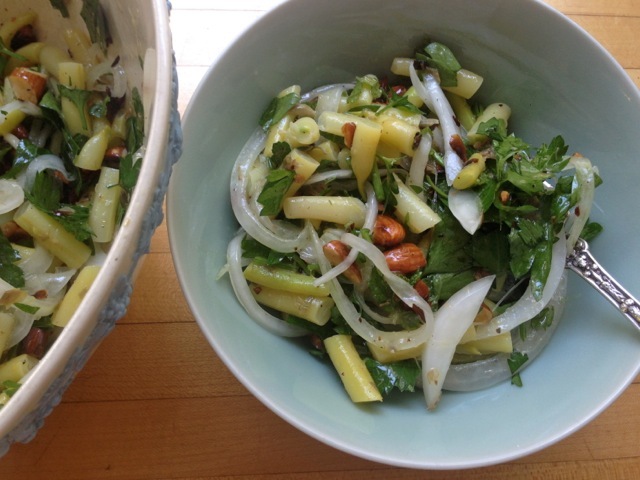 I love this salad of green beans, sweet onions, parsley and toasted almonds so much! This Summer Squash “Butter” w/ Herbs takes a little while to cook but is so delicious and versatile and uses up SO much squash. Another hot week it is so, I’ve tried to direct you to dishes that involve minimal stove time. 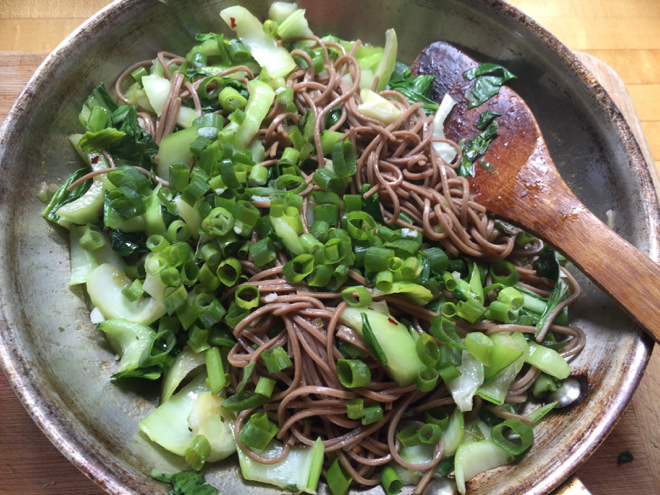 I don’t yet have any recipes on the site dedicated to Summerfest Komatsuna, a mild, delicious Asian green but I cooked with it a lot earlier this spring and loved it. 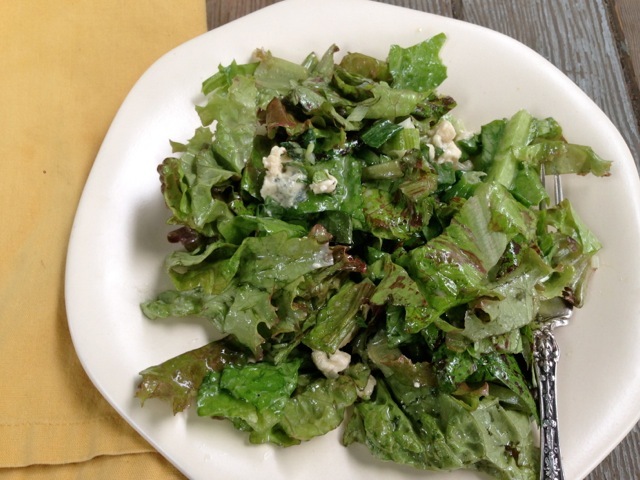 It’s mild and very quick cooking and can be used like any tender leafy green. It’s delicious just quickly sauteed and dressed with a little sesame or peanut oil. 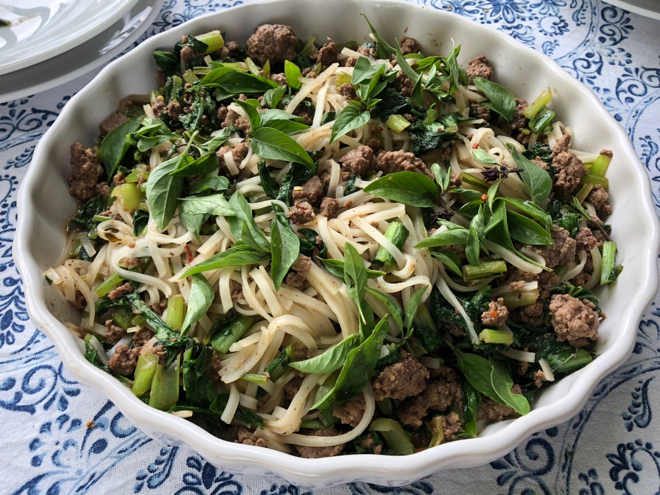 You could make this stir fry of sorts with coriander and fish sauce, with the Summerfest instead of the bok choy and chard in the original recipe. You could grill the eggplant here, instead of broiling it, to keep all of your cooking outside. 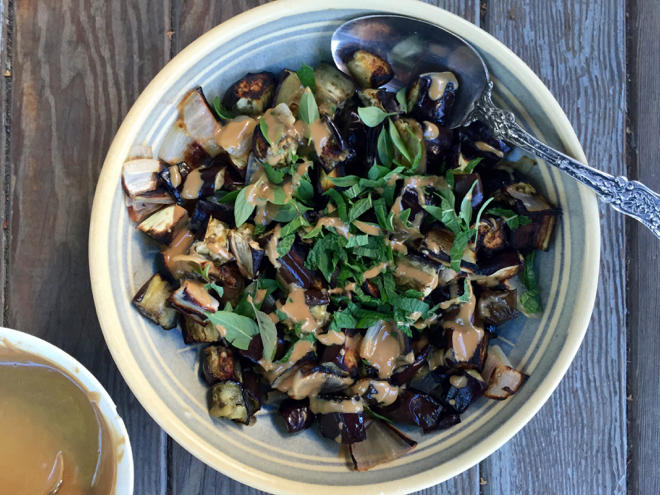 It’s a quick, savory, side dish with a miso tahini dressing. 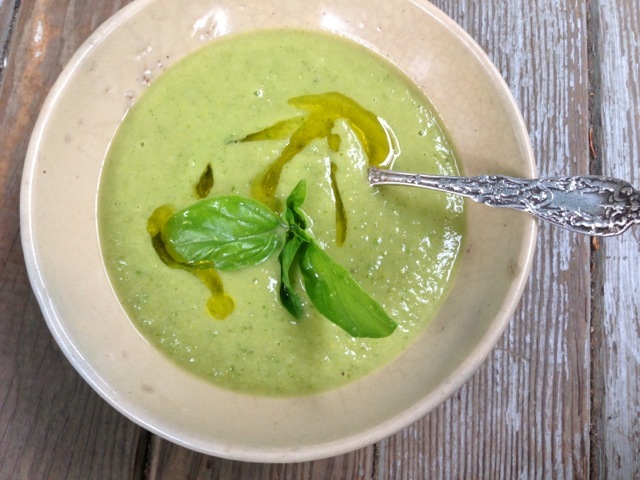 This pureed zucchini and basil soup fits the bill this week, as it’s served either cold or at room temperature. 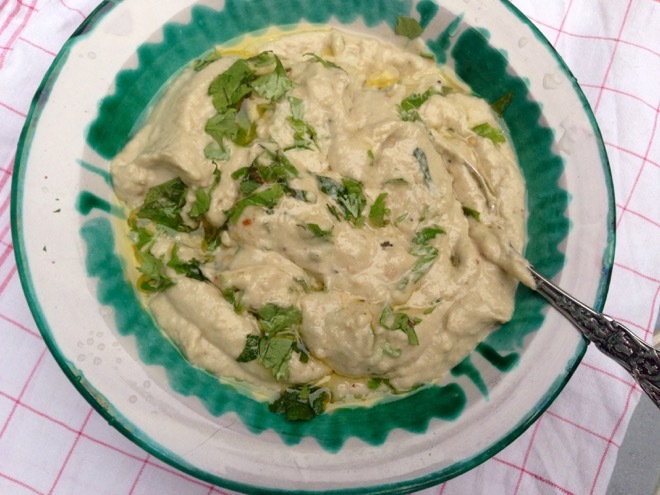 Raita, the cool Indian cucumber and yogurt sauce/dip is a lovely cooling addition to most anything this week, from grains, vegetables to meats. I often make it and enjoy it with good bread and sliced tomatoes. You can also employ some of your dried cayenne peppers here if you have some left. 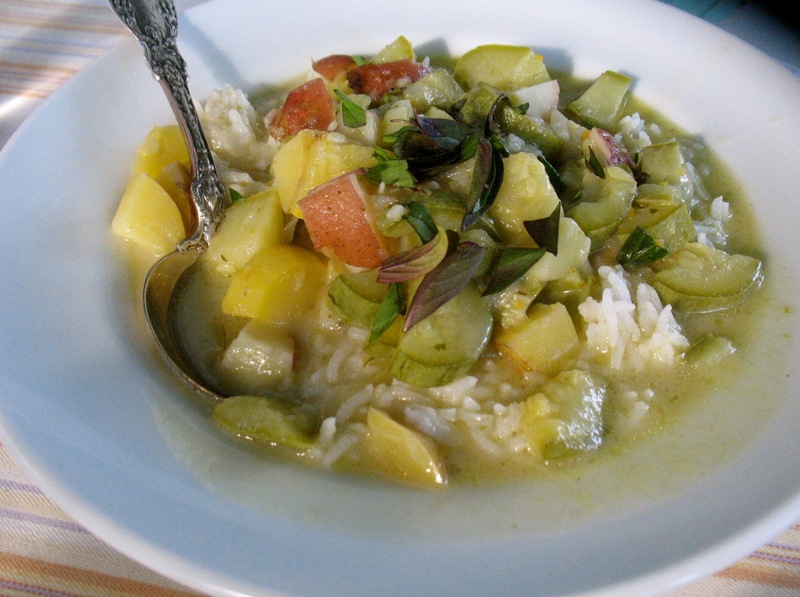 Make this lovely, simple Green Curry w/ Summer Squash and Potato this week. This might seem a little odd, but I might use those lovely Jacob’s cattle beans for a salad and I think this salad (originally written using frikeh–the parched green wheat) would be delicious and would use some of this week’s cucumbers. You could also add some of your snap peas. Or just make the salad as written (sans peppers and such) and use the beans for something else:)! 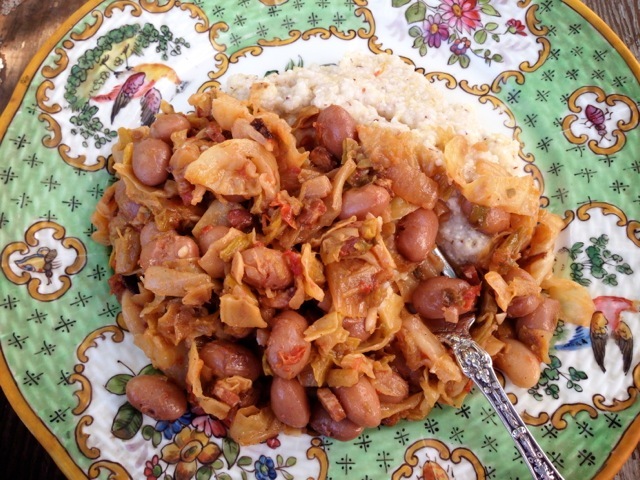 You could also make this stewed cabbage and bean dish, subbing fresh onions for the leeks. 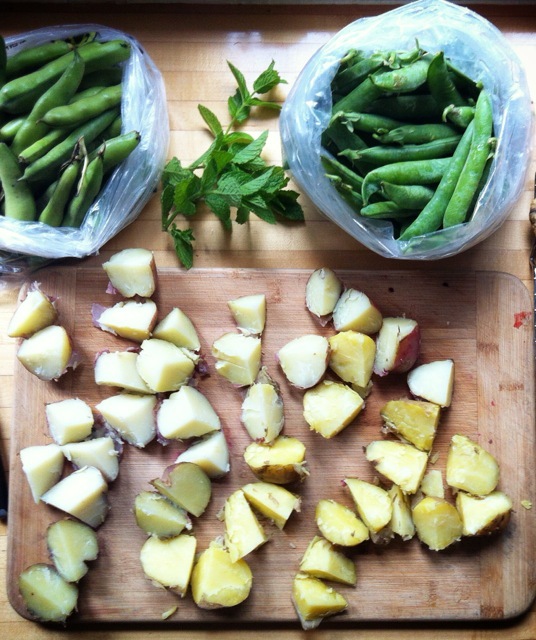 This New Potato, Fava & Pea Salad with Mint might be good this week. 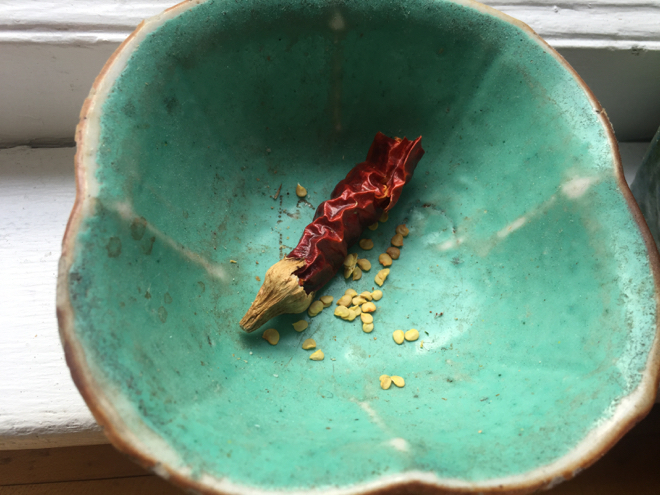 A quick note about the wonderful dried cayenne peppers: I keep one in a bowl on my counter and use it daily–I mince up a little to add to a cole slaw dressing; I add a pinch or two of seeds to a tomato sauce or a bit more to a soup; I add it to stir fries and fried rice and eggs. . . Depending on how much I use it just adds a little warmth or a lot of spice. It is the perfect seasoning to have on hand though. It’s that time of year when I need a little “lettuce management” reminder with tips for storage, dressings and fun variation. 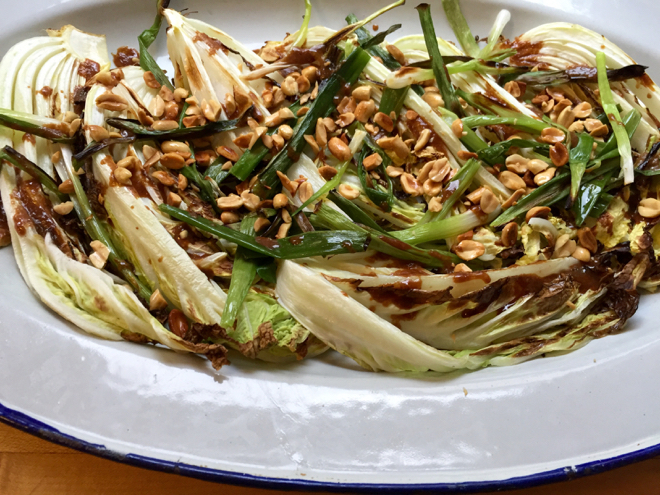 You might use your Napa cabbage to make this quick, flavorful side dish with toasted almonds and cider vinegar. It would be a good week for this bright kohlrabi and fennel salad with dill and golden raisins. 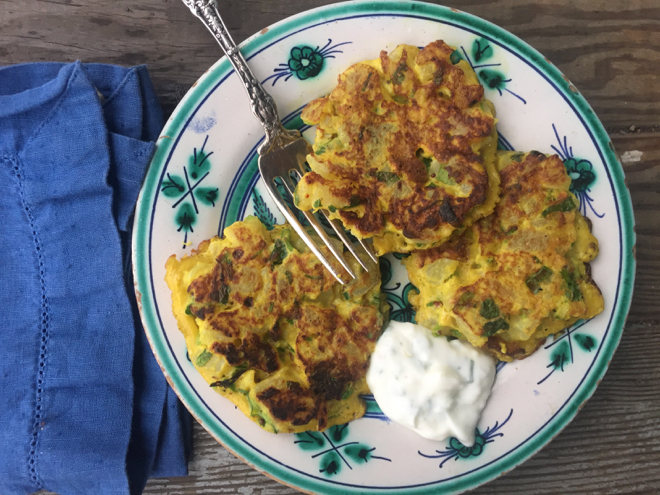 These Curried Kohlrabi Fritters would be perfect this week, using some of your cilantro as well. Make these Miso-braised turnips with your salad turnips this week. They are my very favorite way to prepare these at the moment. 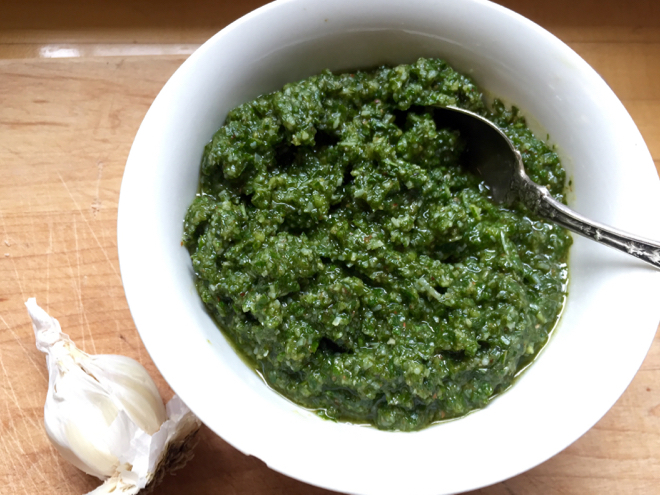 You might use some of your cilantro for the incredible flavorful sauce of toasted pumpkin seeds, cilantro etc, called Pipian Verde that you can serve with chicken or vegetables. 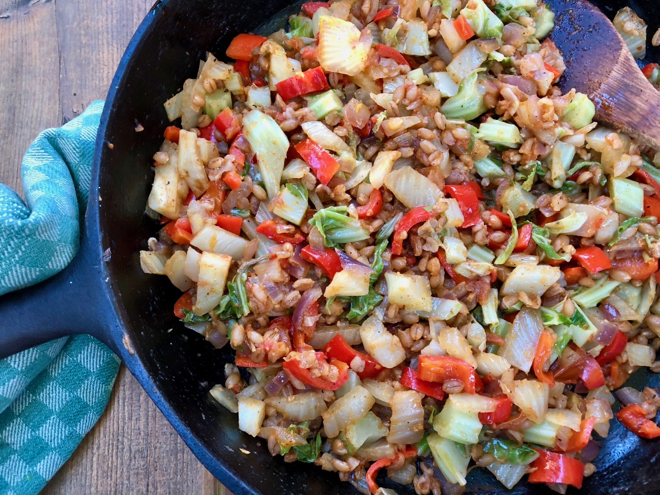 This Joi Choi Stir Fry would make a nice light dinner this week. You could also make this Bok Choi Yakisoba. It’s a garlicky week! 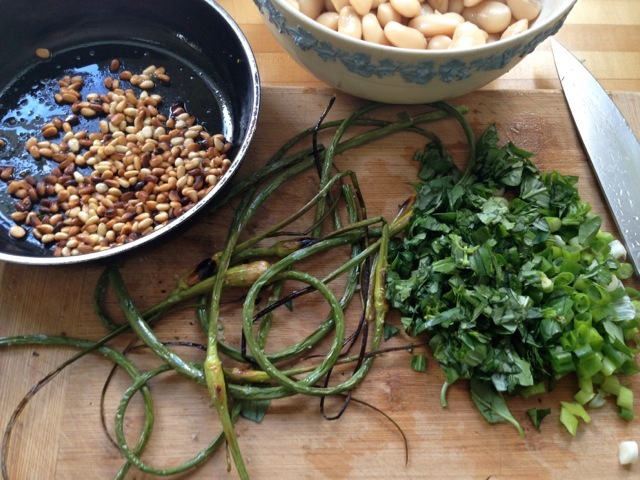 Use those scapes in this hearty dish of broiled/grilled scapes with white beans and pine nuts–use any kind of bean and toasted nut you have on hand and toss in a little finely, chopped cayenne pepper. 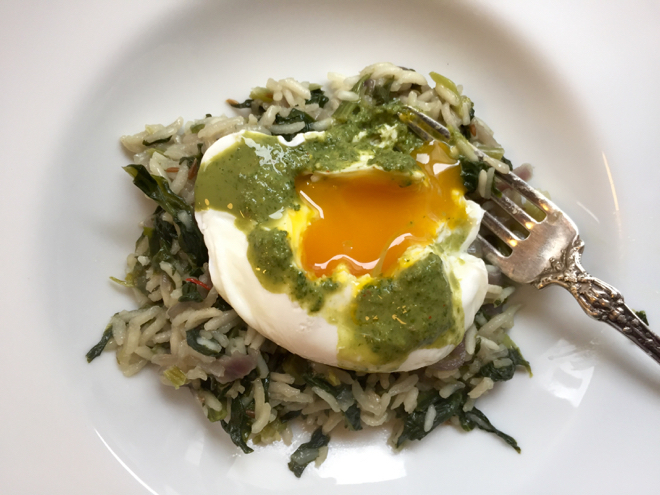 Turn your spinach into a main dish with this Cumin-scented Rice w/ Spinach & Egg. Make aioli with some of your new garlic and dip radishes in it; spread it on bread and top it with your collard micro greens and a few slices of hardboiled egg; make deviled eggs with it; serve it with fish. 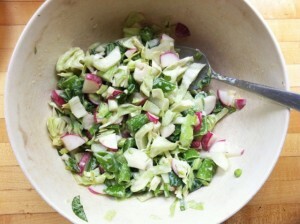 . .
Use your oak leaf lettuce for this Simple Green Salad and toss in some thinly sliced radishes. Make these mizuna pancakes. 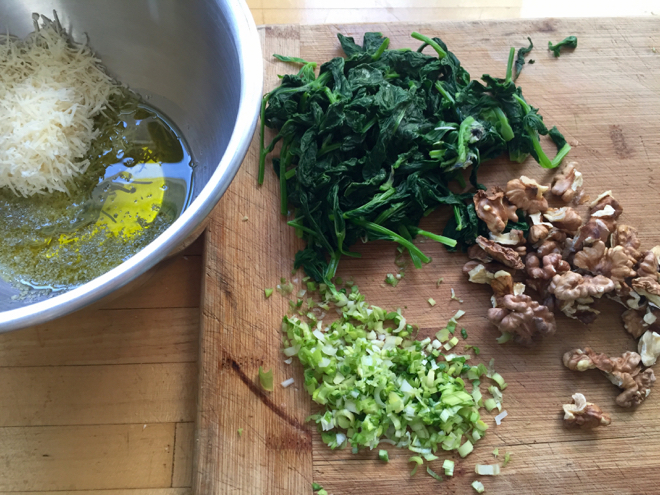 You can add finely minced garlic scape or green garlic instead of the greens onions (but not quite in the same quantity!). 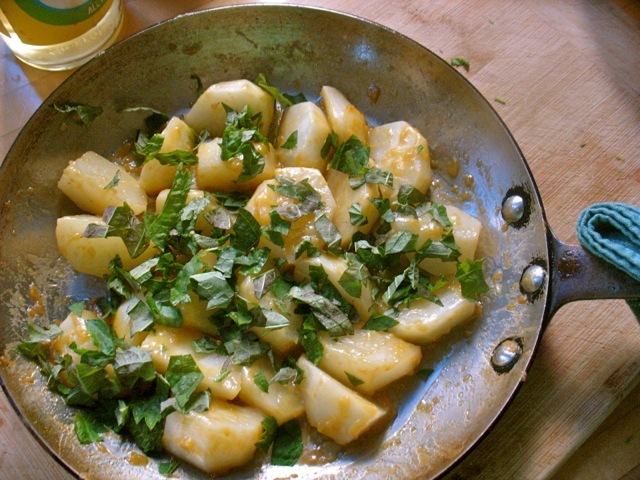 You have all the ingredients for this fragrant Indian dish of potatoes, spinach and green garlic. 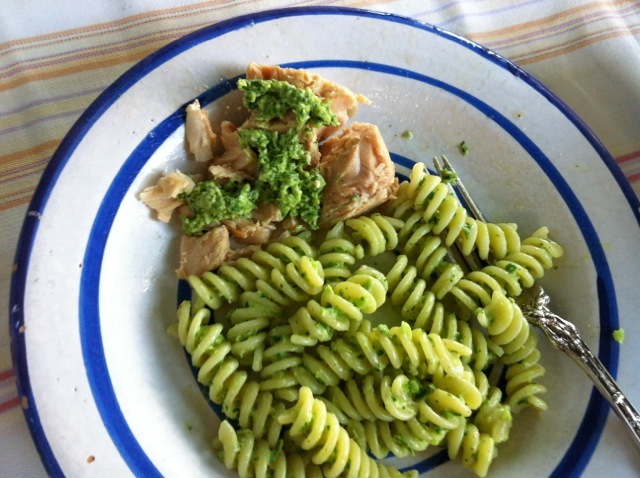 A few ideas for how to use garlic scape pesto. Welcome to the 47th Ave Farm summer share! 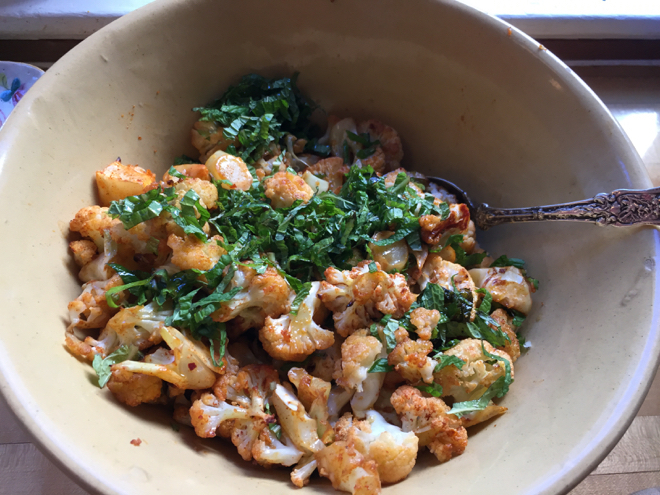 It promises to be hot, yes hot, this weekend so make this Spanish-style Cauliflower Salad using some of your parsley and cayenne peppers as well as the gorgeous cauliflower. 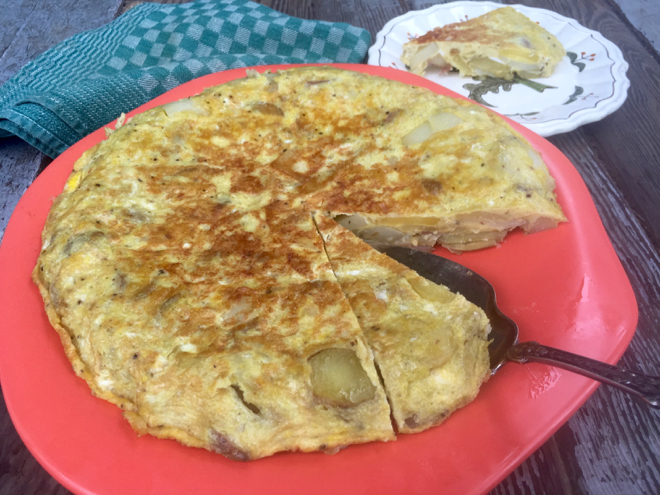 You could add a whole bunch of finely chopped green garlic to this classic Spanish Tortilla for an extra delicious version of this dish. 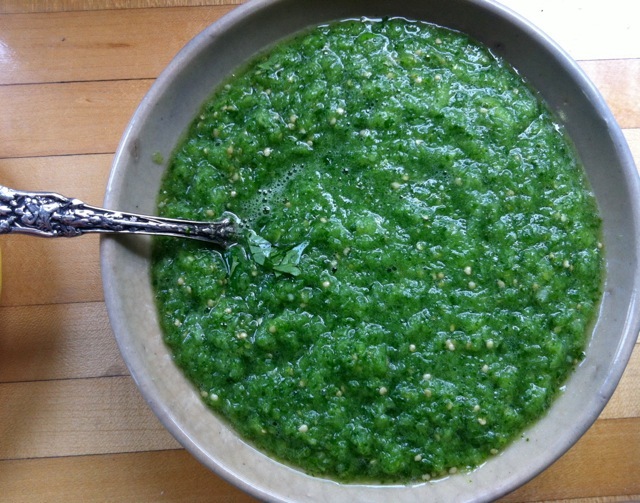 Use your parsley to make a batch of Salsa Verde and spice it up with a little cayenne if you’d like. Then use it to dress boiled potatoes, any kind of egg dish, grains, meats or fish. Stir in a bit of greek yogurt for a creamy version if you’d like. 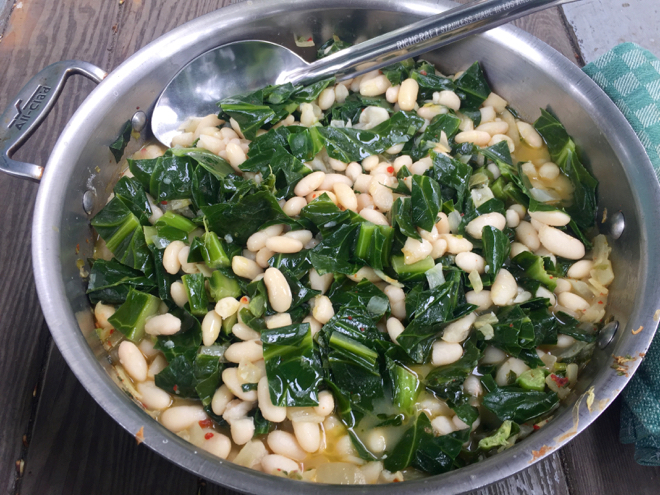 I never tire of combining beans and greens and hot pepper so this week cook your beans and collard greens with a bit of cayenne. 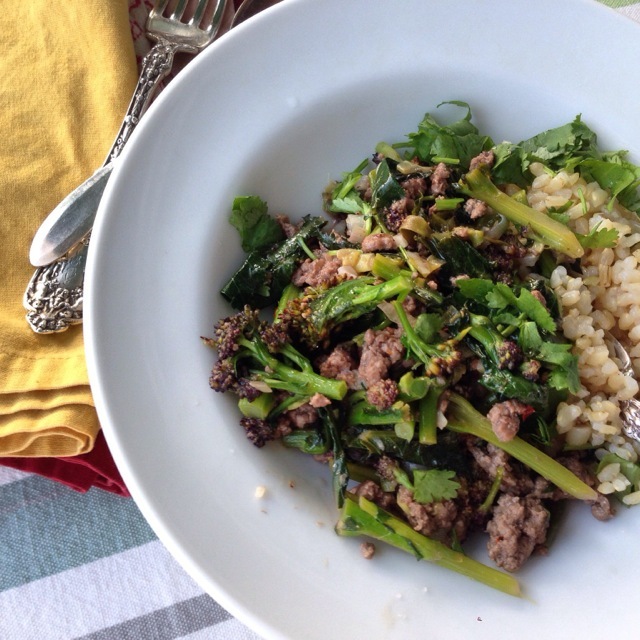 You could make this (ground) Lamb/Beef stir fry with the last of the Purple Sprouting Broccoli. 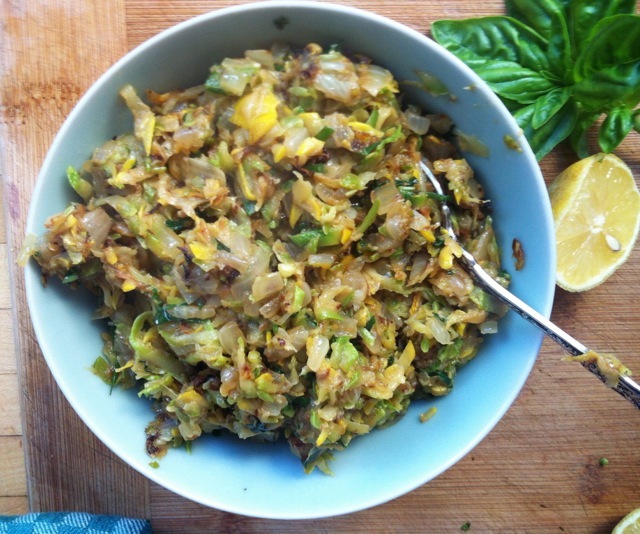 This quick Curried Leeks & Cabbage could easily be made with Collard or Cabbage Raab. 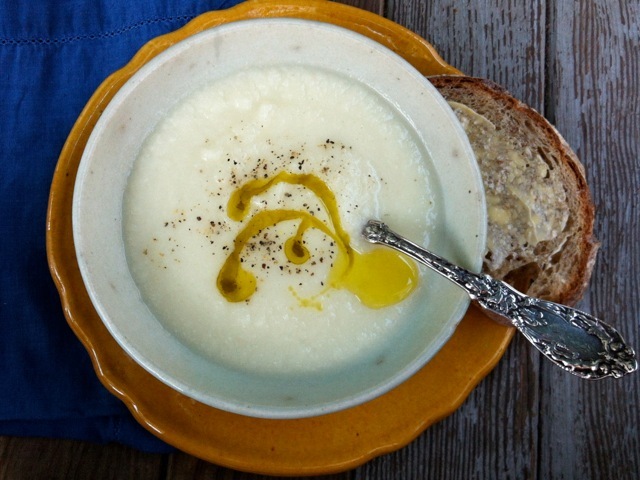 It’s still rainy and cold so make this simple and delicious cauliflower soup. Make this slow-roasted purple sprouting broccoli with lemon and Parmesan and by all means add some leeks to the mix. It will be delicious. This one-dish meal of cauliflower, rice, coconut milk and spices should hit the spot on these still-cool evenings. Cook your raab with beans and possibly bacon for a simple, satisfying dish. You could braise your kale with miso. . . This is a bit out of character but if you like French fries or have family or friends who do, you will be loved beyond measure if you make these easy, easy fries exactly as directed (from one of my favorite blogs Smitten Kitchen). The recipe is simply genius and I actually measured and 2 lbs of potatoes soaked up 3 tablespoons of oil. It does not seem possible but it is. And you can reuse the oil. Serve with lots of veggies on the side! If you french fries aren’t your thing you could make a classic Spanish Tortilla–basically a potato frittata. 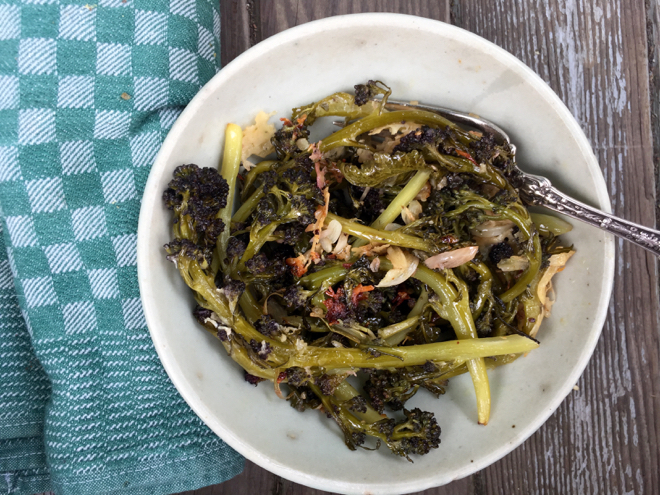 This simple dish of Purple Sprouting Broccoli with Leeks, Garlic and Chili Flakes is so very good. 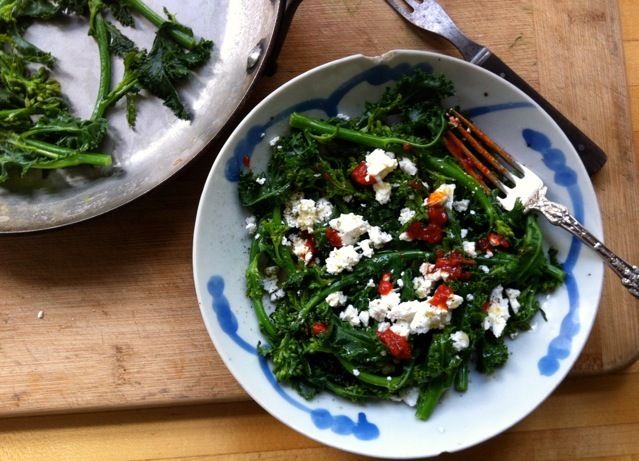 Your Kale Raab would be delicious with harissa and feta. 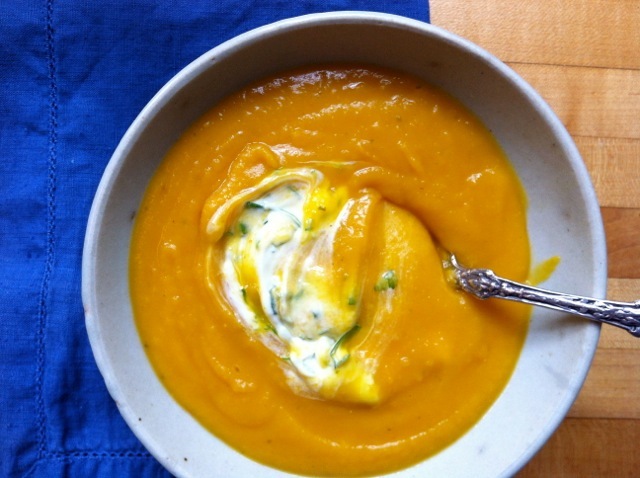 While it’s still cool and gloomy make this sunny soup of Winter Squash, Barley and Sage. This winter squash soup with coconut milk and curry paste would be delicious with this week’s squash and this week’s gloomy weather. 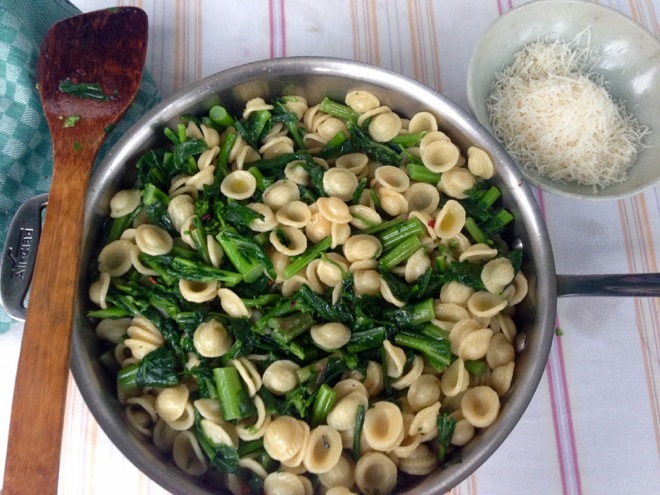 Orecchiette with kale raab would make a meal of those springy green shoots. These “stovetop” Scalloped Potatoes and Leeks might be nice. 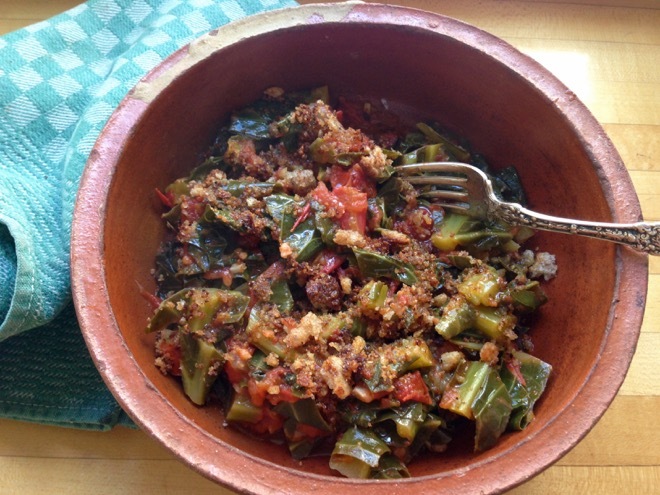 . .
Oh I love this simple dish of Collard Greens, (canned) Tomatoes and Bread Crumbs. 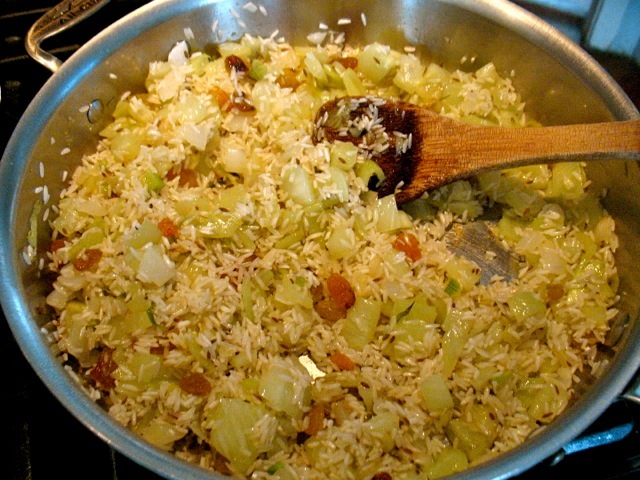 Your savoy cabbage will be delicious in this simple but oh-so-good Italian-style dish of stewed cabbage, rice and (canned or roasted and frozen) tomatoes. It’s a good week to make this Wintry “Everything” Salad with your escarole, maybe some roasted squash or potatoes . .. some cooked, dry beans, if you still have some. 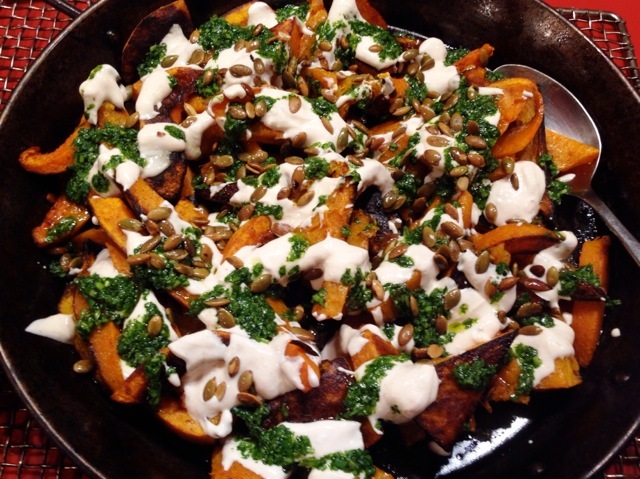 . .
Make this Roasted Winter Squash with Spicy Yogurt Sauce and Cilantro. 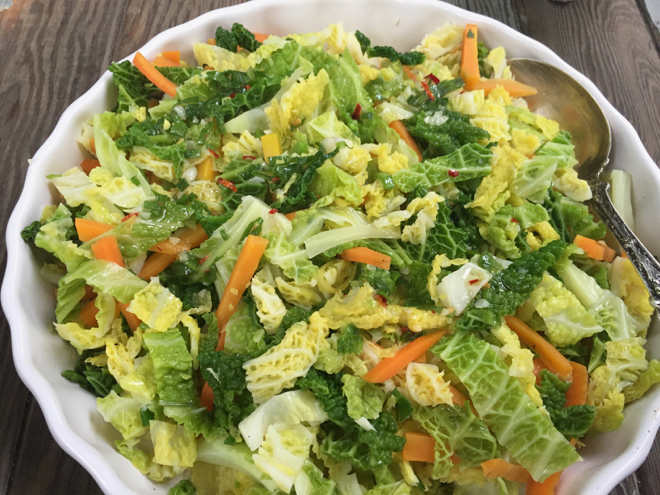 This “Kimchi” Salad might be fun to make with some of your savoy cabbage and carrots this week. It’s definitely a good week for Stewed Cabbage, Leeks & Beans! 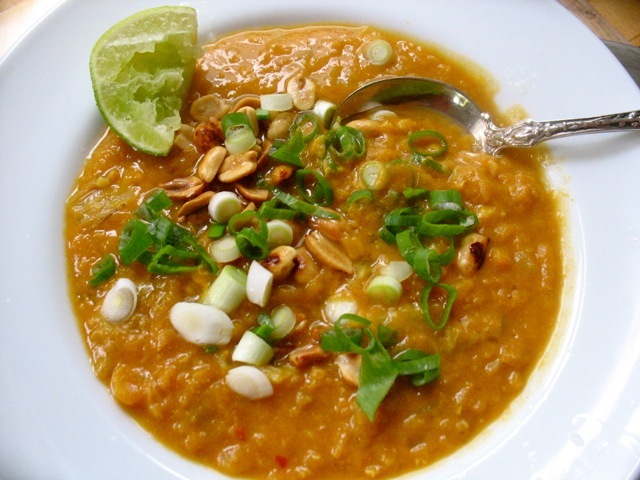 Your Marina di Chioggia squash would be delicious in this savory stew with peanuts and red lentils. 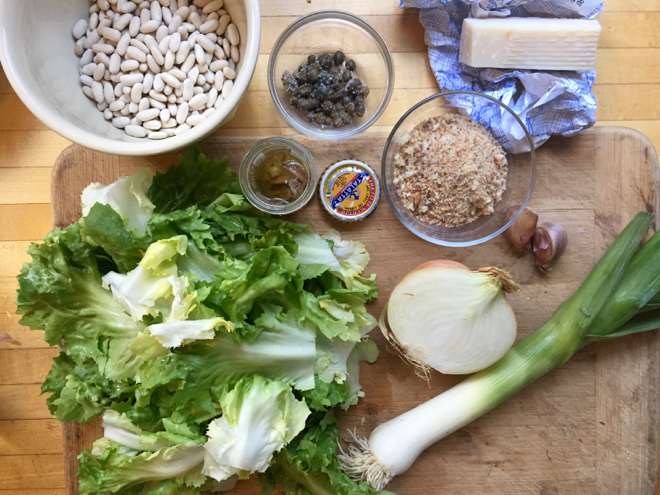 The Marina di Chioggia squash is pretty hard to peel raw so you might cut it in half and bake it for 30 minutes or so until softened a bit and then cool it and peel it and then use it as needed, possibly in this soup with your King of the Early Beans, barley and sage. Quick Brussels Sprouts with Miso and Sesame might fight the bill this week. 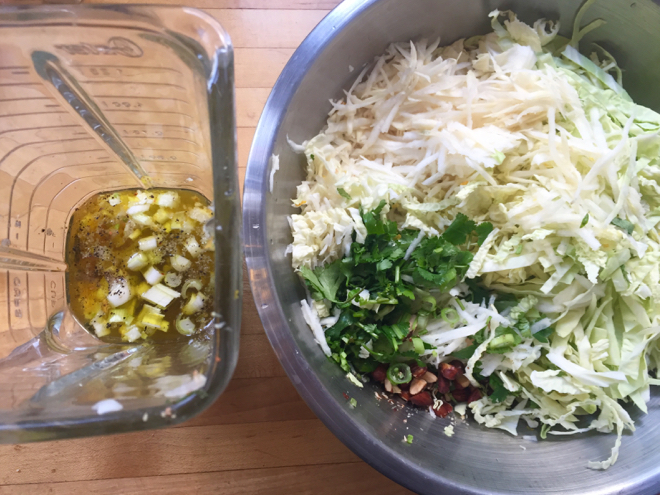 This salad/slaw with grated raw celeriac and shredded cabbage with an orange vinaigrette is perfect for this week’s share. These Leek, Potato and Herb Pancakes are a little bit of a project but so very delicious. It’s going to get cold again and this Red Curry with Rutabaga and Winter Squash will be the perfect antidote. 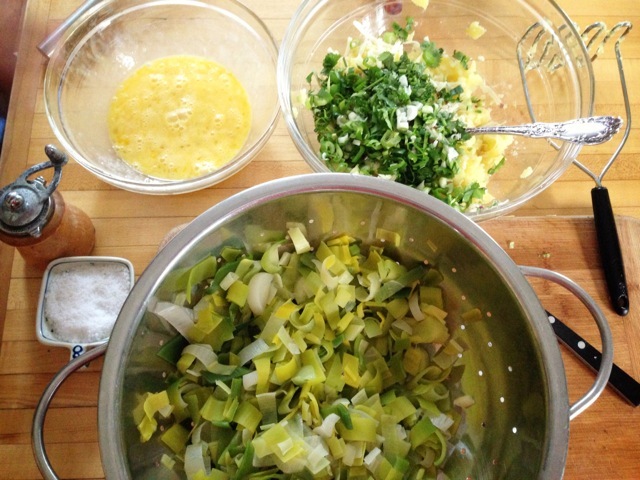 This Escarole, Leek & Potato Soup will be perfect this week. 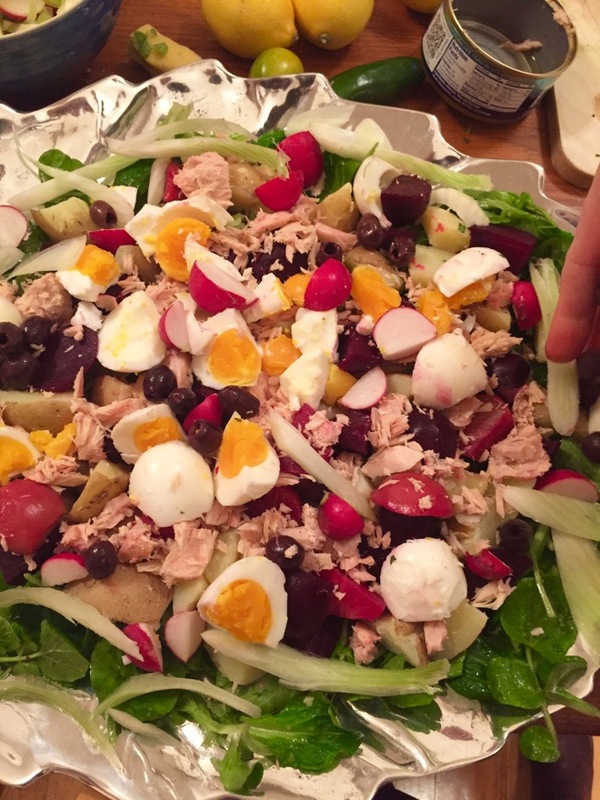 Make this Wintry Nicoise Salad, using kohlrabi instead of radishes for a gorgeous supper salad. You might use your collards and some of your butternut squash for this easy dish. Leeks simply sauteed in butter are divine. Top them with a poached or fried egg and a piece of good bread for a quick meal. 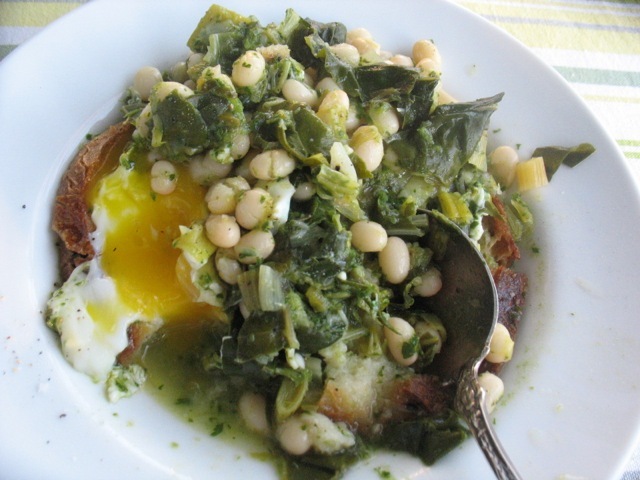 Use your escarole for this hearty Savory Braised Escarole & White Bean dish. Brussels Sprouts, shaved thinly, with sharp cheddar, apples and walnuts may be my current favorite salad combination. 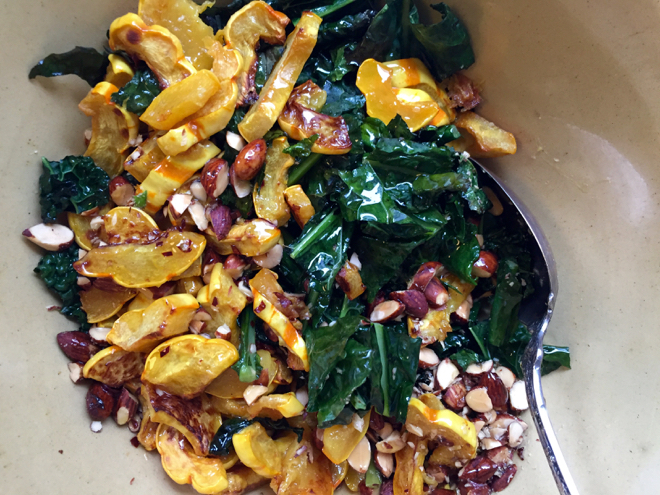 Try this version of roasted Kale and Delicata Squash Salad this week. 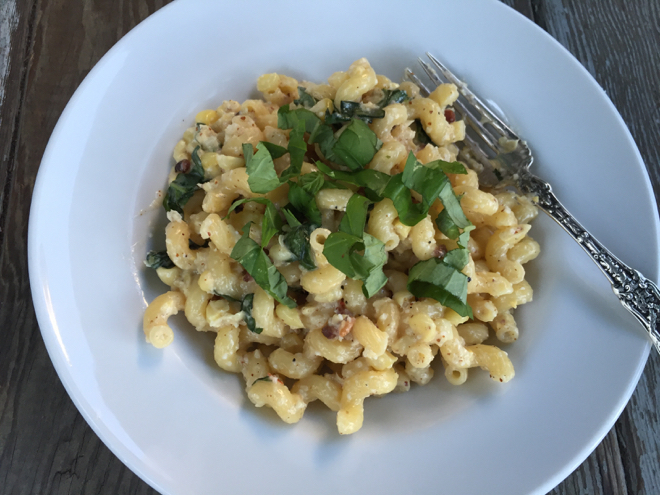 You could use your parsley for this quick stove-top mac and cheese. 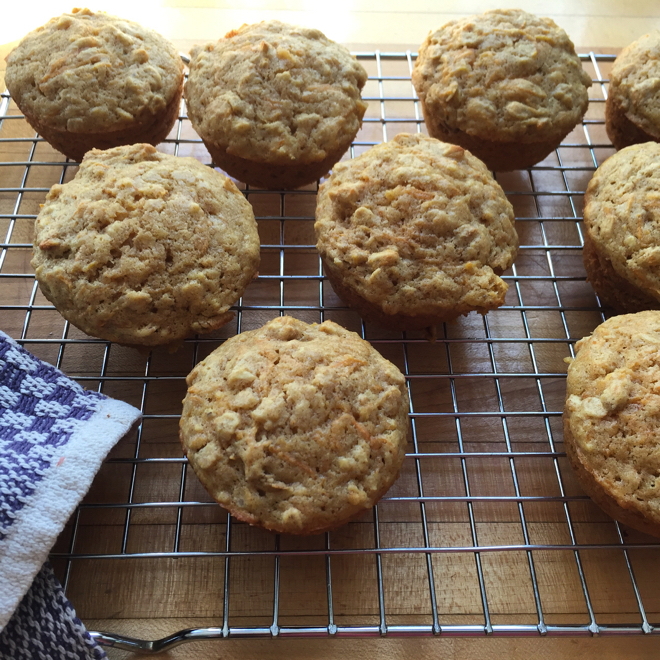 Oat, Carrot & Nutmeg Muffins will make your kitchen smell very good and they make the perfect winter snack or breakfast. 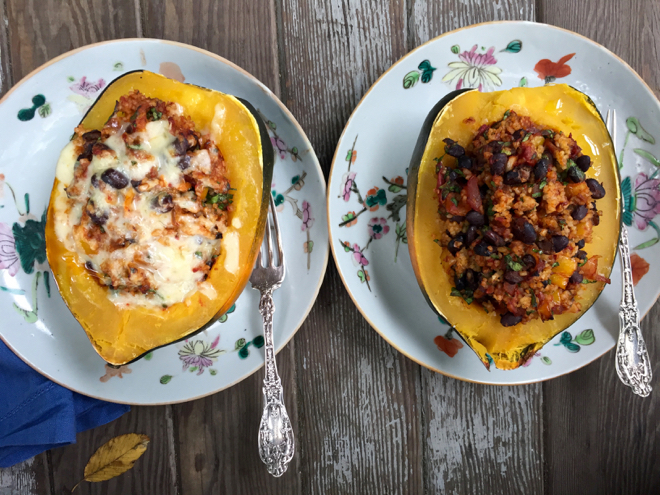 You could make these beautiful Stuffed Squash with Red Chile Beans with your Acorn squash this week–a gorgeous meal-in-one.
. . . with or without cheese. 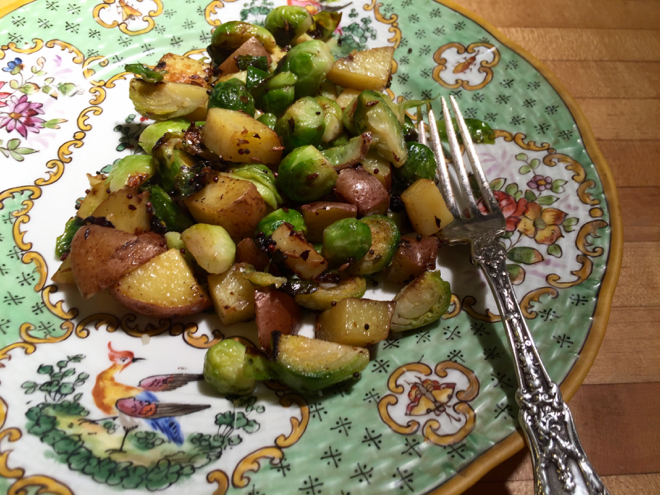 This is very quick and simple saute of Brussels Sprouts and Potatoes with Mustard Seeds & Cumin Seeds is delicious. This simple Kohlrabi Salad might be a nice fresh accompaniment to the sweeter, softer, cooked dishes of the season. I managed to eat a whole celery root in two sitting with this preparation, Broiled Celery Root w/ Remoulade, recently! 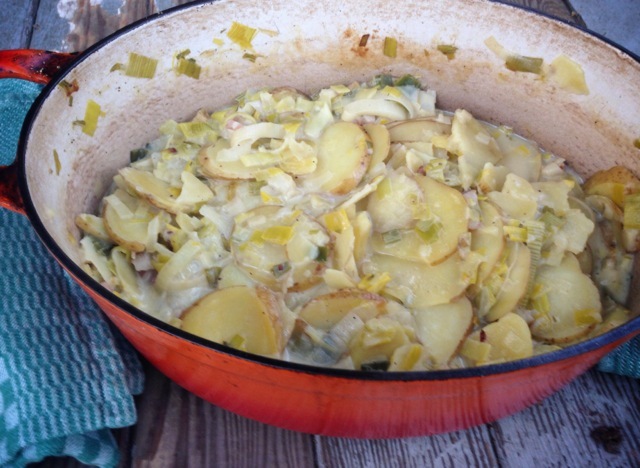 And this Leek & Celery Root Gratin might be worth a try this week too. 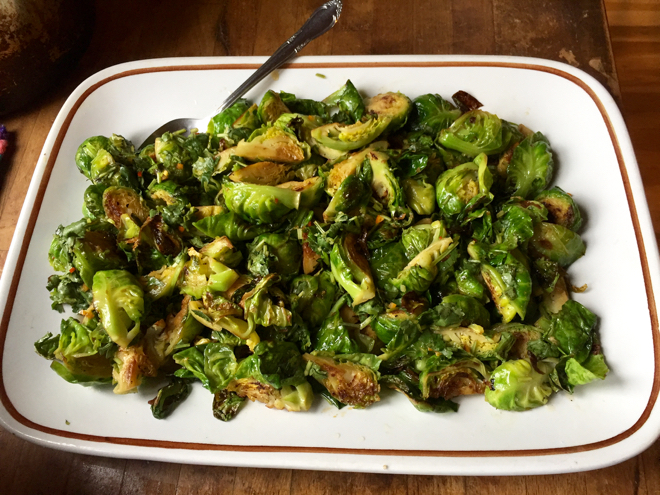 These Mustard-braised Brussels Sprouts are one of my favorite Thanksgiving side dishes. 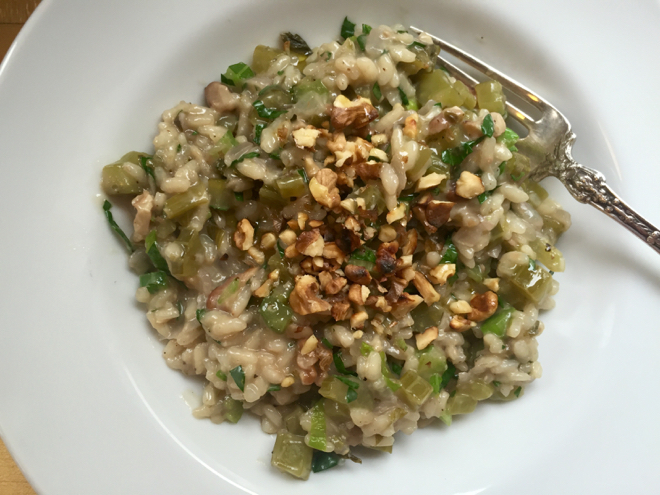 This Celery and Walnut Risotto is just fantastic and uses some of the parsley in this week’s share as well. 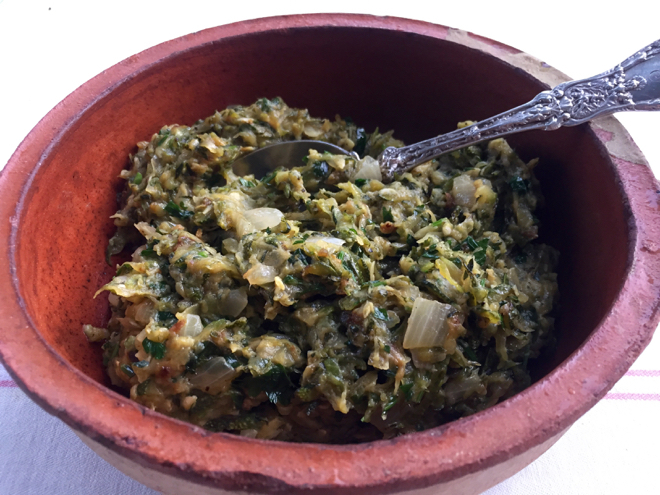 These two versions of Celery and Parsley Salsa Verde might be a nice bright addition to the Thanksgiving table, to cut all the richness. Or make them anytime! Onions, shallots, carrots, delicata squash and potatoes would be lovely, in any combination, in this Miso and Cider Vinegar-Roasted Vegetables. 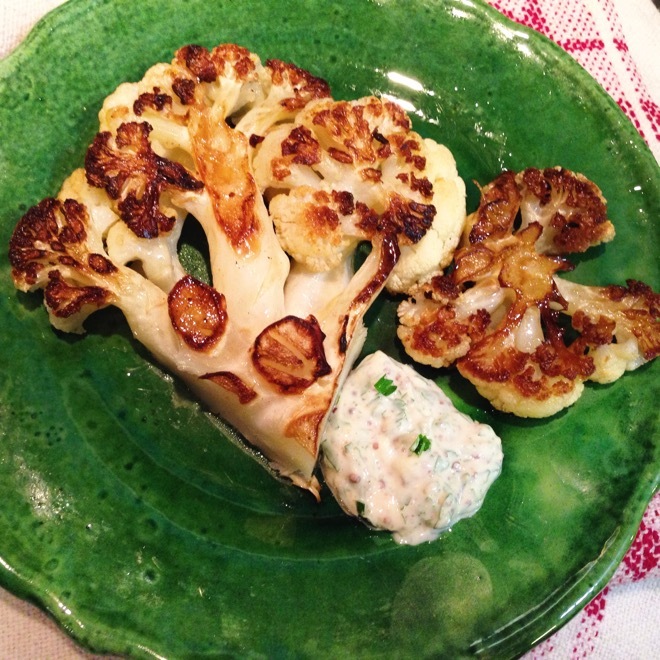 Make Cauliflower Steaks (with Dijonnaise) with your gorgeous cauliflower this week. 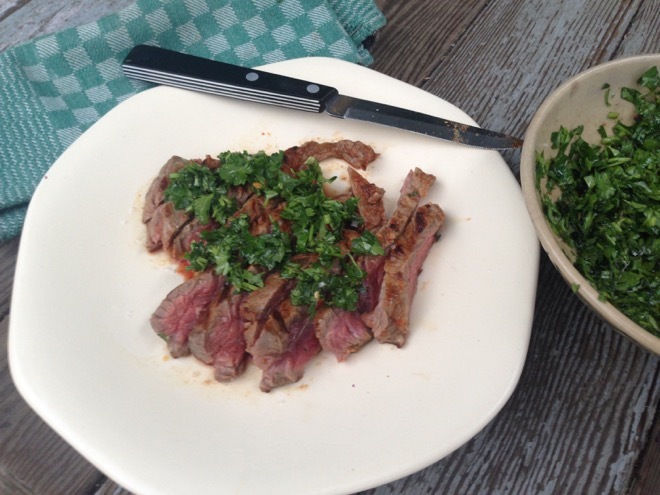 This quick Skirt Steak with Chimichurri (Parsley sauce) would be good with the cauliflower steaks. Use your purple potatoes and anaheims to make this crispy tacos. 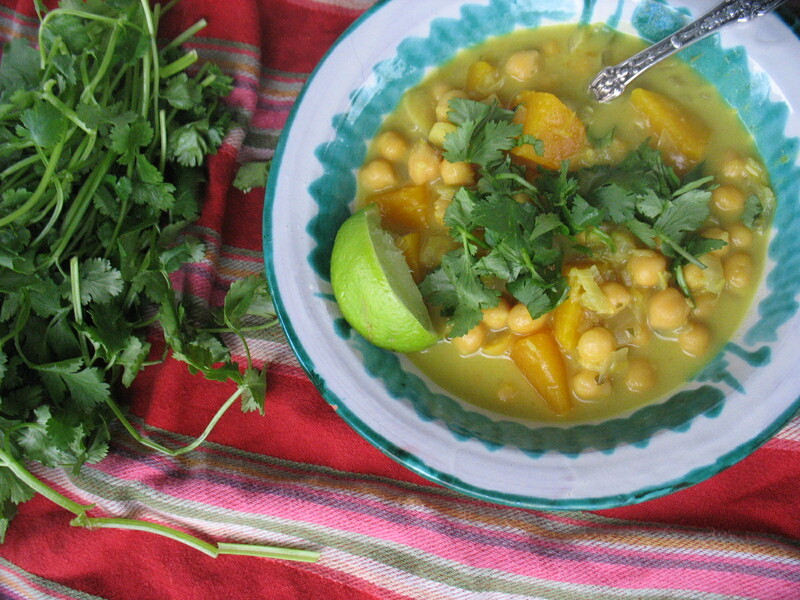 Make this Chickpea and Winter Squash Curry to keep cozy in this blustery weather. You could make this gorgeous and delicious dish using poblanos instead of sweet peppers, as well as some of your eggplant and tomatoes this week and sub basil for cilantro and some arugula would be fine too. I’m guessing this might be the last of the corn so you could out with a bang with this corn pesto, bacon, and basil pasta dish. So simple and so good: Eggs With Roasted Poblanos. 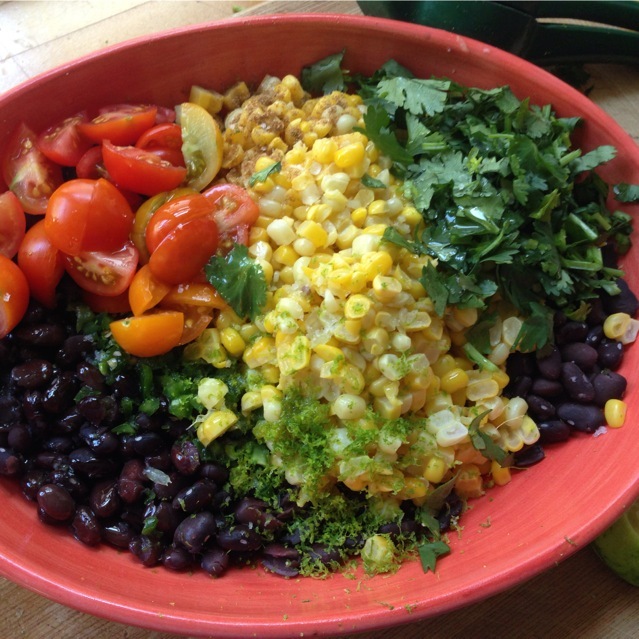 Or Corn and Roasted Poblano Salsa. . . 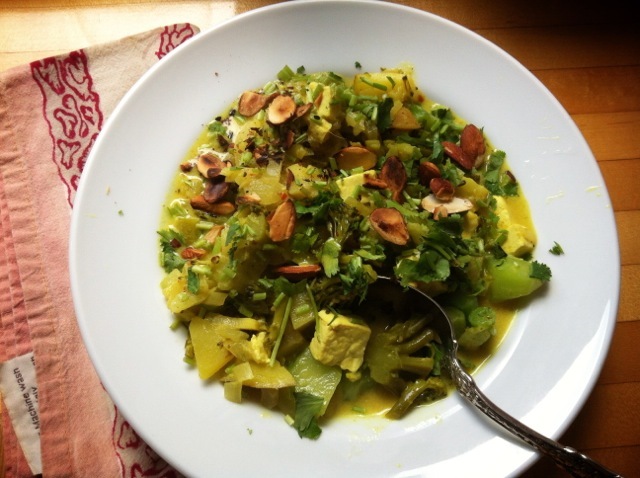 This Broccoli Korma with Toasted Almonds would be wonderful as the weather cools a bit later this week. This Spicy Roasted Cauliflower with Mint will put your hot peppers to good use. It’s the perfect time for ratatouille! It’s better the next day (I love it for breakfast with good toast) so make plenty and don’t eat it too hot–warm or room temp is best. 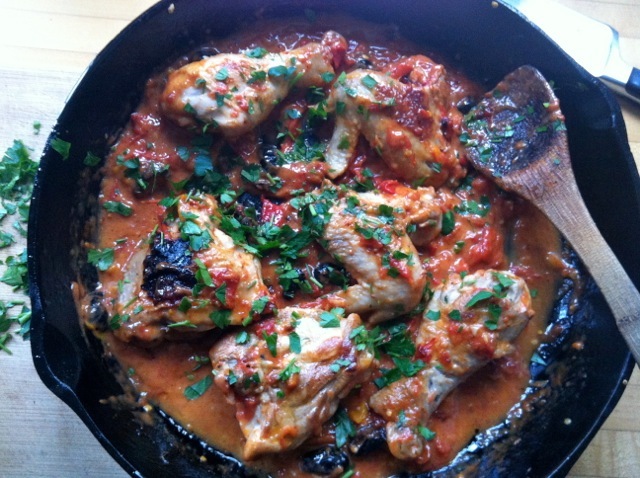 The Calabrian-style Spicy Eggplant will also be perfect this week. 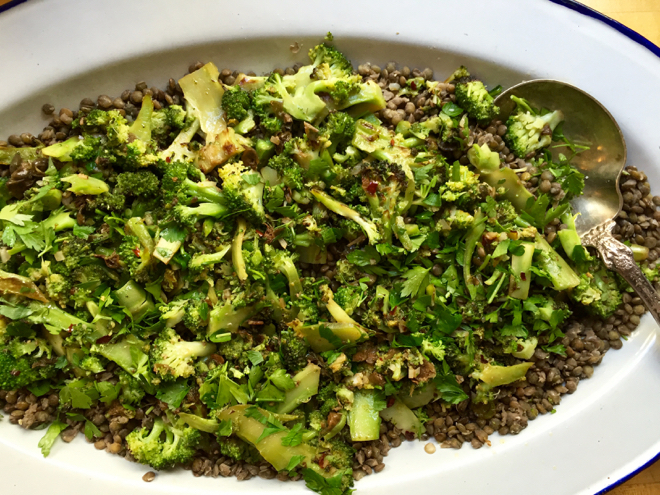 If you want to put the beautiful broccoli at the center of the plate, make this extraordinarily flavorful dish: Crispy, Spicy Broccoli w/Capers, Garlic, Parsley & Lentils. And with those cukes and Stupice tomatoes and basil you could make this simple, composed salad. 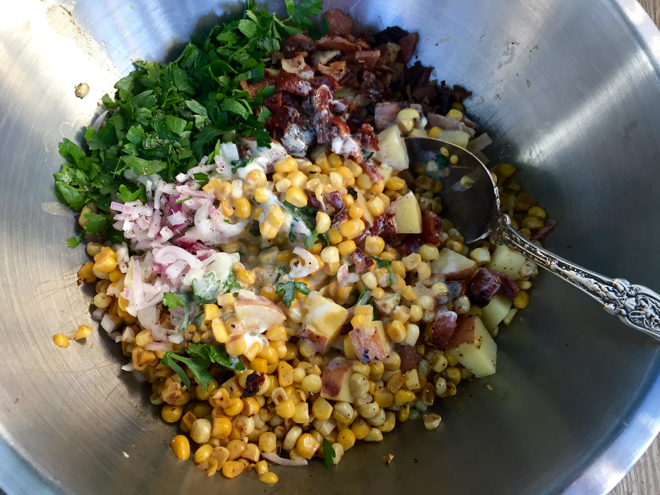 Make this Corn Chowder Salad with your corn, fingerling potatoes, parsley and add some of your Czech Black peppers. Make this hearty salad with frikeh (parched green wheat) or barley or rice and employ your cucumbers, peppers, radishes and some of your parsley. 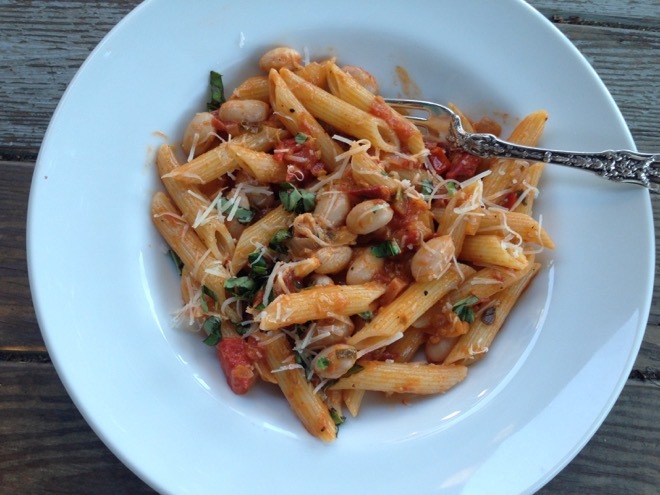 Toss your fresh shelling beans with pasta in this sauce with tomatoes and bacon. 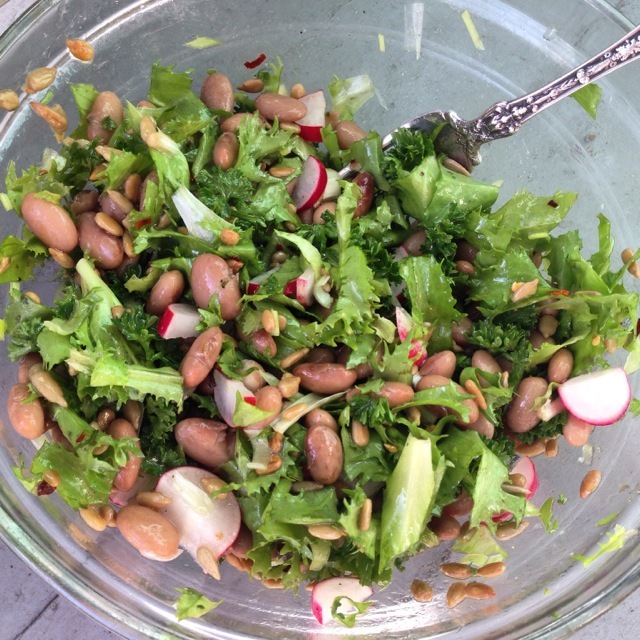 Or make this cook-with-what-you-have salad, using your shelling beans instead of dry beans, summer crisp lettuce and radishes. Kohlrabi Parmesan Fritters would be perfect this week, using some of your garlic and cayenne pepper as well. 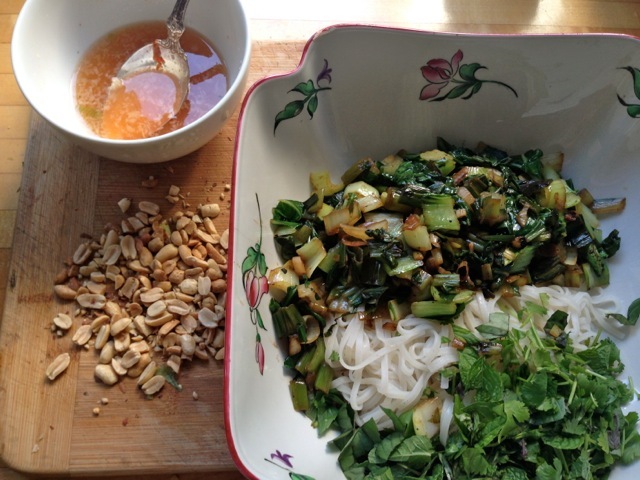 You can make this fresh rice noodle salad with your joi choi. 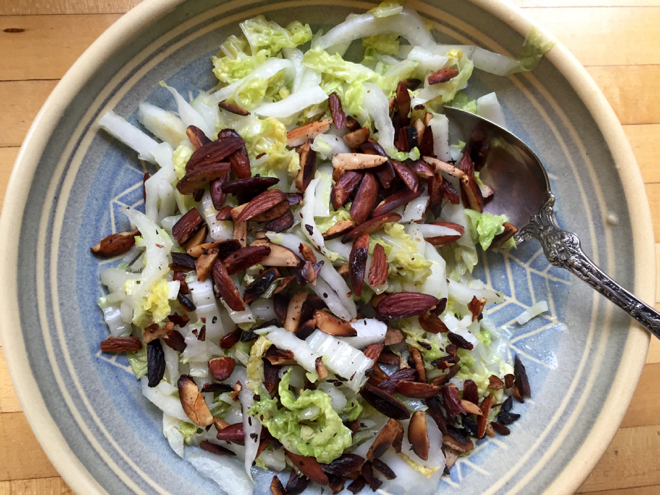 My current favorite thing to do with Napa Cabbage is to saute for a mere minute or two, dress with apple cider vinegar and lots of toasted almonds. The cool weather is keeping the lettuces tender and sweet and they don’t need much doctoring. 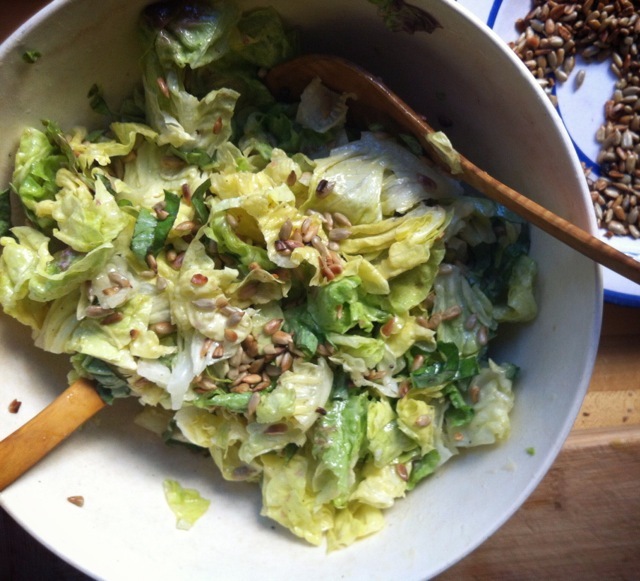 This salad, with a garlicky dressing and toasted sunflower seeds does the trick. 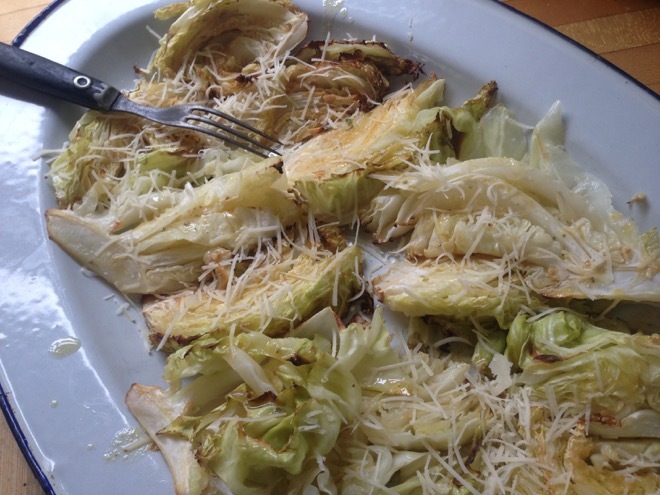 Use some of your Napa cabbage and spring onions for this broiled/grilled cabbage with miso sauce. 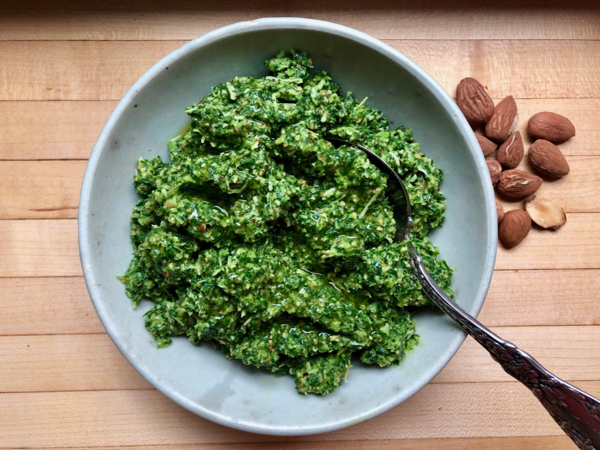 This “broken” pesto of fava greens is just chopped by hand rather than processed until smooth giving it a more interesting texture. And it puts some of your garlic to good use. 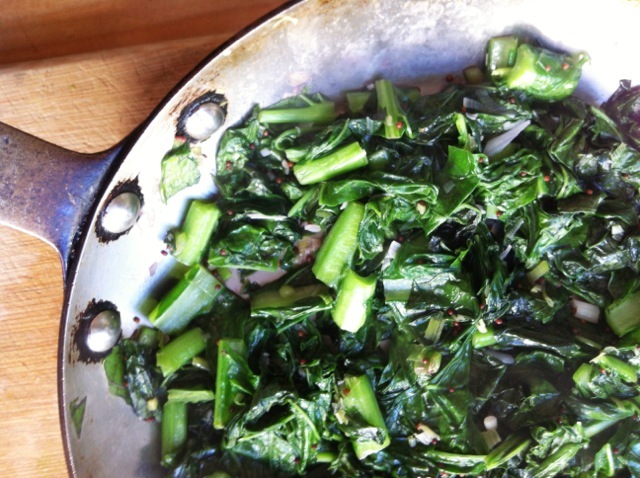 You could use your spring onions for this dish of collard greens, onions and ginger. 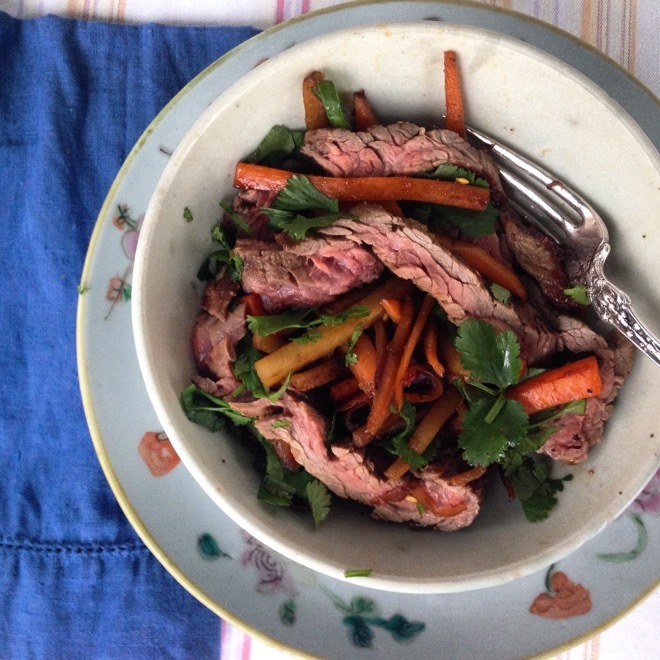 This quick, delicious dish of skirt steak with root vegetables would be great with the turnips and kohlrabi (not a root, I realize) this week. This kohlrabi salad is bright and creamy and crunchy. 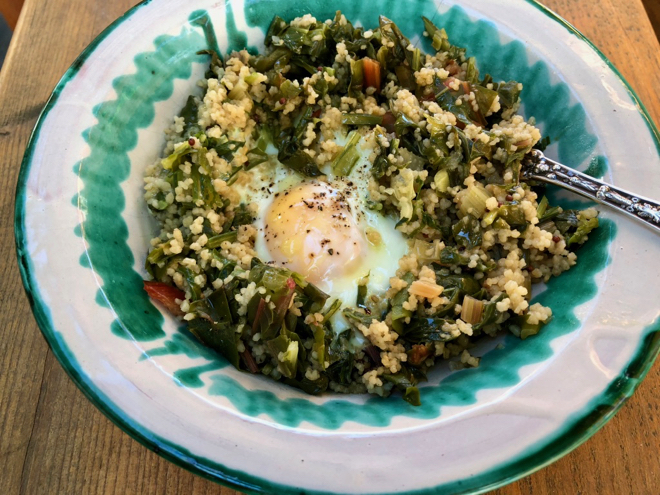 You might use your garlic scapes, kale and turnip tops (if the turnips come with tops) for this quick, delicious dish with couscous and nested eggs. Though I haven’t tried it this dish should work with quinoa instead of the couscous as well, though you’d need to cook it a bit longer and possibly add a bit more water. Spiced Red Lentils with Fava Tops and Yogurt is a robust, quick dish. This version uses pea shoots but I’ve made it with fava tops too and it’s equally good. 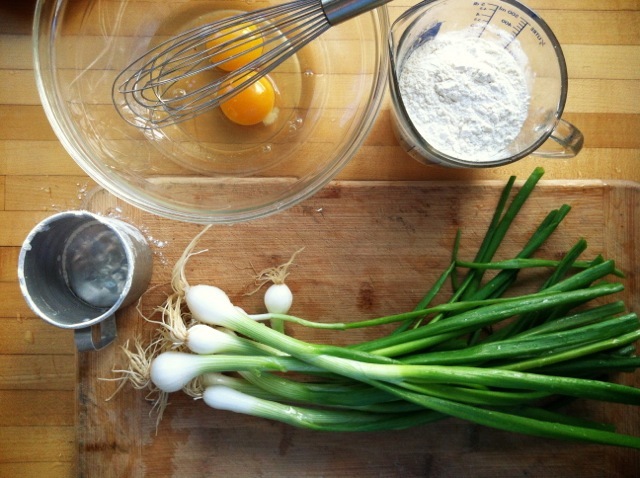 Make spring onion pancakes with some of your onions this week. 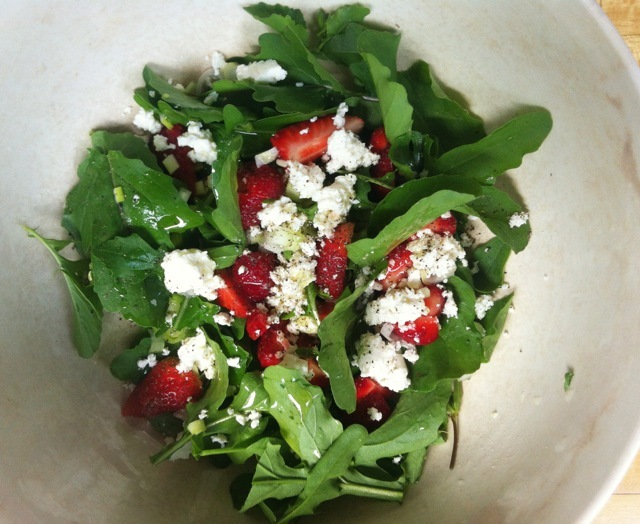 Combine a handful of strawberries with arugula, some fresh feta or goat’s cheese for a beautiful, late spring salad. 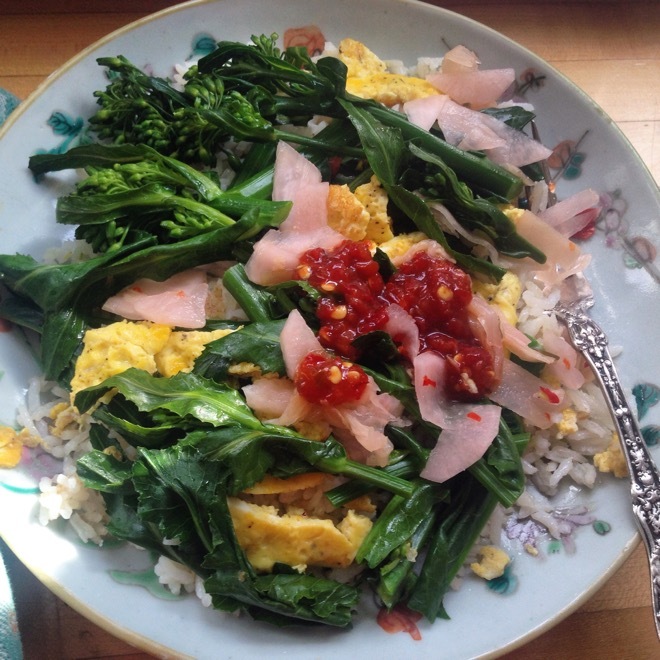 Your spring raab would make a lovely dinner in this rice bowl. Garlic scapes are delicious and sweet when grilled or broiled or even just seared in a cast iron pan on the stove top. You can chop them up and add them to salads and they are particularly good with beans. Or you can make a pesto with them, raw. You could use your turnip tops and turnips themselves (in place of the carrots), as well as mizuna, garlic scapes and/or bulbs in these very fun “Fried Rice Pancakes”. This quick, broiled pan of spring veggies with turmeric would suit your turnips, radishes and garlic scapes this week. Round out with chickpeas (or any beans) and some rice and you have a meal. This quick Mustard Greens saute would be great with either (or both) new garlic and garlic scapes. And by all means toss in your turnip greens too. 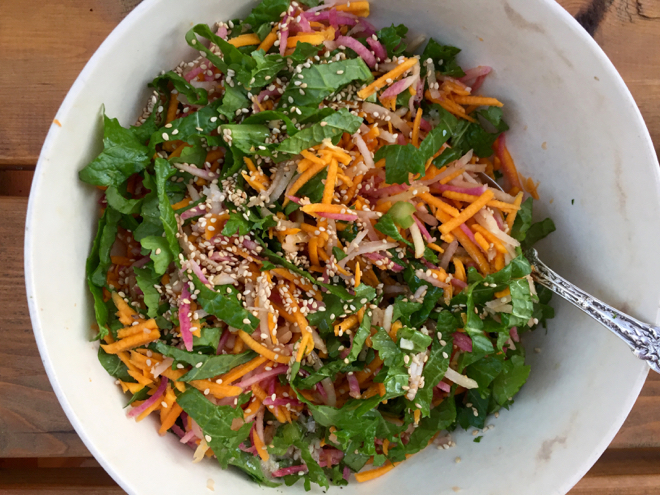 You might employ some of your radishes, fresh garlic, and mizuna and/or arugula and cayenne in this beautiful, bright and delicious salad. 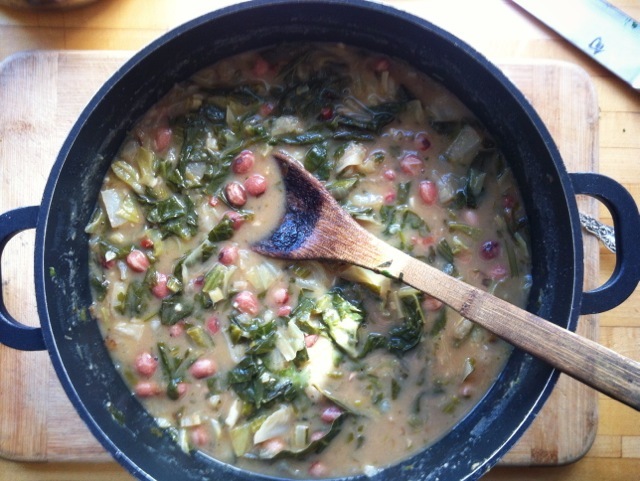 And another salad, what I call Cook-with-What-You-Have Salad of Beans and Greens–adaptable as can be. 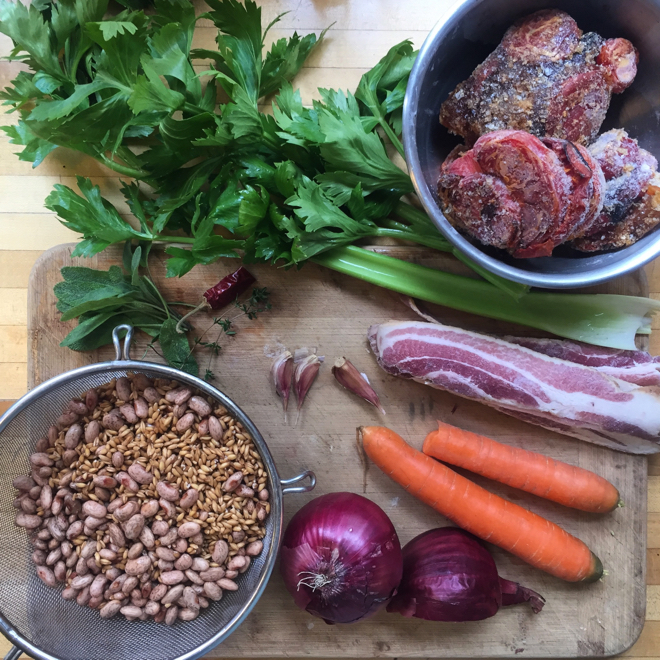 Make this quick stew of beans and chorizo (or not), and top it with quick pickled radishes (instead of carrots) and use Calypso or Good Mother Stallard Beans instead of the black beans and add plenty of cayenne pepper if you’d like. 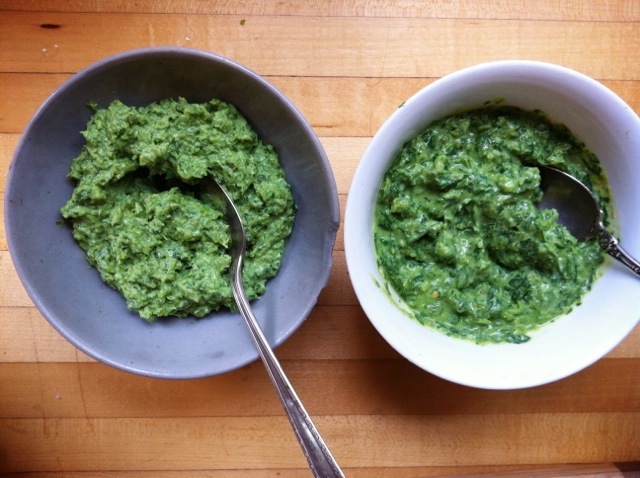 Use some of your fresh garlic to make aioli and then use a little to dress your beautiful greens with it, spread it on sandwiches, make deviled eggs with it, etc. I made a frittata with lots of chard and only enough egg to hold it together last week. And the chard was dry when it hit the pan and I almost seared it. It was one of the best frittatas I’d had in a long time. This recipe for Mustard Greens Frittata is perfect, just substitute chard. 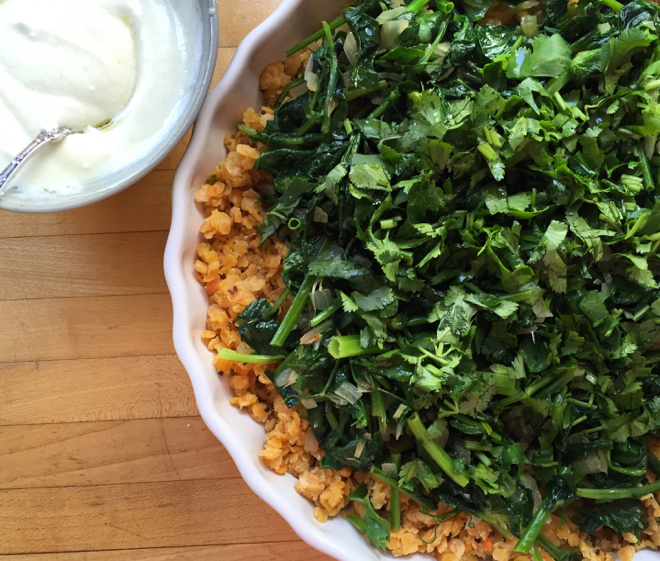 Use your fava greens in this dish (instead of the pea shoots) with spiced red lentils and yogurt. You might make this springy soup and use chard, leeks and green garlic and parsley (instead of the spinach, onions and sorrel). 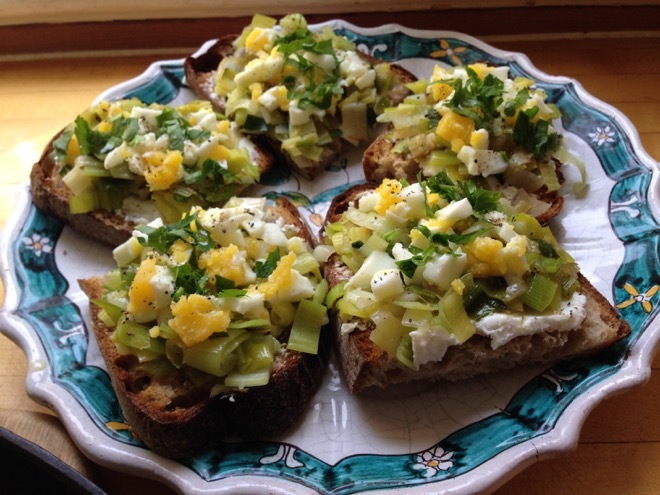 An oldie but a goodie, Bruschetta with Stewed Leeks, Goat Cheese & Chopped Egg. . . and so springy! 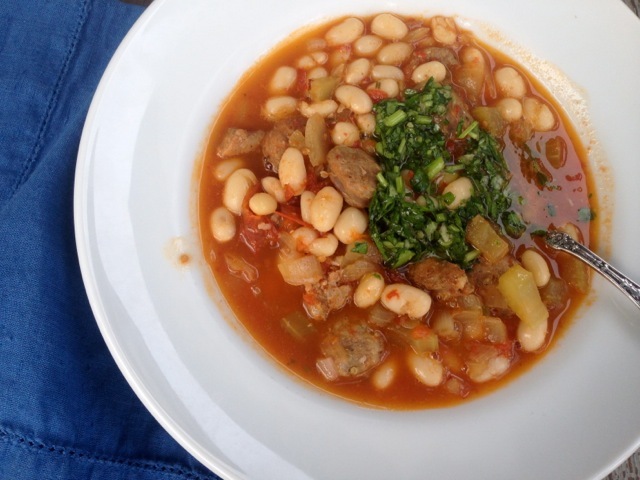 If you have Flageolet Vert beans you might make this dish with herbs and sausages. If you have Black Coco beans you could make this stew with chorizo and use some of your cayenne and make a garnish with your parsley instead of using carrots. You’re getting dry beans you lucky folks! 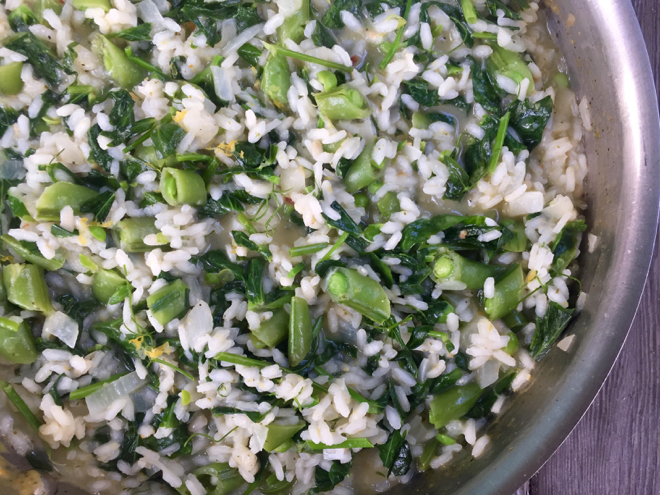 You could make this easy and delicious one-dish Jamaican rice and bean dish with them, some of your cayenne and either your collard greens or chard. 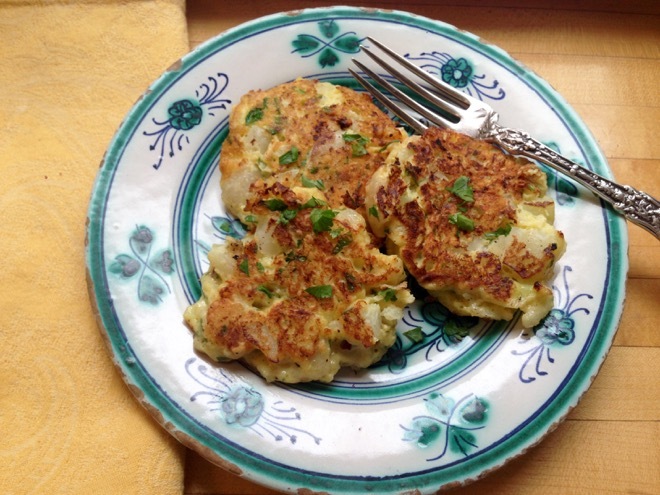 Use some of your leeks and parsley to make this delicious leek, herb and potato pancakes. You could also use your collard greens for this quick, fun dish and take advantage of the tail end of the orange seasons. 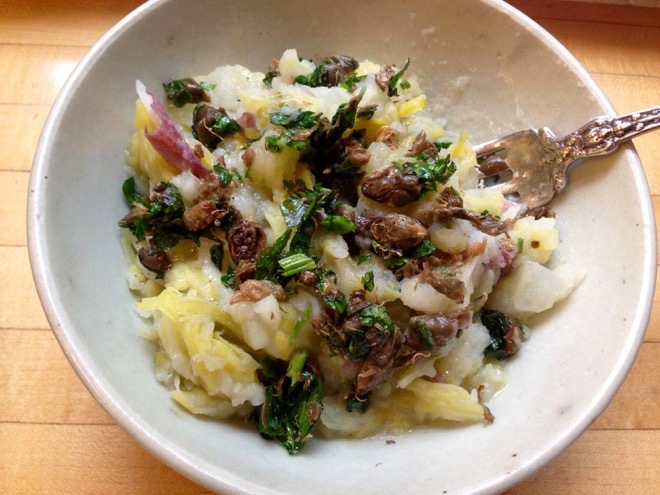 Enliven your leeks and potatoes, mashed, with fried capers and you could toss in some cayenne as well. Make a spice mix out of toasted cumin and coriander seeds (you’ve toasted in a dry skillet until fragrant) then grind those in a mortar with some cayenne and coarse salt. Sprinkle this on a bowl of popcorn with a little olive oil. 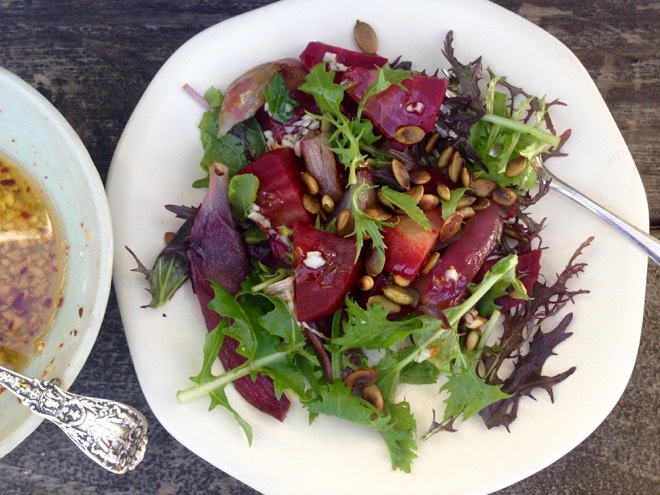 Make this Beet and Apple Salad with some of your beets. This dish would be delicious with your broccoli greens and cayenne. Your rutabaga and winter squash would be nice roasted with this miso dressing. The first of the season’s purple sprouting broccoli might be enjoyed simply like this, blanched and then quickly sauteed with garlic. Your leeks and cabbage are beautifully married in this gratin and you can substitute chard for the kale or just use a bit more cabbage and leeks and skip the greens. Delicious any way! 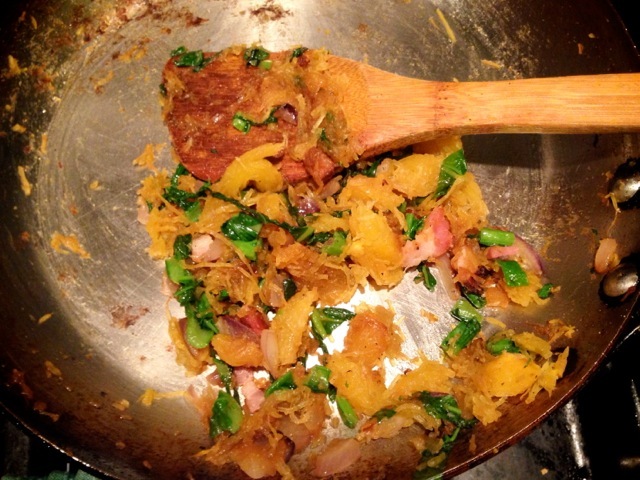 You could make a small batch of this Indian-spiced dish with your rutabaga. 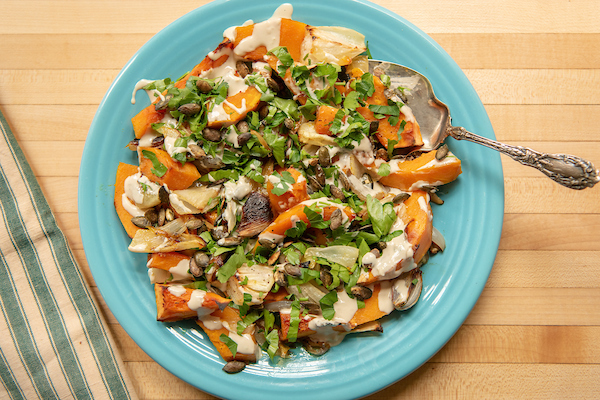 And with the fragrant Sibley squash, you might make this simple dish of roasted squash with spicy yogurt sauce and cilantro and toasted pumpkin seeds. You could make this beet salad with roasted leeks instead of onions this week–delicious either way. 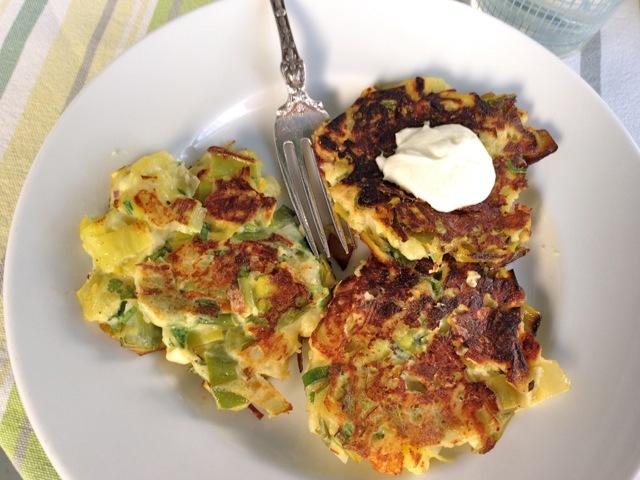 These Leek & Potato Pancakes are superb and take a lot of leeks! 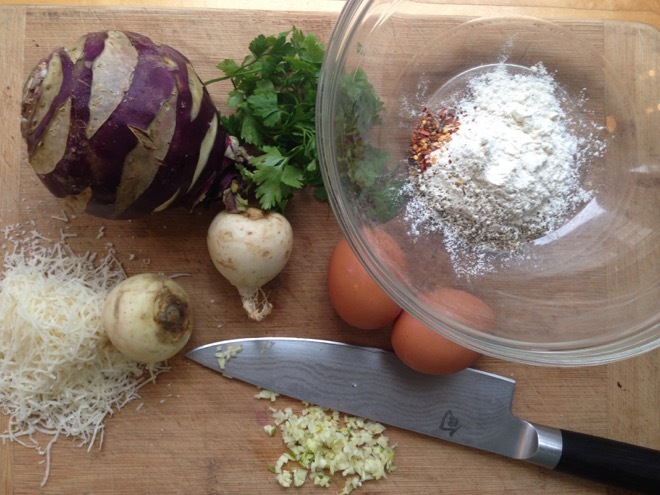 And if you want another idea for savory patties make these but use the purple top turnips instead of kohlrabi. 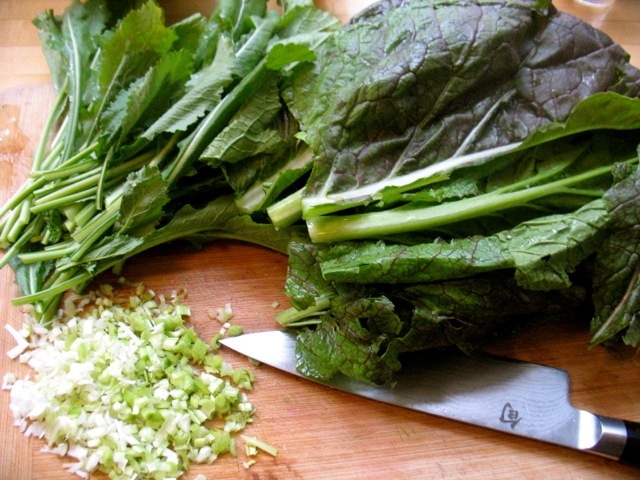 If you have any canned or frozen tomato sauce on hand make these delicious collard greens. Make this simple red curry and use some of your butternut squash and rutabaga. Spice it up a bit more by adding some of your cayenne as well if you like heat. I’ve been enjoying grated raw beets, marinated for a bit with minced garlic and lemon juice, olive oil and salt. 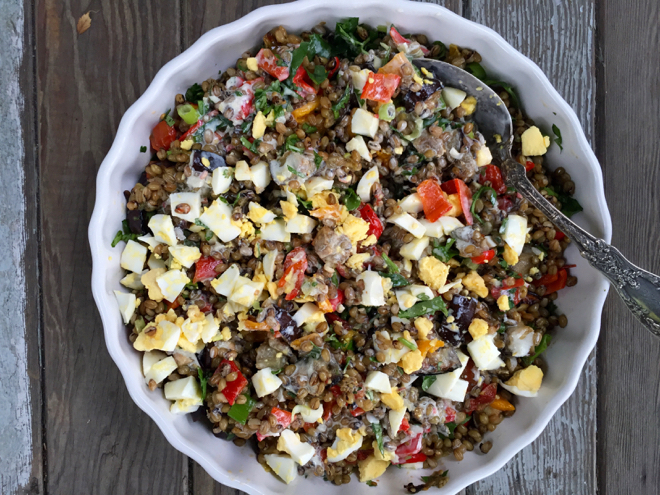 They are also superb tossed with farro and celery in this salad. I love salads with roasted winter squash this time of year and this one with black beans, squash, cilantro and avocado is bright and hearty. 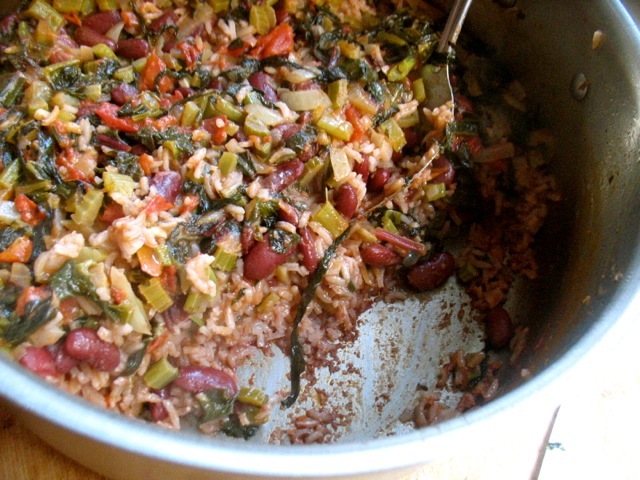 Make this Jamaican Rice & Beans with greens but use black instead of kidney beans and use either some or your chard or escarole for the greens and use your cayenne. The other day I tossed freshly popped pop corn with a mixture of freshly toasted cumin and coriander seeds (then roughly ground in a mortar & pestle), salt, pimenton a little cayenne and olive oil. It was delicious! 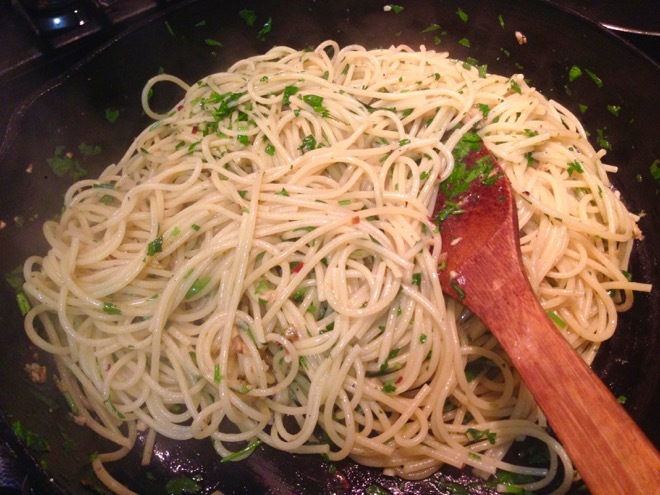 Use some of your cayenne peppers for this, the simplest of pastas. 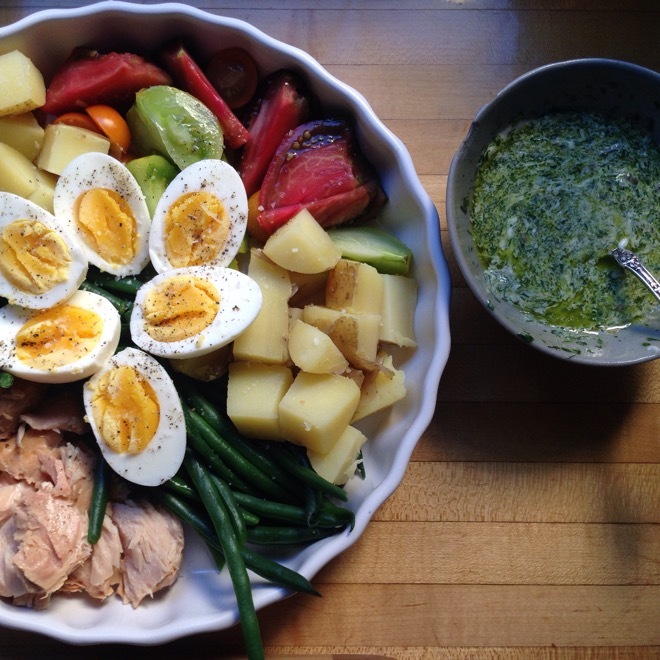 This gorgeous, Wintry Nicoise Salad will be delicious with your beets, escarole and watermelon radish. Marina di Chioggia is one of my favorite winter squash varieties. It’s dense, creamy, sweet and delicious. 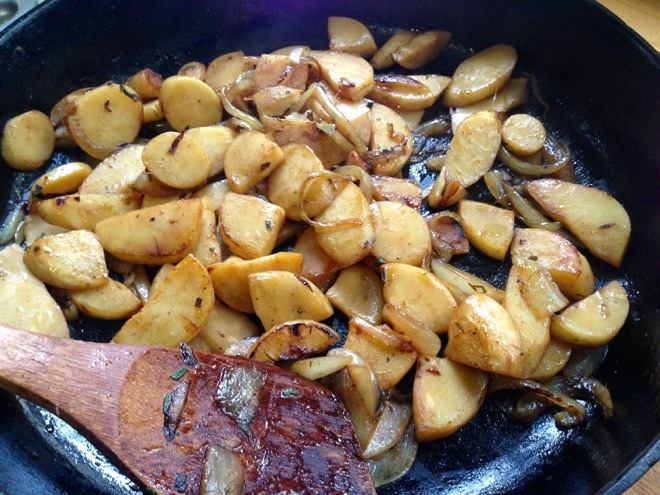 I love to use it in a panade (with lots of caramelized onions, stale bread, and broth). 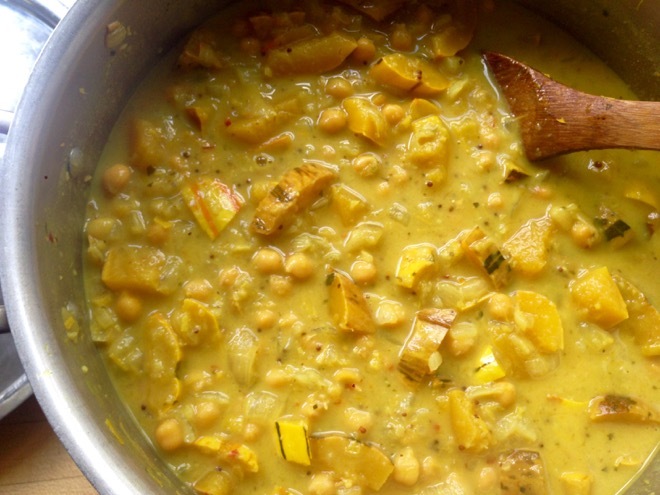 Or make this hearty Winter Squash and Chickpea Curry and have plenty for lunches this week. 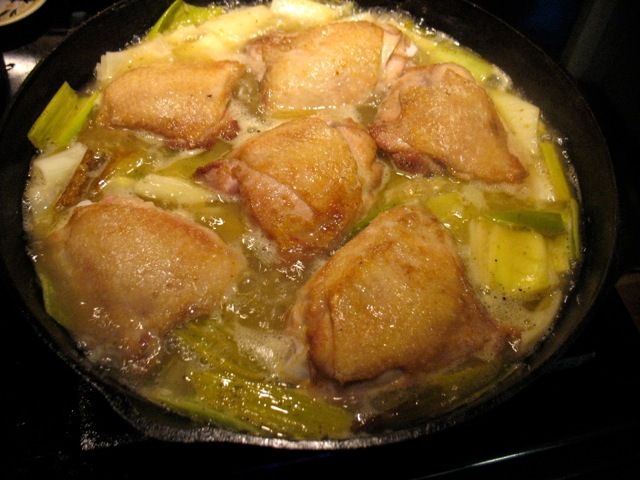 Chicken with Leeks and Lemon is a simple and elegant meal. 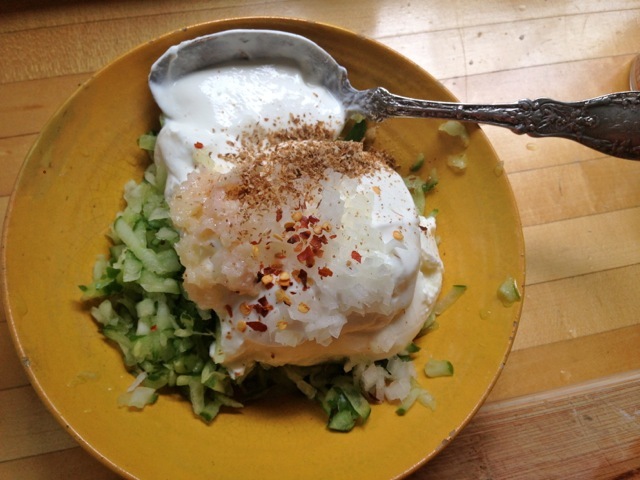 Or make Leeks Bruschetta with egg and goat cheese. Crunchy, sweet and stunning: Watermelon Radish and Apple Salad. 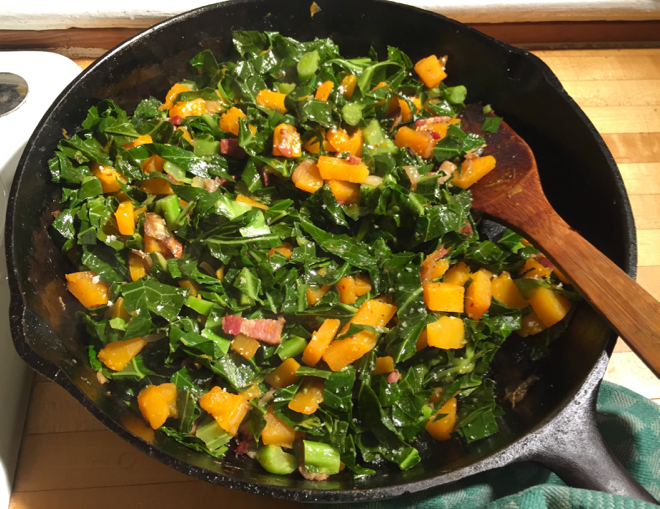 These collard greens with winter squash and bacon are delicious and beautiful. Feel free to omit the bacon and add a little Pimenton (smoked Spanish paprika) instead. Or add ginger to collard greens for these slow-cooked ones. 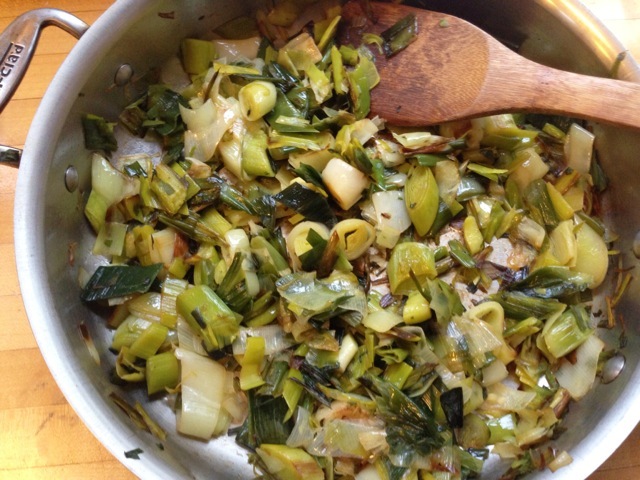 Leeks, salt, butter, maybe some thyme. . it doesn’t get much simpler and it’s more than the sum of its parts. 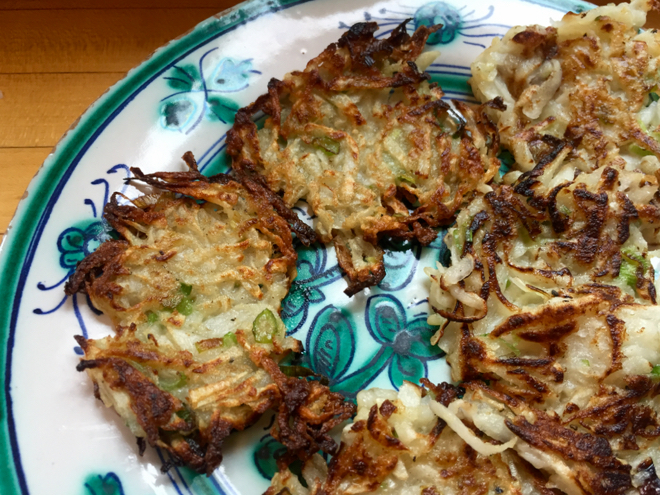 I made these leek and potato pancakes again recently and they are filling and delicious and I didn’t have any herbs and they were still wonderful. 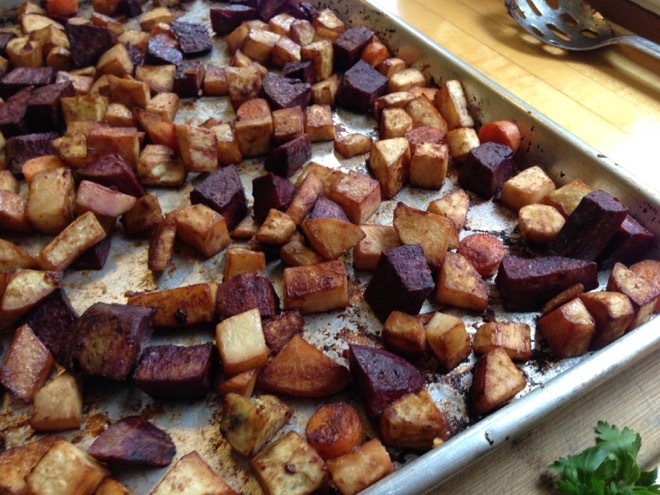 Beet pesto takes advantage of your beets and garlic and is a nice fresh antidote to the rich holiday dishes. Make this “chili” with white beans, rutabagas and turnips this week. These mustard-braised Brussels Sprouts are just really, really good. Watermelon radishes are so beautiful and crunchy it’s hard to go wrong. Make this robust chopped salad. This Savory Parsnip and Celery “Cake” would be a great use of said vegetables this week. Or mix potatoes and celery root in this excellent version of Scalloped Potatoes. The potatoes and black radish in this share will make a lovely soup. 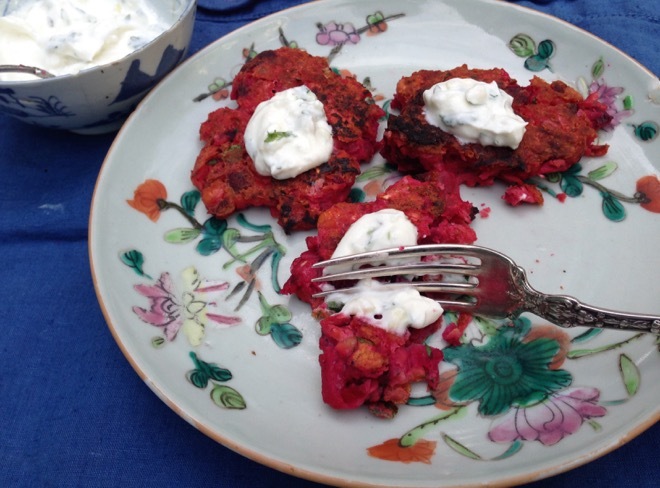 These beet and chickpea fritters are hearty and beautiful and topped with a minty, garlicky yogurt cream, quite elegant. 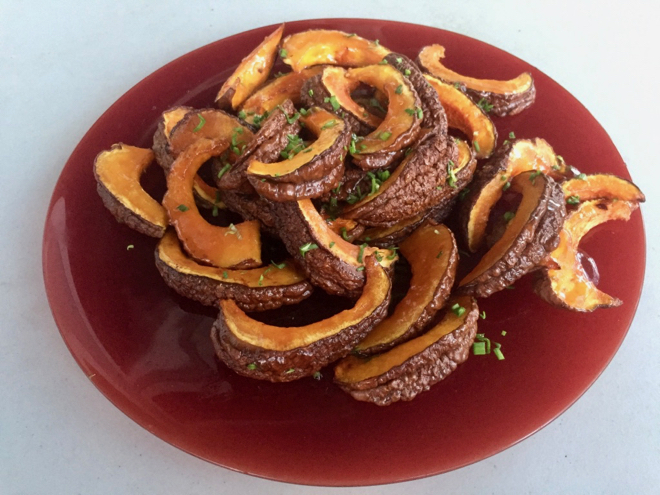 Make these baked squash wedges with the Red Kuri squash or make a simple soup with either squash with coconut milk and Thai red curry paste. 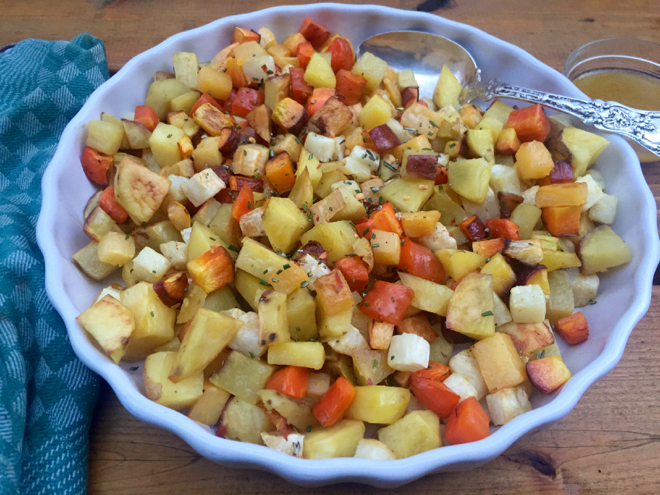 Roast your turnips with some carrots and maybe some potatoes for this savory mustard-roasted vegetable medley. 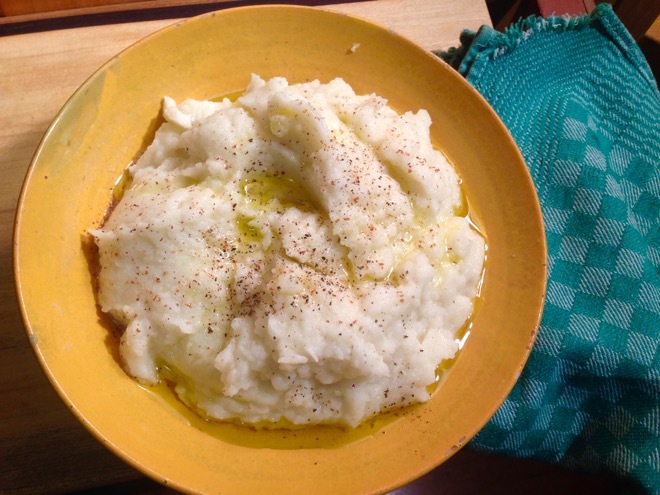 Cauliflower Puree is so light and delicious. I add one potato for richness! 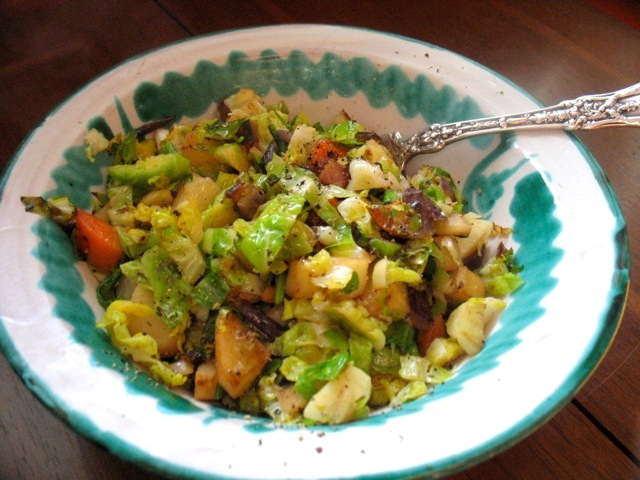 This Brussels Sprout and Rutabaga Hash is simple and satisfying. Celeriac and leeks combine with a bit of cream for an elegant and delicious gratin. 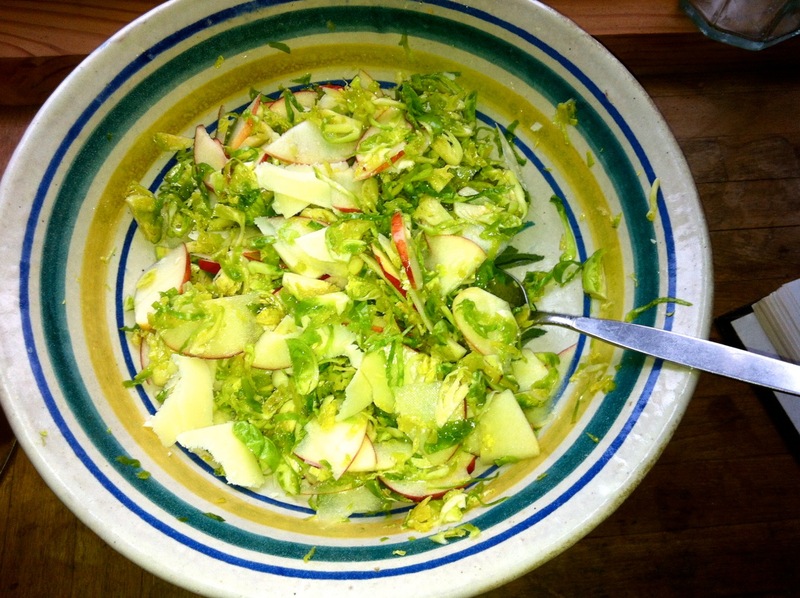 This raw Brussels sprout, apple and sharp cheddar salad would be a lovely Thanksgiving salad. Happy Winter Share cooking! So many delicious things in this first share, and still somehow straddling the seasons with those sweet Italian peppers. 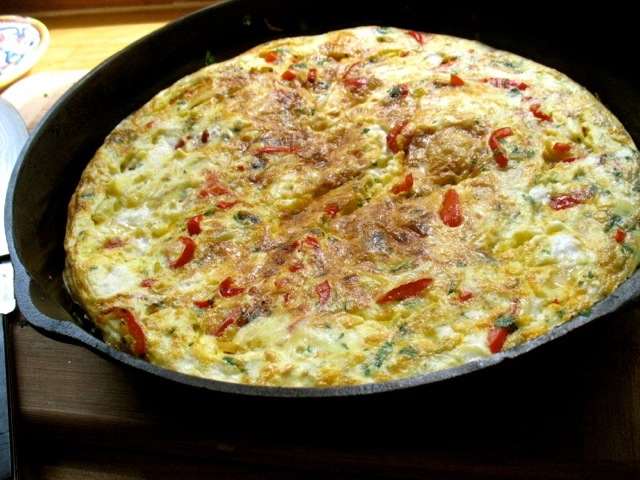 Toss those sweet peppers into a frittata with potatoes and garlic and maybe some collards or mustard greens too. 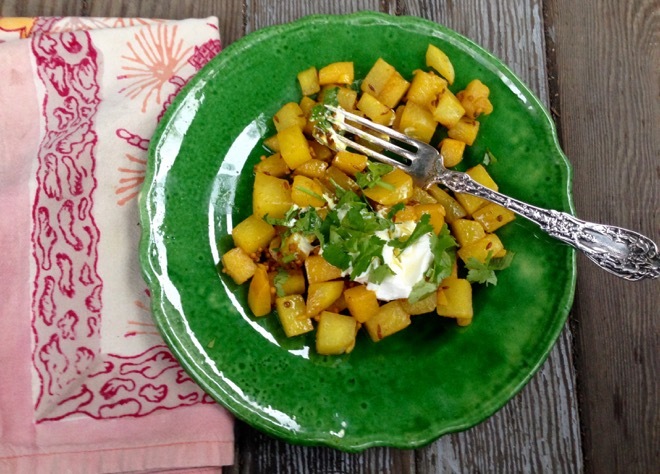 Roast your acorn squash and toss it with a cilantro garlic dressing. Saute your mustard greens with mustard seeds and plenty of garlic for a simple, flavorful side dish (just use a couple of cured/mature garlic cloves rather than green garlic in this case). 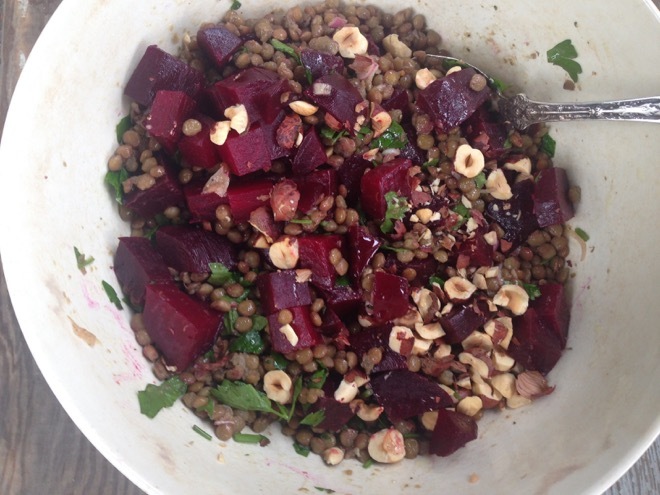 Roast your beets and toss them lentils and toasted filberts! 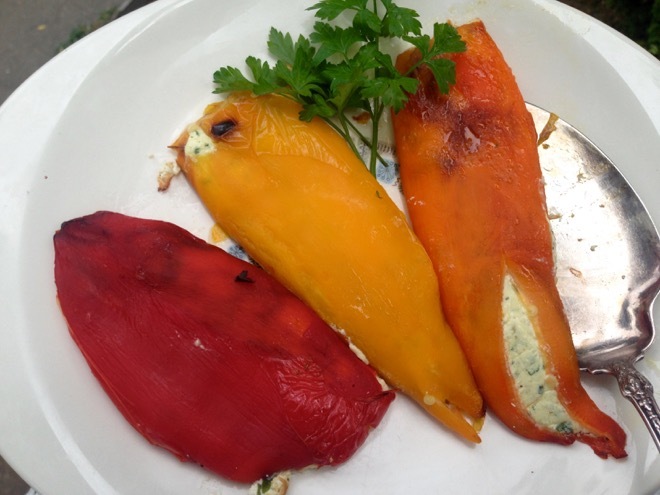 Take advantage of what may be the last of the sweet peppers and make these luscious ricotta-filled, roasted peppers. 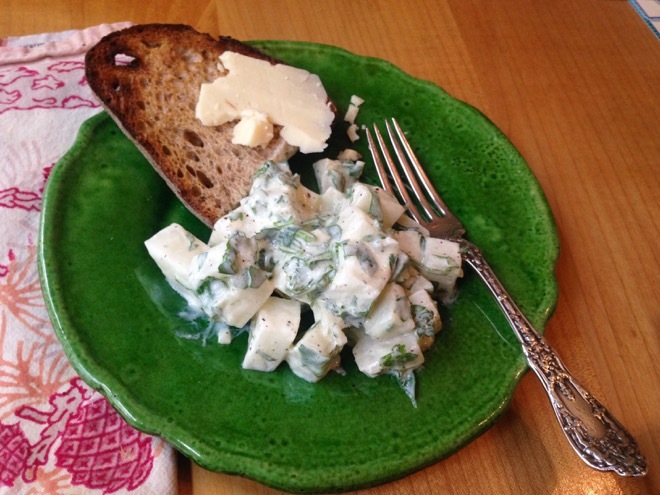 Make this creamy potato salad with dill and mustard dressing. 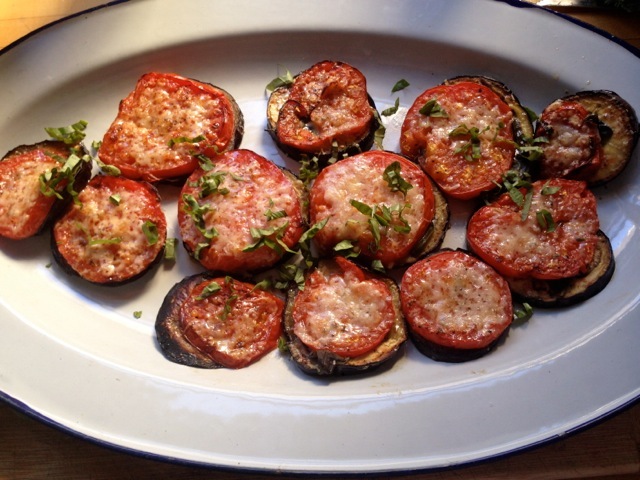 And with the last of the eggplants and tomatoes, make these simple, roasted stacks. These collard green fritters would be wonderful with some thinly sliced Jimmy Nardello’s and some leeks, if you end up with some of those. 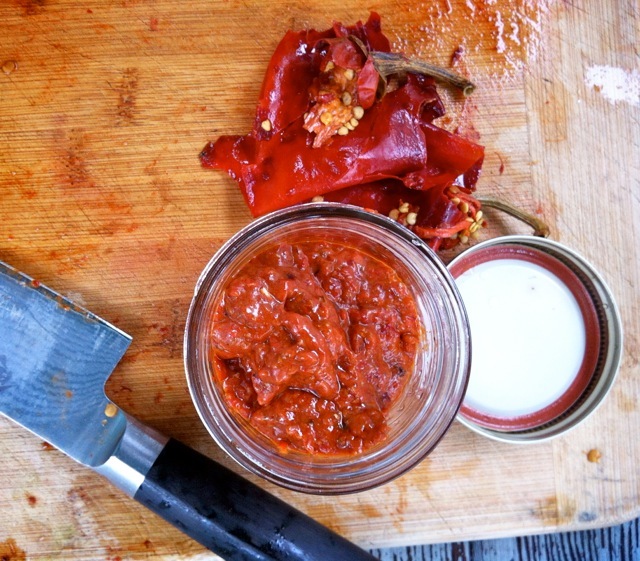 Make harissa with your mix of sweet and hot peppers this week. . . it may not be a classic pepper combination for this spicy sauce/condiment but I bet it will be good. I would broil the Jimmy Nardellos until nice and browned but don’t try to peel them as I don’t think it will work. Just seed and process with the rest. Make this Spiced Eggplant and Tomato Stew if you have a bit of time. You can break up the cooking process a bit too. It’s amazingly good. And it will use your hot peppers this week. And don’t worry if you’re a bit shy on the tomatoes. 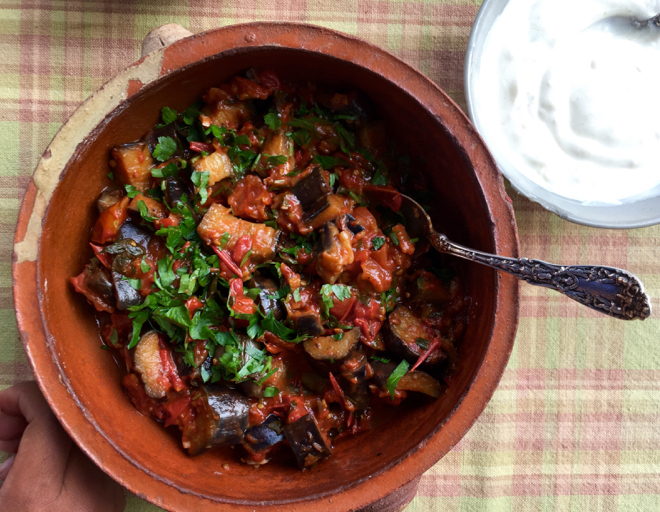 Or make this very quick and totally addictive Calabrian-style Spicy Eggplant side dish. You could make one last round of Ratatouille with your share this week. 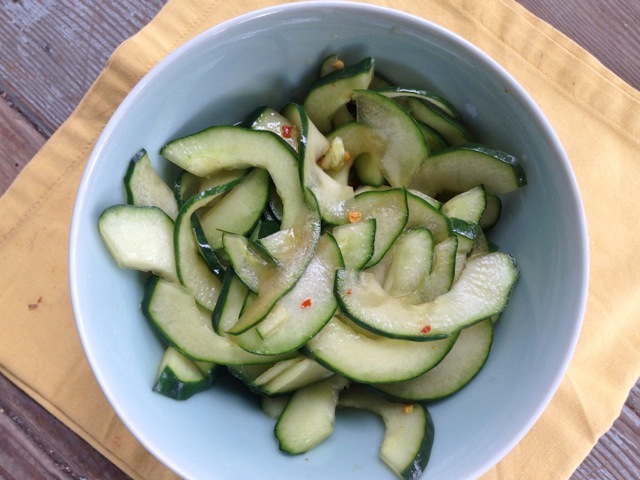 This cucumber salad with smashed garlic and ginger and is bright and delicious. Make this roasted tomatillo salsa verde and then use some of it to make these Potato (and chicken) Chilaquiles. If you haven’t made Eggplant Parmesan yet this year this may be your last chance. 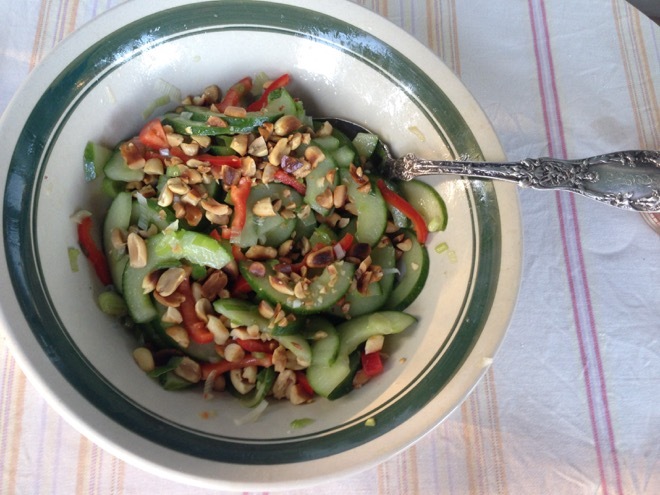 My new favorite cucumber salad includes toasted peanuts and sweet red peppers. 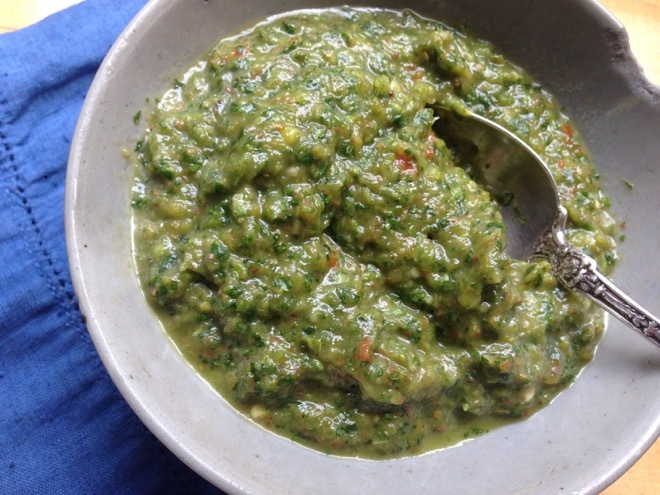 Make this fabulous Green “Harissa” with your Anaheim Peppers and use it with/on everything! 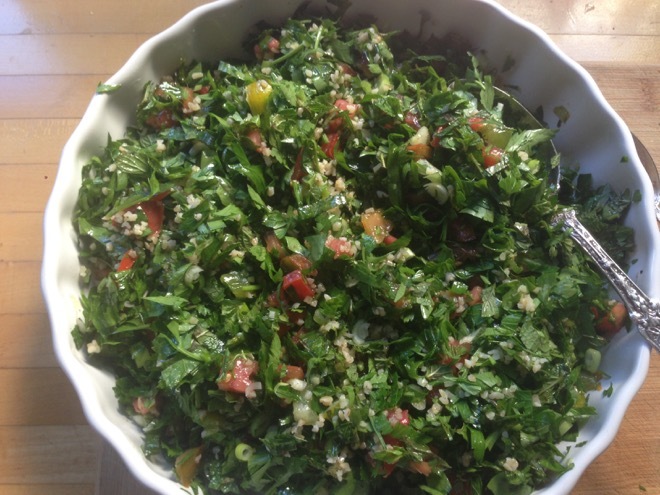 It’s a great week for tabbouleh. The traditional recipes I know of use mostly herbs and just a touch of bulgar, like 6 cups of herbs to 3 tablespoons of bulgur. It’s amazingly fresh and delicious. Find a bunch of mint and you’re set. 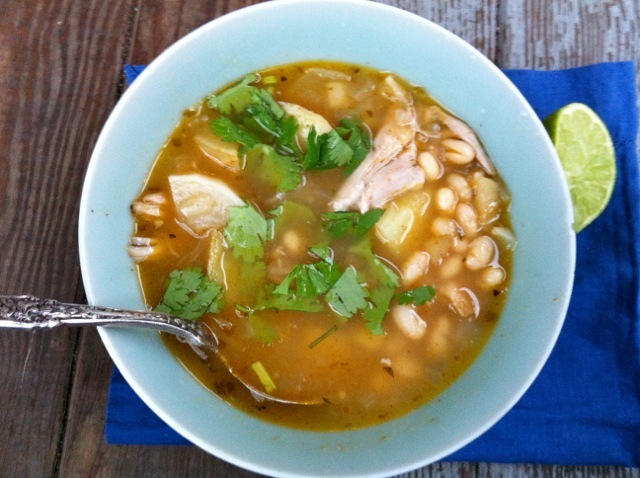 This soup with roasted Anaheim peppers, chicken and potatoes might be a nice thing to make this week before it gets too hot again. 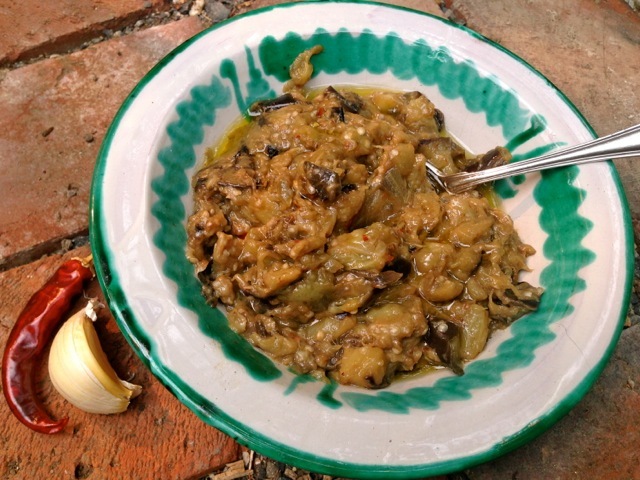 Make baba ganoush with your eggplant and eat it with everything! Or make these delicious sandwiches with one of your eggplants and some tomato. You could use some of your carrots, fennel, potatoes and parsley for these Mustard-roasted Vegetables. 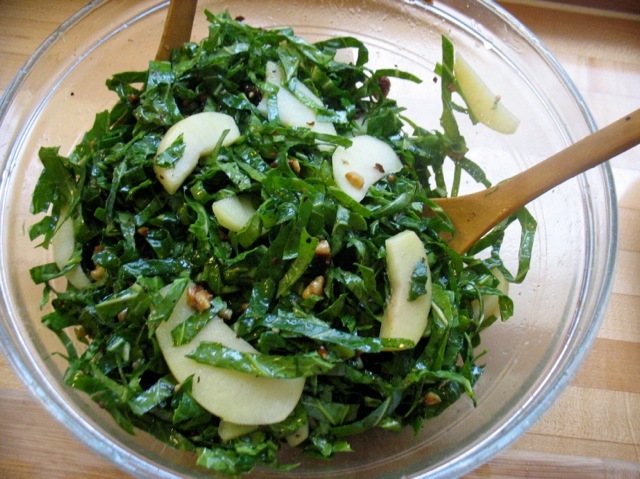 This Shredded Collard Green Salad with Pickled Apples and Walnuts is fantastic. 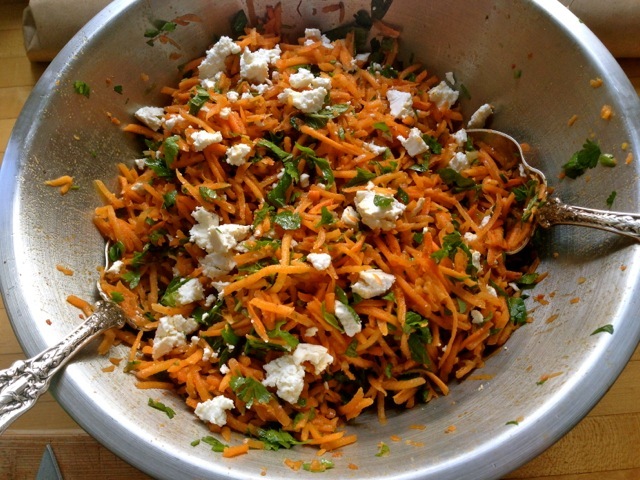 This Carrot, Harissa and Feta Salad might be good this week and feel free to substitute basil for the parsley, listed. Make this beautiful salad of roasted and fresh vegetables and substitute eggplant for the summer squash. Or you could make this pizza with your Anaheims, corn, and some tomato. 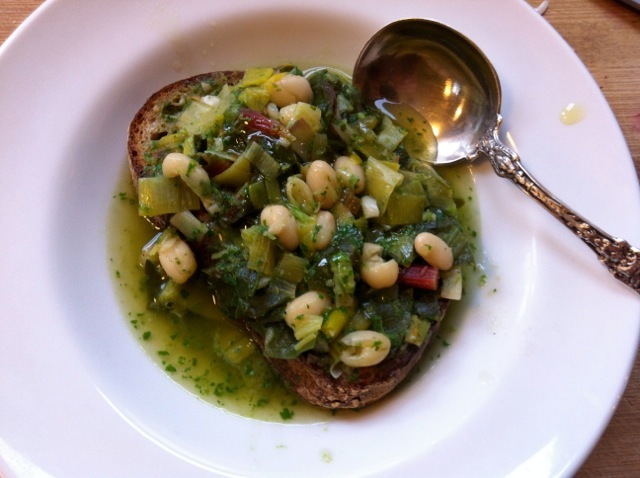 And it’s the perfect time to make my favorite fennel dish, the fennel soffrito. Finally, this Chard, Chickpea and Tomato stew is light but satisfying and perfect for late summer. Grill your fennel and make salsa verde with your parsley and serve it with the fennel or enhance boiled or roasted potatoes or summer squash with the salsa verde as well. 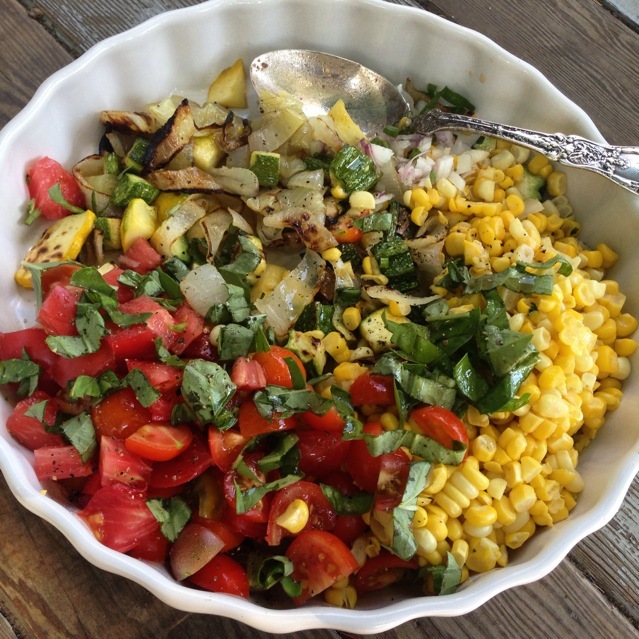 Use your corn and cucumber in this gorgeous salad. 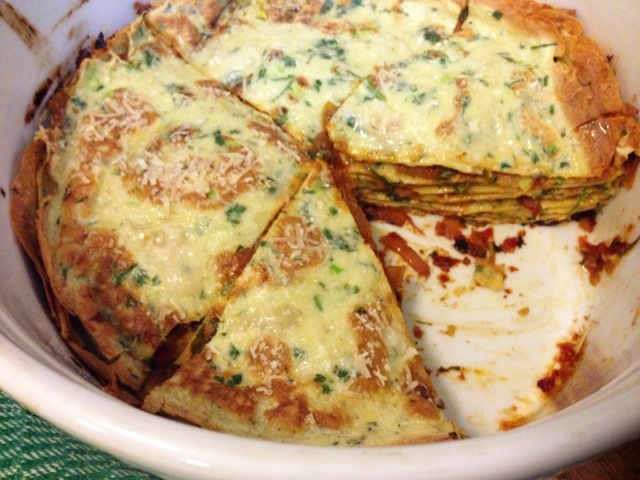 If you want a little bit of a project make this gorgeous and delicious Herb Crepe Cake with Tomato Sauce. It might seem sacrilegious to make a quick sauce with heirloom/stupice tomatoes but with the abundance this year I’m doing it frequently. 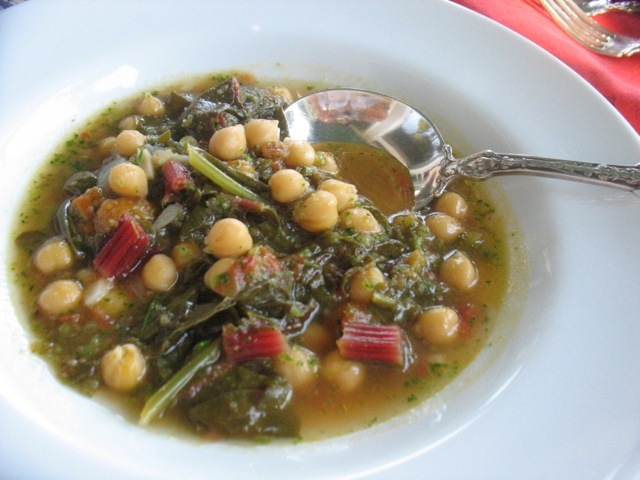 This Chard and Chickpea Stew with Tomato and Cumin is a nice light summer soup for this week. Another hot week calls for salads and minimal stove time. This cucumber salad with mashed garlic and ginger fits the bill. This green bean salad is my favorite new creation in quite some time. Make it and don’t skip the almonds or something crunchy. 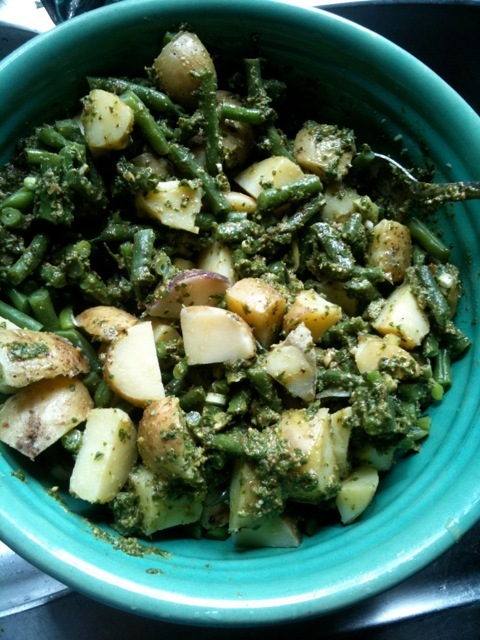 In Italy a dish of boiled potatoes and green beans tossed with a pesto is a classic and might be a good dish for this week. 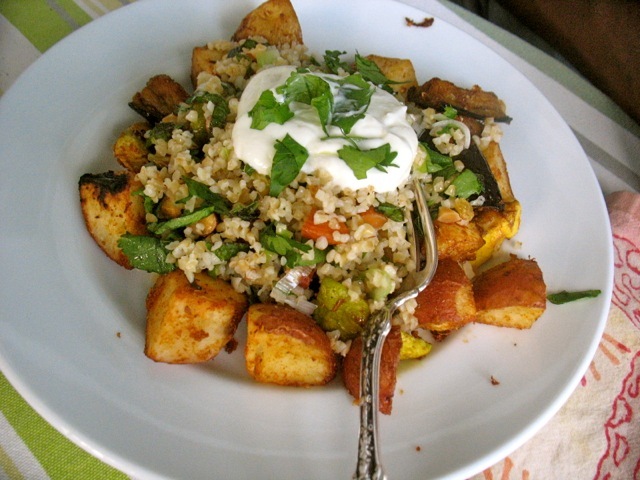 This dish does require a bit of stove/oven time but it’s so good: Eggplant, Summer Squash and Potatoes with Chermoula, Bulgur and Yogurt. Happy Cooking! It’s cooled off enough to make one of my all time favorite soups that uses both chard and cilantro as well as white beans. It calls for leeks but you can substitute some onions. It’s worth making! 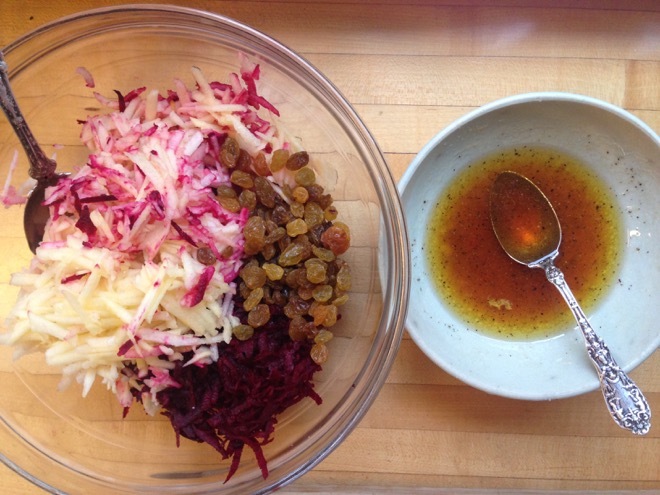 This kohlrabi and fennel salad with golden raisins and lots of lemon juice will be great for this week’s share. It would also be a good week for fish tacos with your cilantro and a another slaw using fennel and kohlrabi (instead of the turnips suggested in the recipe). 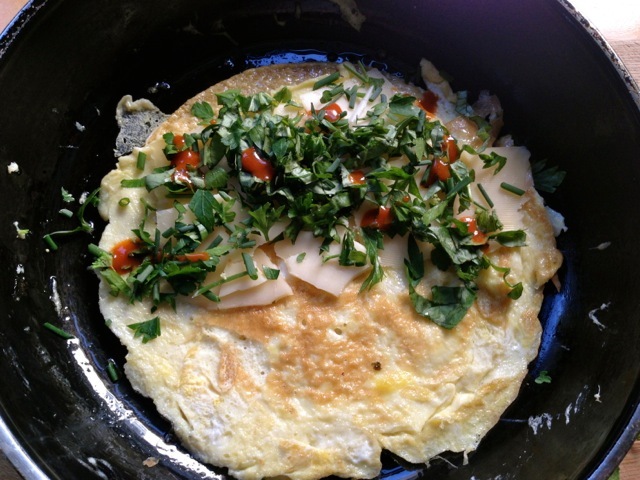 If you need a meal on the fly this week put the cilantro and/or parsley center stage with this quick eggy quesadilla. If you have time saute a bunch of onions and fill the quesadilla with some of those as well. 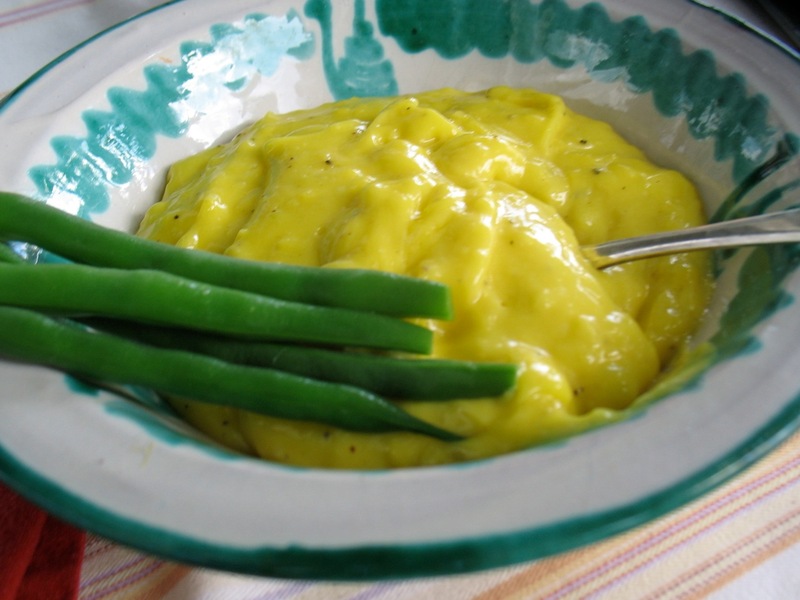 Make a batch of aioli with and cook your green beans for 3-4 minutes in salted boiling water and you’ll have one of the most perfect combinations before you! It’s another hot week! Most of these dishes don’t take a whole lot of cooking time. 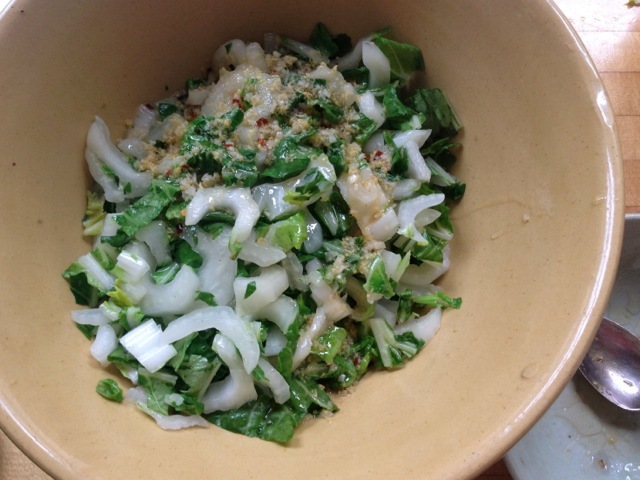 Try this dish of joi choi with ginger dressing. And if you need to turn it into a meal you can slice or crumble a couple of spicy pork sausages and cook them and then add them to the joi choi at the end and serve the whole thing over rice. Use some of your parsley and sweet onion to make this salad. 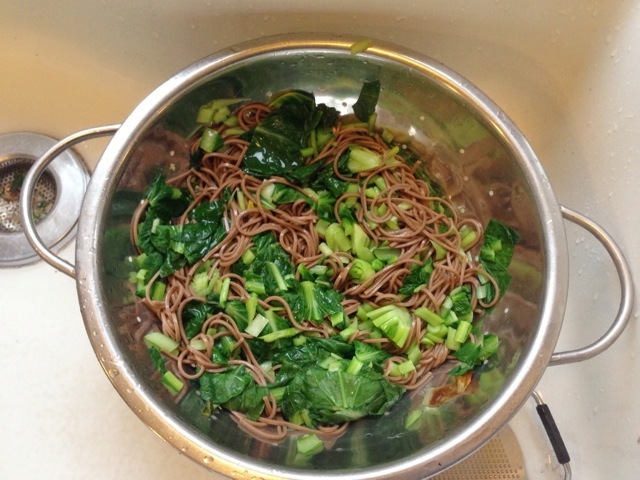 You could use your Asian greens in this cold soba noodle salad (below) and you could substitute thinly sliced kohlrabi for the radish. 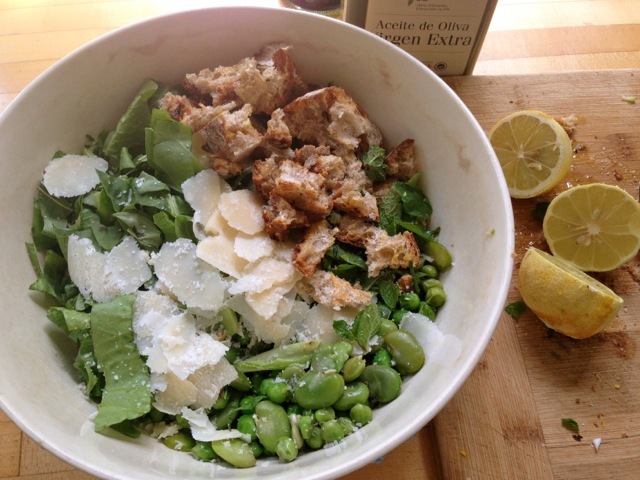 You might make this salad with your fava beans and omit the peas if you don’t have any. 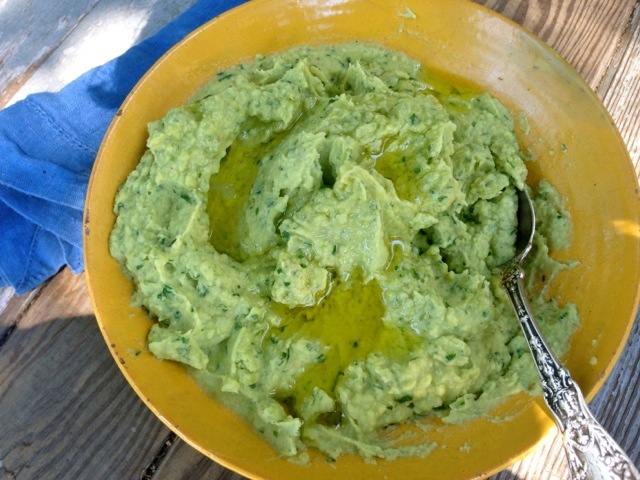 Or make this fava bean “hummus” with your favas and parsley. It’s my new favorite way to each the slightly bigger, starchier beans, later in the season. 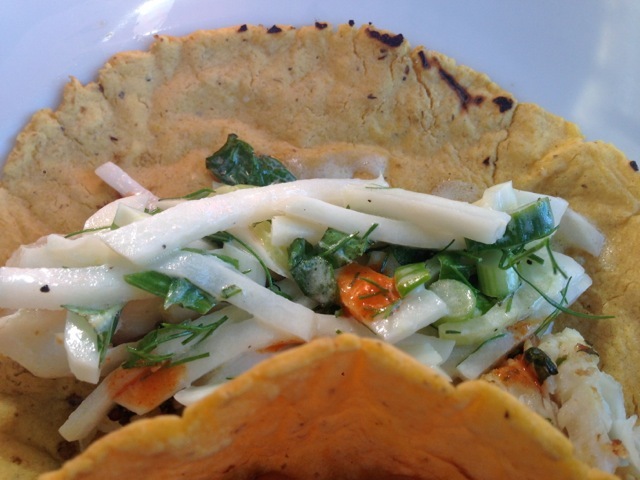 The kohlrabi will make a good, quick slaw for fish tacos. In order to keep up with the lettuce you might check out the “lettuce management” post for dressing variations and a handful of good additions to keep things interesting. If you can brave the heat and have a full share you might want to make Zwiebelkuchen with all your Walla Walla Sweets. This delicious German tart/pizza makes a lot and is a great picnic dish so your time will be well invested. 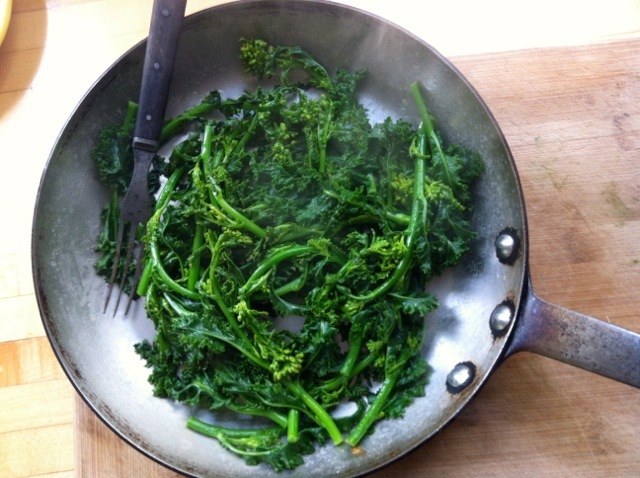 You might make this dish with your Cime di Rapa using some of your Walla Walla sweets and some of your dried cayennes. 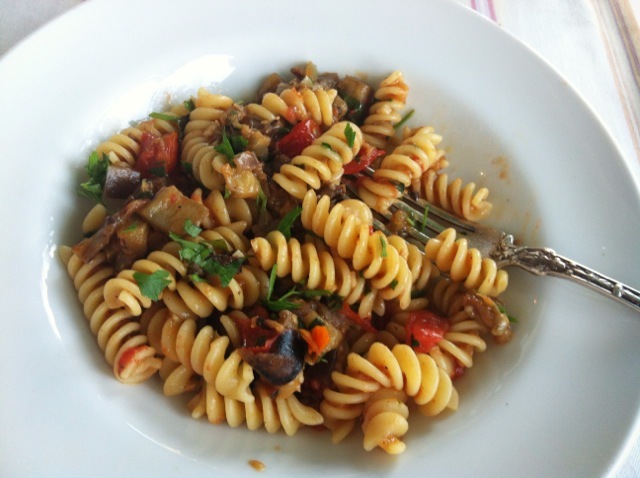 You can serve them as is as a side or toss with Orecchiette pasta for a traditional dish from Puglia, IT. 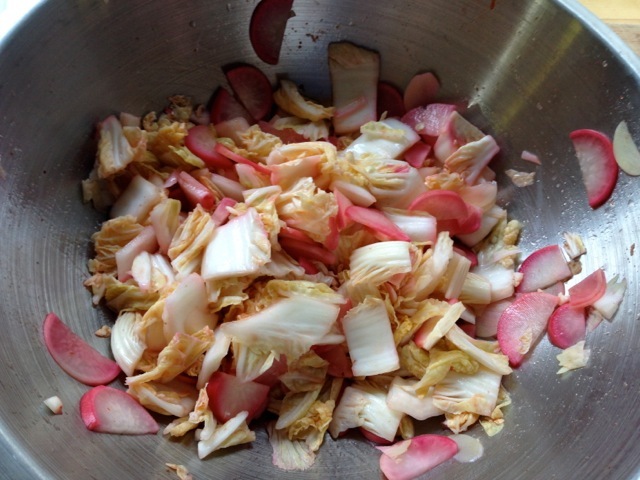 I made this “overnight Kimchi” yesterday by chopping about 3-4 cups of Napa cabbage, mixing it w/ 5 sliced radishes and/or 1 kohlrabi, cut into match sticks, 2 tablespoons rice vinegar, 1 tablespoon Sriracha and 1 teaspoon crumbled cayenne peppers and about 1/4 teaspoon salt. Mix very well and leave it sitting out, tightly covered, overnight. Toss again in the morning and refrigerate. It’s certainly not the real thing (but by all means make the real deal if you have the time) but adds a burst of flavor/spice to many a dish. I had it with a fried egg and toast, for breakfast! 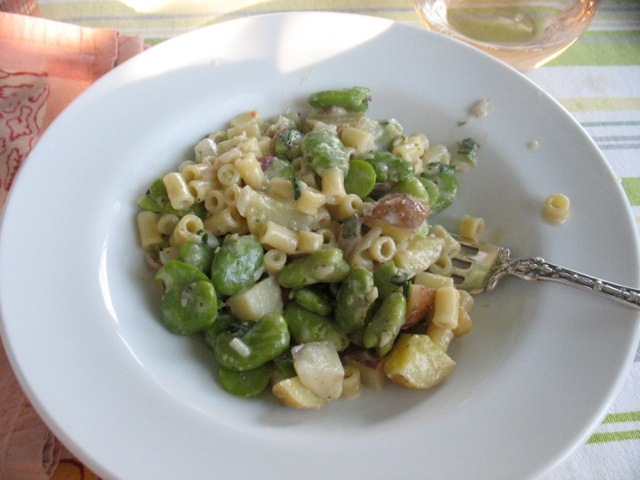 You could make this delicious one-dish meal with fava beans and turnips instead of potatoes. Or make this salad of fava beans, peas and mint. Make these kohlrabi fries with spicy mayo for a nice twist on oven-baked french fries. 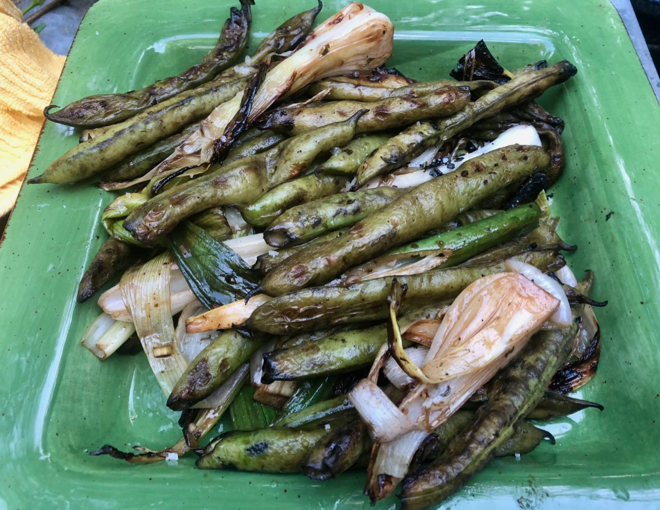 I used to mostly make pestos with garlic scapes but now I broil them and try not to eat them all myself standing at the counter before they ever make it into a dish. 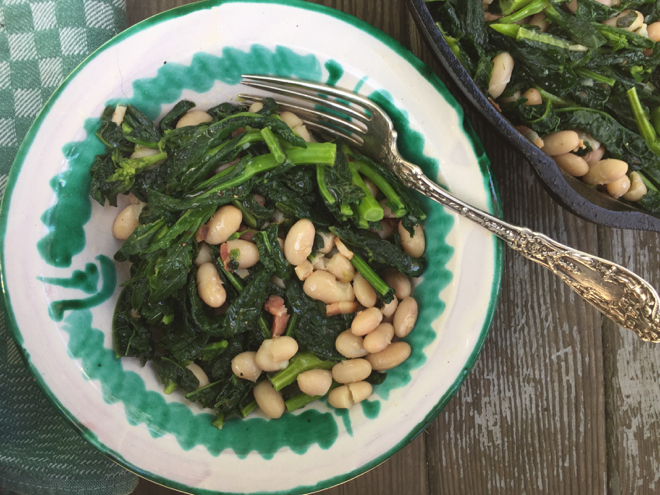 This hearty bean salad is my new favorite foil for the delicious, sweet garlics scapes. You could wilt a bit of spinach or mustard greens and stir those in as well, instead of the herbs noted in the recipe. And by all means use lots of scapes here and use any bean you might have. You don’t need have Corona beans. It might be time for a batch of kimchi to use some of your Napa cabbage. You may still have some dried cayennes from pervious shares to crumble up and use in it as well. 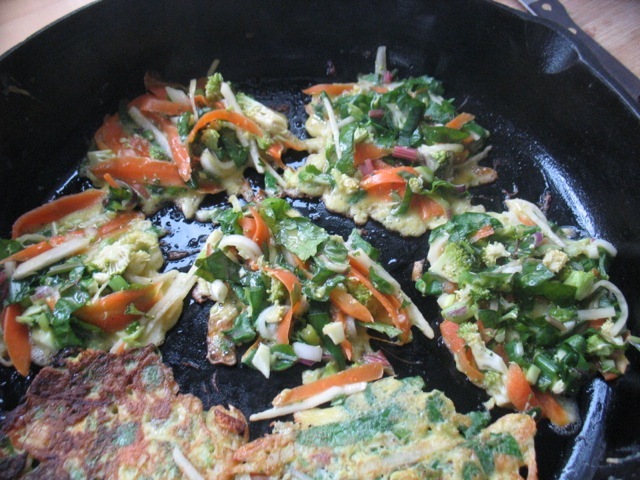 The mustard greens, green garlic (or some scapes) and Napa cabbage would also make lovely Japanese-style Veggies Pancakes. 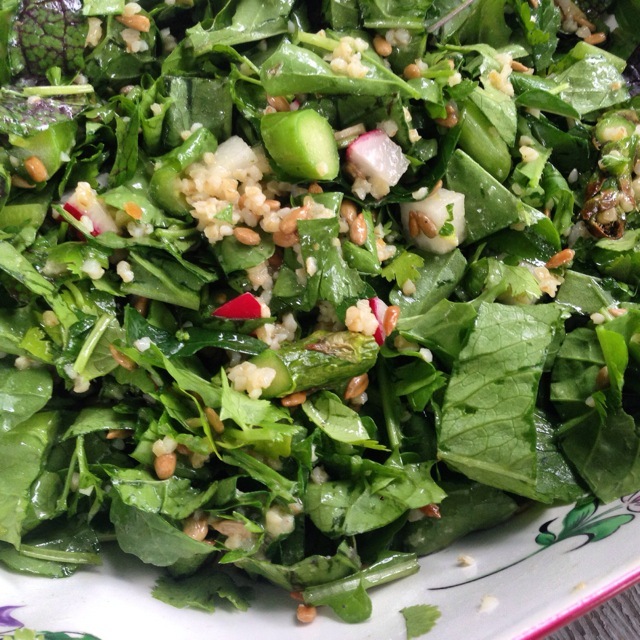 Your arugula, mustard greens and radishes will marry beautifully in this salad with a bit of bulgur and plenty of green garlic in the dressing. And skip the asparagus and use more radishes. I recently added spinach (instead of mustard greens) to my favorite, simple red lentil dhal and it was so, so good. Sounds perfect on these slightly cooler days. With this week’s share you might start by making a jar of vinaigrette with 1 one of your stalks of green garlic, lemon juice or vinegar, some Dijon-style mustard, s & p, a bit of thyme and plenty of good olive oil. Shake it up and keep it in the fridge to use on most anything. 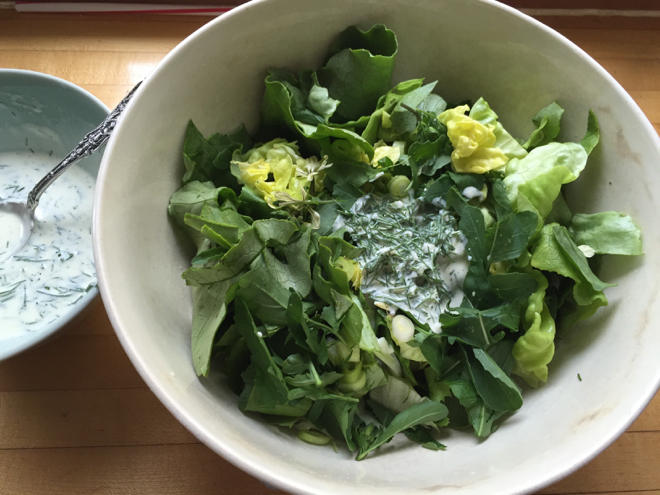 You could dress this mustard greens and chicken salad with it, for instance. Make this frittata with either the turnip greens or the kale or mustard greens. And you could use your copra onions to make this German/Alsatian tart called Zwiebelkuchen. 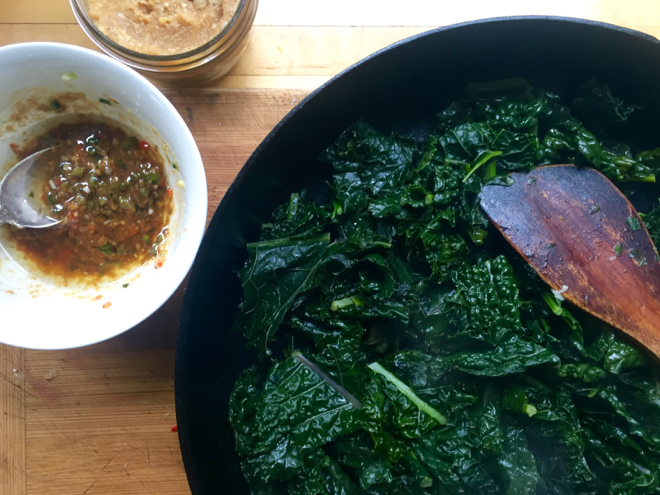 Use your turnip tops and some of your mustard greens and a cayenne pepper or two to make this spicy sauce. You can cook rice in this sauce (diluted with plenty of water) or top a bowl of rice and beans with it or use it with meat or fish or eggs. 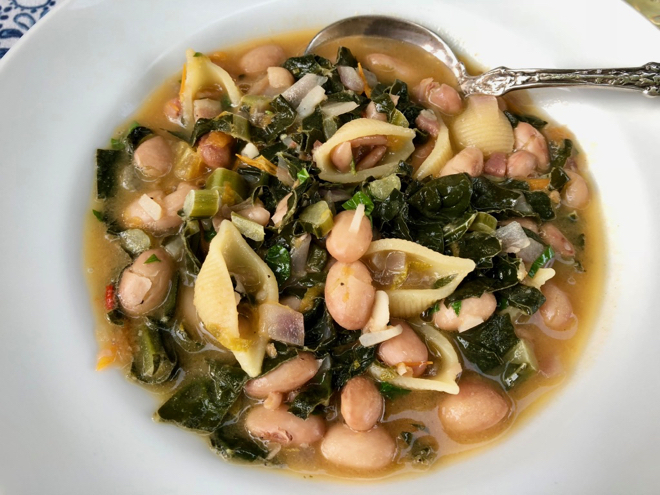 You could make ribollita, the classic Tuscan bean and kale soup with your dry beans and greens or in a completely different vein, but similarly delicious, long-cooked pot of soup, make Gumbo Z’Herbes with the turnip tops, mustard greens and kale and beans. Spring certainly is here–pea shoots, radishes, lettuce, arugula! If you want to make a meal of the arugula you might make this flank steak and arugula salad with radishes. You can use some thinly sliced red onions in it too. It’s promising to be warm later this week and this kale and carrot salad would be perfect as part of dinner or lunches this week. You can crumble up some of your Jimmy Nardello peppers here too. Cook your beans with a chunk of carrot, some onion, a clove of garlic and a bay leaf and then make a soup like this one with spicy sausage, your Jimmy Nardellos peppers etc. 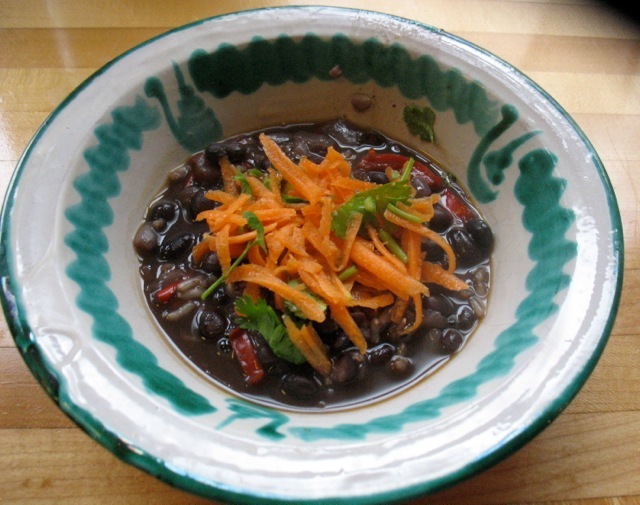 or like this one of black beans, chorizo and pickled carrots. You can make a little garnish of chopped, raw pea shoots mixed with a little minced onion, garlic, lemon juice and olive oil and top any soup with it. 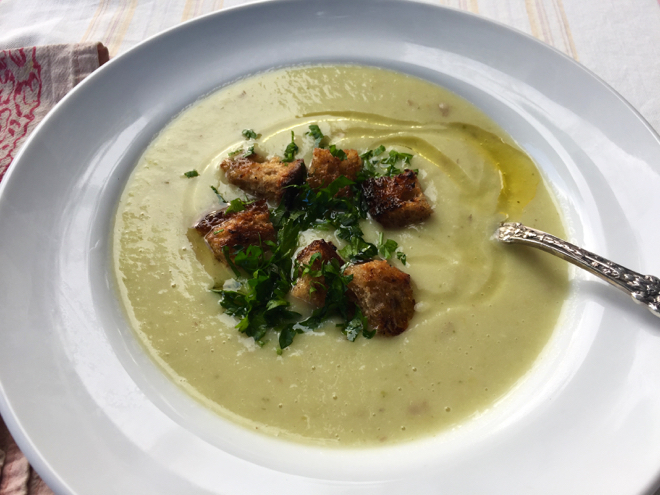 Make this very simple and very lovely cauliflower soup. This adaptable quinoa salad will benefit from your mizuna, carrots, radishes, parsley, red onion and even some crumbled, dried Jimmy Nardello peppers. It is awfully good for lunch the next day too! Sometimes the very simplest dishes as the very best, as is the case with this dish of leeks cooked with butter. I might roast the cauliflower, wedges of red onions and some of the Jimmy Nardello peppers with some olive oil and salt and eat them as is or toss them with plenty of chopped parsley, a little raw onion, olive oil and a little lemon juice. Sounds like a beautiful and delicious pan of food! 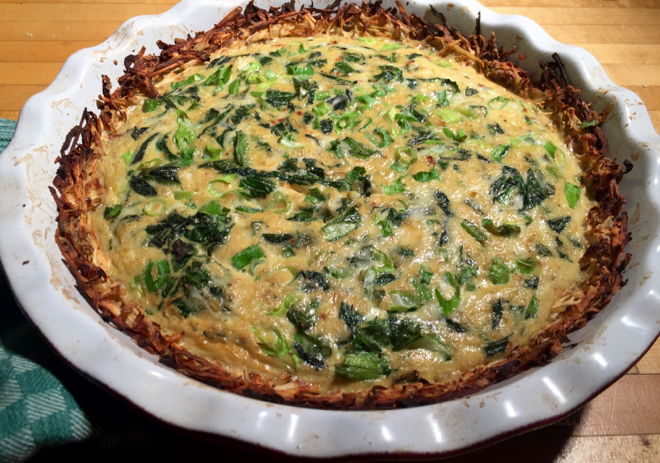 The weather is getting rainier and cooler and this kale and onion panade is a a delicious, dreary day meal. It takes a while to bake so it might be more of a weekend endeavor. 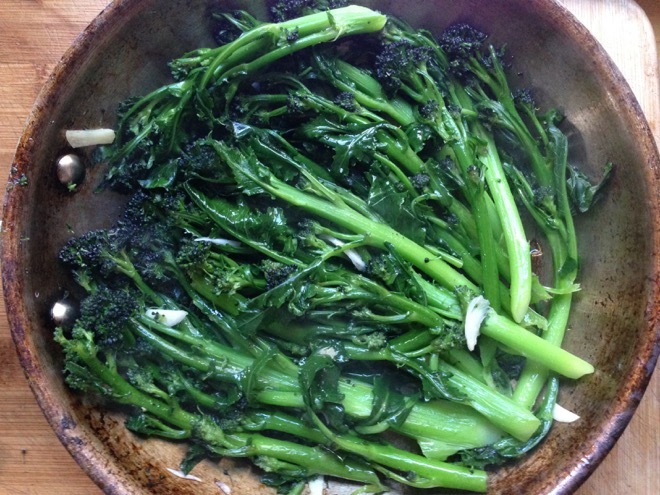 Use your purple sprouting broccoli for this simple and delicious dish that I eat with my fingers, just like asparagus. Your savoy cabbage, parsley (instead of cilantro as noted in the recipe) and some crumbled cayenne pepper could make this quick slaw (and skip the tatsoi). You could use some of your leeks to make this Stovetop Scalloped Leeks & Potatoes but use some parsnips in addition to or instead of potatoes. It will cook more quickly than with potatoes and you might reduce the liquid a little so you don’t end up with soup, though that might be good too. 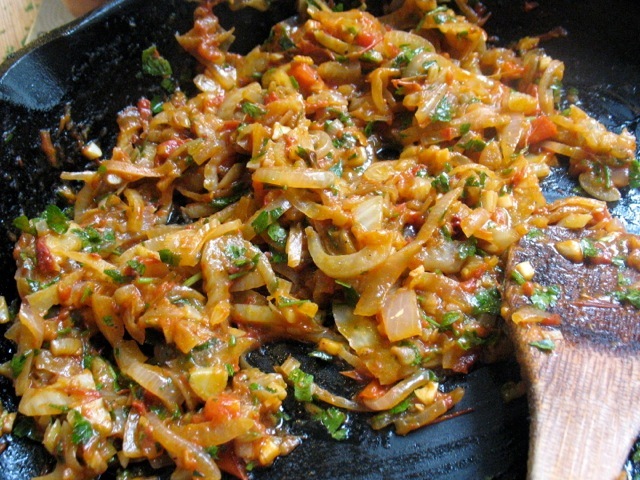 Make this dish of onions (or shallots), collard raab and hot peppers. You could add a leek here too and you could toss it with pasta or other grain to make a full meal. If you have collard greens in your share (or actually it might work just fine with collard raab too, if that’s what you have) you could make these beautiful fritters. And while you’re at it make a batch of harissa with your cayennes and some roasted, sweet peppers and tomatoes. Make a nice spicy bean soup with some of your cayennes and add carrots, parsnips (diced small). 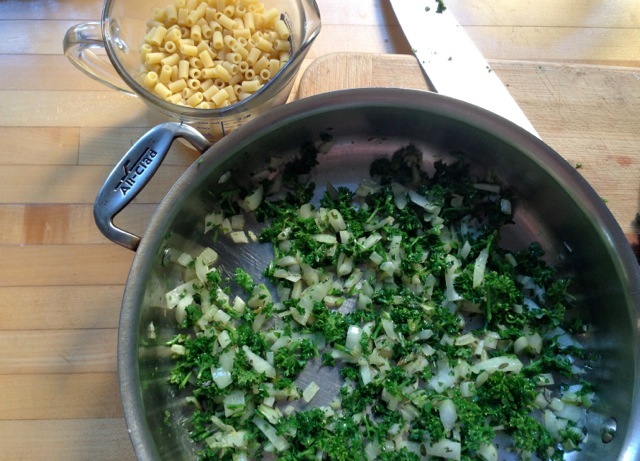 Finish with a little parsley garnish of garlic and minced shallot and lemon juice and olive oil, kind of in this vein. Your slender leeks this week will make a beautiful Leeks Vinaigrette, a classic French dish of cooked leeks dressed with a vinaigrette with mustard and shallots. 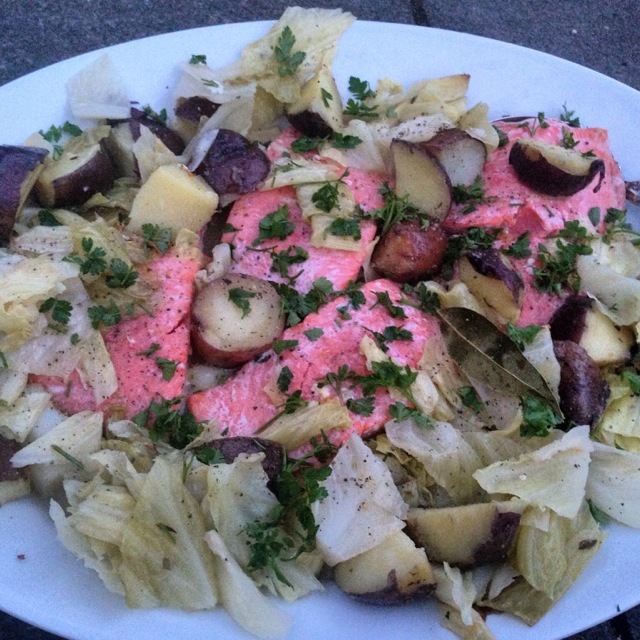 You can use both your savoy cabbage and some of your potatoes in this beautiful dish of braised cabbage, roasted potatoes and salmon. And even without the salmon, the veggies make a wonderful hearty side or main with a fried egg or some such. 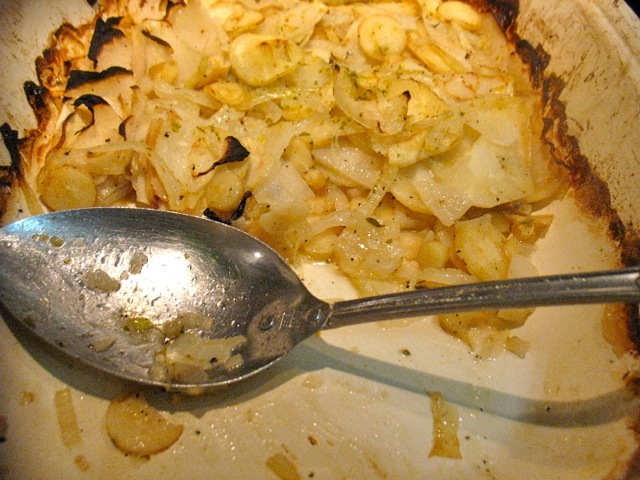 Your parsnips, potatoes and leeks would all be happy in this gratin. 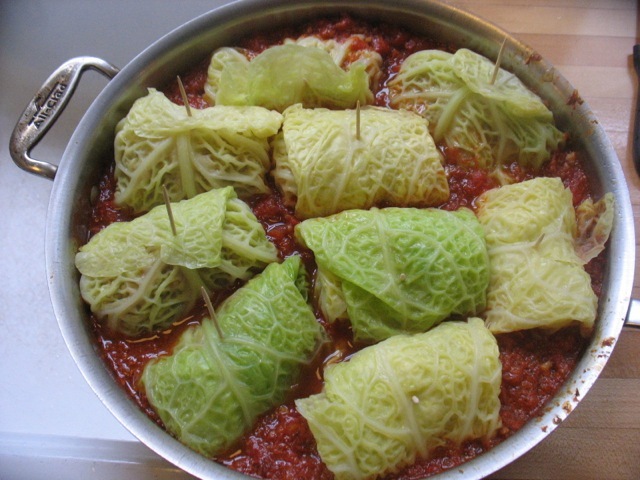 If you have the time make these wonderful cabbage rolls with your savoy cabbage. It makes a lot and you’ll enjoy them for days. I’ve been on a bit of a harissa kick these days and this simple dish with raab, harissa and feta is delicious. 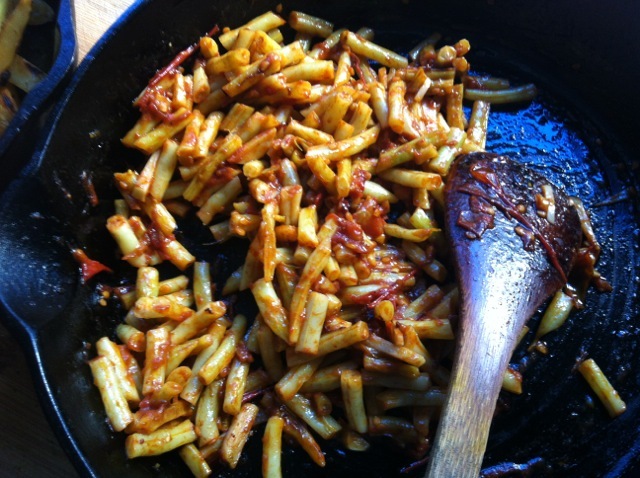 And if you don’t have harissa, some chili flakes and good olive oil are a good substitute. And make this onion jam with some of your red onion bounty and improve everything it touches. 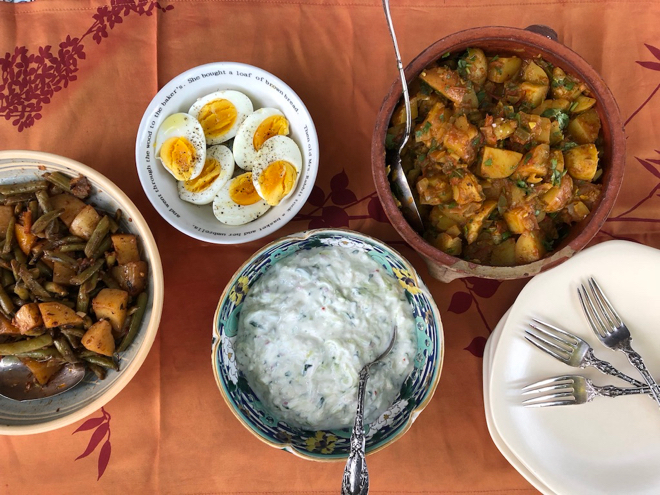 With your winter squash–you could add potatoes and carrots too and even onion chunks–you might make this dish of spiced winter squash with spicy yogurt and cilantro sauce (which I will miss mightily when squash season is over). And you can clean and then roast some of your squash seeds for the garnish. You get purple sprouting broccoli this week! I have so many favorite things to do with it so check out the whole page but I think I’d be inclined just to blanch it for a minute or two in lightly salted boiling water and then drain and sauté it with a bit of garlic and red pepper flakes and serve drizzled with good olive oil. Simple is nice when it’s the first of the year! 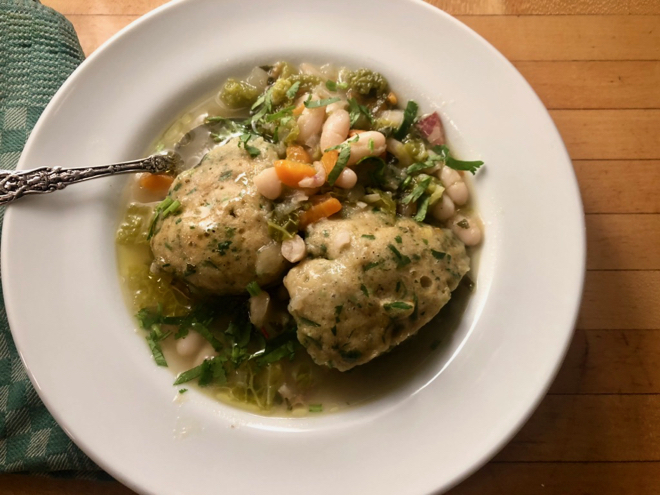 Some of your leeks and savoy cabbage would be perfect in this hearty dish with beans–one of my favorite dishes this winter. I just made this spaghetti squash dish with mustard greens and a little bacon and you could use your collard greens here instead if you were so inclined. You would want to blanch the collards in lightly salted boiling water for a few minutes before adding them to the pan since they are not quite as tender as mustard greens. 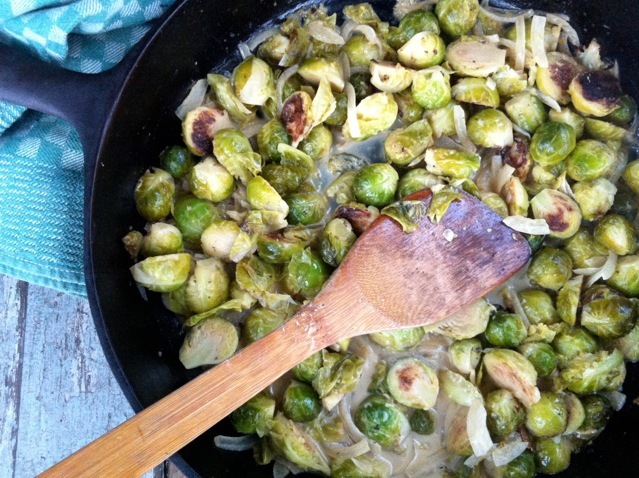 Use some of your shallots and Brussels Sprouts for this dish that I’ve highlighted before but it never fails to please. 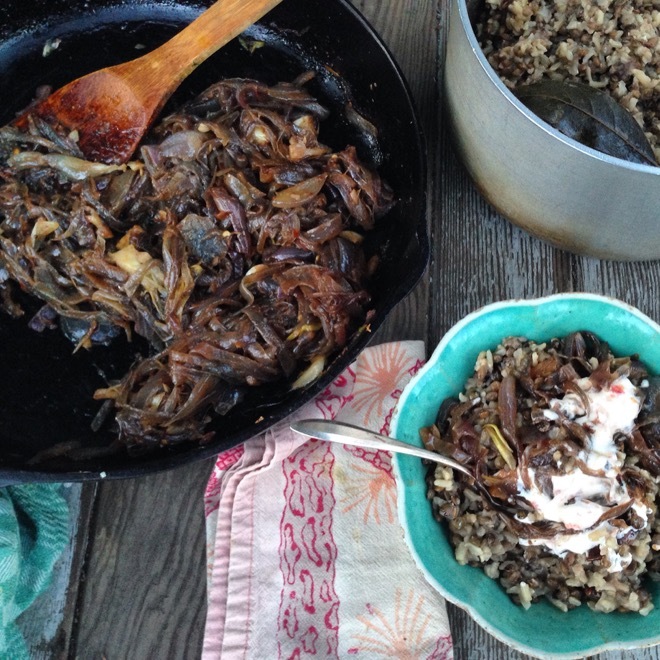 You might make the Braised Shallots with your bounty this week. 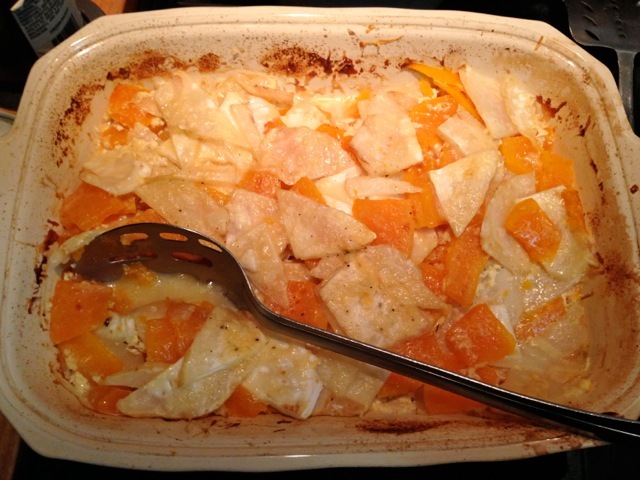 This gratin of celery root and winter squash takes advantage of two vegetables in your share with great results. And you can substitute rutabaga for the celery root, if that’s what you’re getting. 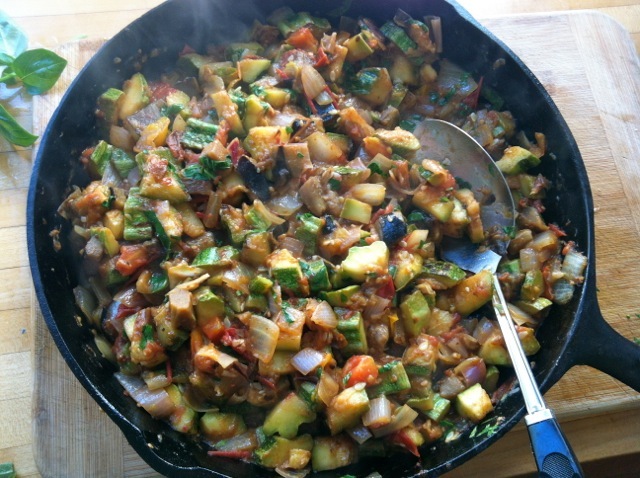 And this “caponata” made with winter squash instead of eggplant is delicious and it uses red onion and plenty of garlic. 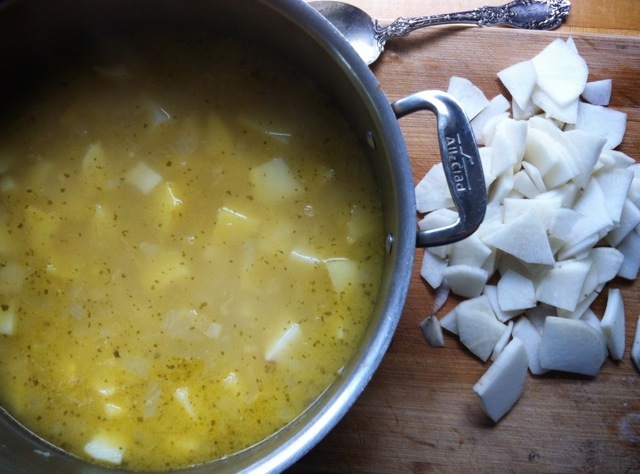 A good dish for your rutabagas and parsnips is this warming white chili. I’ve been making lots of slaws lately so you might turn some or all of your cabbage into this one or some variation there of. You could add some of your kale or Brussels sprouts thinly sliced, as well. 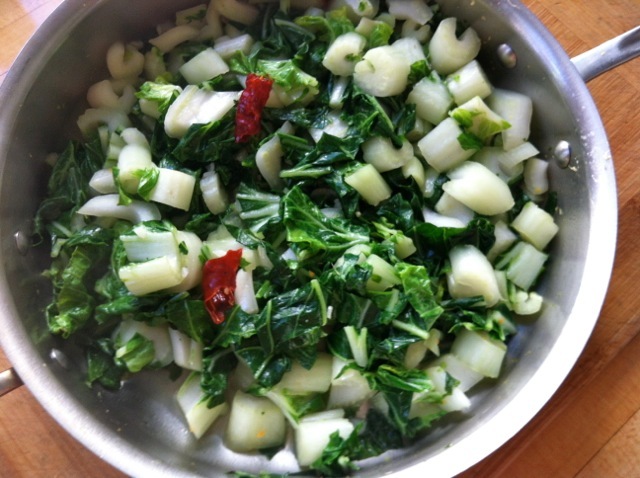 Make this dish with your collard greens and cippolini onions for a very flavorful side dish or a top it with an egg and make a meal of it. I enjoyed it this week with leftover cold salmon and aioli. 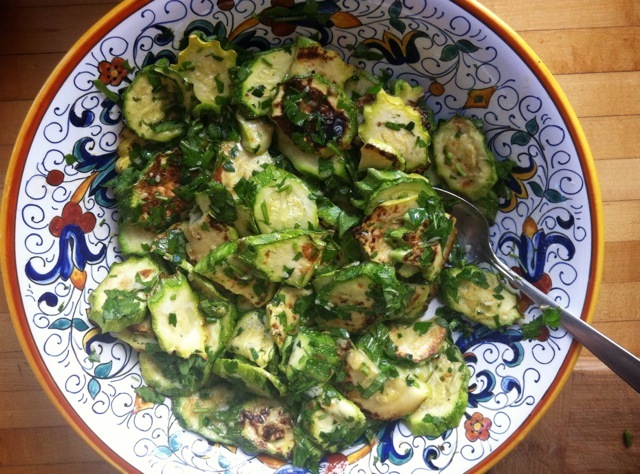 And if your stalks of Brussels sprouts happen to still have the tops on, use them in this dish too. 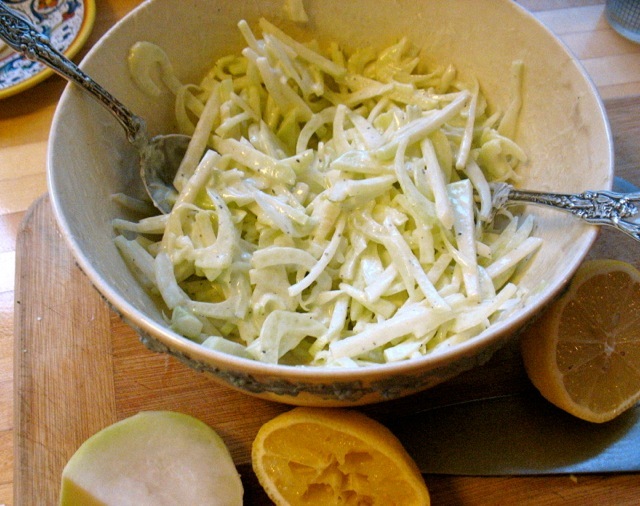 With your giant kohlrabi you can work your way through the kohlrabi section on this site but you might start with this slaw/salad and I’ve been using the dressing on all sorts of other things–it would be wonderful tossed with steamed or roasted brussels sprouts or boiled potatoes. If you get a butternut squash in your share by all means make this dish of roasted squash and onions with a lemony tahini sauce. And you might quickly pickle one of your cippolini in red wine vinegar–a perfect complement to the richer, sweeter winter dishes. A good number of your leeks could be used in this very satisfying dish of chicken with leeks and lemon. You could use some of your garlic in this vibrant dish of roasted Brussels sprouts and a Thai-style dressing. 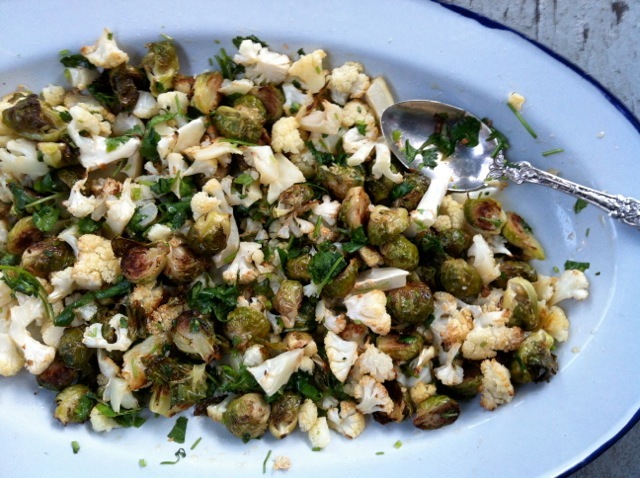 Just use Brussels sprouts but if you have any cauliflower it’s a lovely combination. If you per chance have any black radishes leftover make this delicious pureed soup with potatoes. Now for this week’s mega share. . . The mustard-braised Brussels’ Sprouts are fantastic. Combine your kale and some of your cabbage for this hearty side dish–use red pepper flakes or a bit of smoked paprika if you don’t have Aleppo pepper. Make Mojadra the wonderful Indian lentil and rice dish elevated by caramelized onions for which your cipollinis will be perfect. And these mashed roots will take care of your rutabaga, parsnips and/or potatoes and soak up juices or sauce from any neighboring dish, particularly beef or lamb. 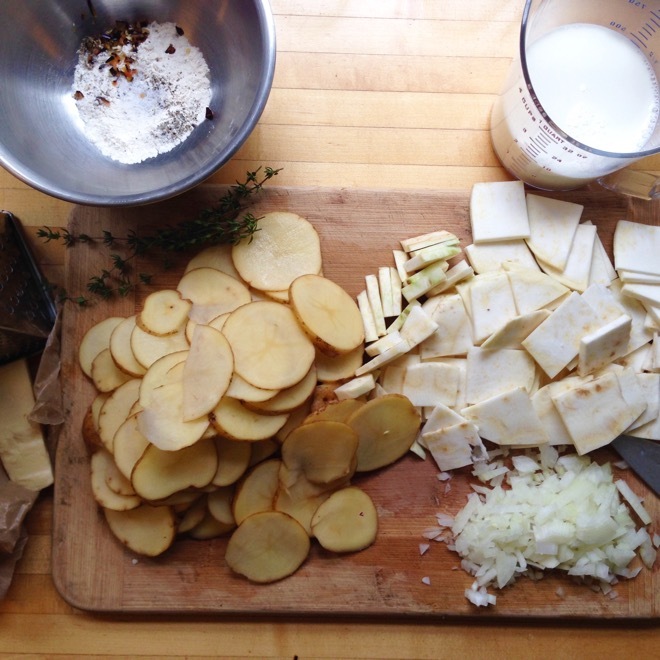 Or make rutabaga and parsnip latkes! Finally, make this Weeknight Vegetable Curry with Red Lentils and Coconut Milk with some of your winter squash or pumpkin, cabbage and onions. And you’ll have enough leftover to look forward to for your lunch the next day. This simple dish of roasted black radish coins is delicious and inspired by Chef John Tabaoda of Navarre and Luce. 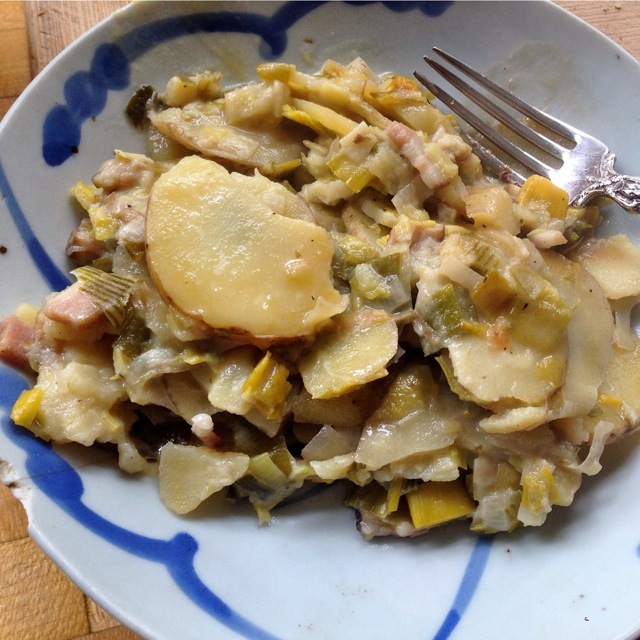 I just tested two new kohlrabi dishes with (a part of) one of the giant kohlrabi you received–both delicious. 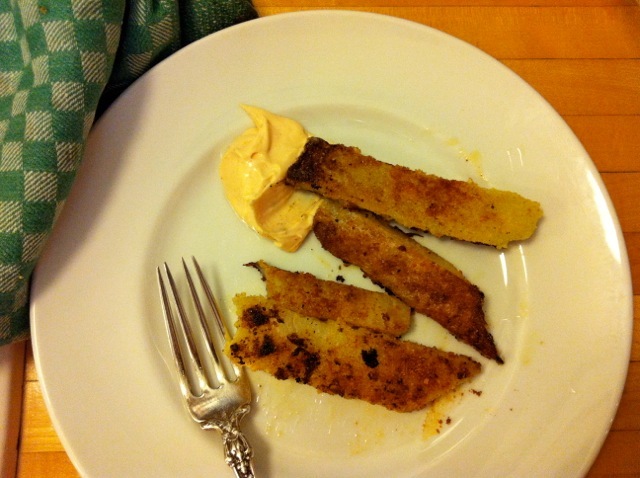 These Kohlrabi Fries with Spicy Mayo are fairly quick and addictive. And a kohlrabi slaw with a bit of carrot and dressed with harissa and feta is excellent. I recently made this Turkish-style leek, carrot and rice dish and it’s hearty enough to just be accompanied by a celery root remoulade or mash (simply boiled or steamed and then mashed with a bit of butter and cream, a dash of nutmeg and salt) for a light supper. 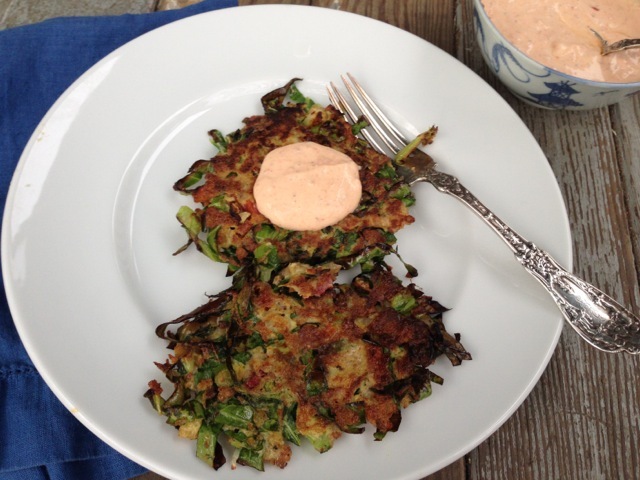 Use some of your huge, sweet kohlrabi to make these fritters. Or sauté diced kohlrabi in a bit of olive oil for a few minutes, add a splash of water and continue cooking until tender. Add a few big spoonfuls of sour cream and a handful of chopped dill and plenty of salt and pepper and cook for another minute or two. Serve over rice. Like Laura, I love cabbage this time of year and with your beautiful savoy cabbage you can make these extraordinarily good cabbage rolls. There a bit of a project but the recipe makes a lot and they keep well and they’re so beautiful. And there are many more cabbage recipes in the collection that are a bit simpler. And you could make this dish of Collard Greens, Winter Squash and Bacon. Happy Winter Share everyone! And what a start of the season it is. . . The gorgeous celery stalks can take center stage in this Celery Salad with Anchovy Dressing (you may want to peel them to remove any strings first) or can be used in this wonderful dish of sautéed Celery with Tomatoes and Parsley or in the classic Ribollita with your kale and you could add some fennel instead of the carrot. 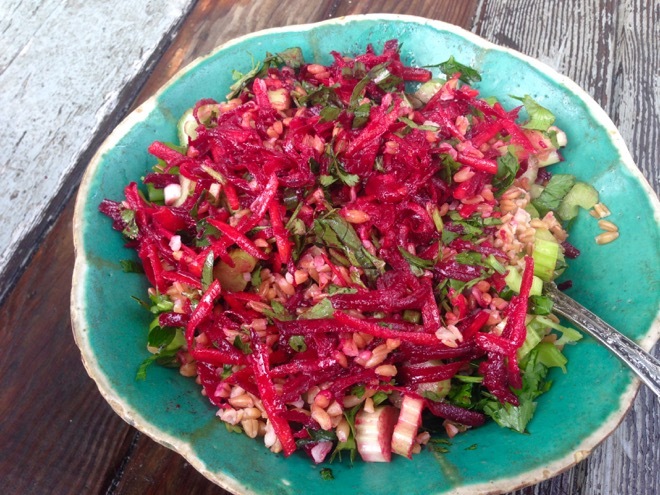 Finally, on the celery front, you could make this Beet and Celery Salad but substitute fennel for the beets and slice them thinly or just use more celery or celery and kohlrabi. 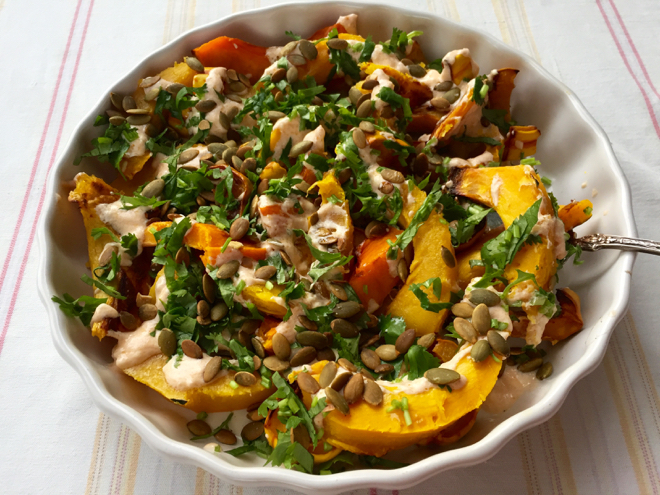 You could of course make pumpkin pie or make a savory dish with the pumpkin and/or the delicata, this Spiced Squash with Spicy Yogurt Dressing and Cilantro (can sub parsley). Make chimicurri with your parsley (add some oregano and cilantro if you can) and use it on most anything. I’ve been dressing cooked beans with it, roasted winter squash, kohlrabi and cabbage slaws, stirring it into eggs or using it in tacos. It keeps well in the fridge so make it and don’t worry about exactly how you’ll use it. 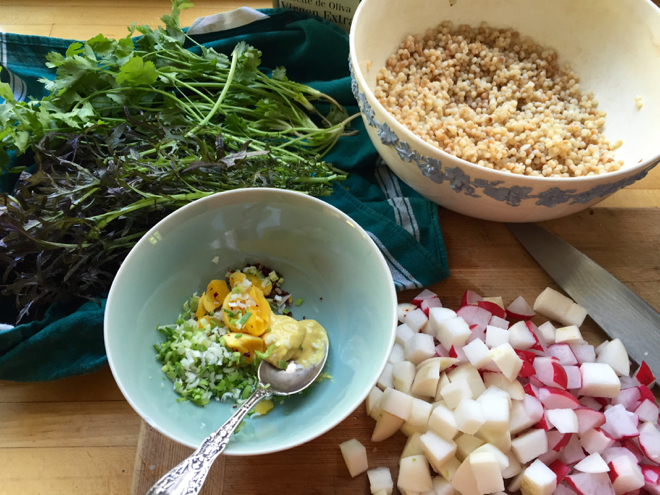 Use your rutabaga, more celery and parsley in this Quinoa, Parsley and Roasted Root Vegetable Salad. 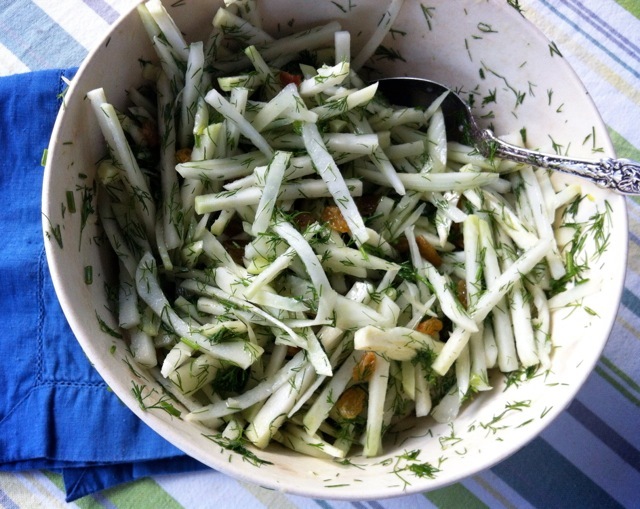 Kohlrabi and Fennel Salad is a wonderfully bright salad that would be welcome at Thanksgiving or any other time really. 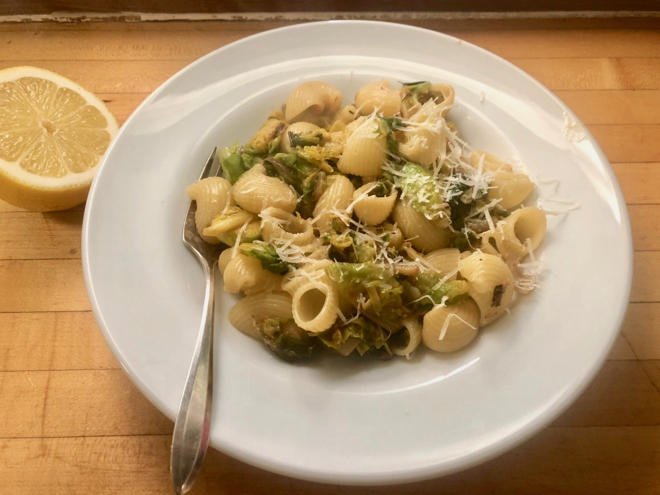 And for a quick weeknight dinner make this one-pot pasta dish with delicata, kale, fennel or kohlrabi or whatever you want to add. It’s quick and delicious. Roast some thick onion slices with olive oil, salt, a little thyme or rosemary and enjoy as a side or top a pizza with them, etc. Happy cooking and happy almost Thanksgiving! 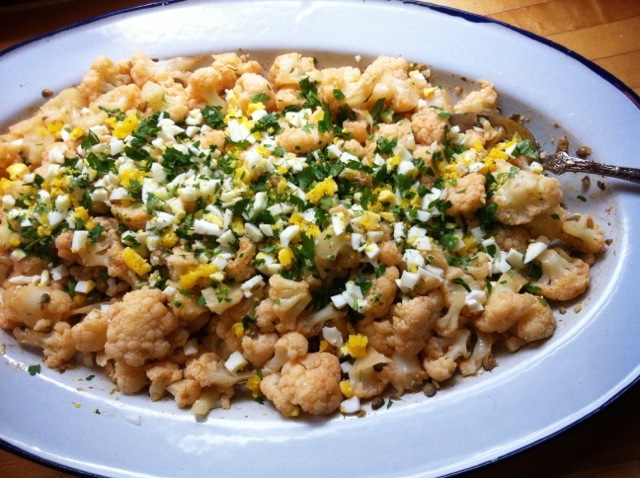 Make this vibrant dish with just cauliflower or cauliflower and broccoli. It’s ridiculously good. Make homemade harissa with the last of the peppers and toss with with roasted fennel or make a pasta dish of the spring raab and toss in a bit of harissa, plenty of Parmesan and some more olive oil, or make a kale salad and dress is with harissa, toasted walnuts, olive oil, lemon juice and more garlic and lots of parsley. 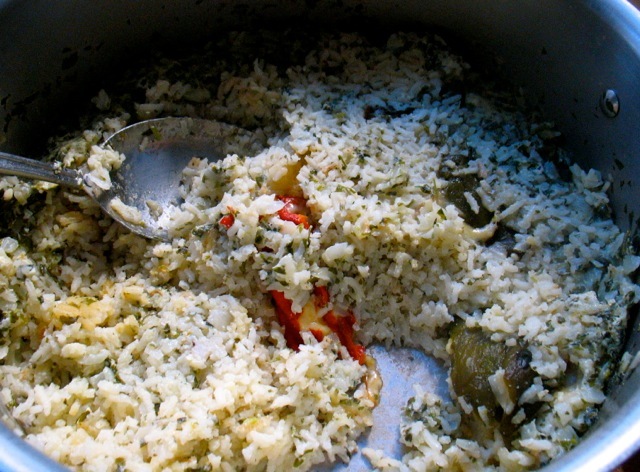 This Green Rice with roasted Anaheims also uses a whole bunch of parsley and is a perfect cool-weather one-pot meal. 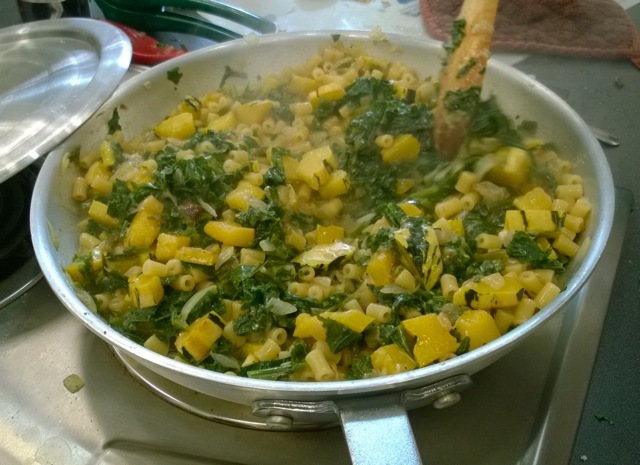 The delicata squash, fennel and some kale would be wonderful in this quick one-pot pasta and veg dish. The peppers and the sun have stuck around for a long time this season which has been a culinary boon. Make this simple Italian chicken and sweet pepper dish and by all means add a jalapeño and/or anaheim to the mix for a nice twist. And so you can enjoy the color and flavor of those sweet peppers long after the rains do finally come, make these simple pickled peppers–you can use a mix of sweet and hot here too if you’d like. You can go through a lot of fennel in this luscious browned, then braised dish that you serve tossed with pasta or as a side. 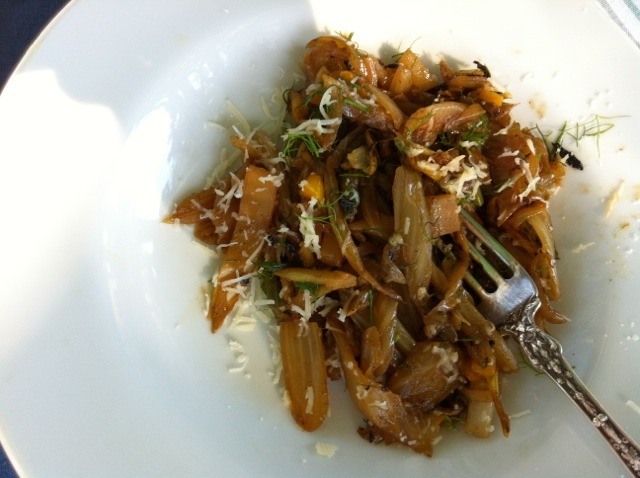 Or make this caramelized fennel dish with goat cheese and dill. 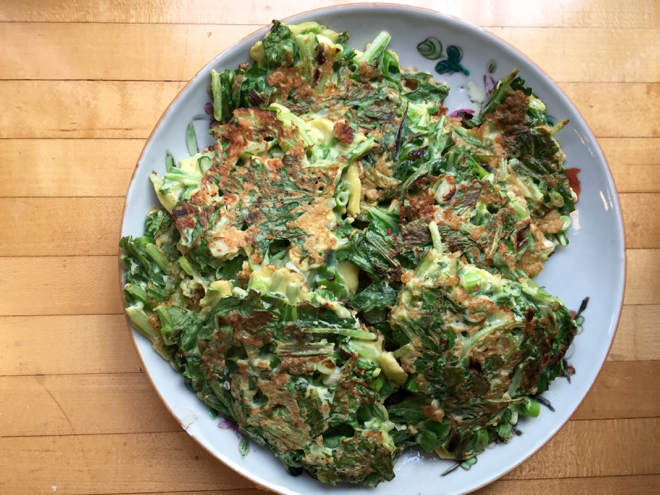 I made these Japanese Cabbage Pancakes this week with a mixture of mustard greens and cabbage and they were superb. Use some of your jalapeños to make this delicious pumpkin seed sauce with chicken shrimp or roasted vegetables. 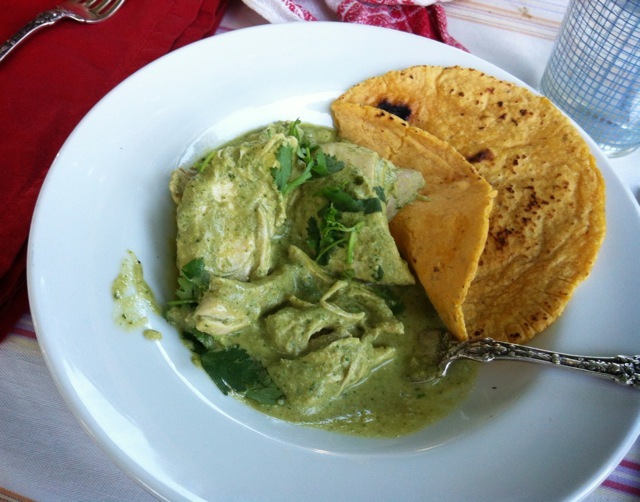 You can add a few tomatillos to the sauce as well–just toss in 3-4 in the blender with the other ingredients. I love this time of year when we still have lots of sweet and hot peppers that remind us that summer isn’t quite gone yet. I’ve been mincing up a bit of jalapeño and adding it to most everything I make these day, soups, salads, eggs, beans, etc. If you still have some tomatillos left (or get more) you might make another round of this very simple and delicious green salsa. 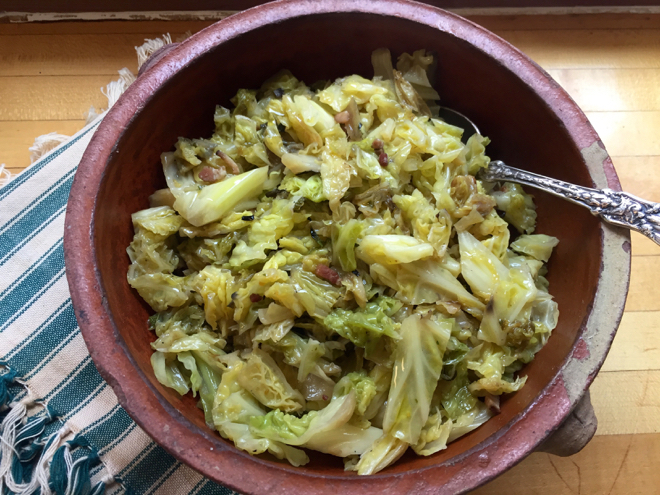 With your dill, fennel and napa cabbage you can make a wonderful variation of this Fennel and Kohlrabi Salad–the Napa is a great substitute for the kohlrabi. Sweet Jimmy Nardello peppers call for pizza, maybe with some sliced fennel and pork sausage. 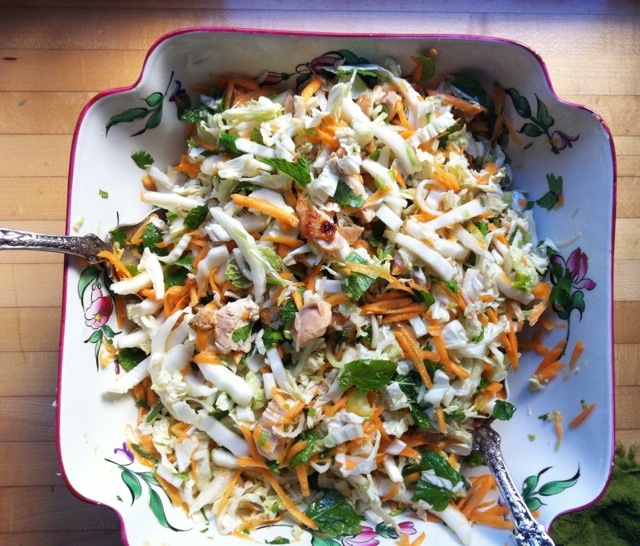 This Vietnamese-style Napa Cabbage and Chicken Salad is a delicious meal in one. This Green Rice would be perfect for your Anaheim’s though you’ll need to pick up a bunch of parsley for this one and if you don’ have enough Anaheim’s use Sweet Italian peppers and add some minced jalapeño to the onion mixture. 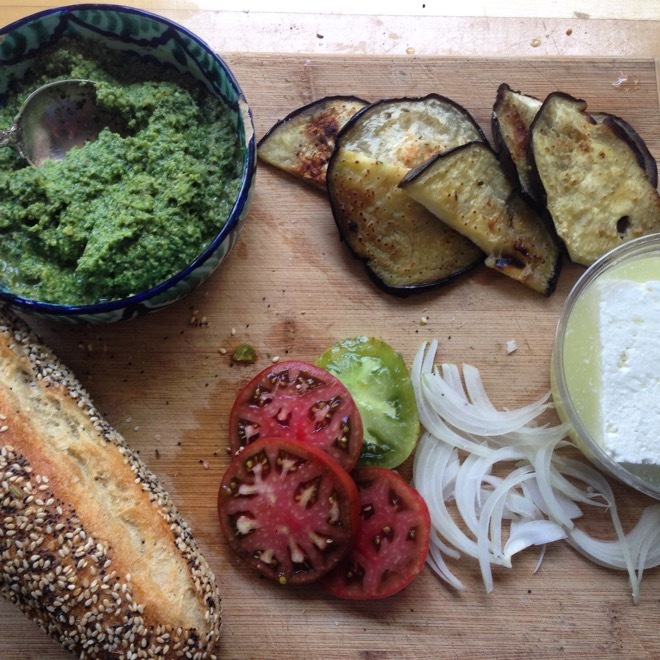 I had a delicious appetizer of cilantro and pumpkin seed pesto served on thin rounds of daikon last week. 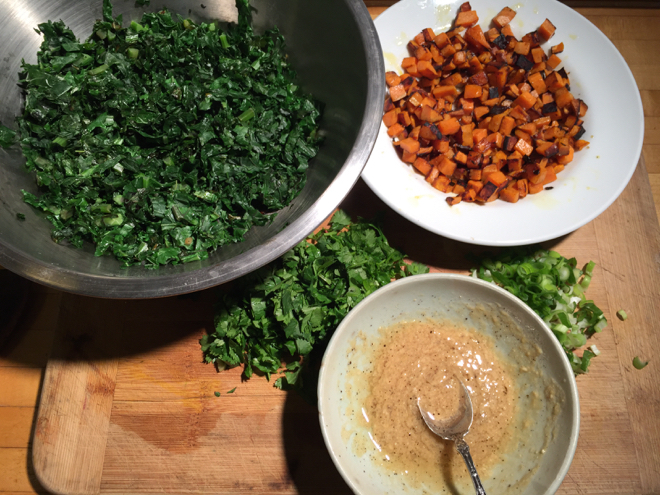 You could use this toasted pumpkin seed and cilantro sauce but I would omit the yogurt in the recipe and use a bit less oil to make sure it’s nice and thick. The sauce would also be good on sandwiches, in tacos, etc. I do not have a daikon page on this site but will rectify that shortly. This large, crisp white, winter radish is fairly sweet and dense. It’s a classic ingredient in kimchi and is wonderful in salads and as a snack. 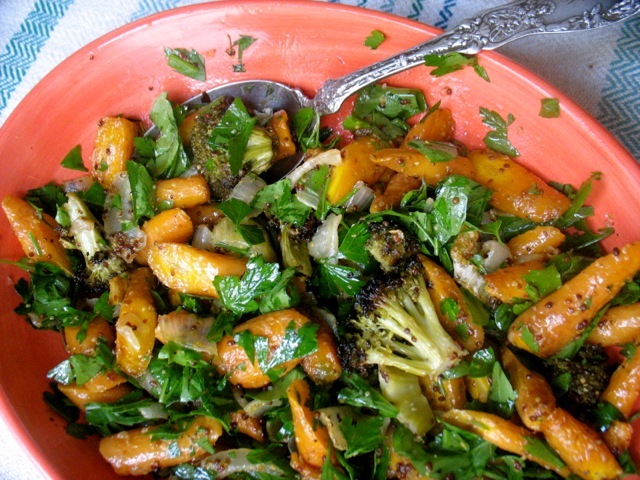 You could make this salad and use half carrots and half daikon instead of just carrots. And use cilantro and some minced hot peppers too. I’ve been experimenting with Pipian’s, mole like sauces form various regions in Mexico. 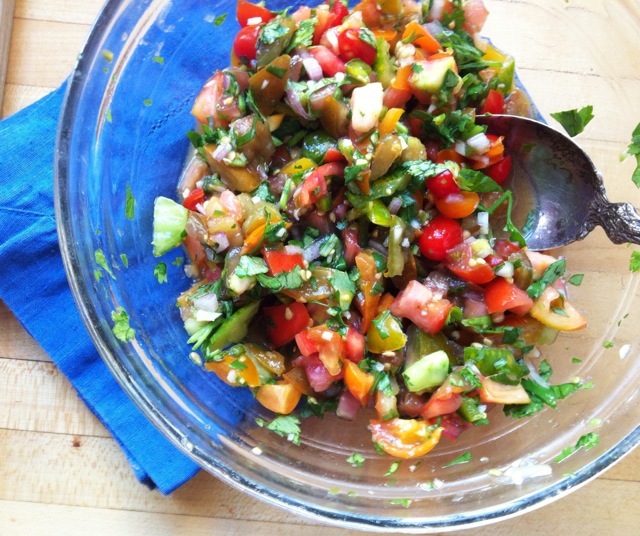 This is a simple and absolutely delicious one that uses the cilantro and hot peppers in your share this week. This quinoa salad would be great with both sweet and hot peppers, tomatoes and even some grated or diced daikon this week. If you have Mizuna this week make this salad with tomatoes and toasted bread. It’s a perfect season straddling, robust salad. 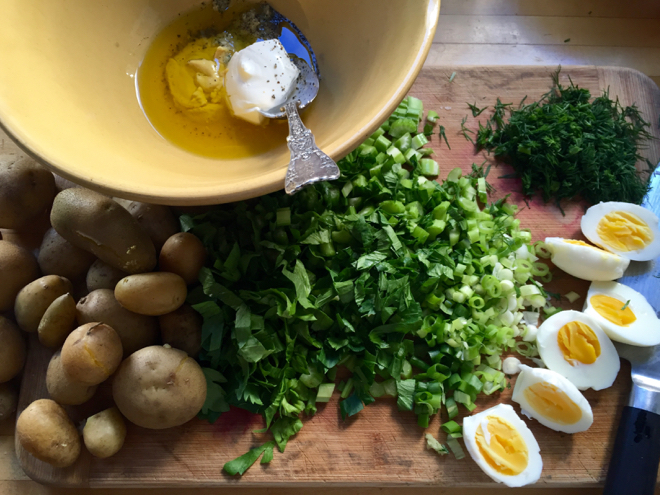 The dill and potatoes in this week’s share will combine beautifully in this salad or this one, with the addition of some sweet onions (instead of red as the recipe says). The eggplant bounty calls for both Eggplant Parmesan and this hearty, quick pasta with an eggplant, tomato, caper and basil sauce. The Hakurei turnips and their greens are savory and delicious in this quick mis0-glazed preparation. Make a corn chowder with the corn and both hot and sweet peppers. 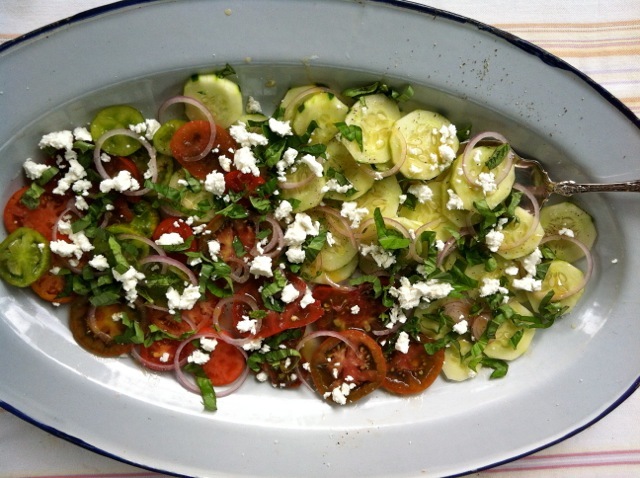 And finally this bread salad with tomatoes and mizuna and feta is a perfect late summer dish. Happy cooking! The share these days is unbelievable, really. I’m sure you have plenty of great ideas for corn and tomatoes and most everything else but here are a few more and a few that combine several of your veggies and I certainly need efficiencies like that these days to make the most of the bounty. This Southern Italian dish of green beans, potatoes, tomatoes and plenty of garlic is more than the sum of its parts. It’s just luscious. 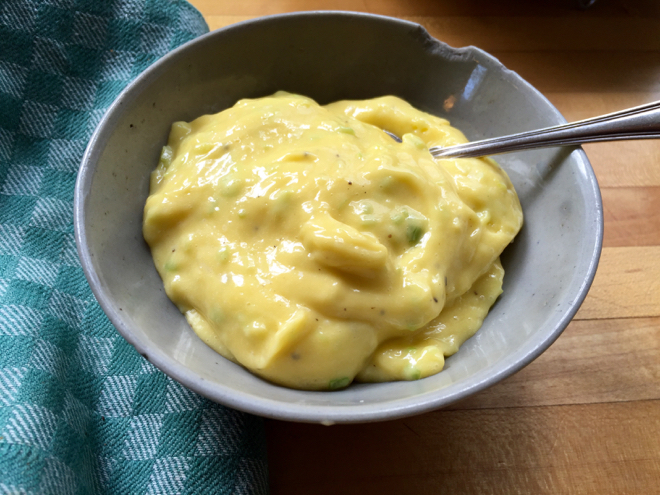 This creamy miso salad dressing is a nice change from my standard vinaigrette and I’ve been adding corn kernels, cukes, onions, even boiled potatoes to my green salads and the dressing holds up well. I actually had my 7-year-old pull up one of my zucchini plants this week as I just couldn’t keep up with my own and the CSA. 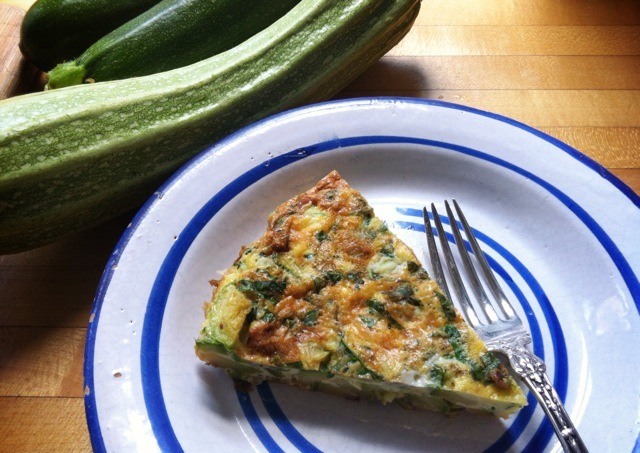 I still have plenty and have been making zucchini frittatas with lots of basil, so wonderful to have on hand for snacks, meals at any time of day. . .and best at room temp anyway. 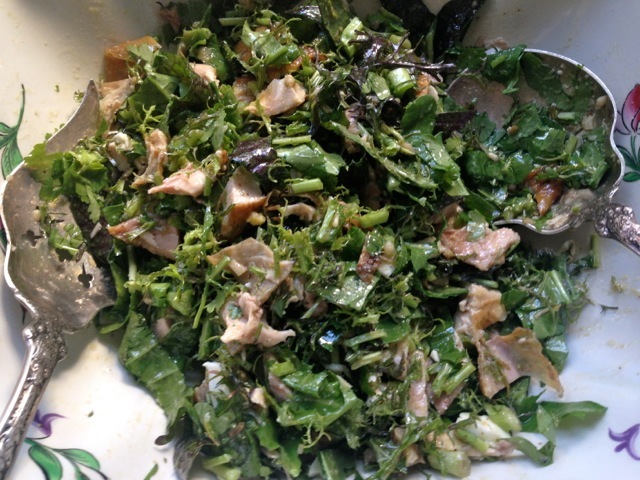 For a cool meal-in-one salad make the white bean, arugula and Oregon Albacore salad and toss in a bunch of basil too. 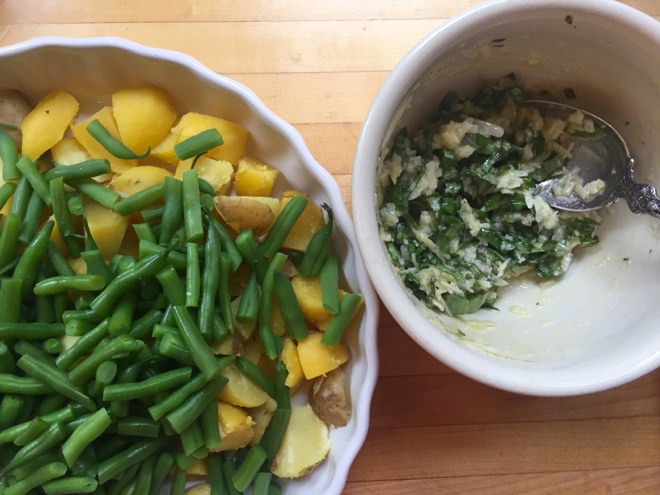 Or skip the white beans and substitute boiled potatoes–also delicious. If you didn’t roast or grill your Tropea onions a few weeks ago, do it now. This is so very delicious. And this chopped salad with mizuna and cabbage (instead of bok choy) and a tahini dressing is a perfect hearty salad for a hot night. With summer squash piling up this is a great way to enjoy lots of it and use your beautiful parsley this week–grilled or sautéed and dressed with a parsley salsa verde. 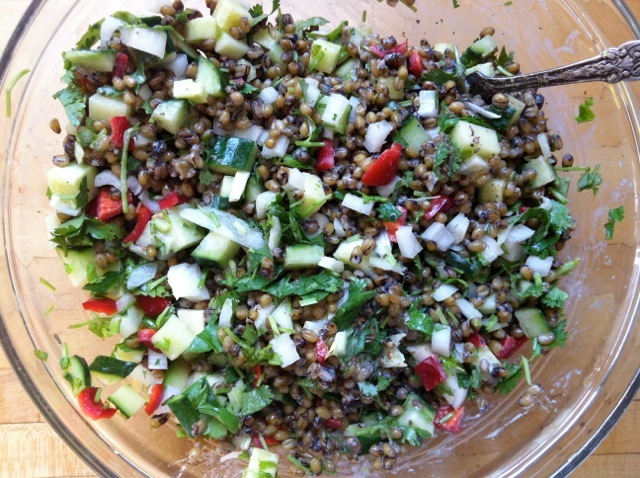 And with your cucumbers you could make this salad with frikeh if you’ve by chance been to the Hillsdale Market and purchased some from Ayers Creek Farm. You can use faro or barley instead too. It’s going to be hot so grilling your Tropea onions and fennel, tossed together with some fresh bay leaves and thyme will keep your kitchen cool. 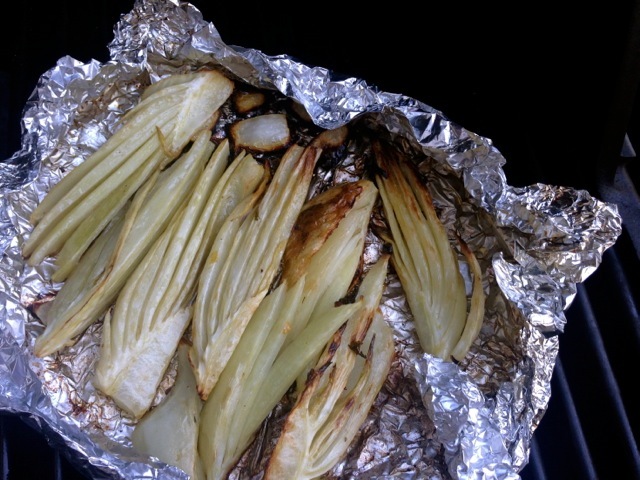 The recipe is written just for the onions but adding the fennel works well here and it’s written for oven roasting but you can wrap the onions and fennel in a packet of foil and do the same on the grill. If you don’t mind being at the stove a bit this fennel pilaf topped with cool, lemony Greek yogurt is actually quick and satisfying. For a quick, cool fennel and kohlrabi dish make this slaw, once again with Greek yogurt and plenty of lemon juice. It’s starting to feel and taste like summer. This week you might make the Classic Caesar salad with the beautiful head of Romaine. And I would suggest adapting this recipe for Fava Bean and New Potato Pasta “Risotto” with Kohlrabi and Parsley instead of New Potatoes and Basil and see how it works. I bet it will be delicious and please report back if you do. And if you don’t use your fava beans in the above dish I would simply shell them, cook for 4-5 minutes in boiling, lightly salted water and then drain, rinse and shell each bean. 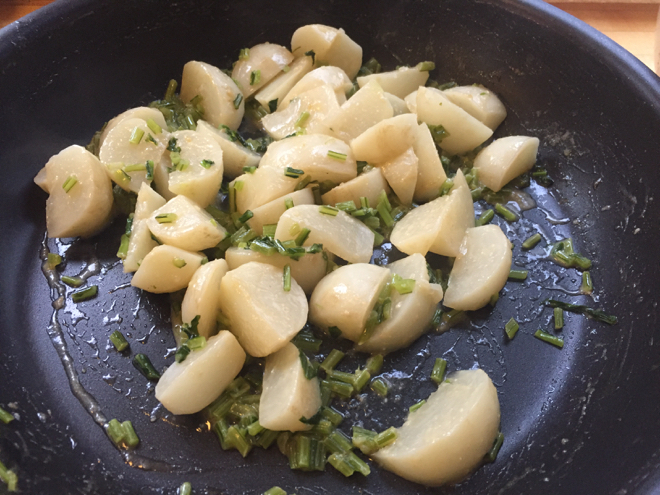 Then make a dressing with finely chopped parsley, minced garlic, lemon juice and good olive oil–eat as is or mash up a bit and put on toasted bread or toss with some smallish pasta. If you have any of Laura’s fabulous dry beans sitting around (or from a different source:) I would cook them and dress them with the same garlic, parsley, lemon or red wine vinegar, dressing and you could even add the fava beans and make a mixed bean salad, warm or cold, out of all of it. 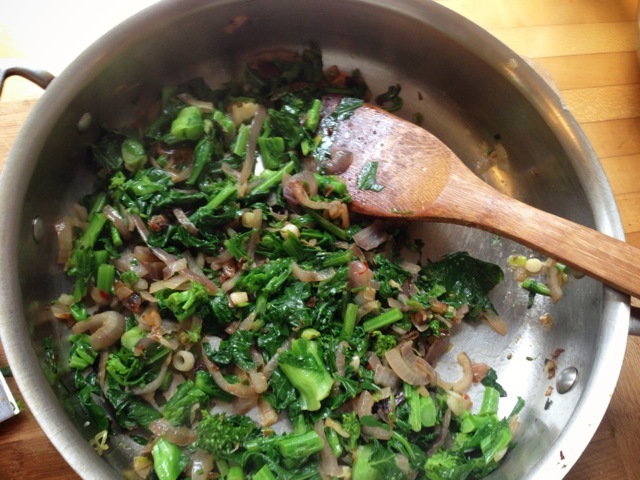 And the chard and onions would happily combine for this lovely, silky side dish or pizza topping. 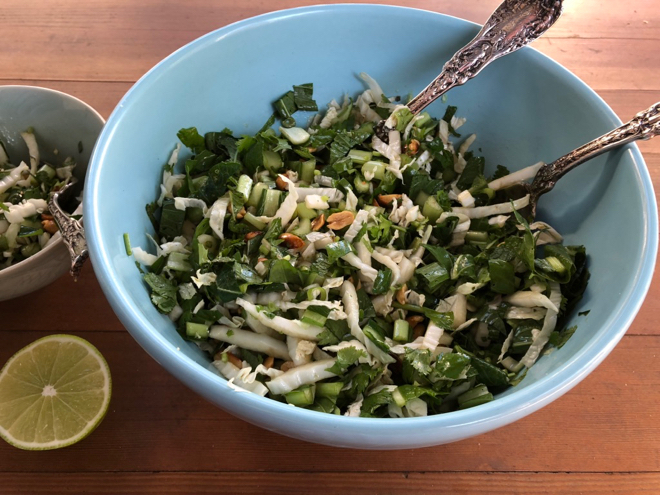 This will be the perfect kohlrabi salad for this hot week or this one, just omit the fennel and maybe add quite a bit of thinly sliced spring onion instead that you’ve soaked in ice water for 20 minutes to reduce the bite. Garlic scapes! In anticipation of your bounty in this department I worked up a couple of sauces/spreads that will use them all up in addition to your parsley and make you want to slather the sauce on everything. 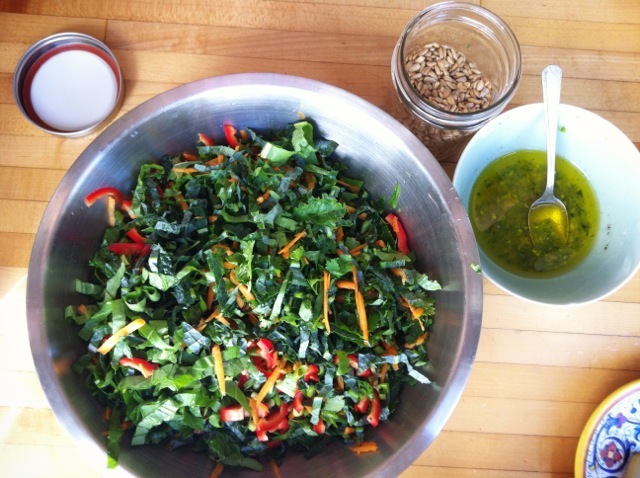 For your mizuna or Ruby Streak mustard greens you can make this hearty toasted bread salad. The turnip category is pretty deep and this miso-braised dish using both the roots and greens would be good. 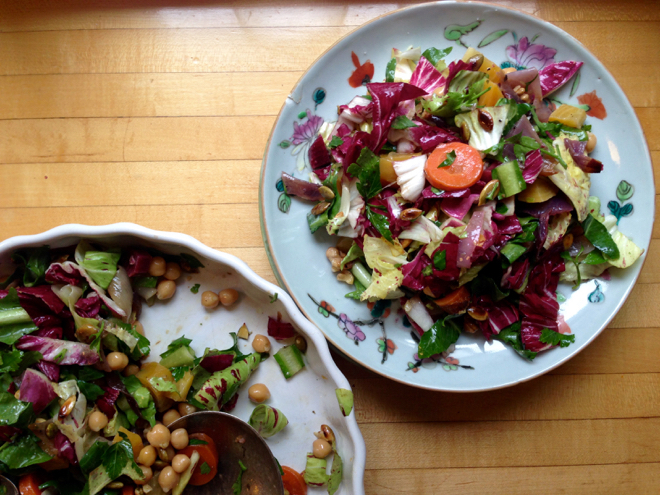 The big, beautiful bok choy would be a good base for this chopped salad with tahini dressing. Use turnips instead of radishes and spring onions instead of scallions and by all means add some snap peas. Grill the beautiful spring onions and eat them as is or top a pizza with them and some braised kale. Or toss the spring onions with a bunch of chopped parsley and some vinegar or lemon juice for a fresh garnish for grilled meat, fish or veggies. 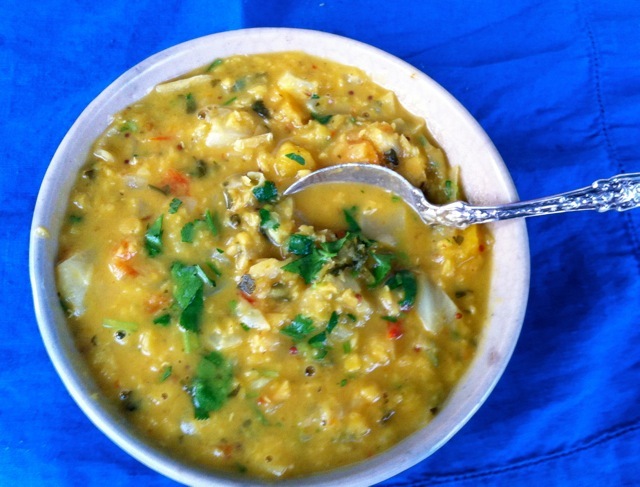 And you could use the bok choy greens, turnip greens, mizuna or kale in the this quick red lentil dal. You’ve been getting a lovely mix of dried peppers and beans and fresh, new vegetables that combine easily for quick satisfying meals. And a warm pot of slowly cooked beans infused with a cayenne pepper (I’d remove the seeds first) and some garlic scapes, with a some turnip greens stirred in at the end sounds like the perfect thing to make and eat for lunch all week. Or make this classic Italian salad of white beans (you can substitute others too), canned tuna, arugula, and onion with a vinegary dressing. And those cayenne peppers pack a punch. I made a quick bok choy dish with one of the deseeded peppers I broke into a few pieces that I sautéed in a bit of coconut oil with some green garlic and grated ginger. I added the sliced bok choy and just a little broth and cooked that for about 3 minutes. The pepper really infused the dish and I removed the pepper pieces before serving. Here are some more ideas for the cayennes. Those beautiful Walla Walla Sweets in your share you might just brush with olive oil and sprinkle with salt and grill or turn them into the robust southern German Zwiebelkuchen (Onion Tart). 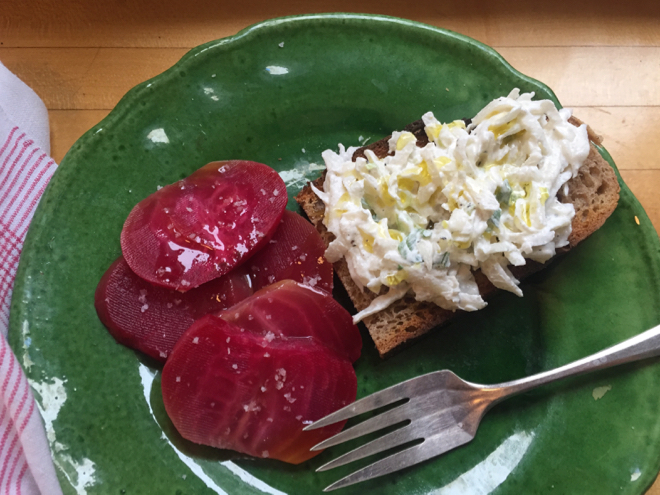 You have plenty of garlic scapes to make several batches of garlic scape pesto (freeze one batch for the winter) and you can use some of it on this bruschetta with Oregon albacore and chopped egg and pickled onion. I’ve been adding arugula to quesadillas lately for great effect. Welcome to the first installment of the News & Tips post for 47th Ave Farm CSA members. 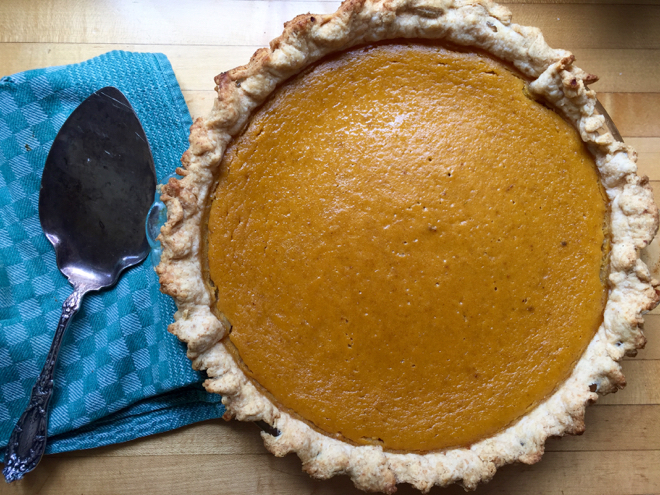 This post will change every other week and include links to particularly relevant recipes and posts within the larger Seasonal Recipe Collection. I’ll be focusing on various vegetables each time–more obscure ones, ones you get a lot of or for many weeks in a row, particular combinations, etc. Pea Shoots with Soy Sauce and some general notes about pea shoots and the occasional tough stems. Chicken and Pea Shoot or Turnip Green Salad/Stir-Fry in which you can use a lot of green garlic instead of mature garlic, which you can do in any recipe that calls for garlic, in fact. 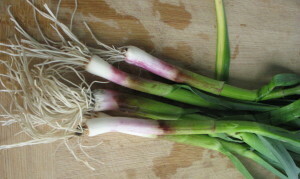 Green garlic particularly likes to be gently stewed in a little olive oil or butter before adding to most anything! Sauteed Mustard Greens with Green Garlic and Mustard Seeds, a quick dish in which the sweetness of the green garlic pairs nicely with the spice of the greens and the mustard seeds add a lovely crunch. 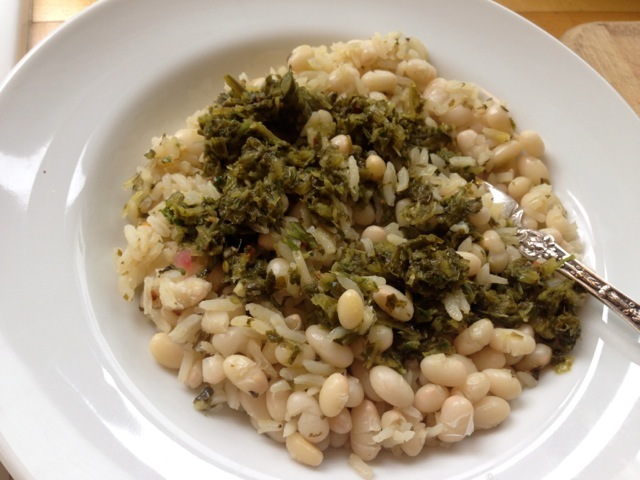 Jamaican Rice and Beans and Greens that uses a number of items in your share this week. This dish is a meal in one and a total crowd pleaser and eminently adaptable. It makes a lot and keeps well for a few days. Dry bean cooking tips for your delicious beans that you might as well all cook at once and use either in the rice and bean dish above or in salads, tacos, etc.